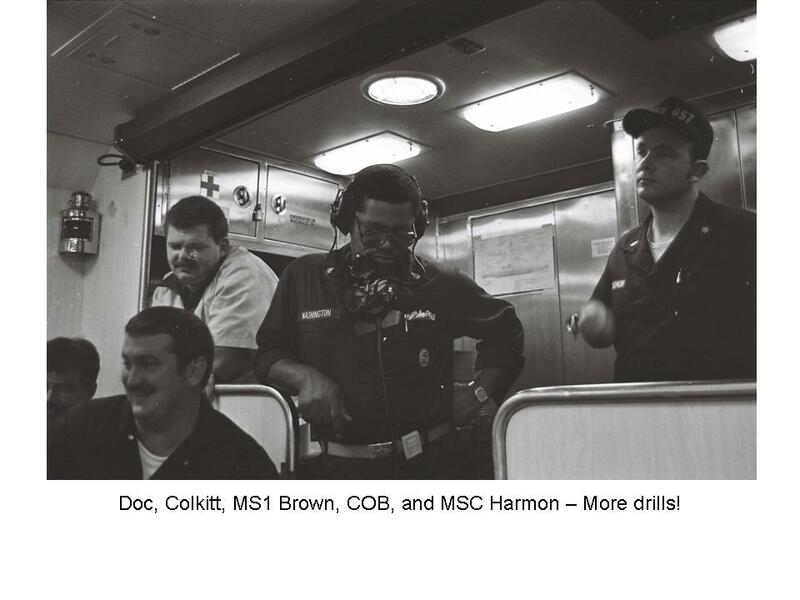 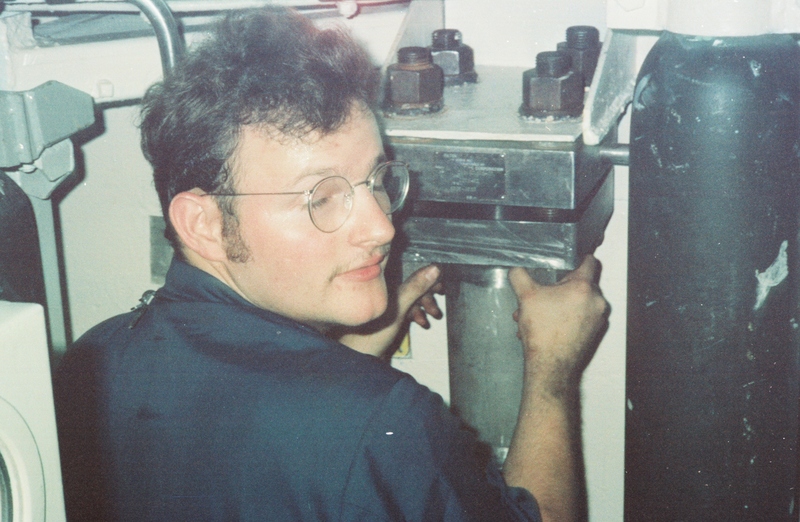 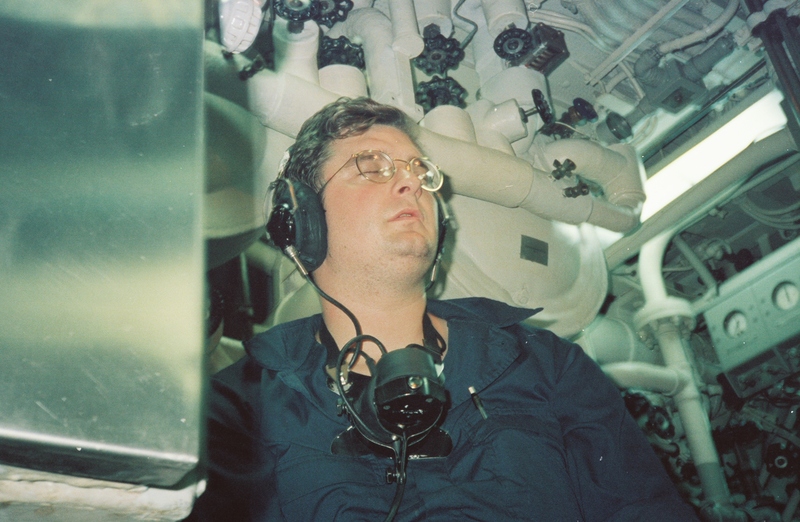 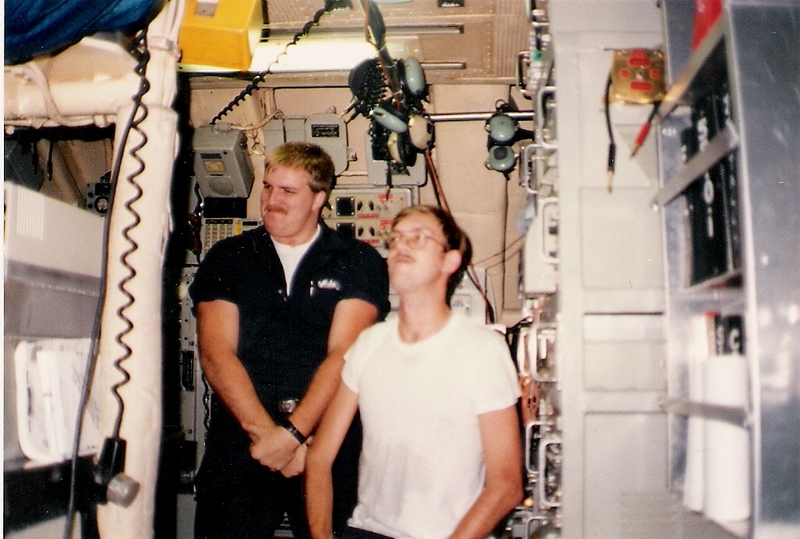 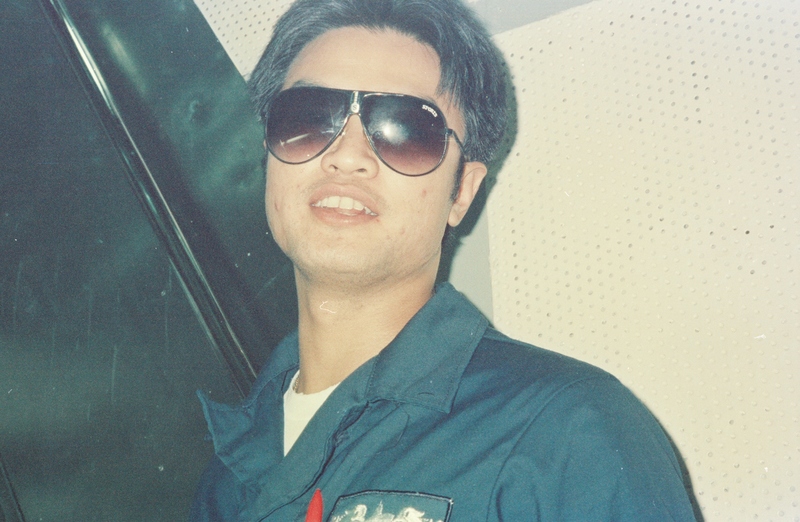 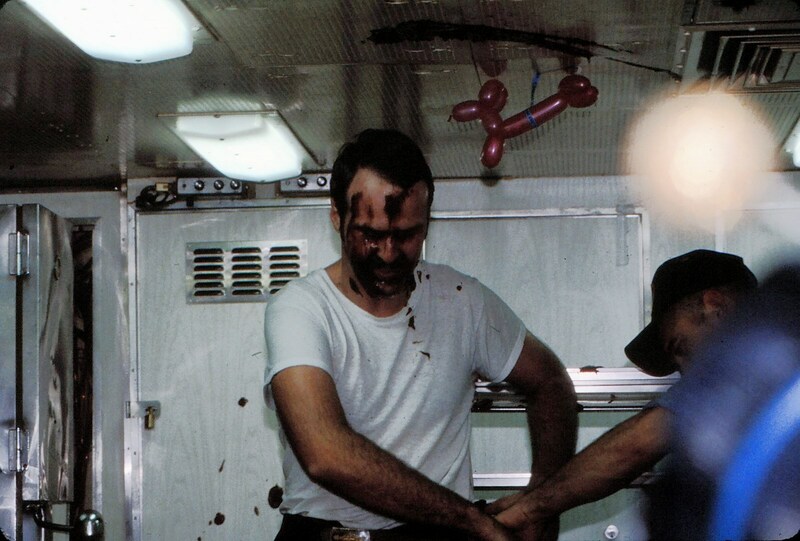 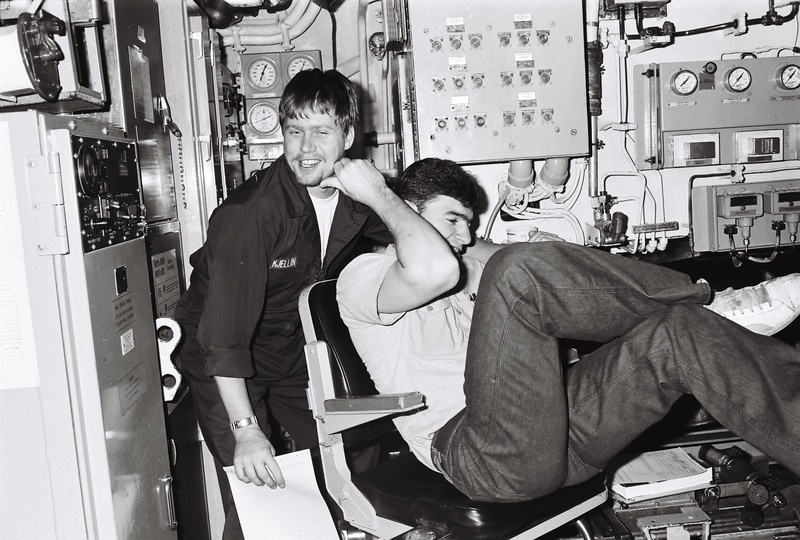 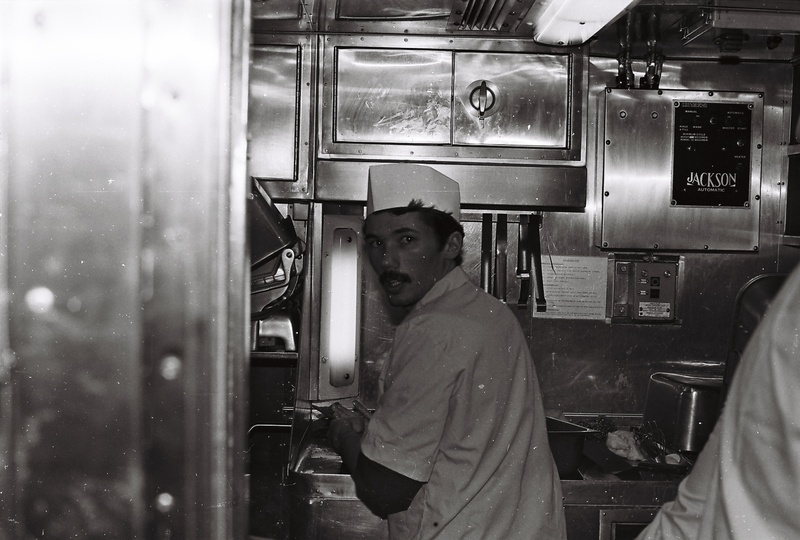 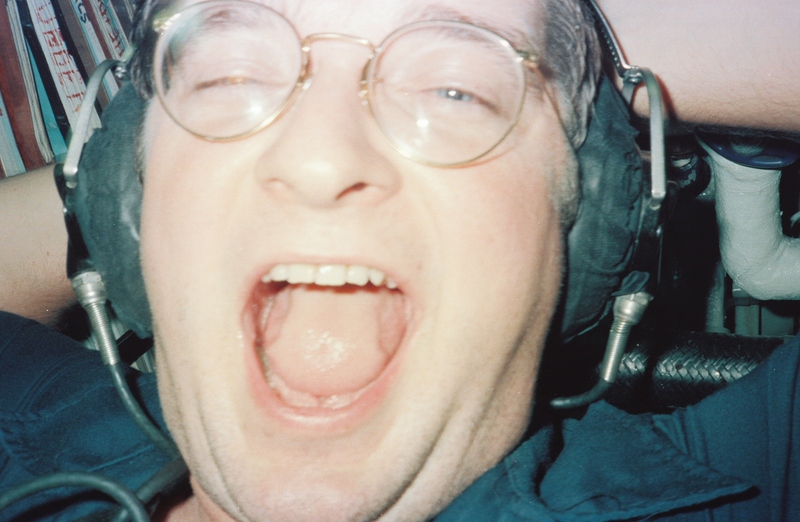 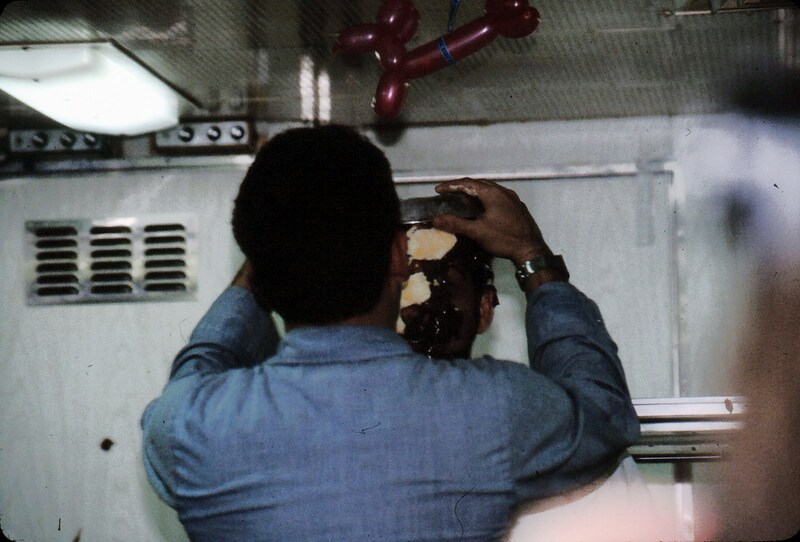 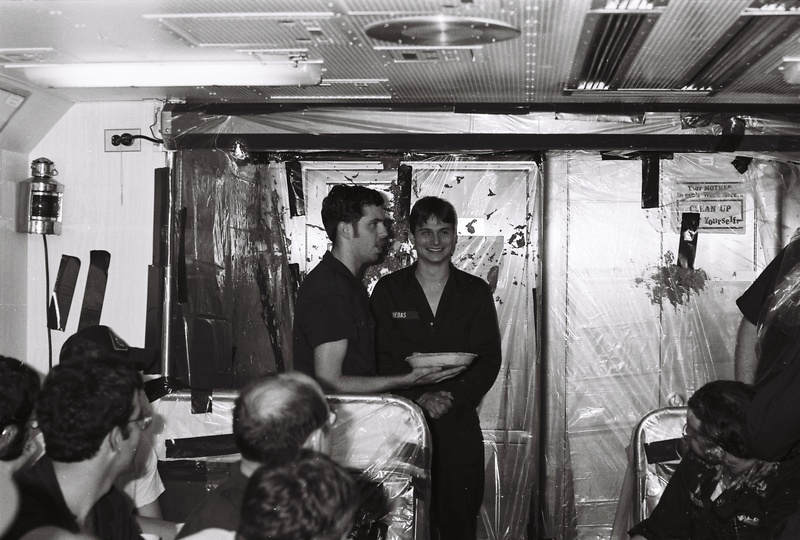 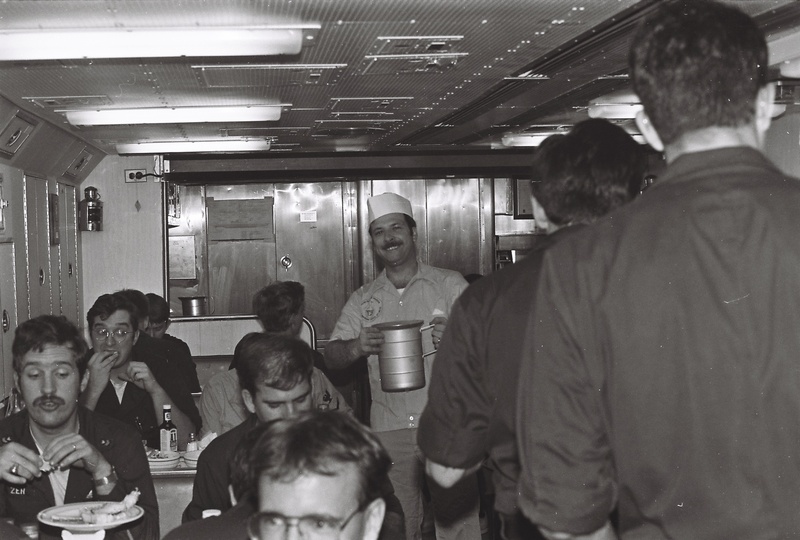 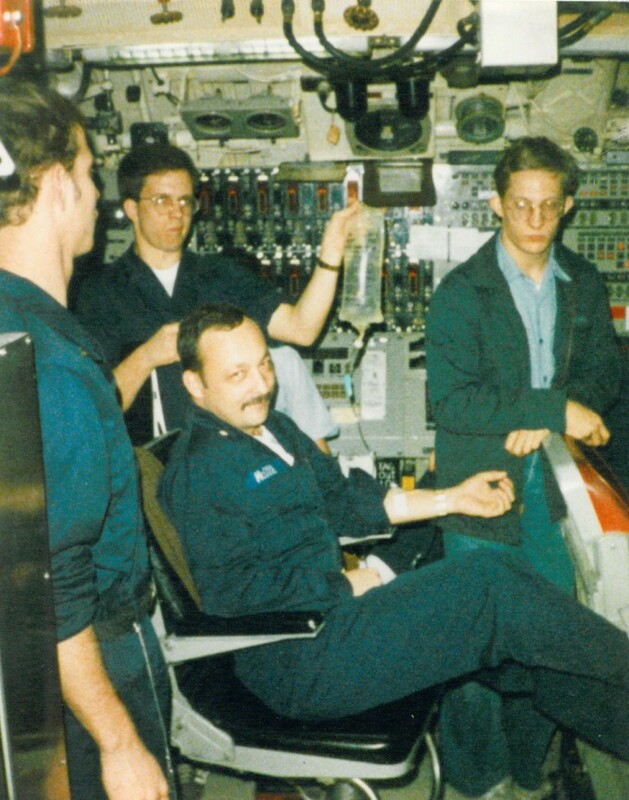 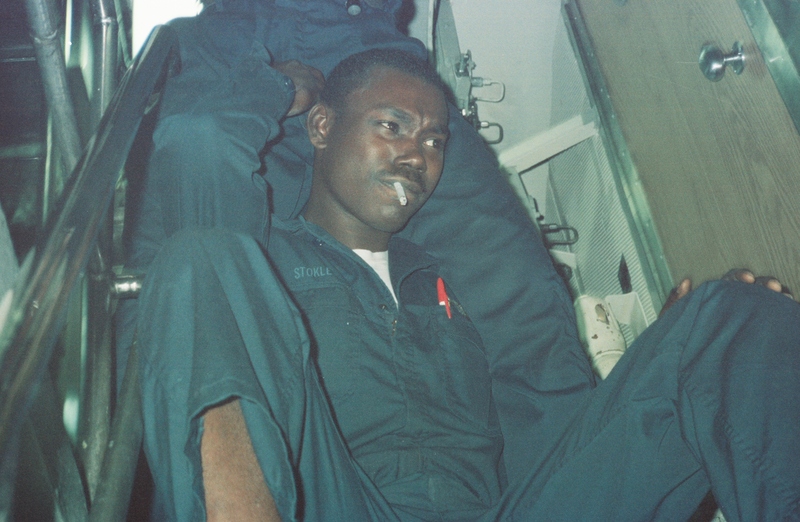 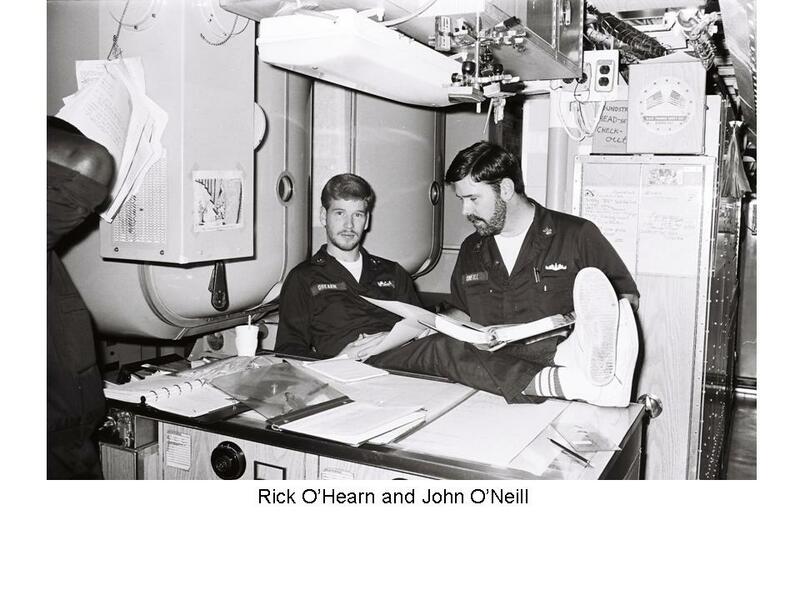 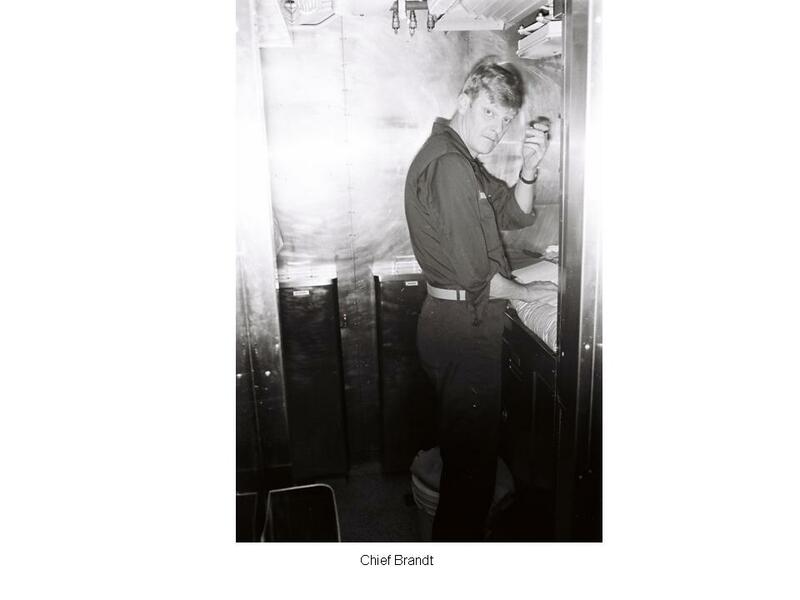 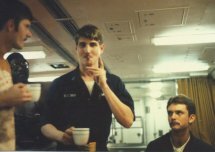 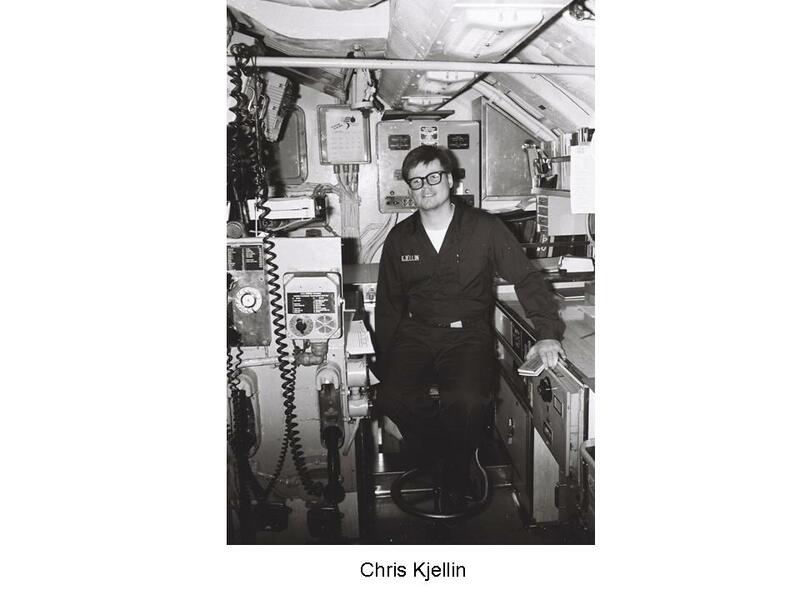 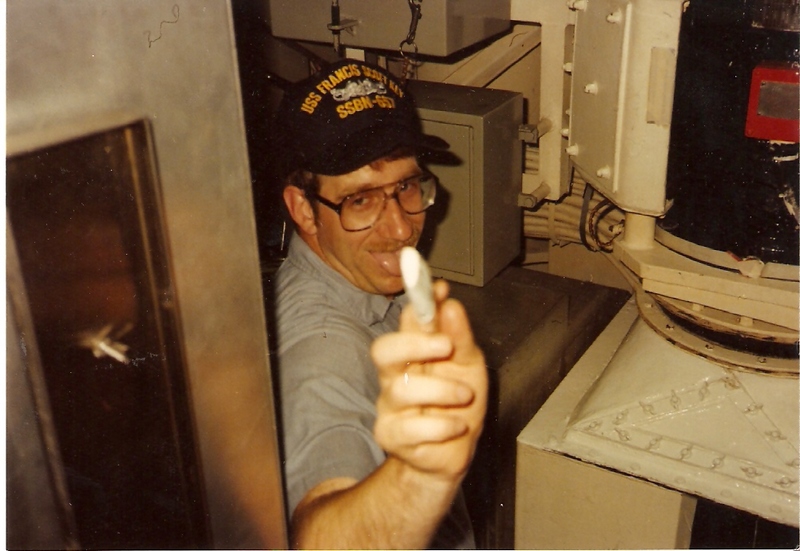 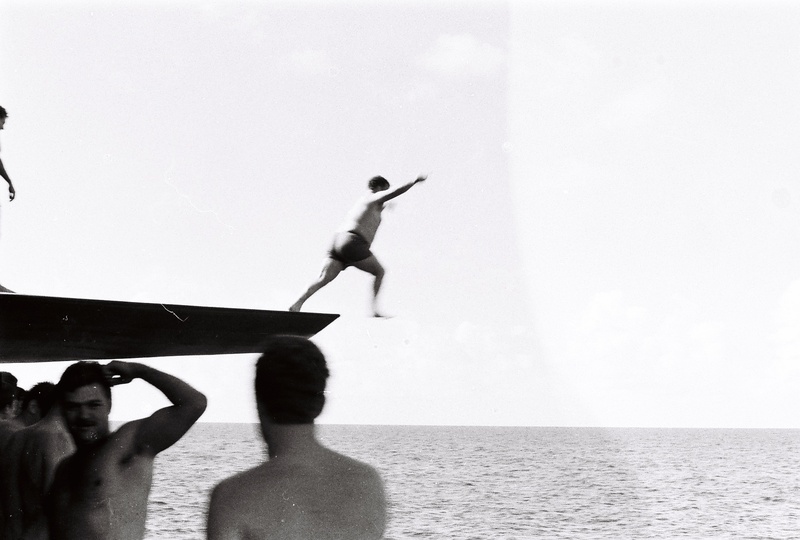 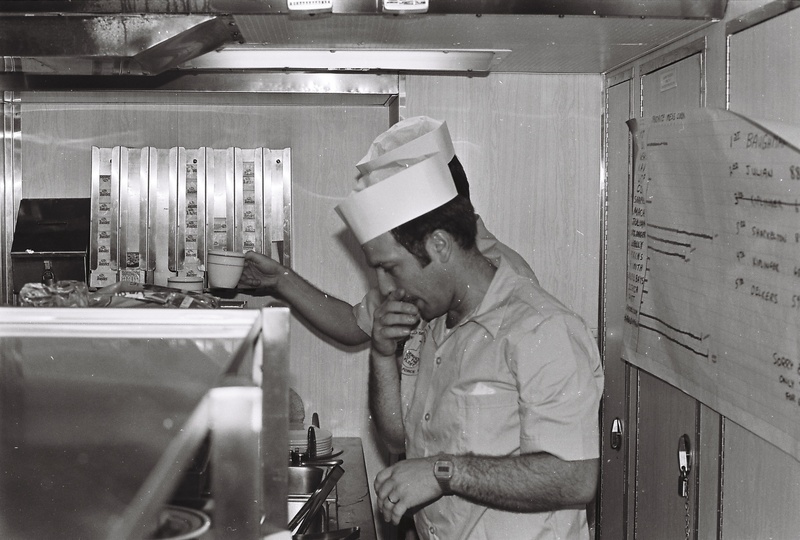 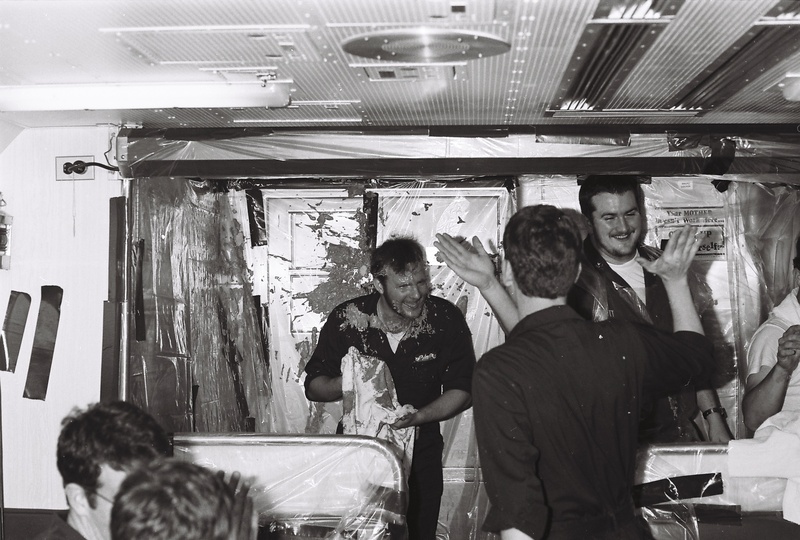 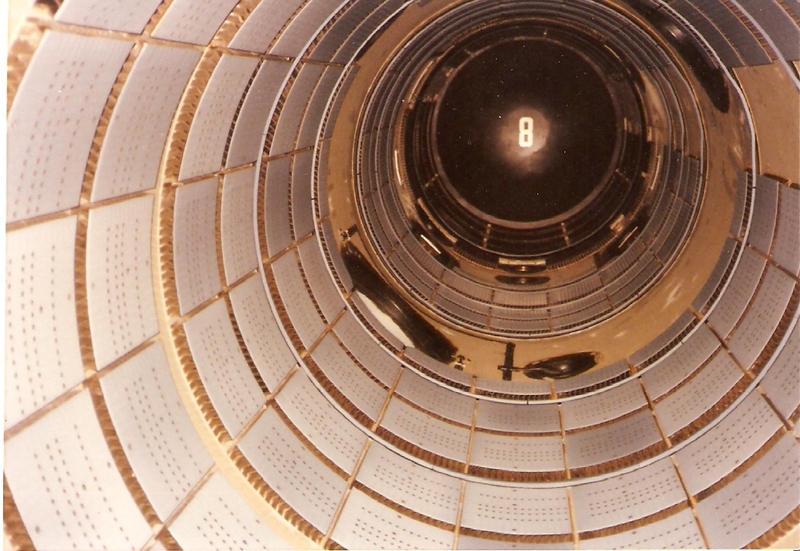 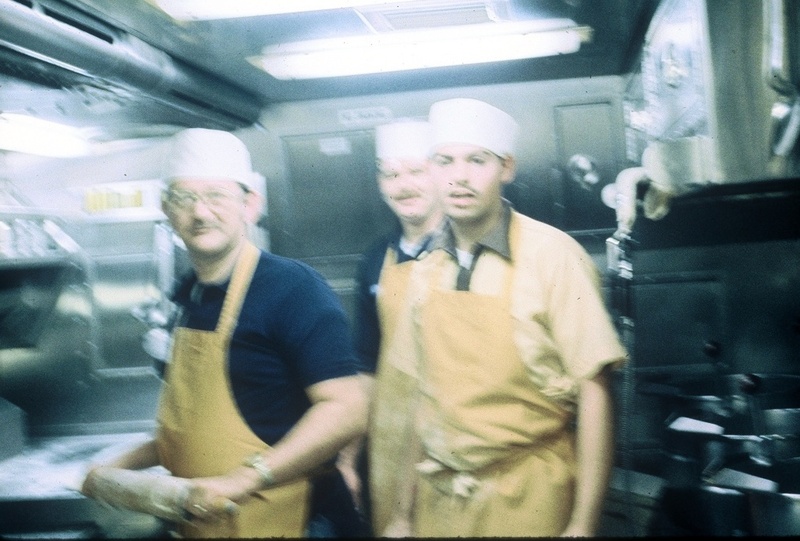 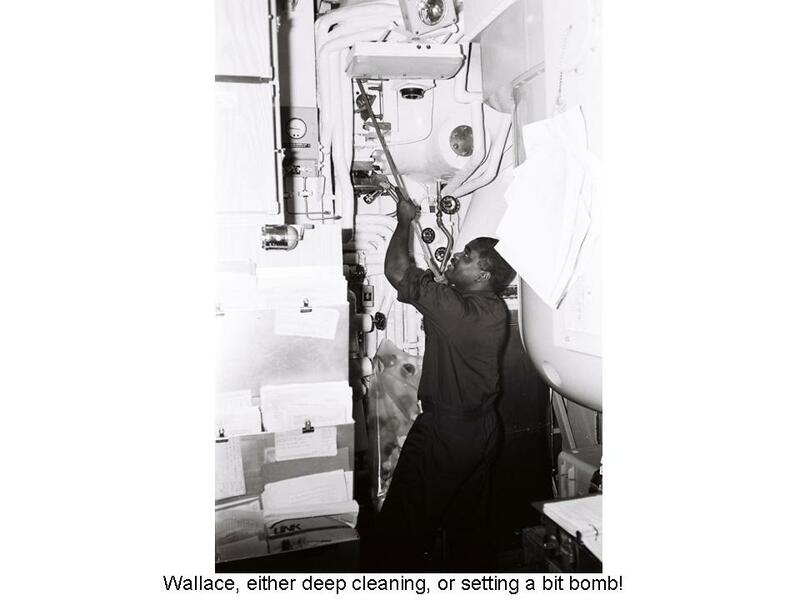 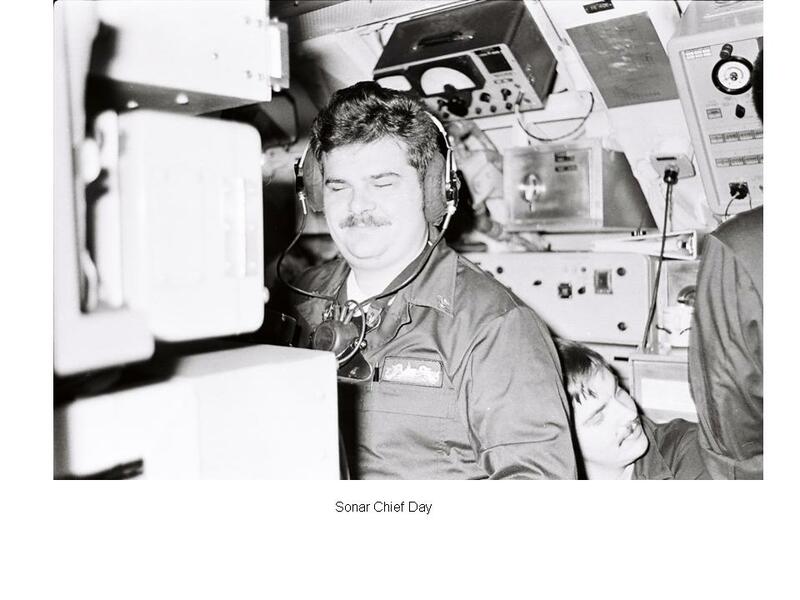 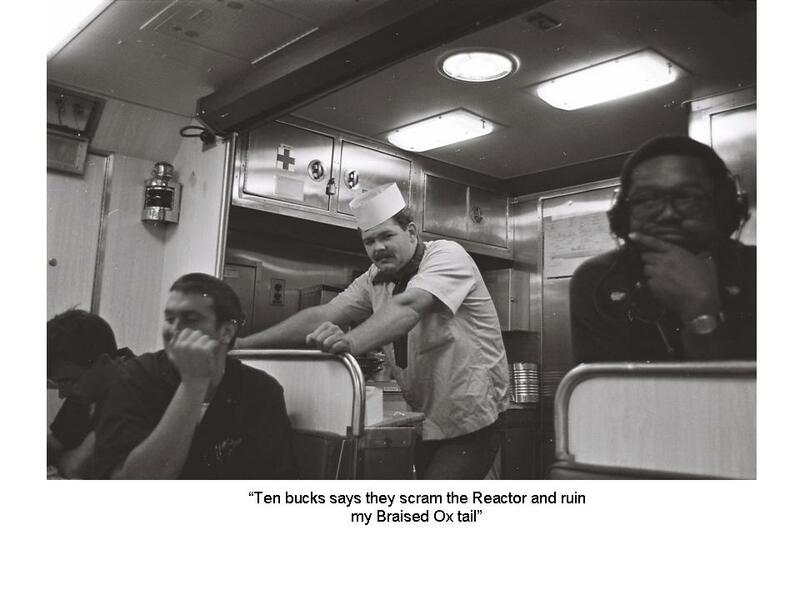 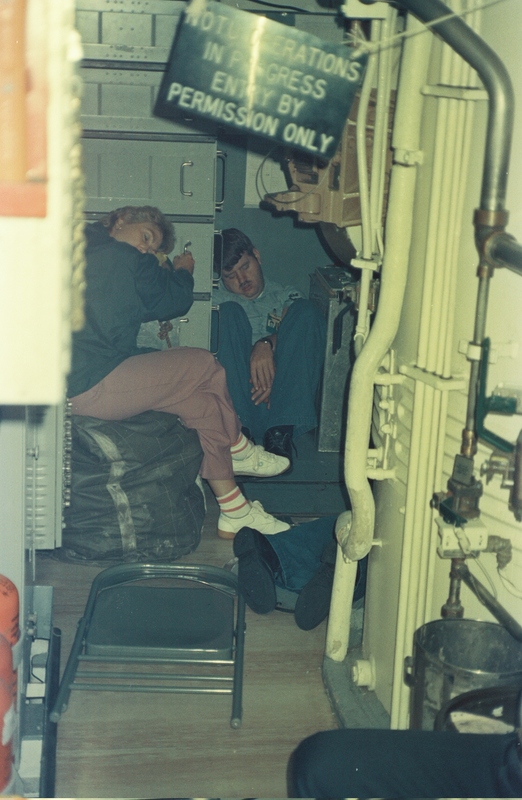 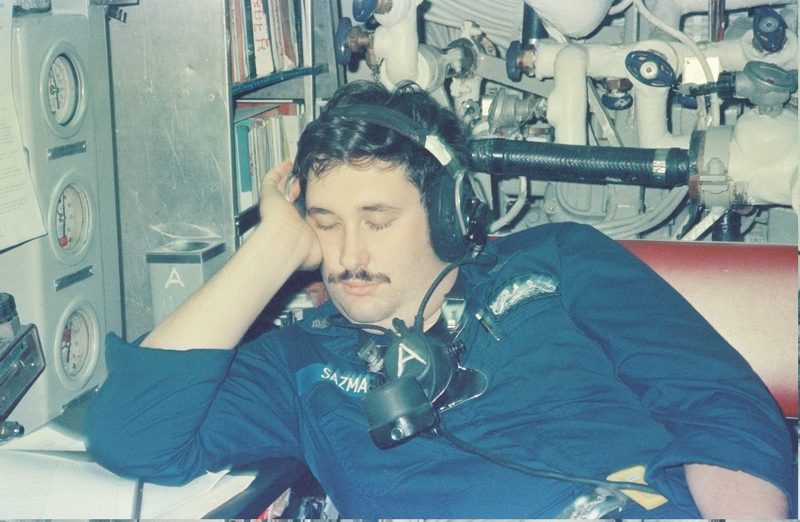 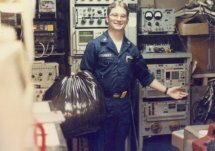 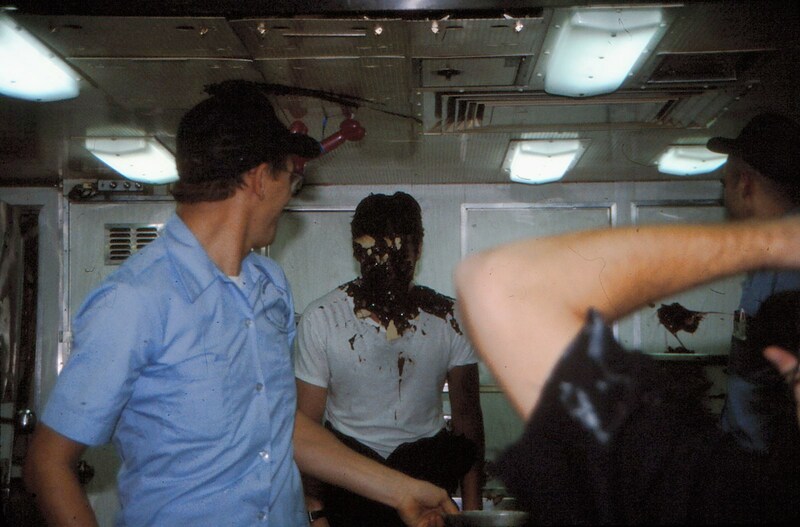 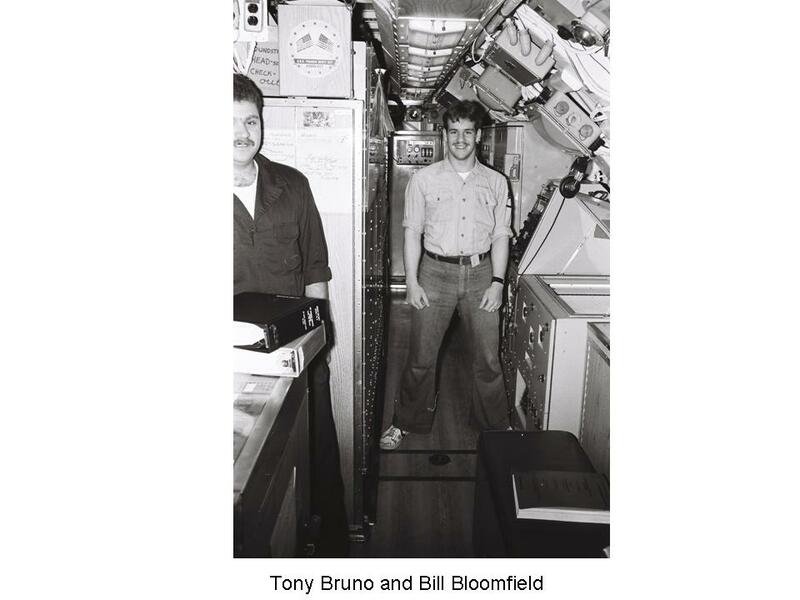 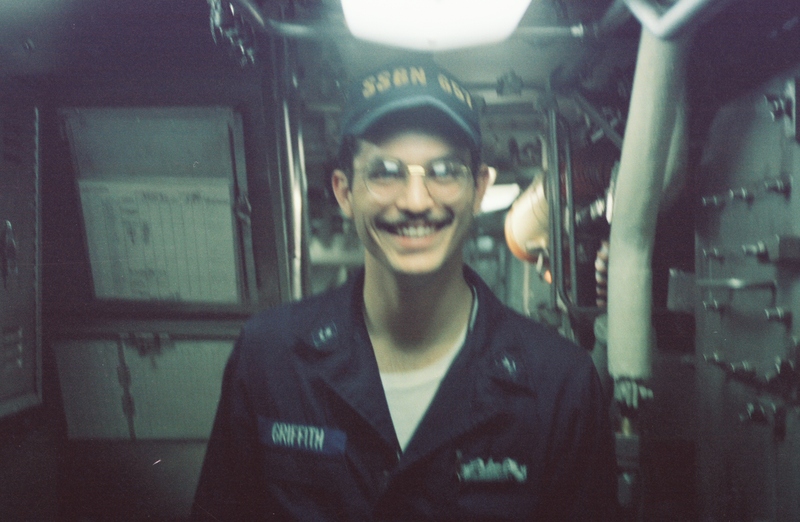 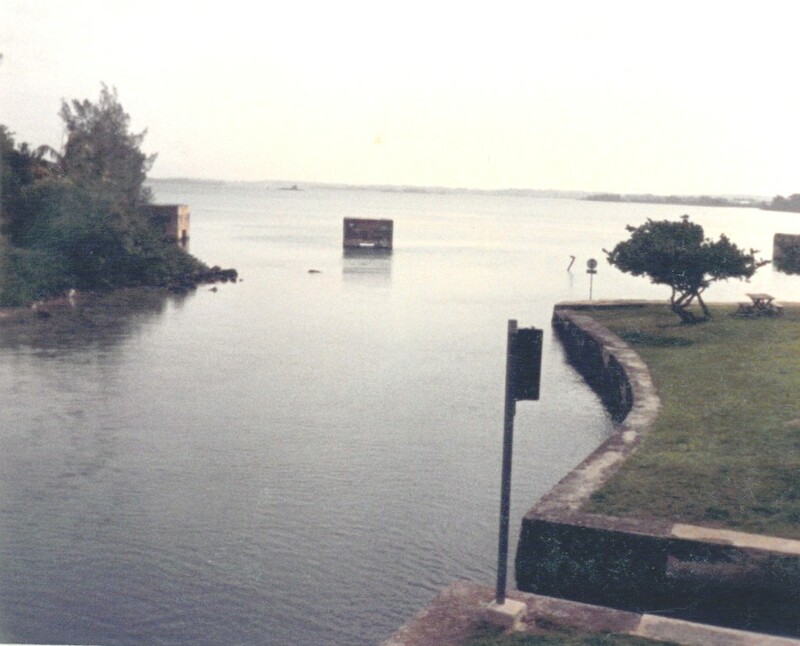 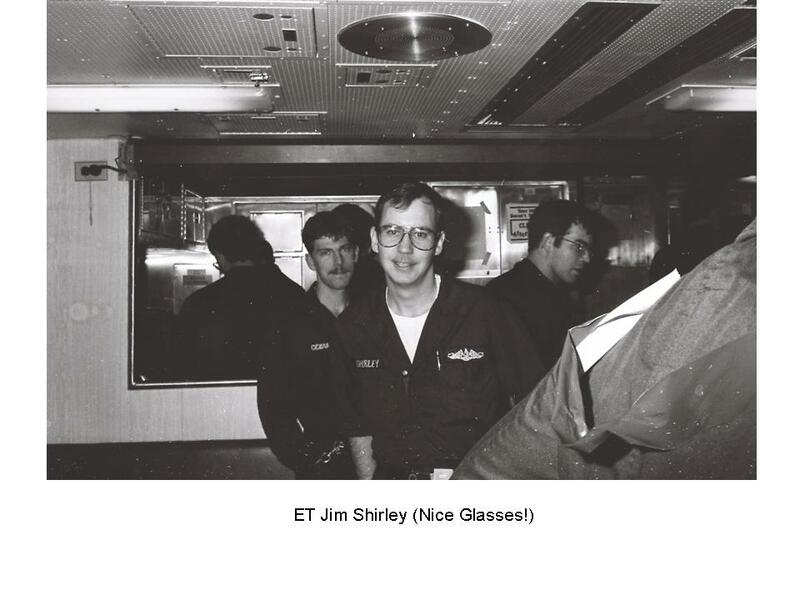 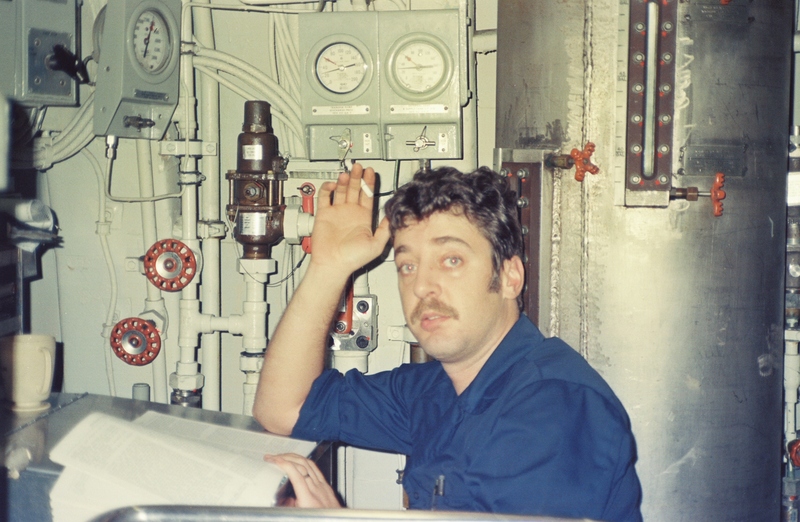 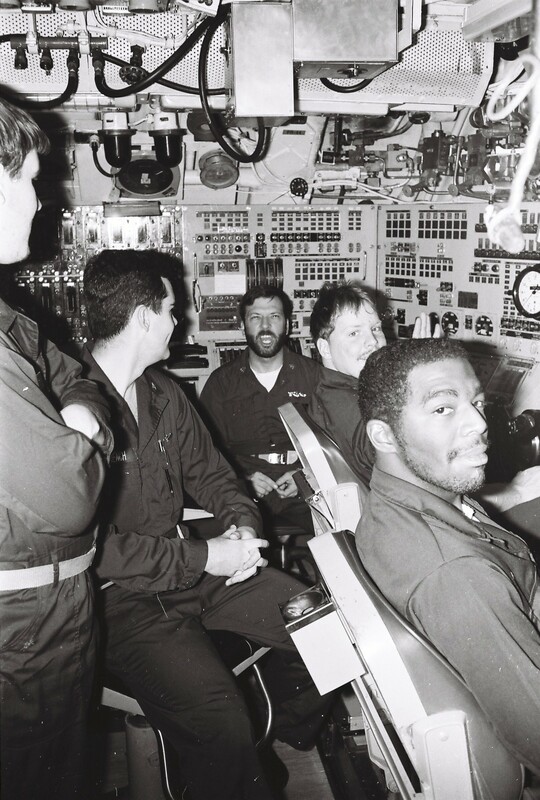 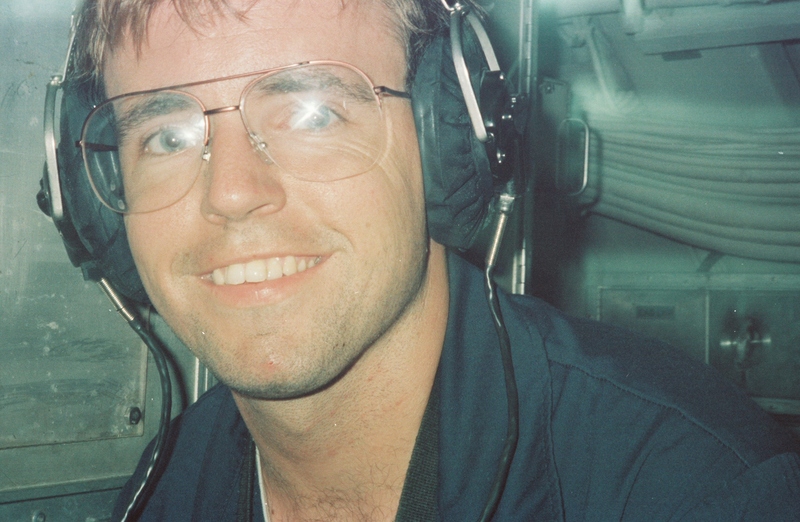 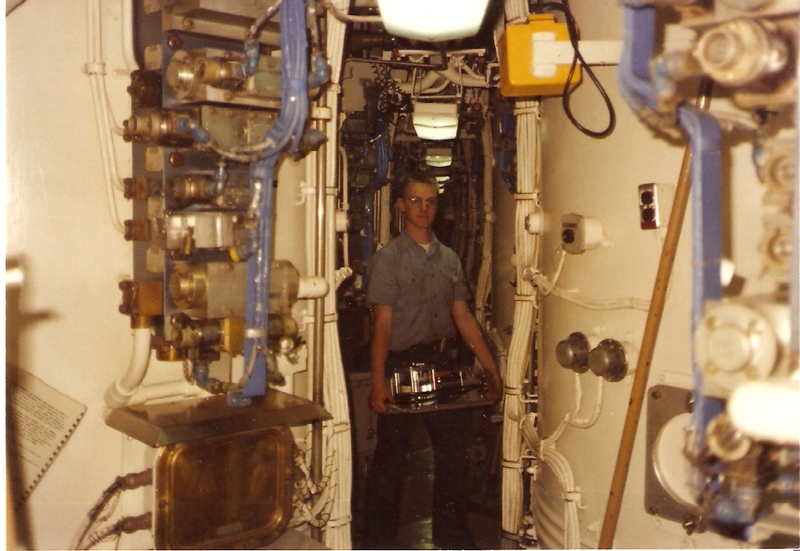 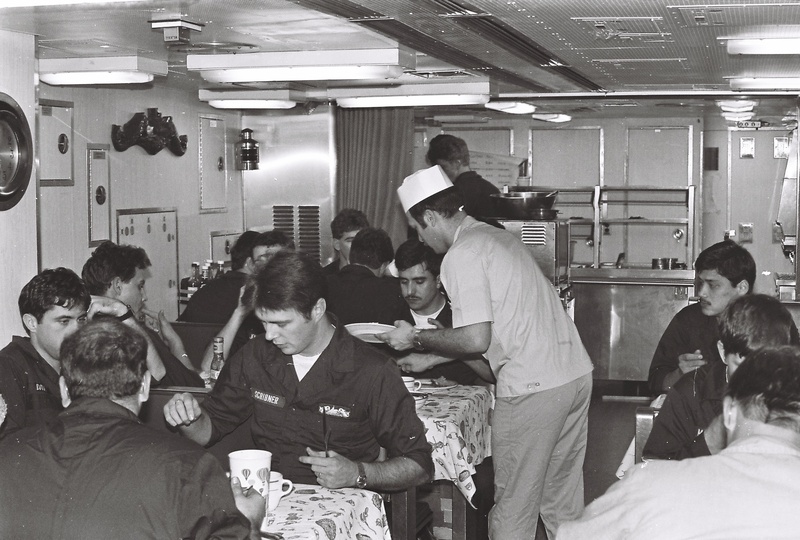 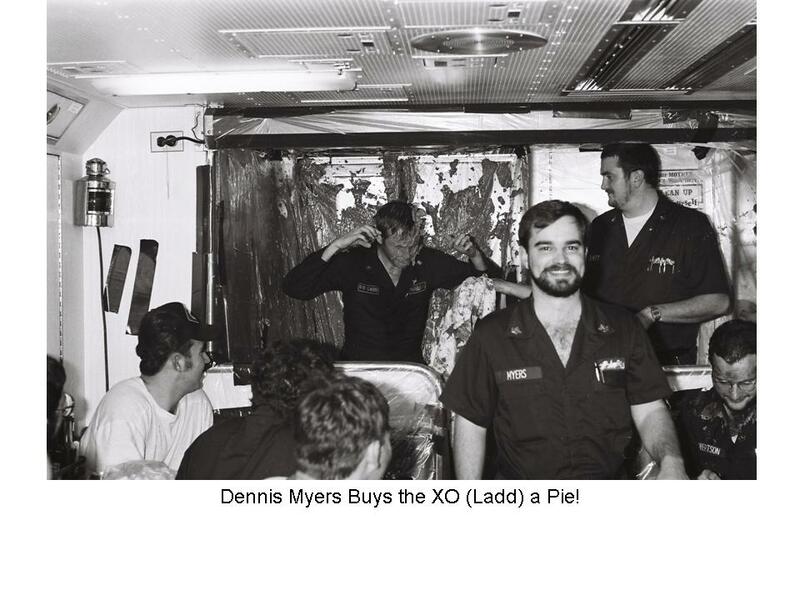 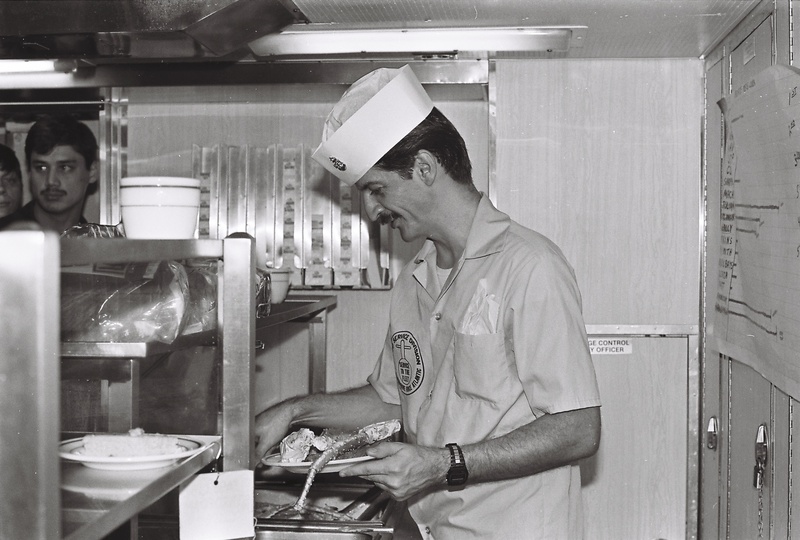 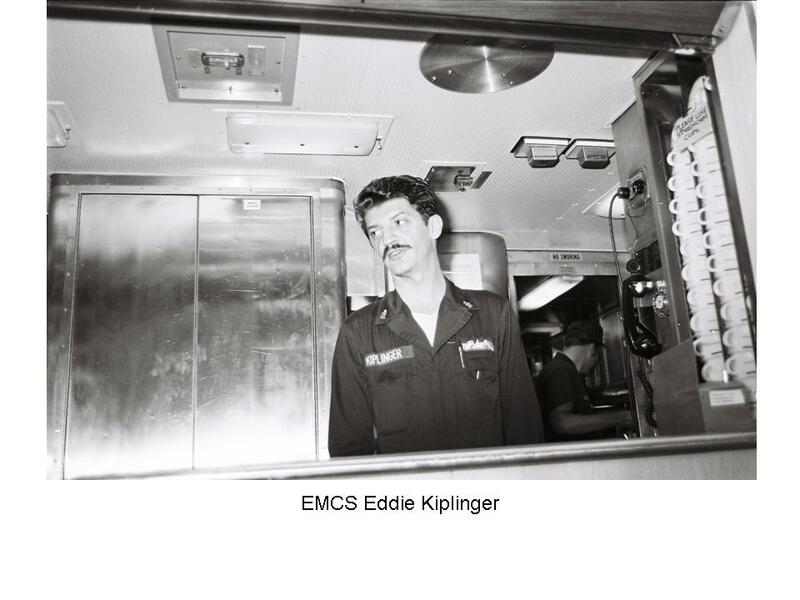 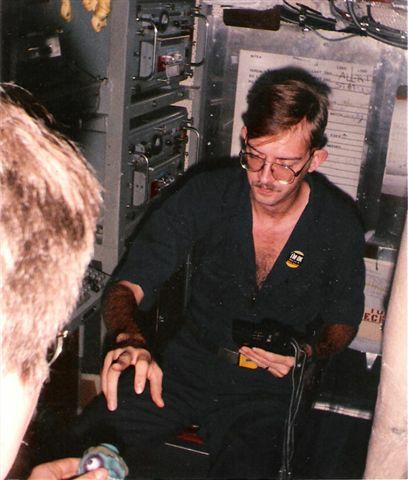 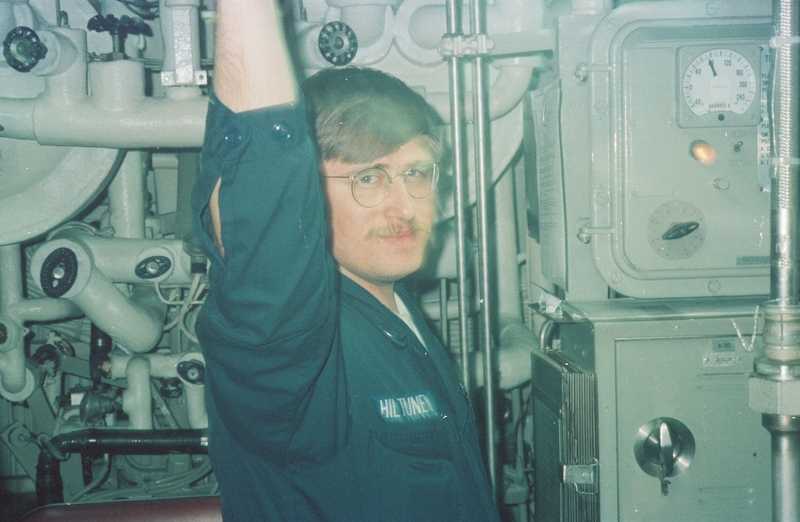 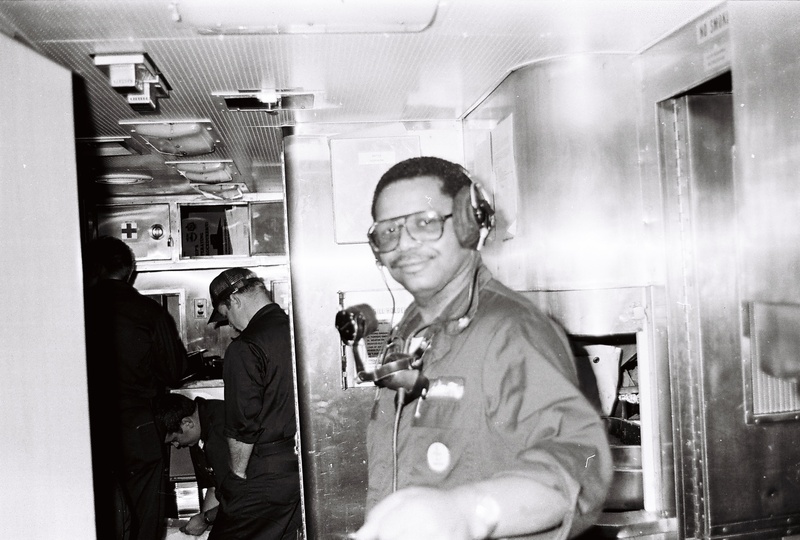 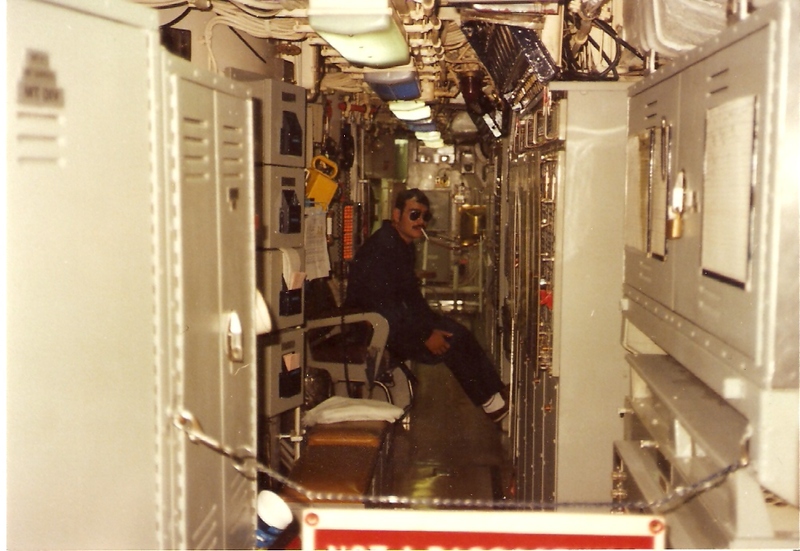 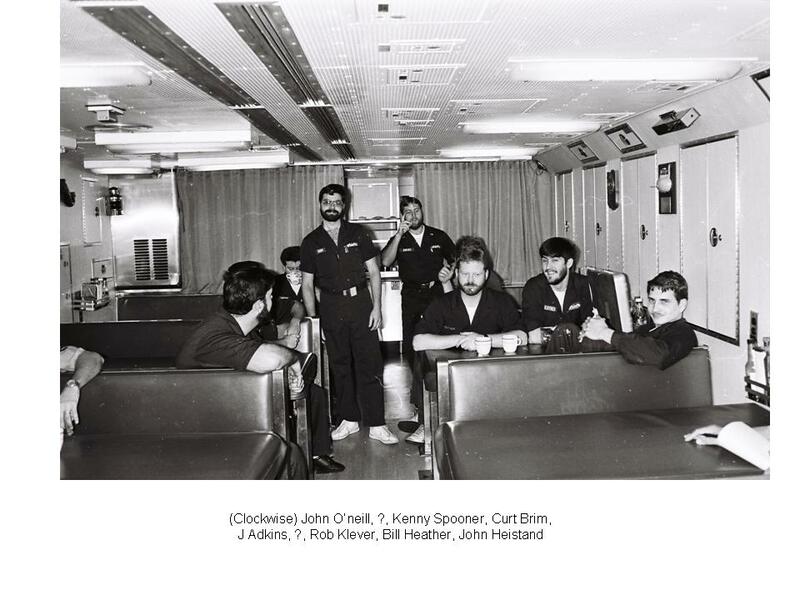 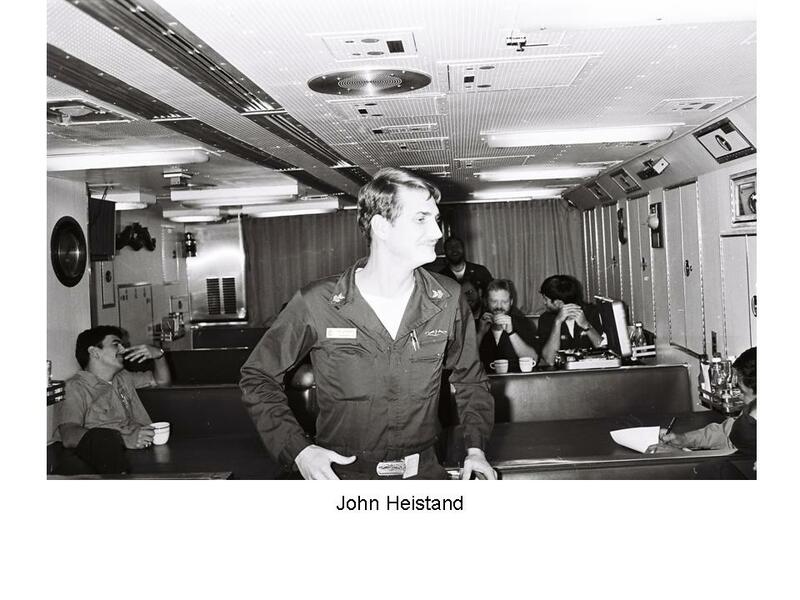 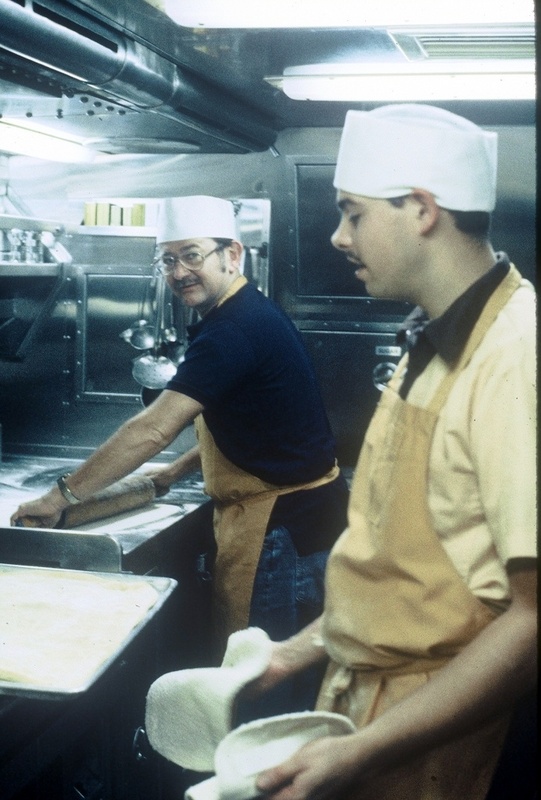 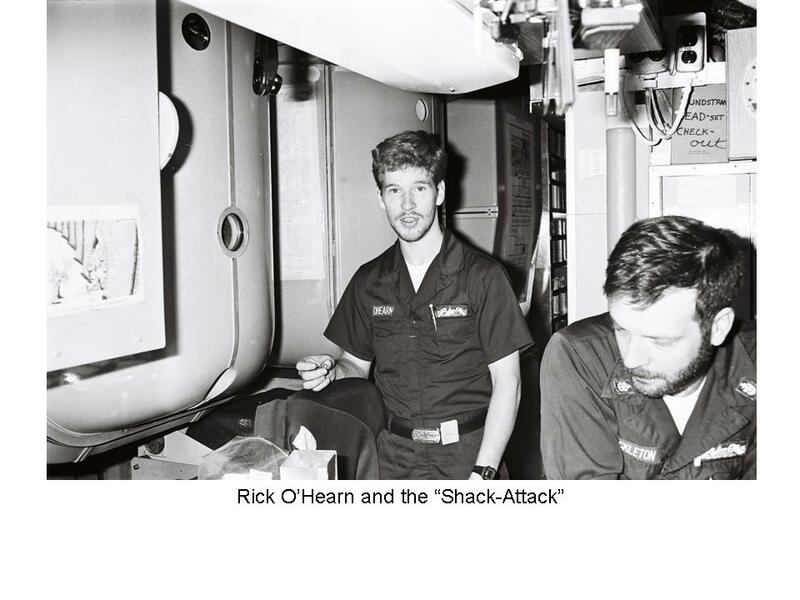 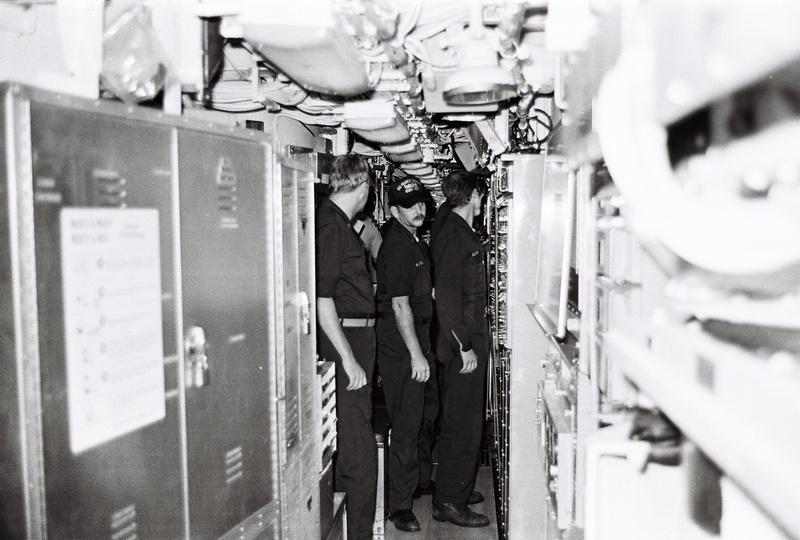 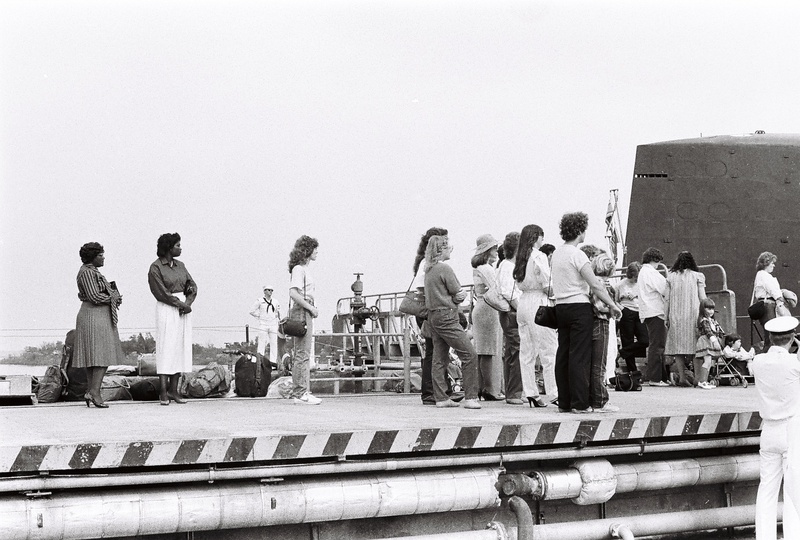 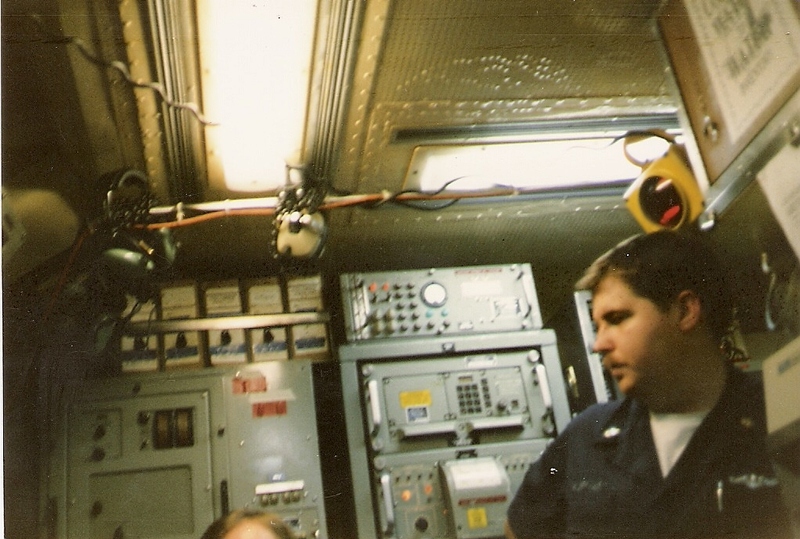 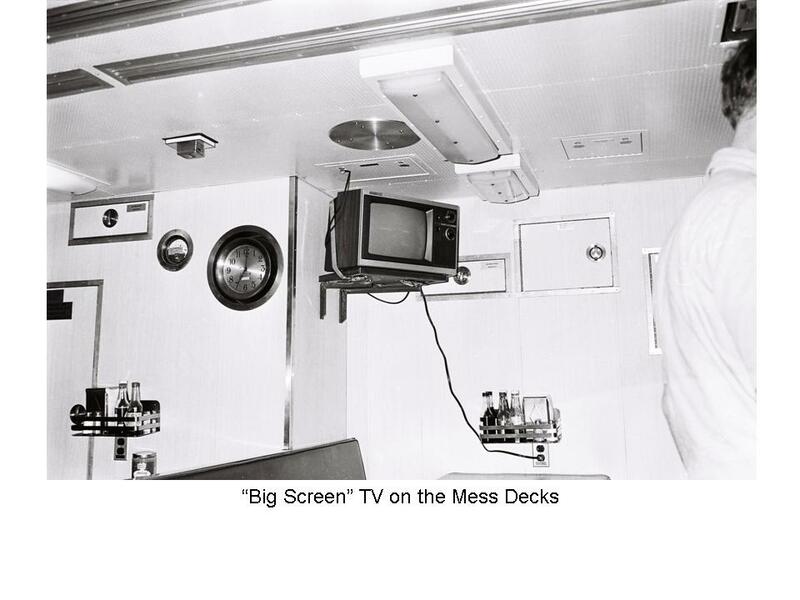 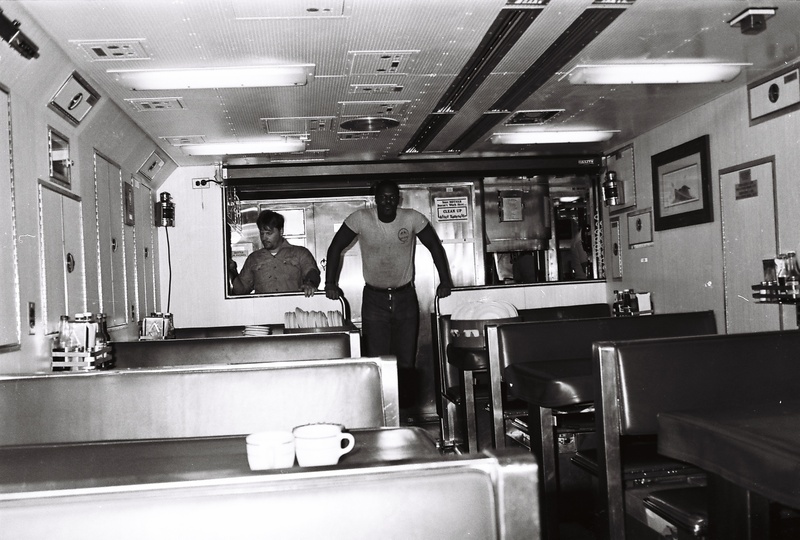 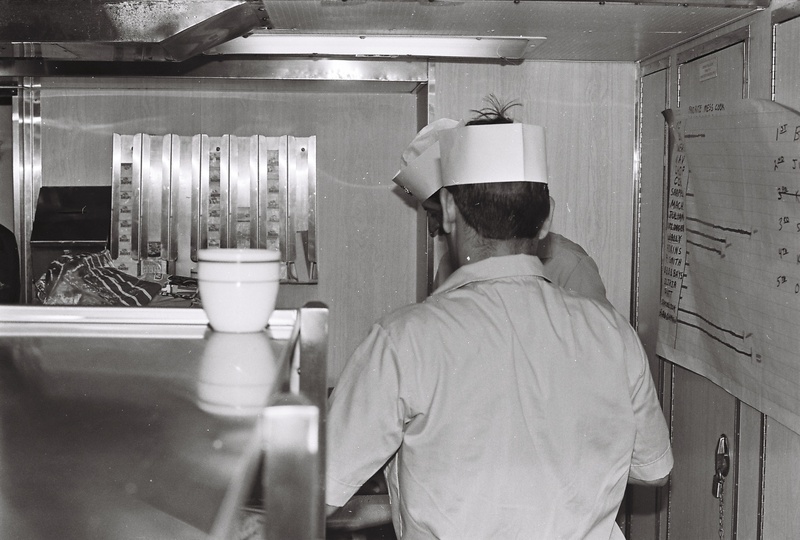 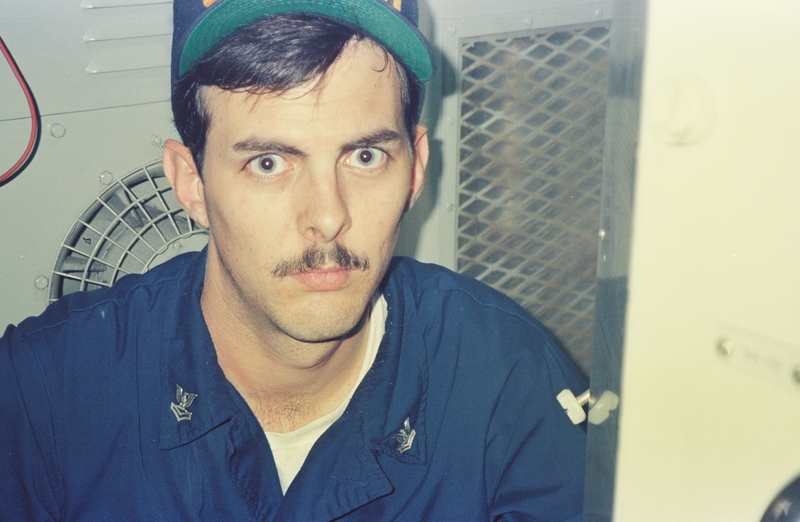 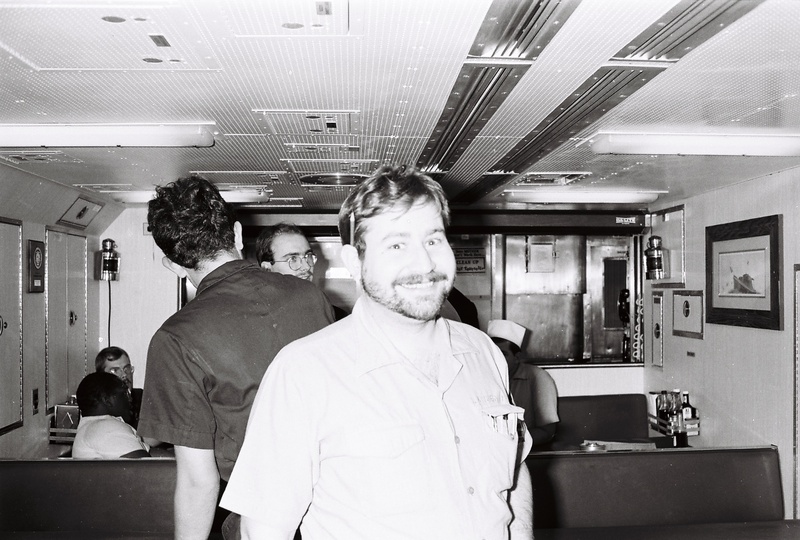 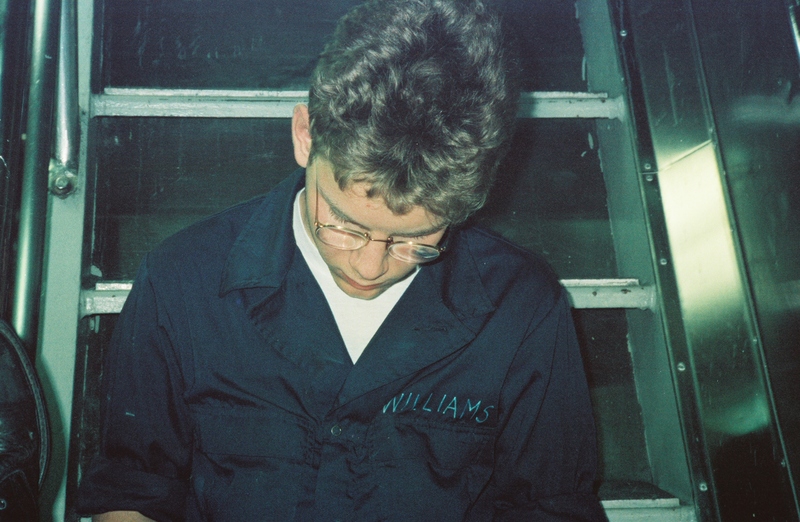 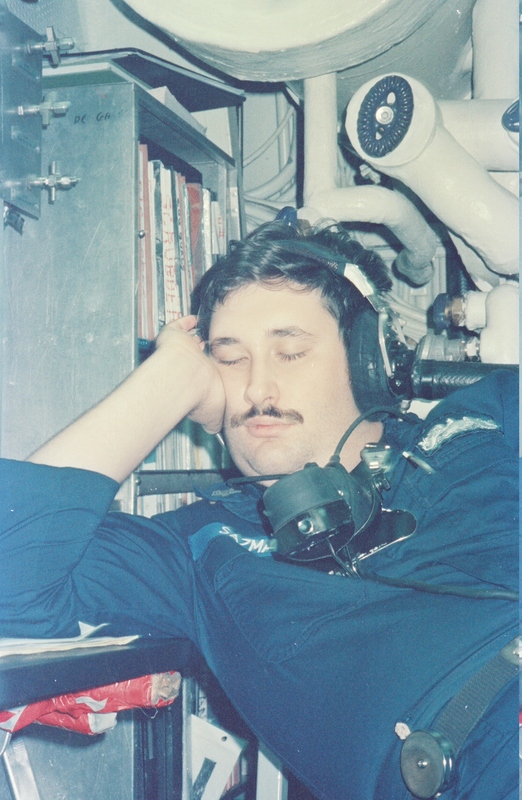 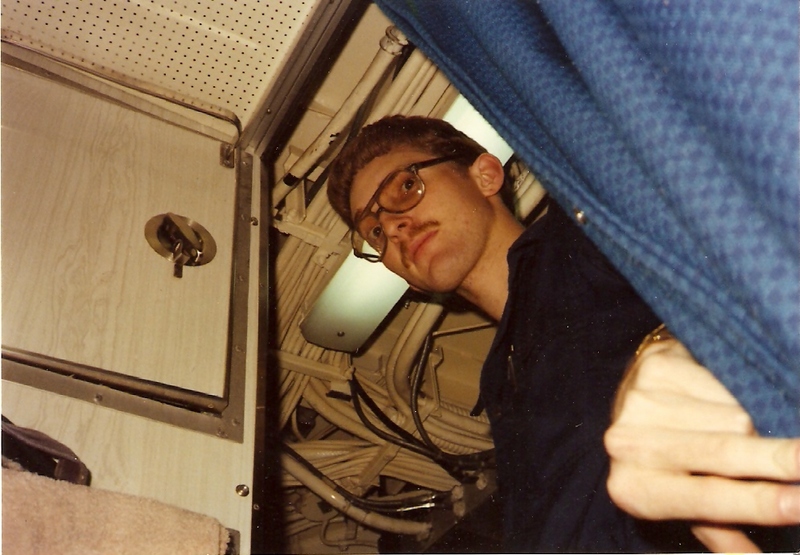 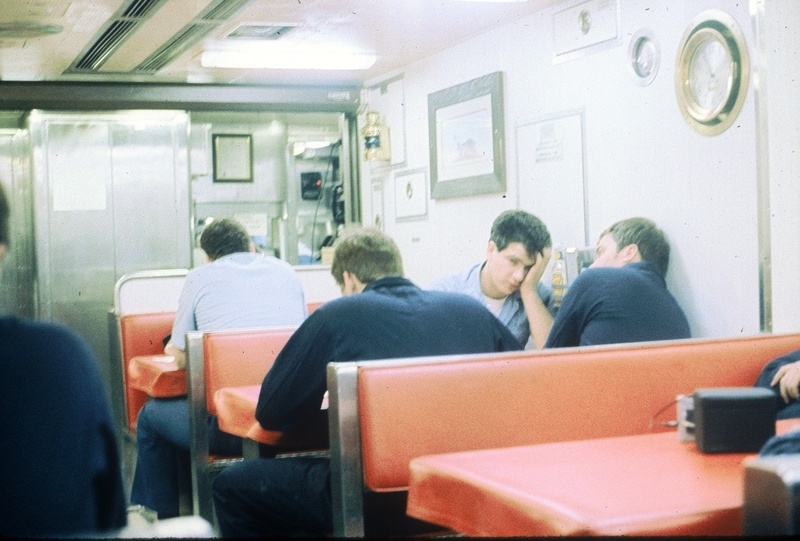 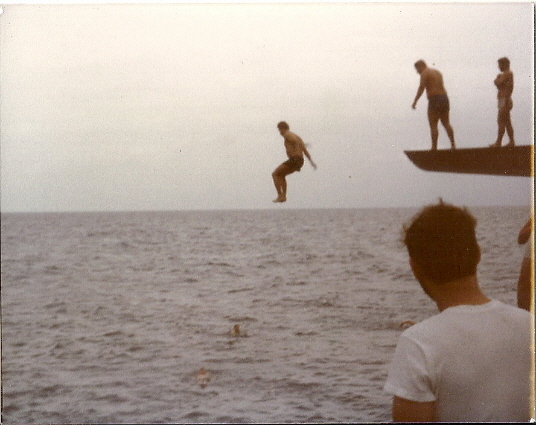 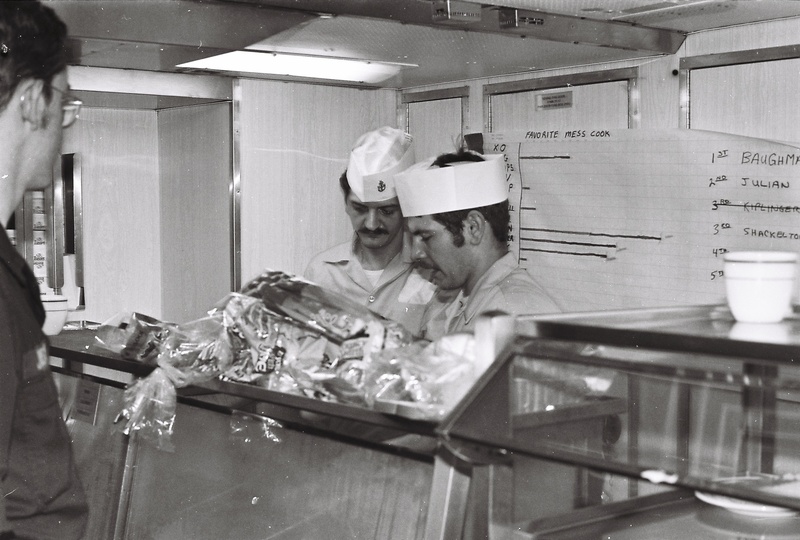 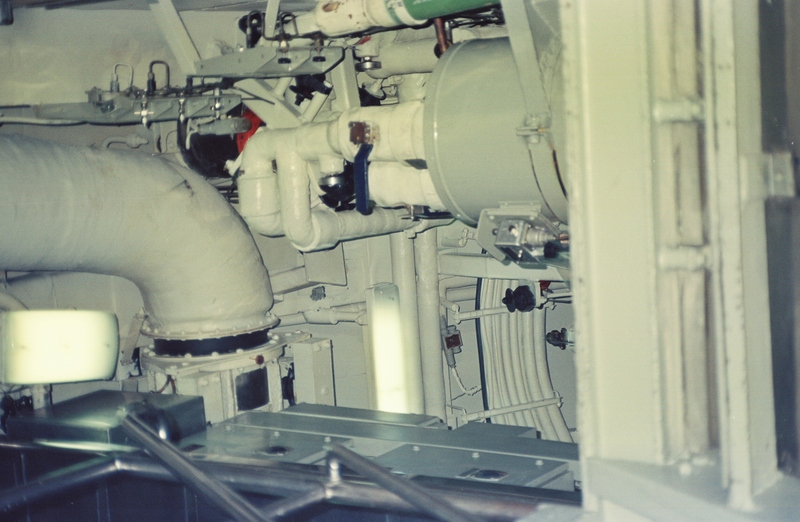 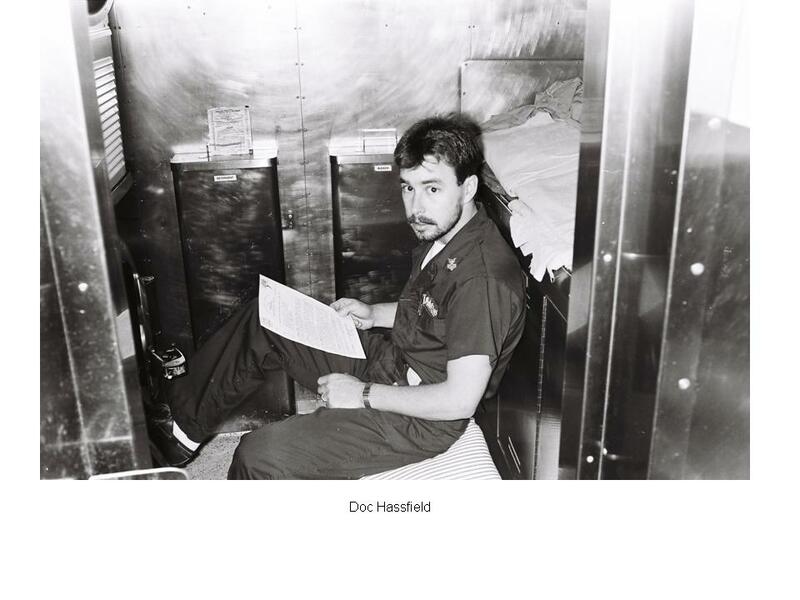 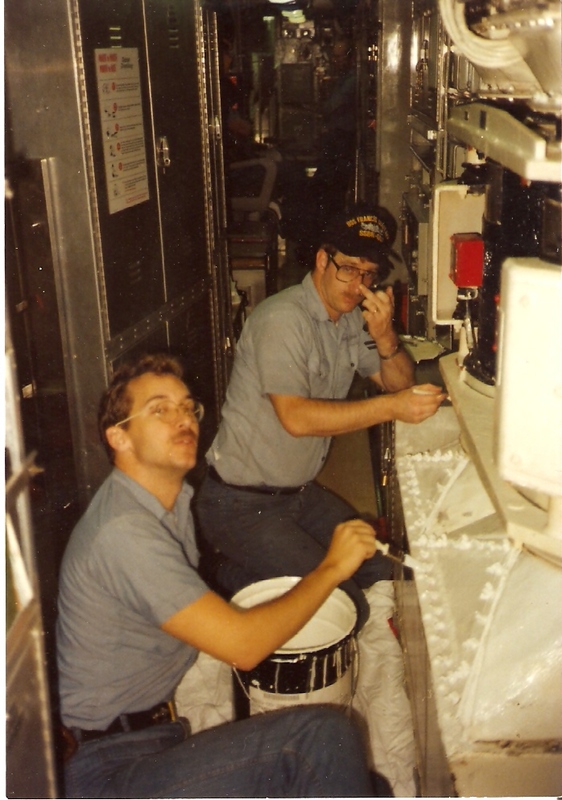 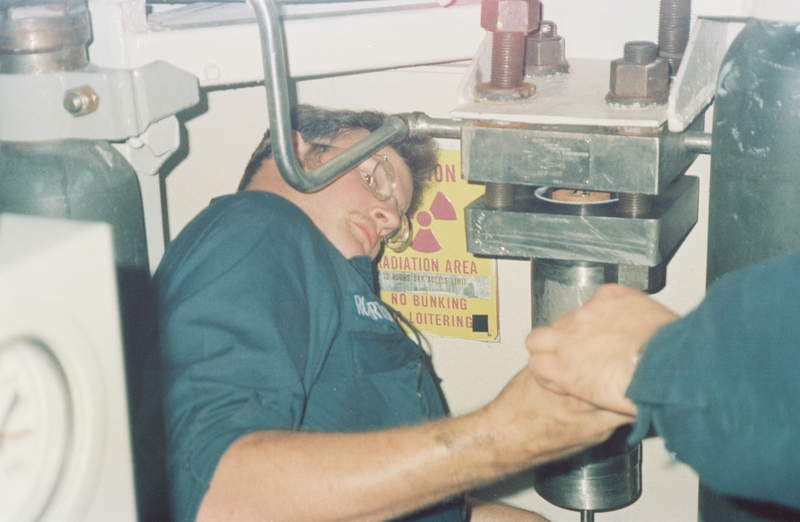 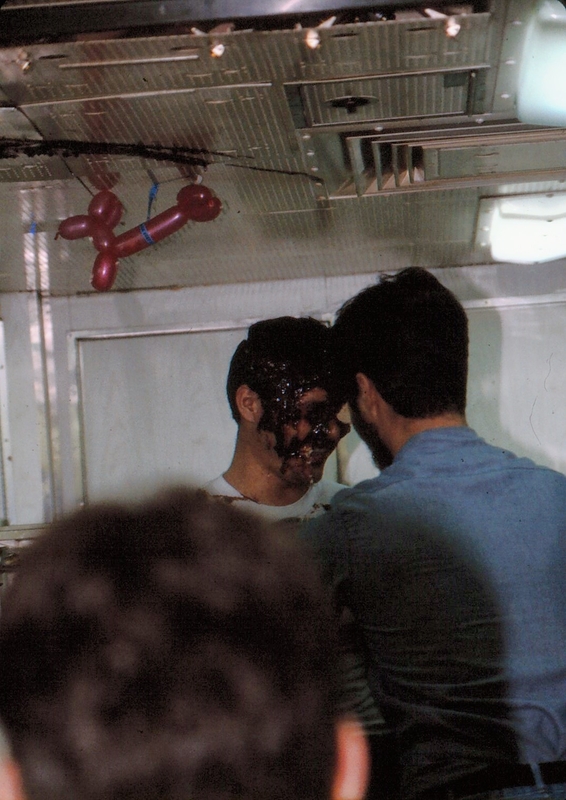 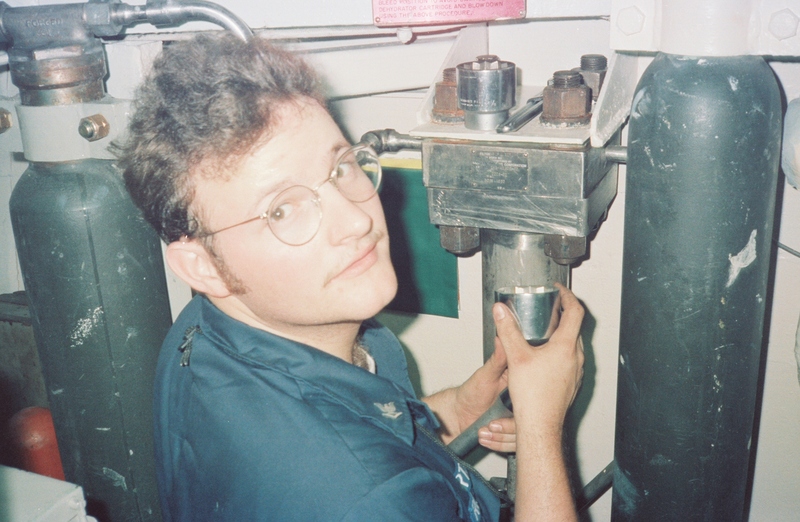 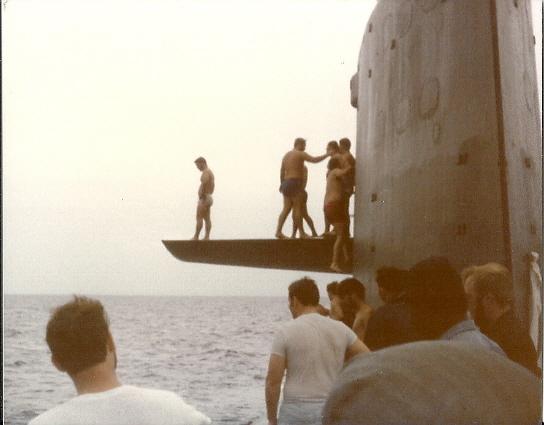 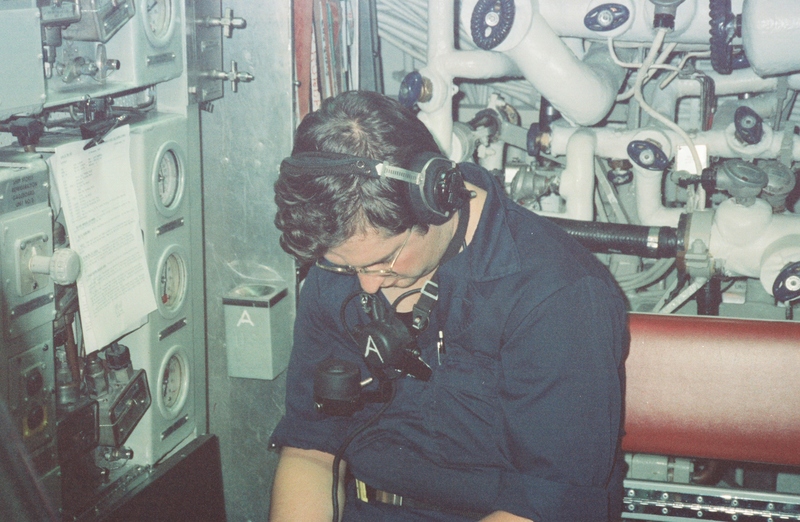 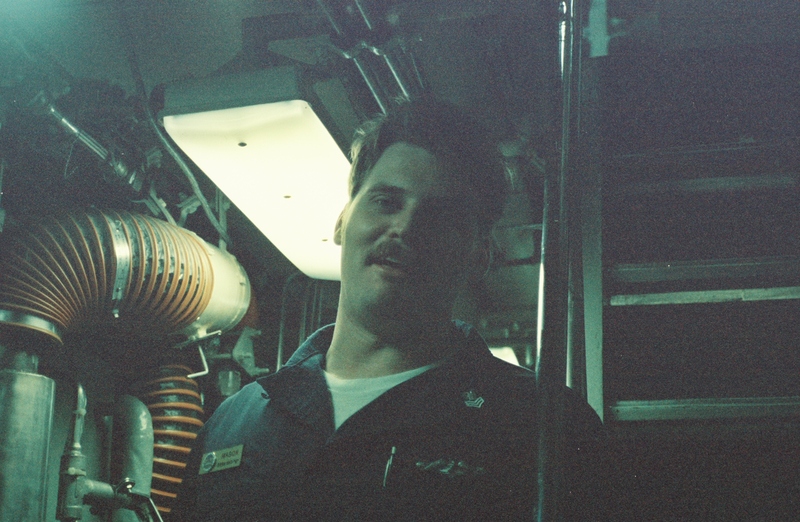 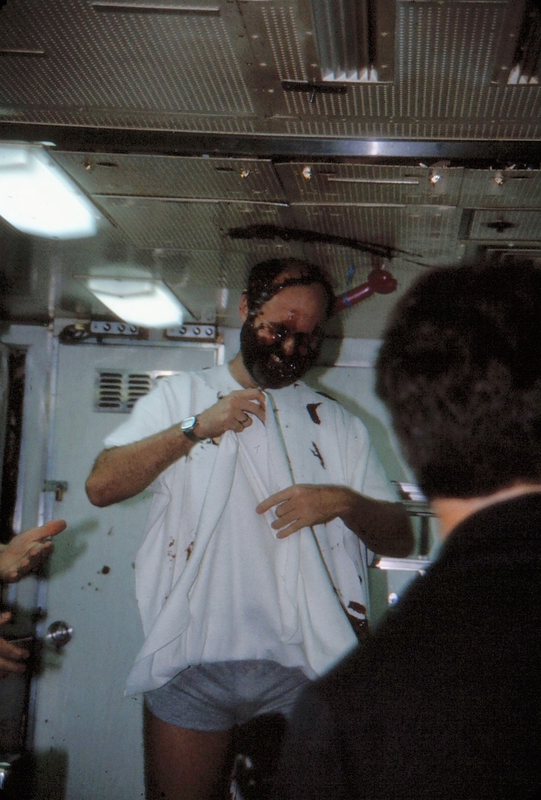 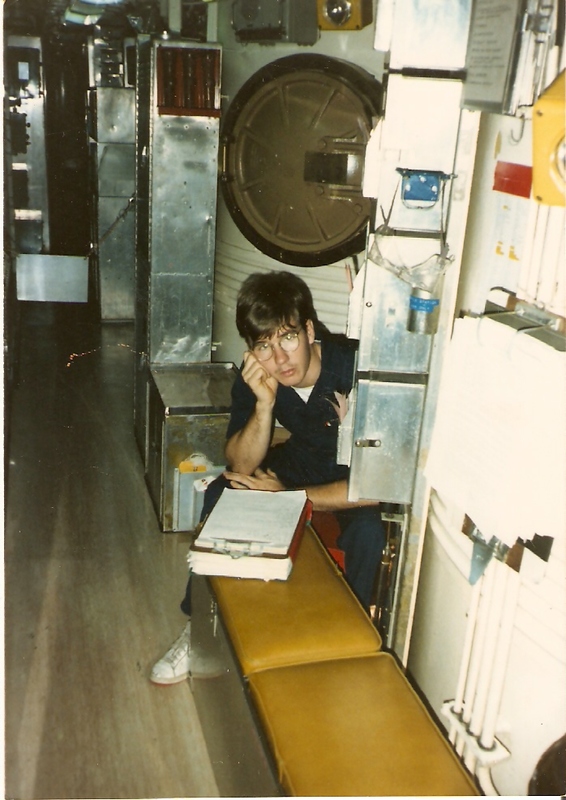 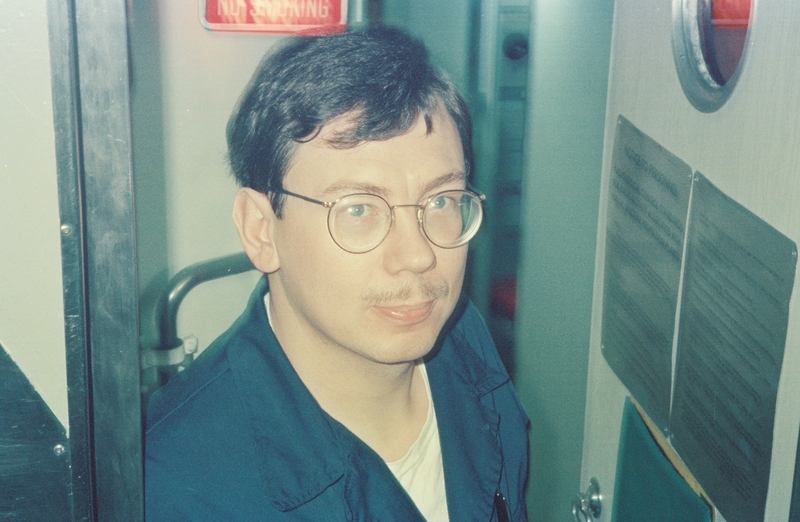 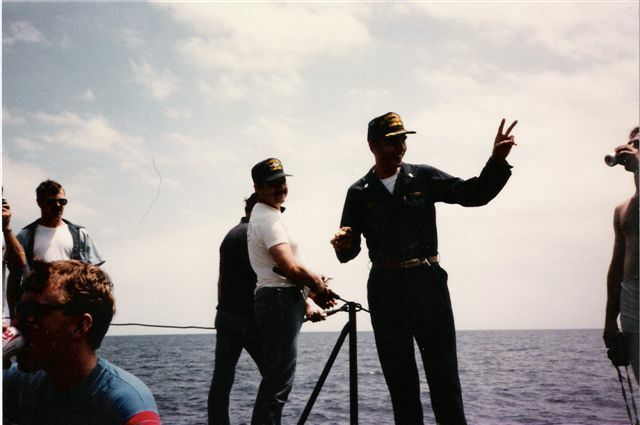 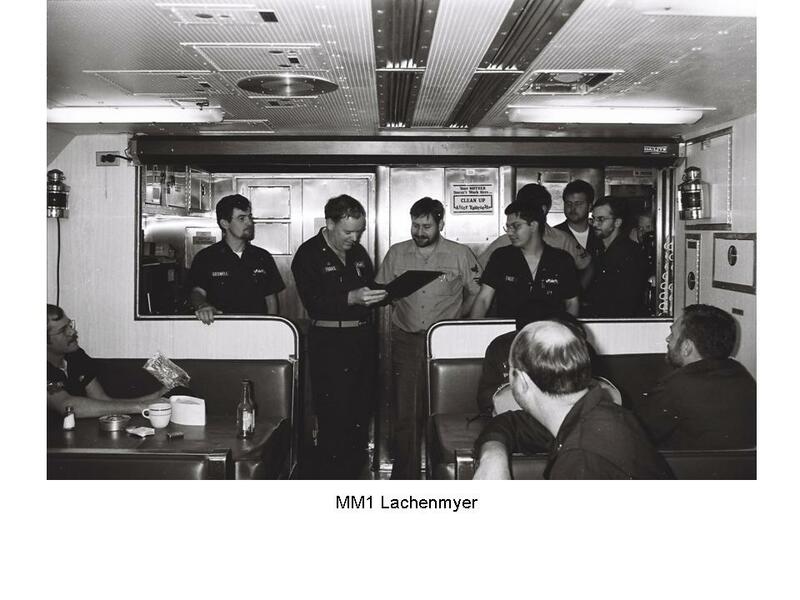 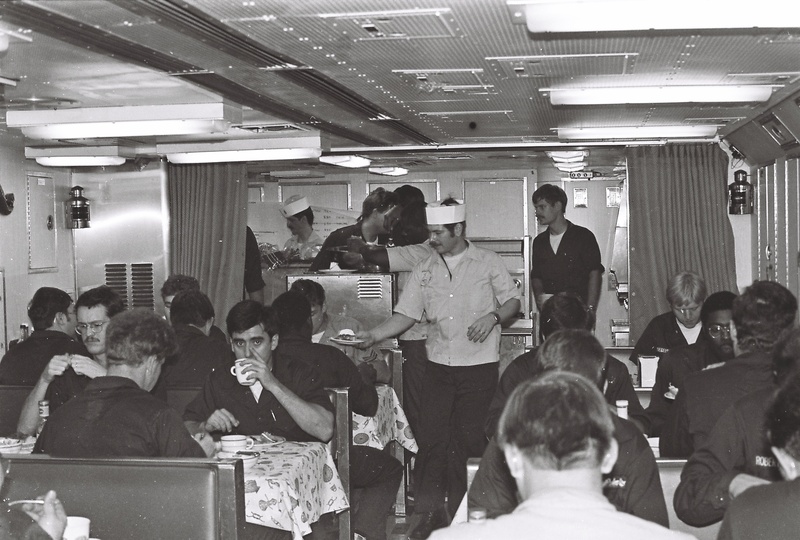 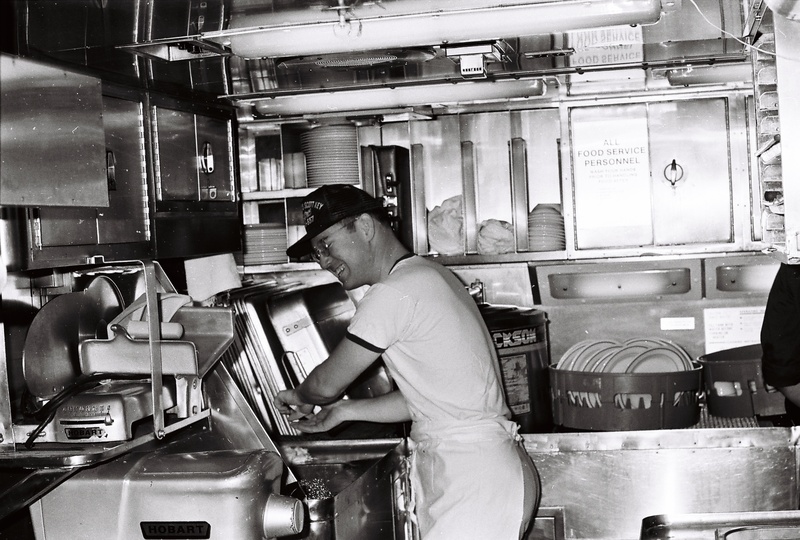 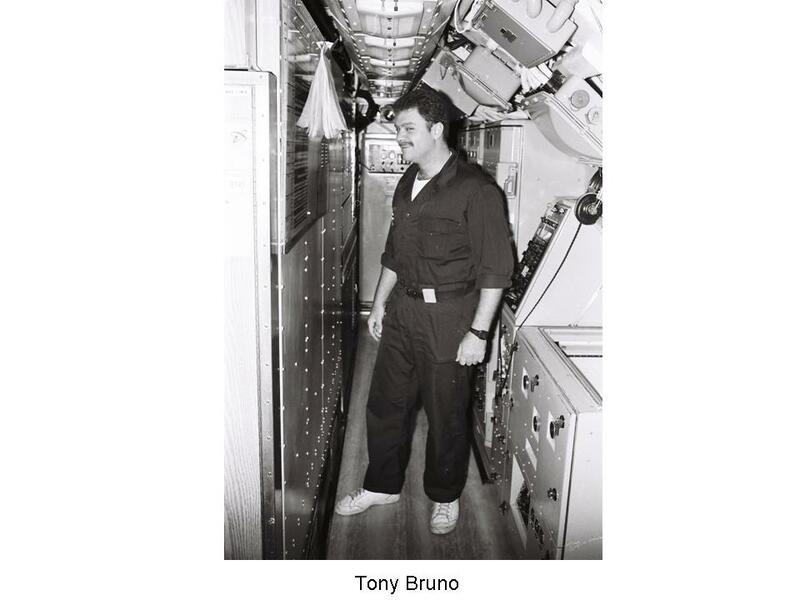 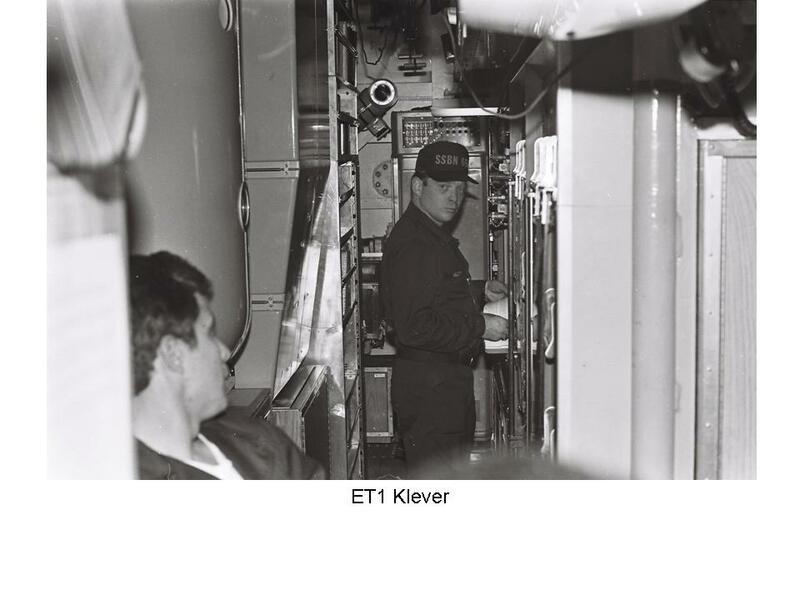 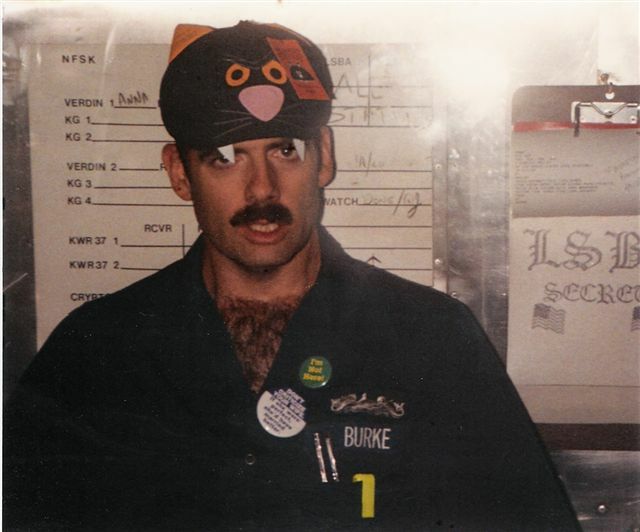 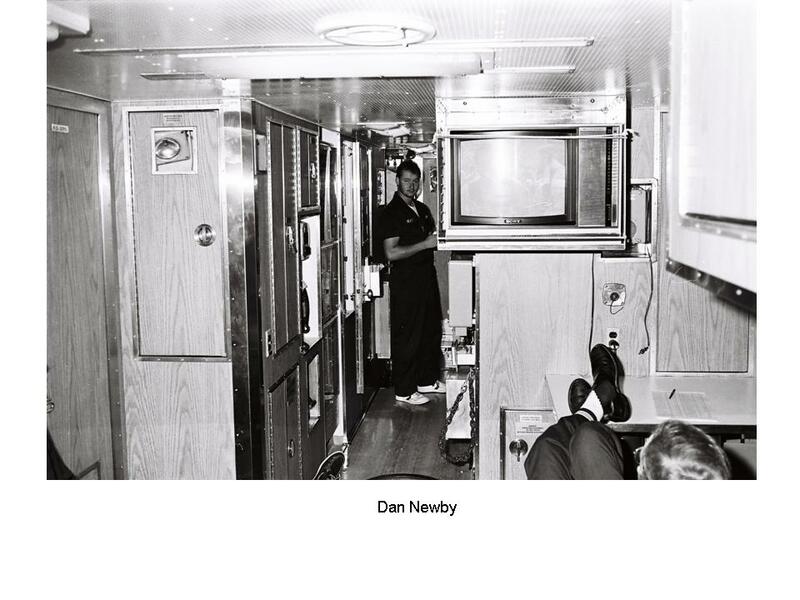 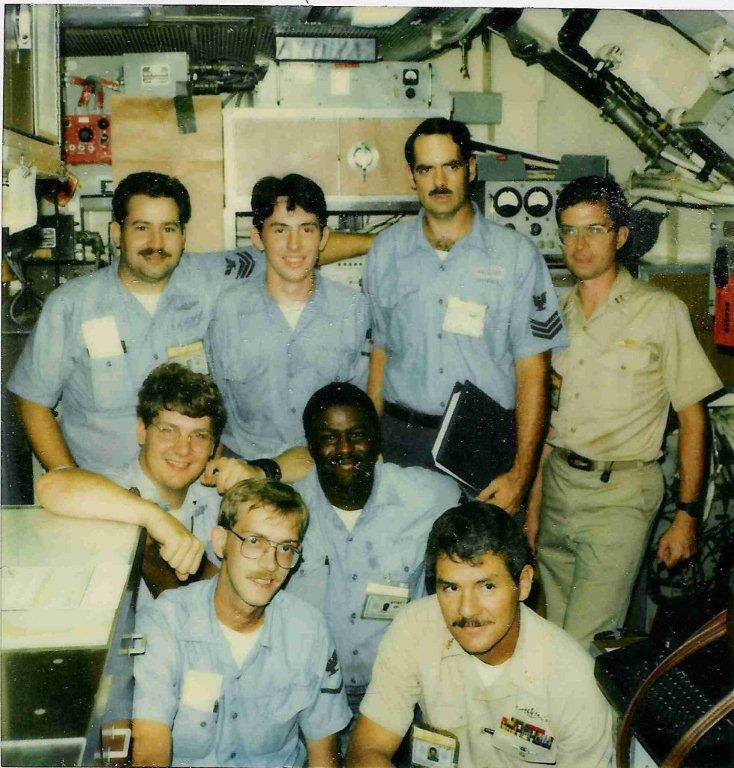 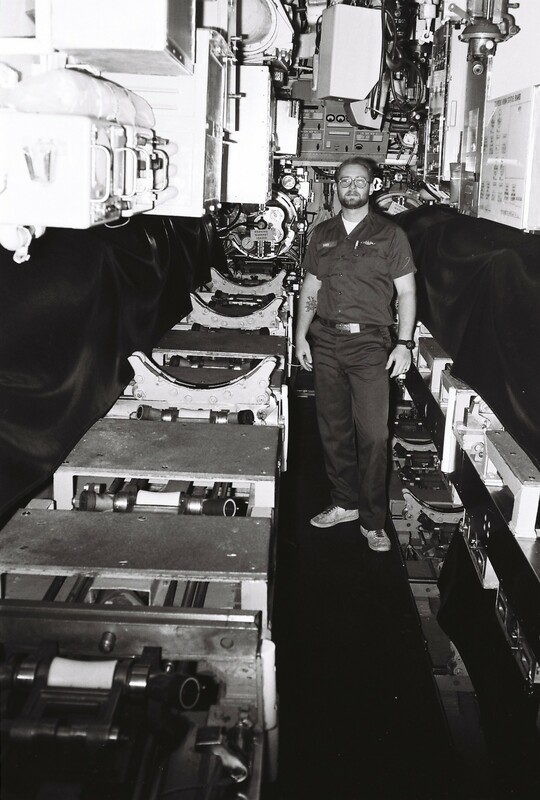 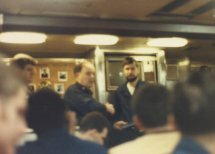 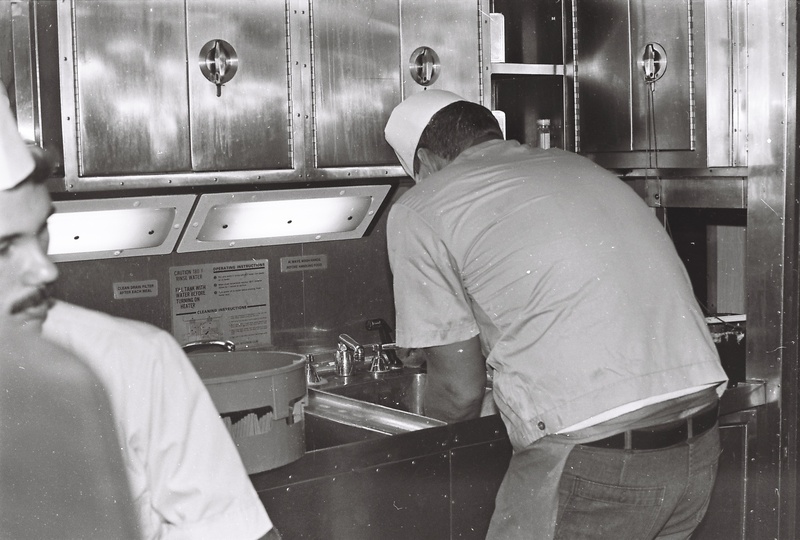 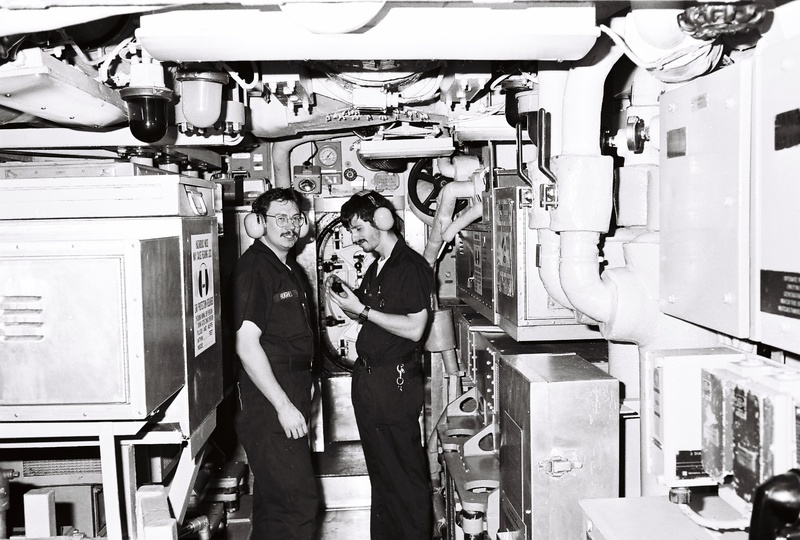 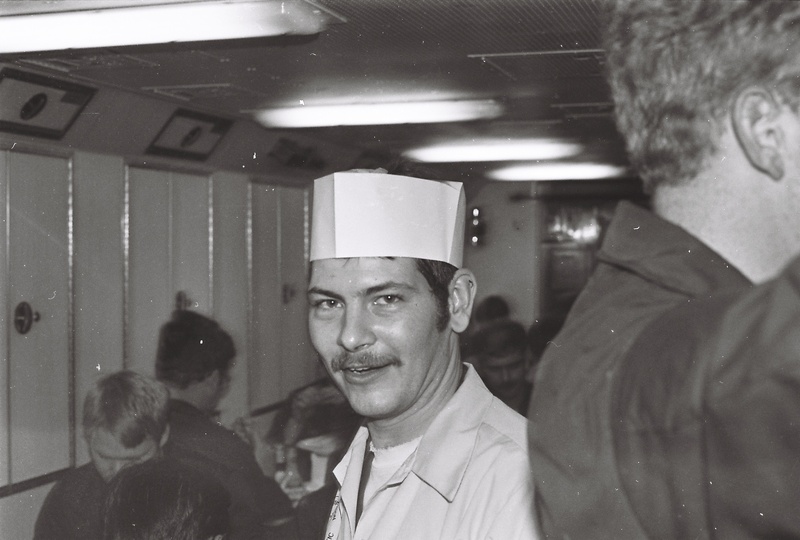 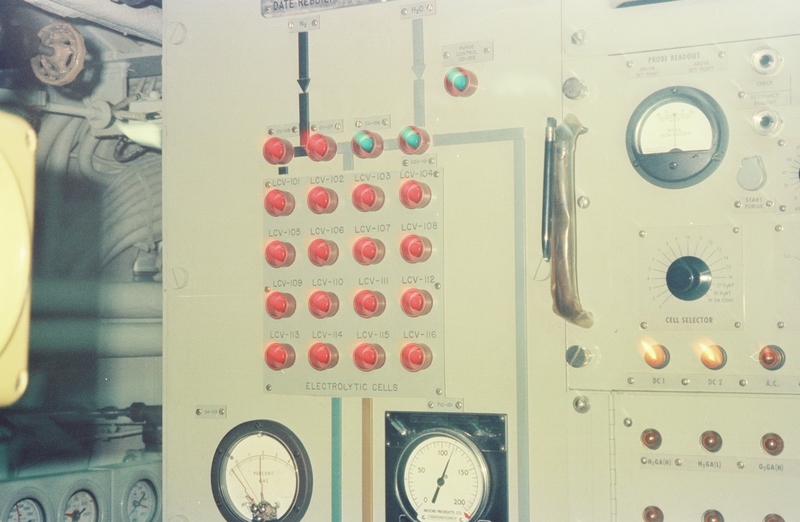 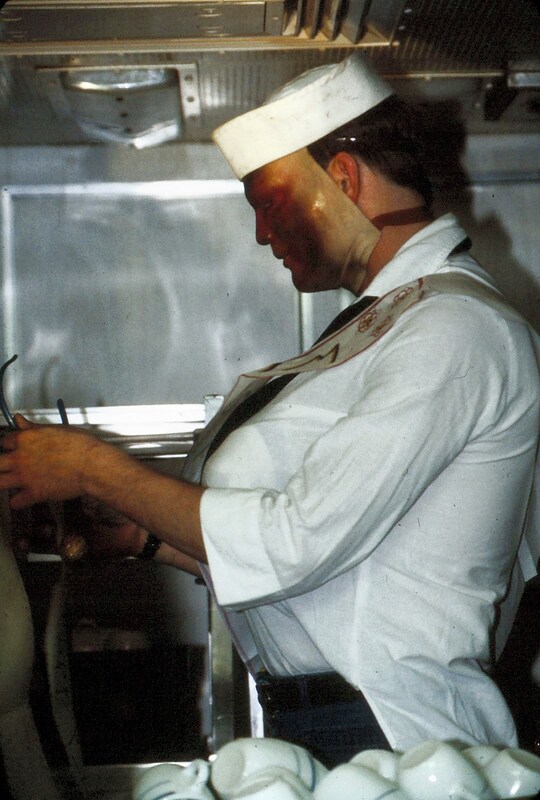 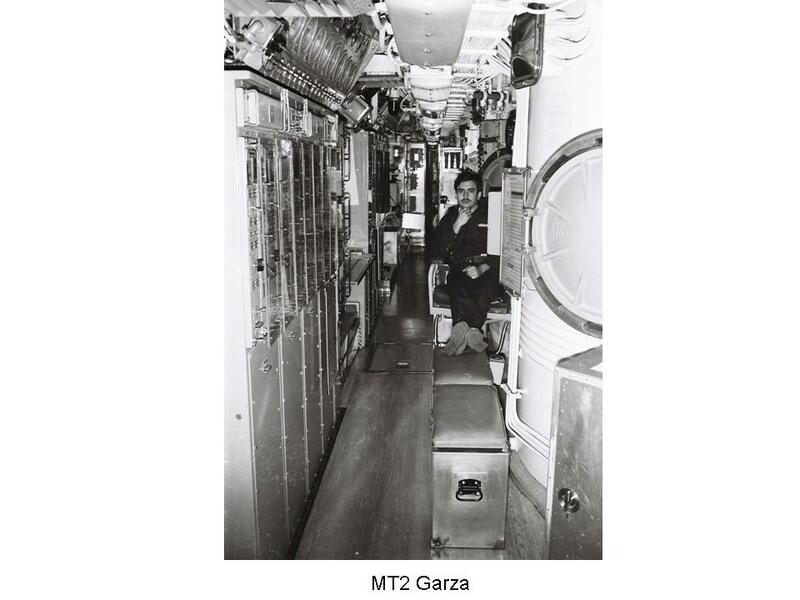 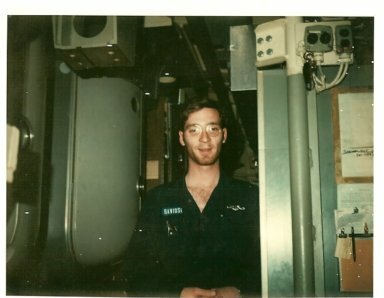 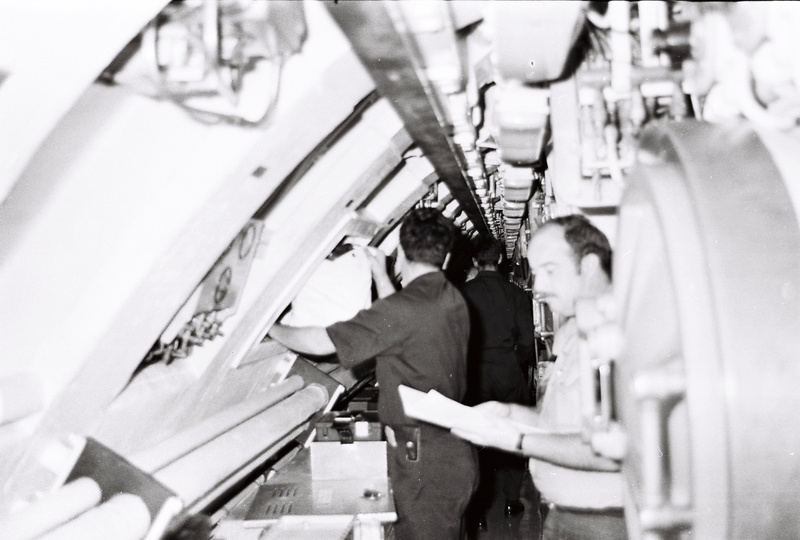 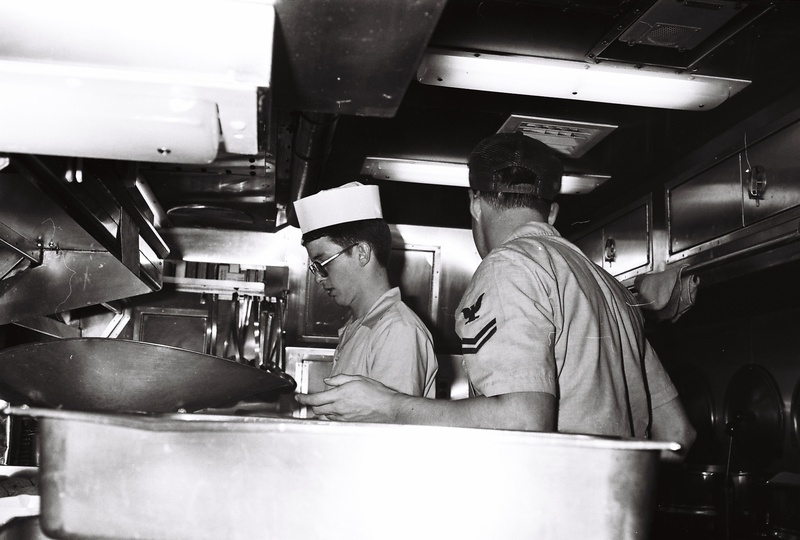 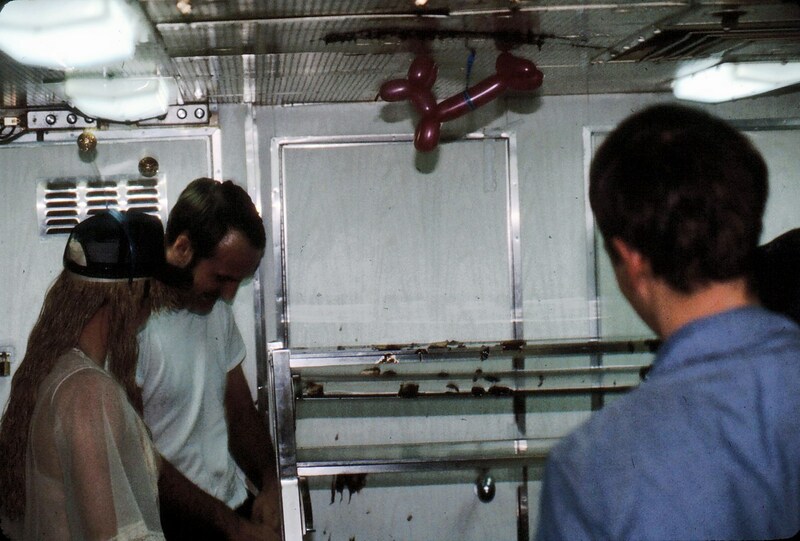 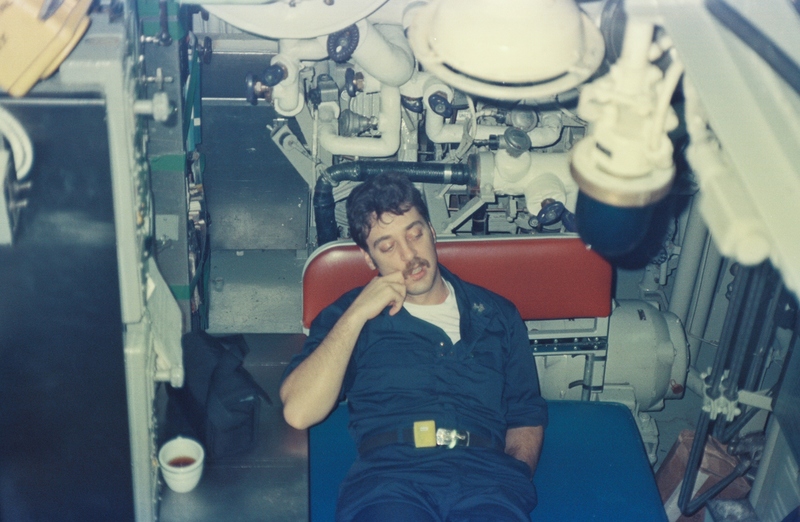 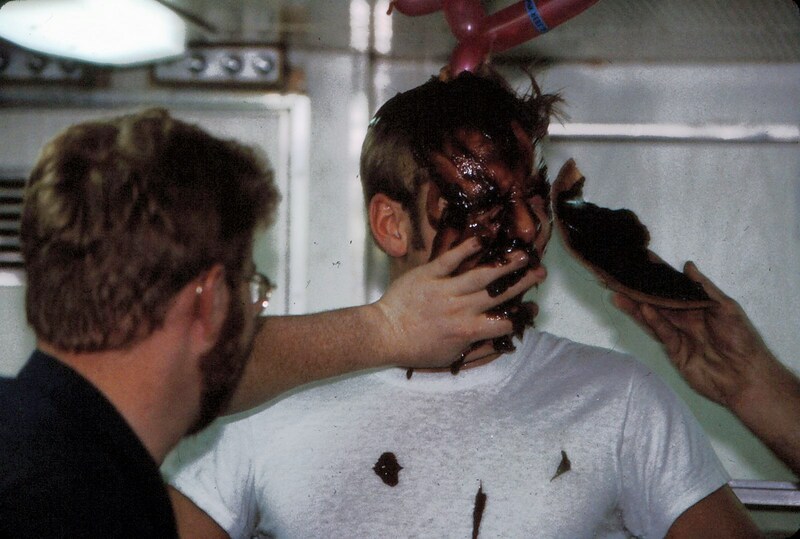 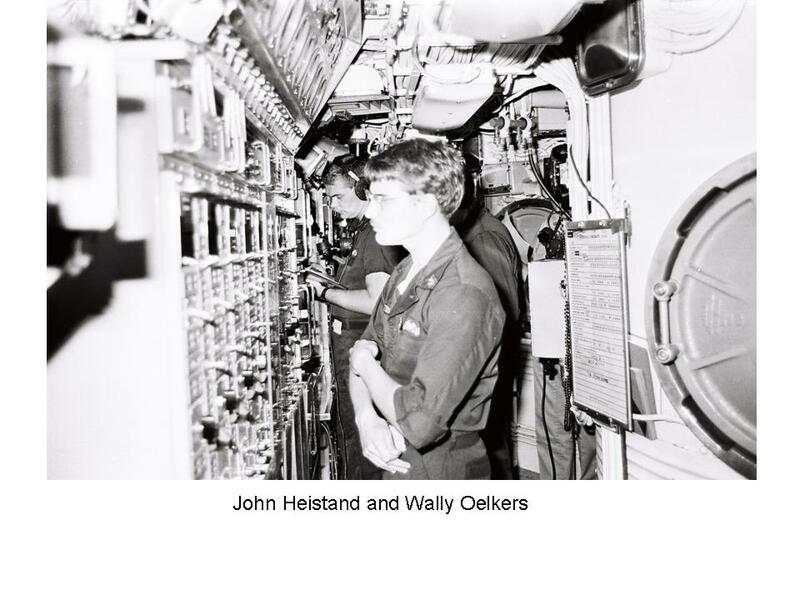 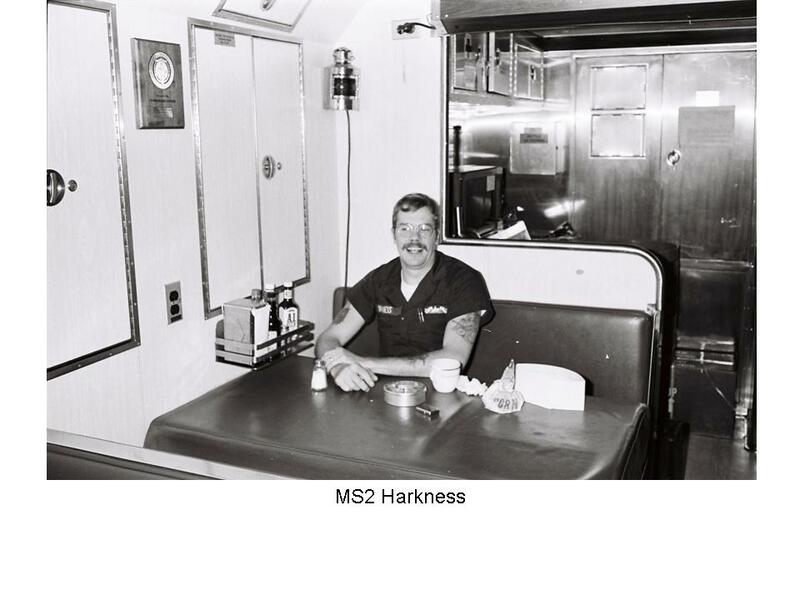 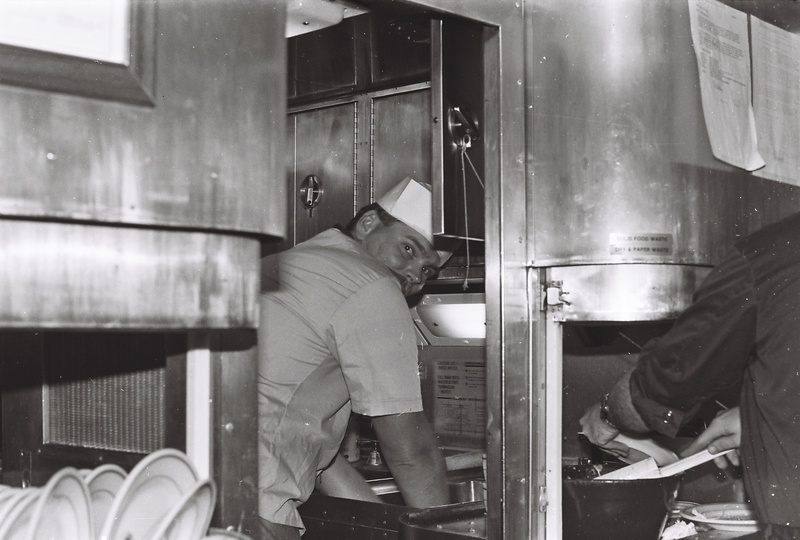 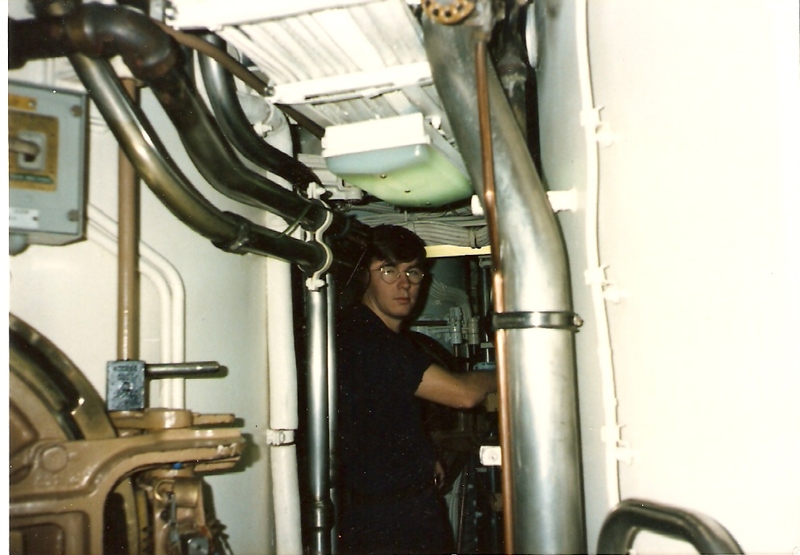 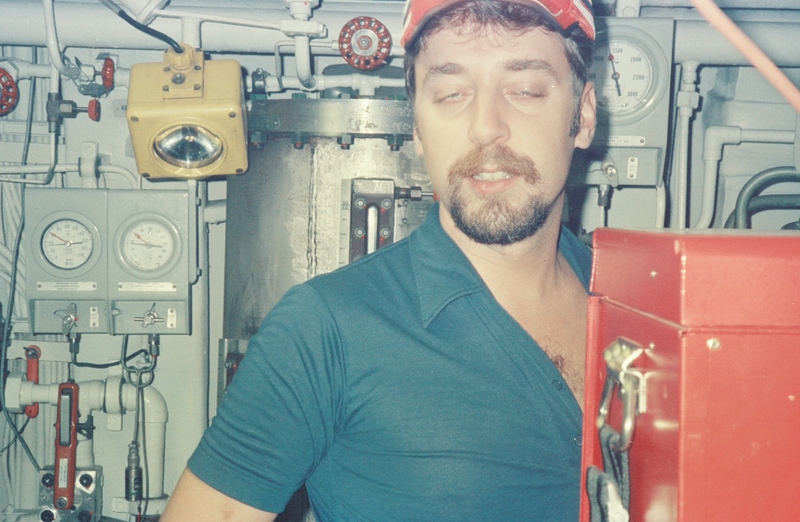 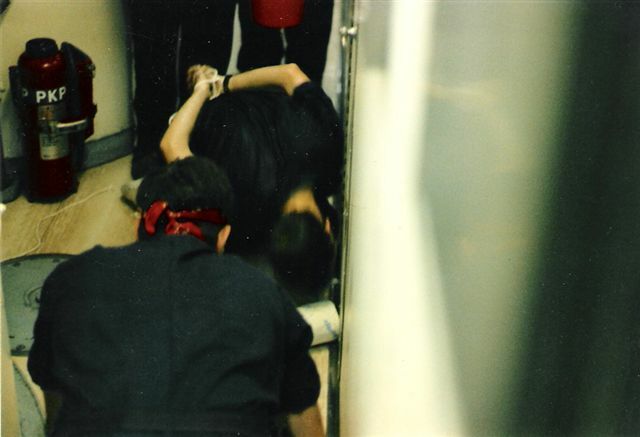 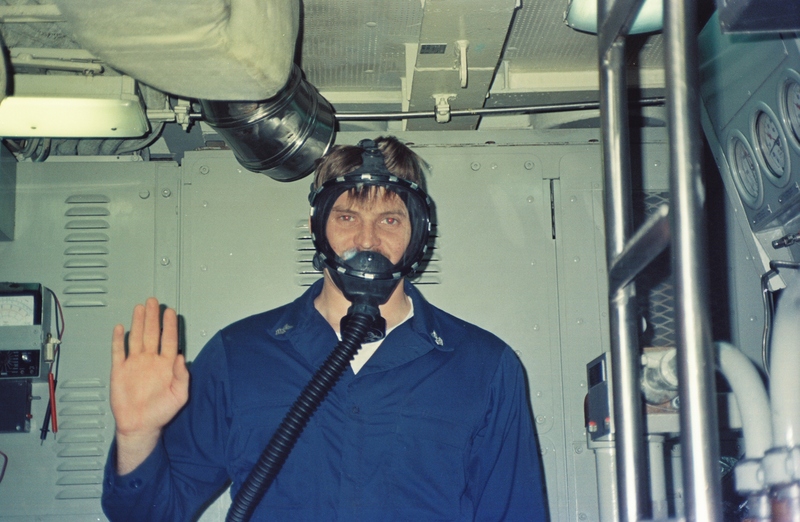 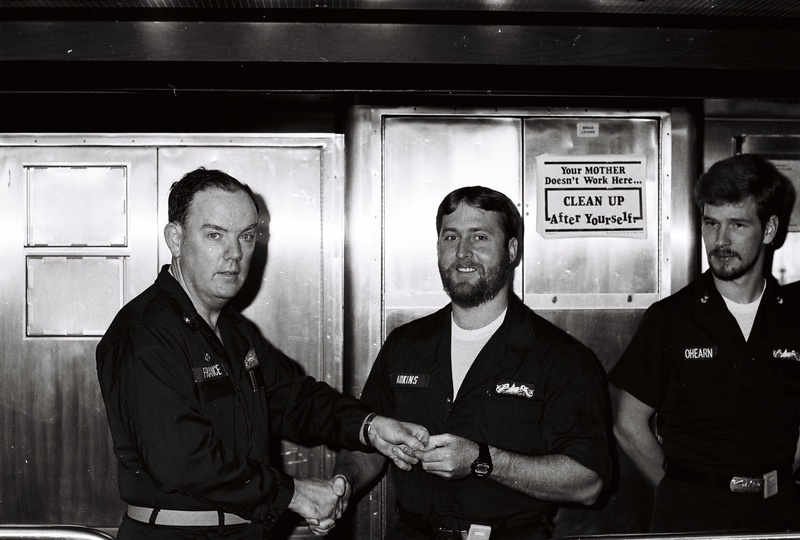 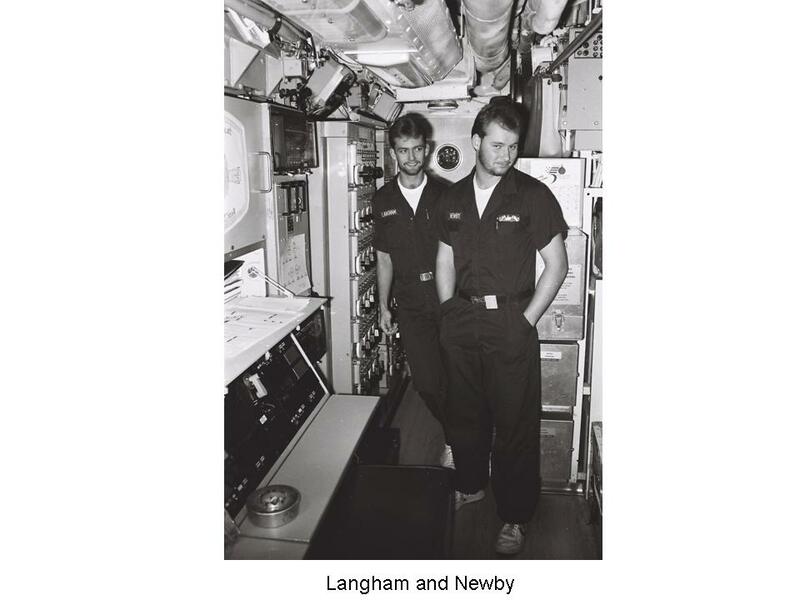 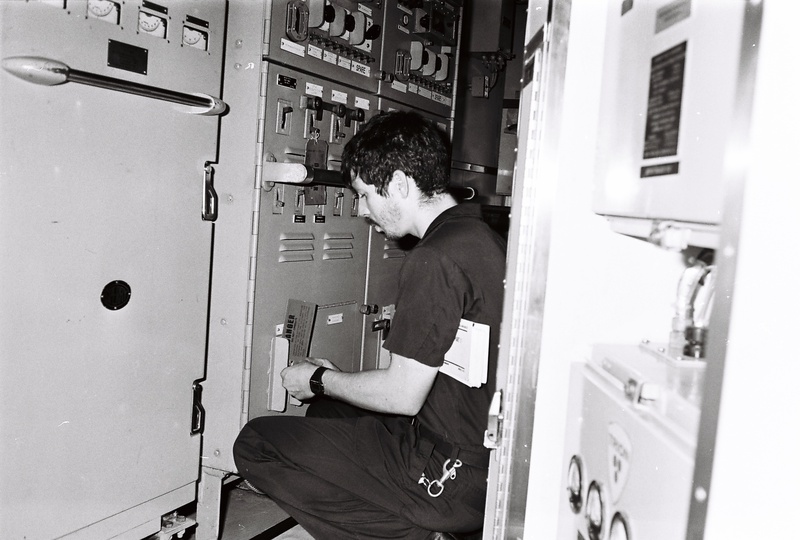 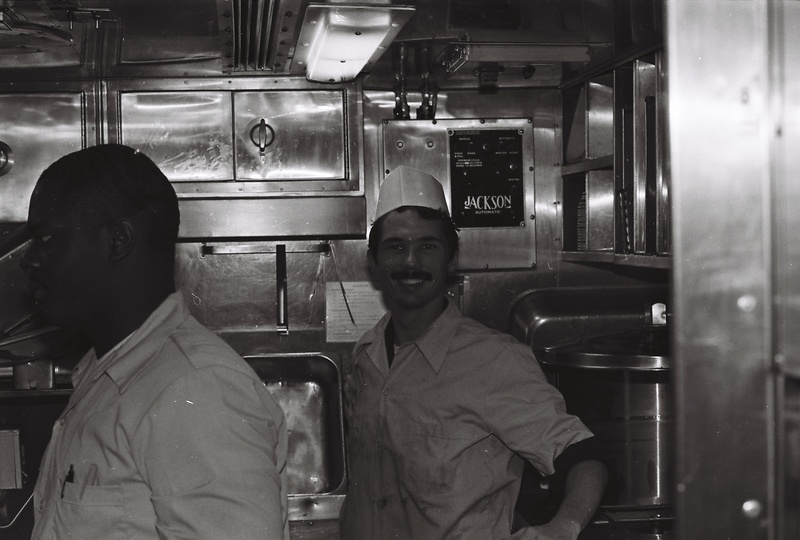 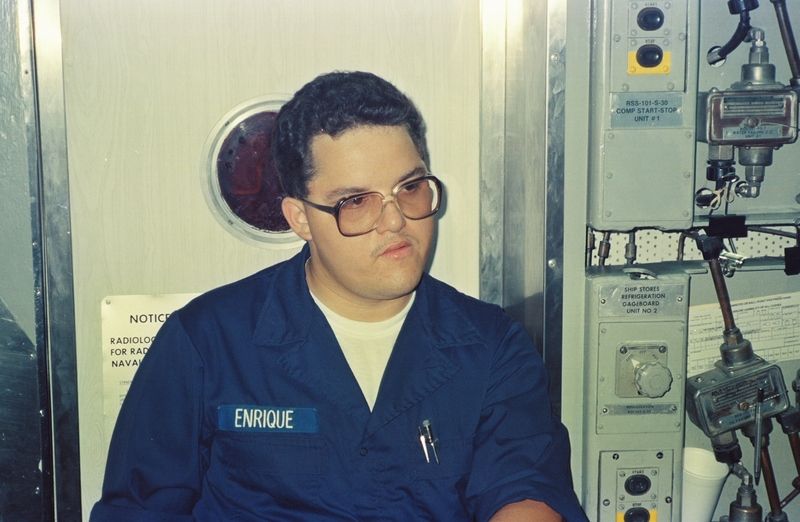 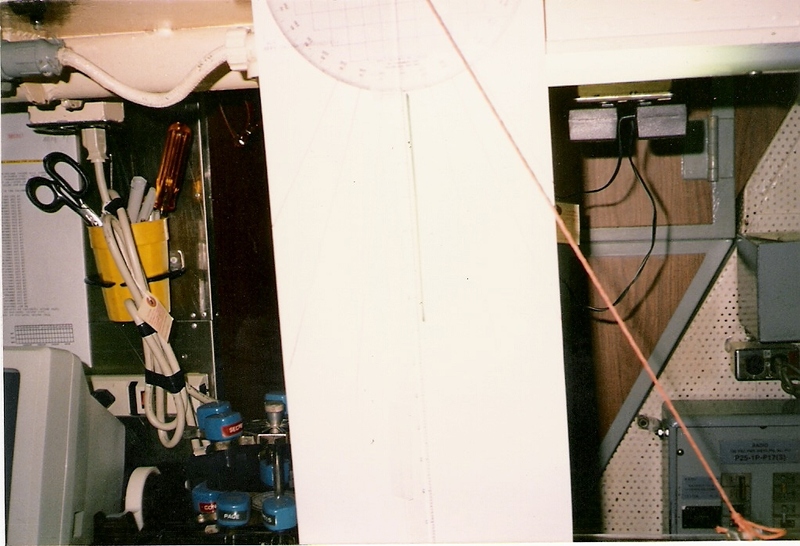 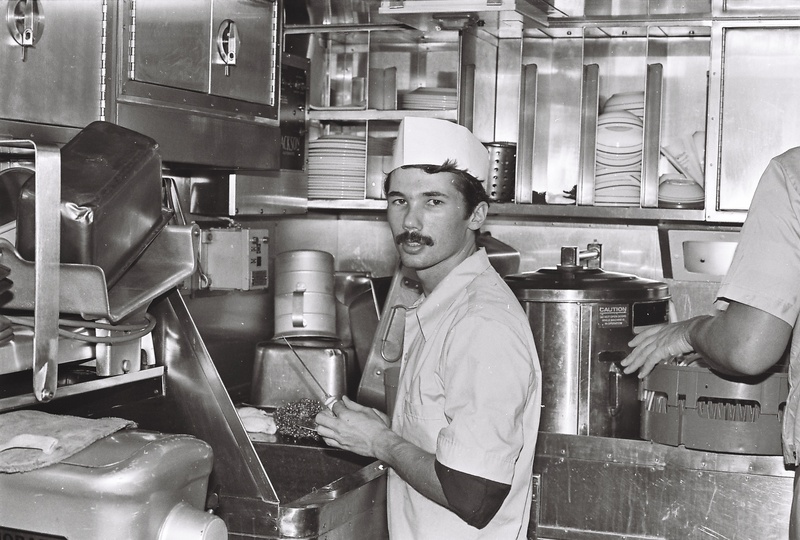 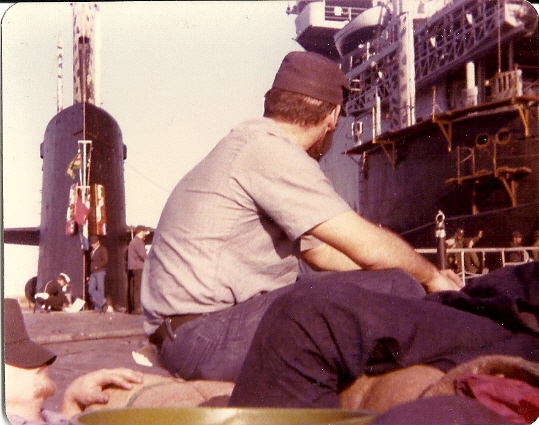 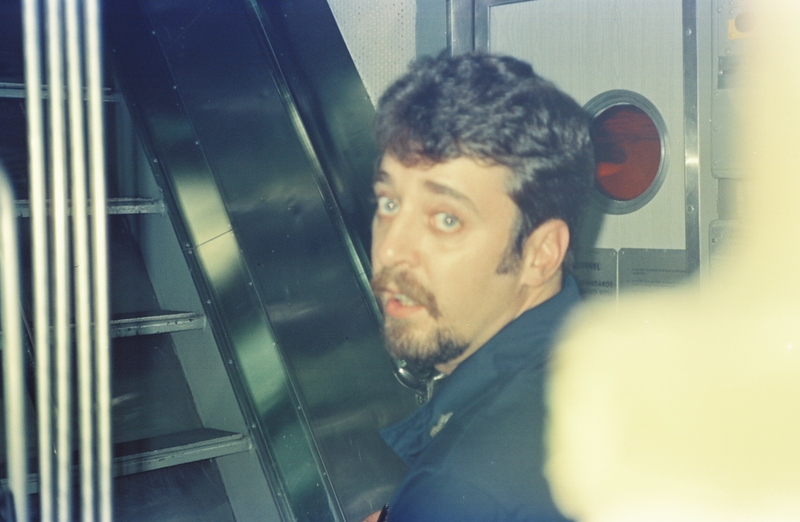 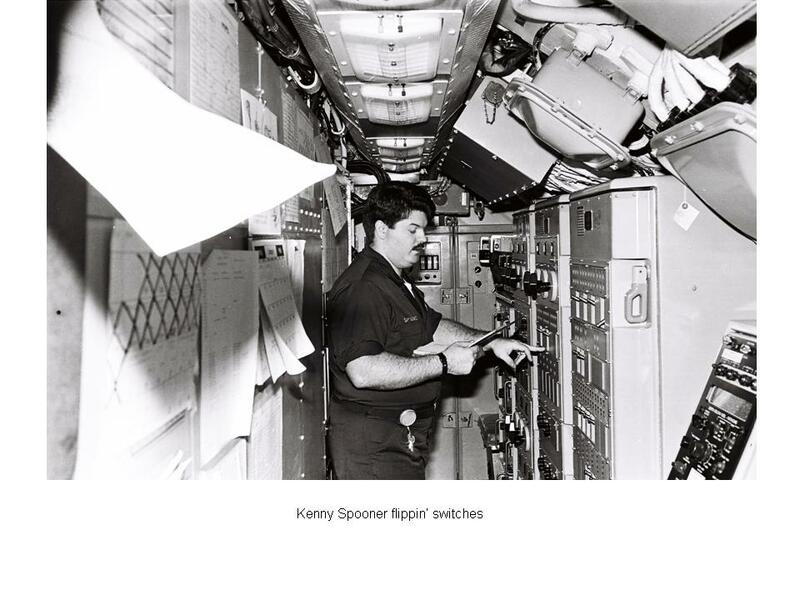 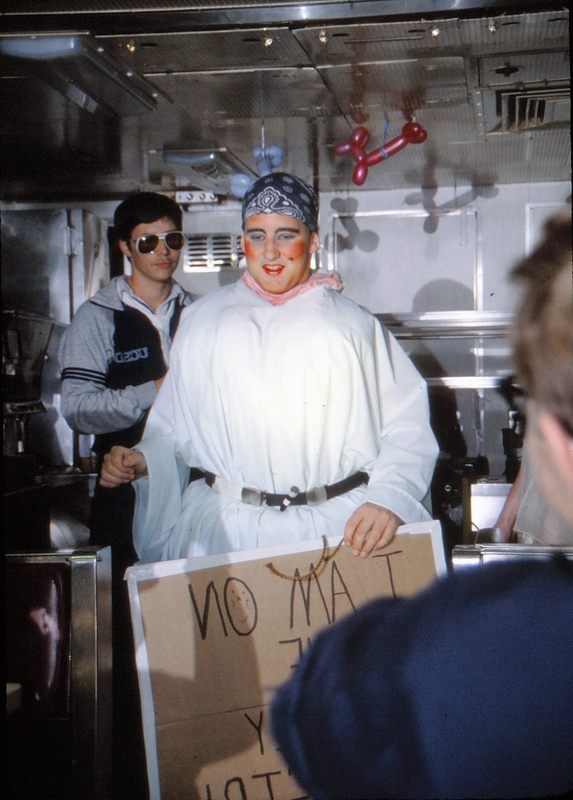 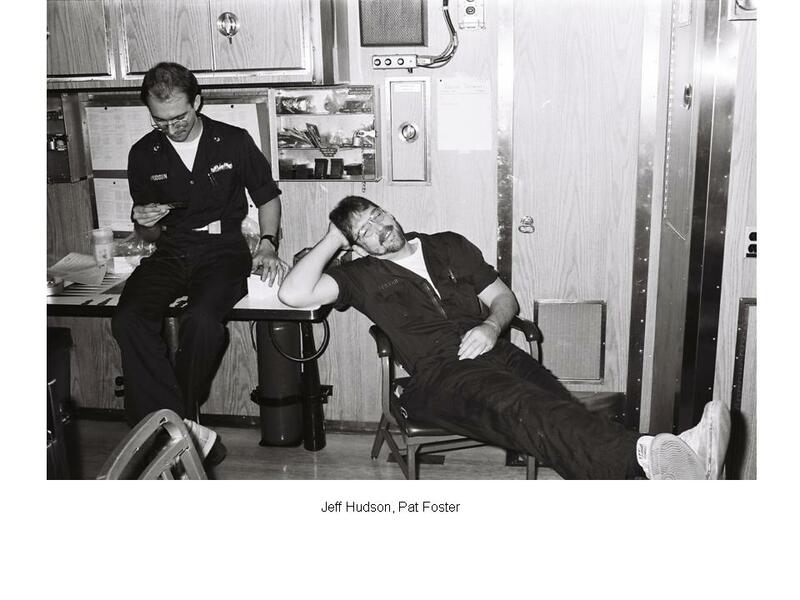 These are photos taken in the 1980's on KEY or during off-crew times. 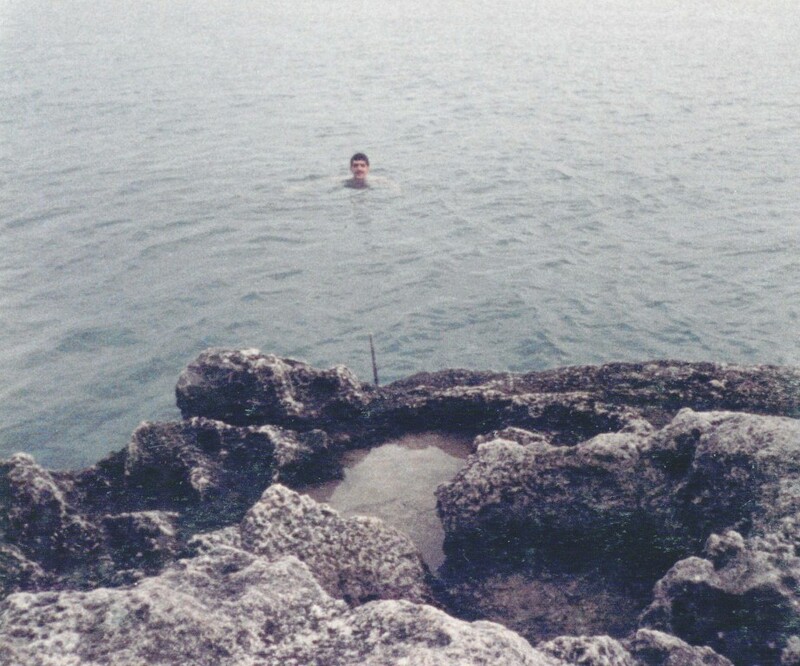 They are thumbnails so you can click on them for a full size image. 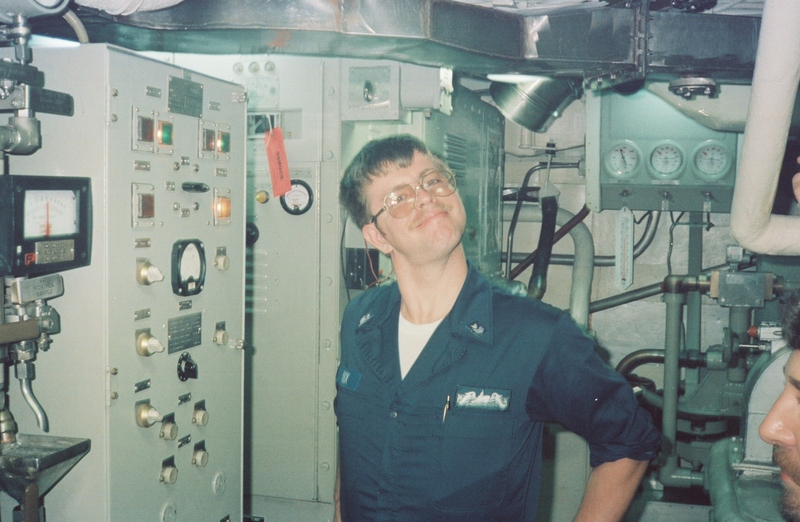 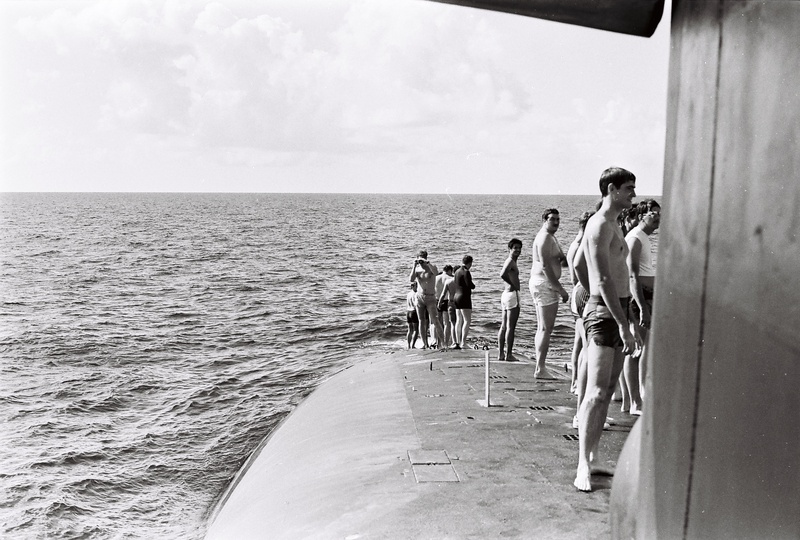 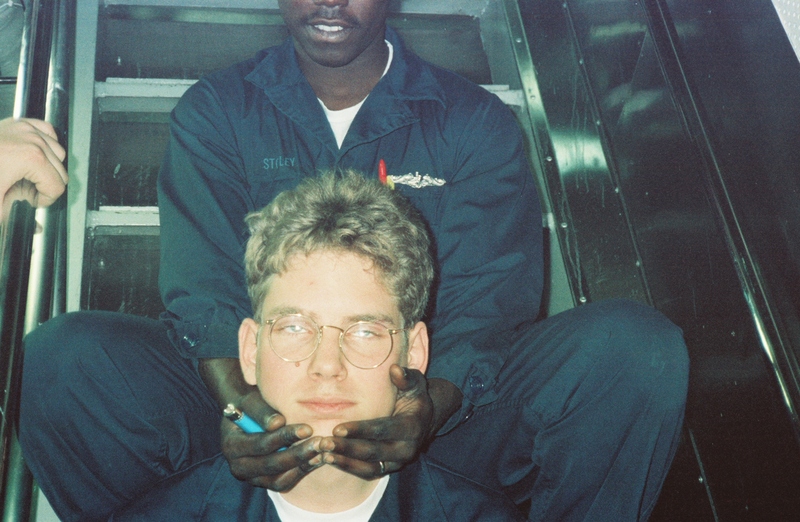 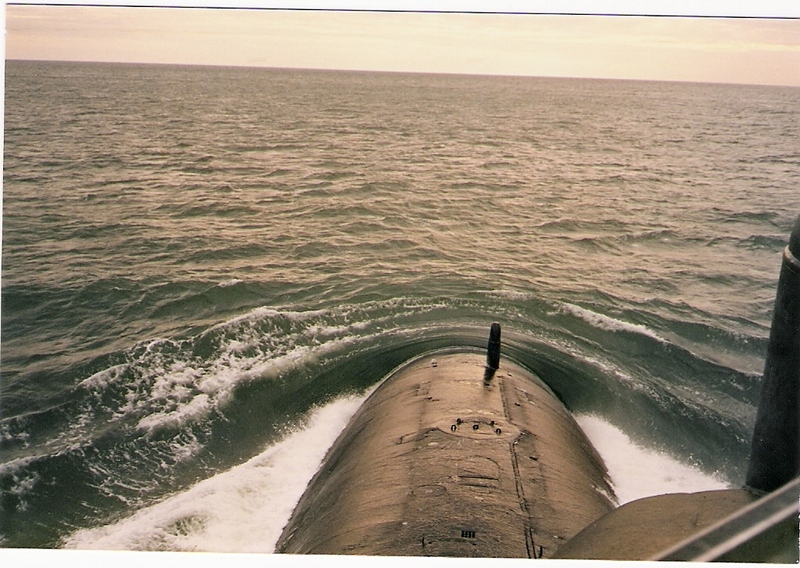 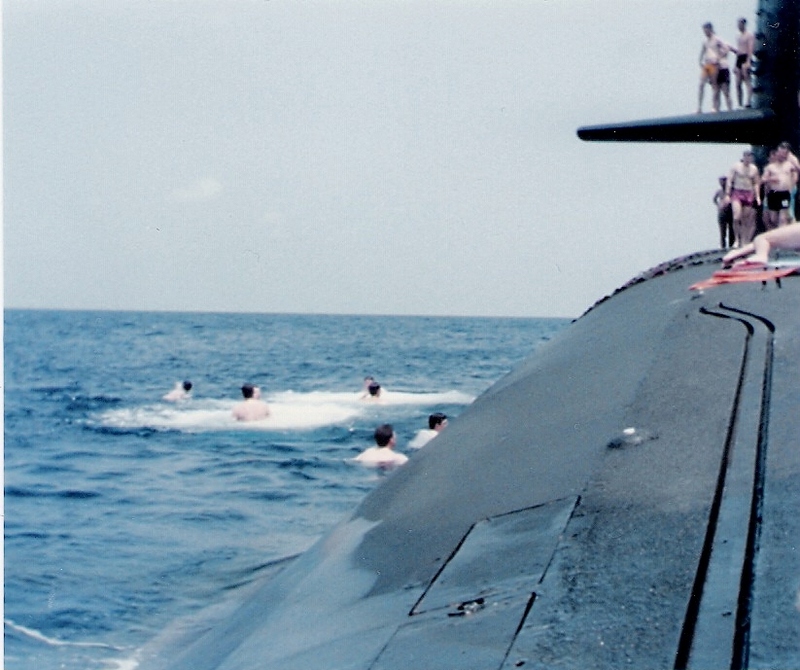 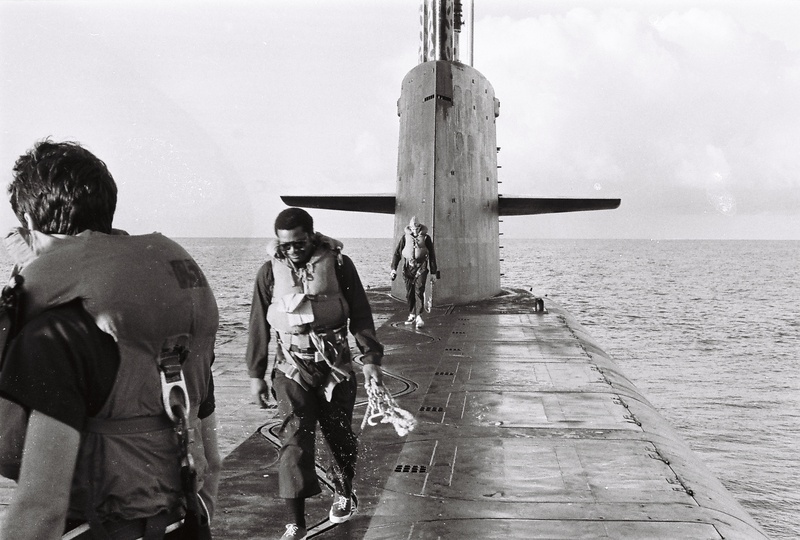 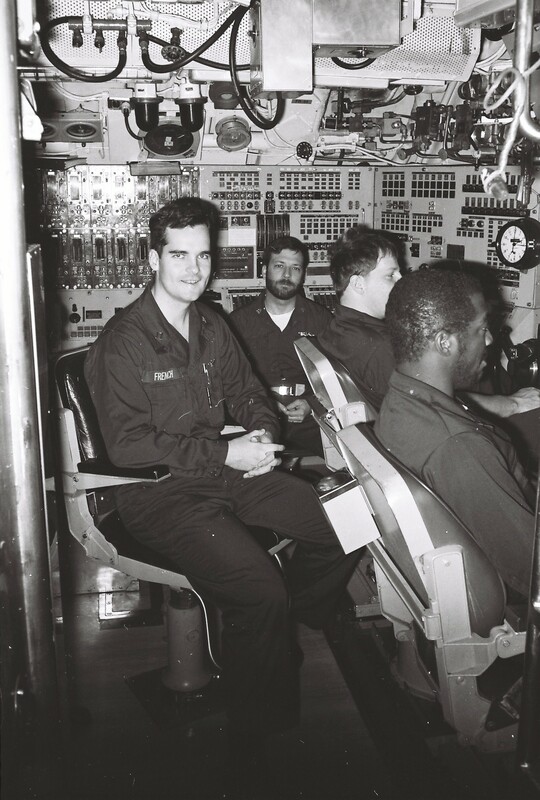 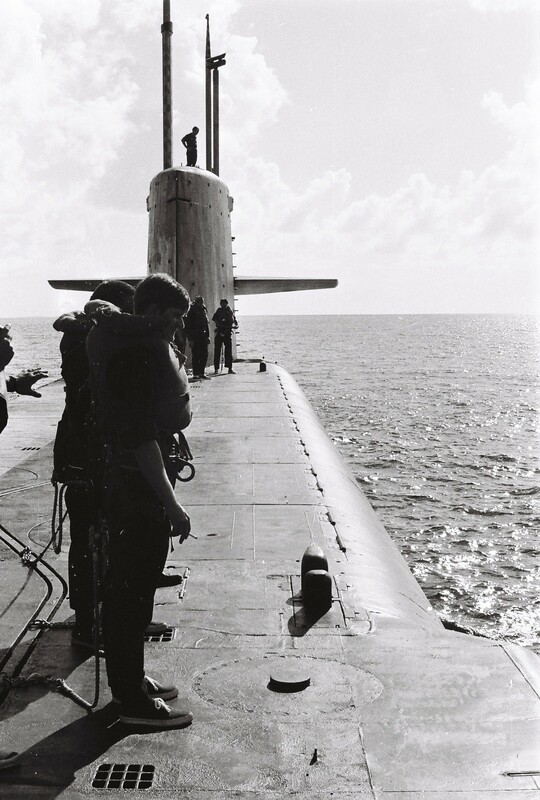 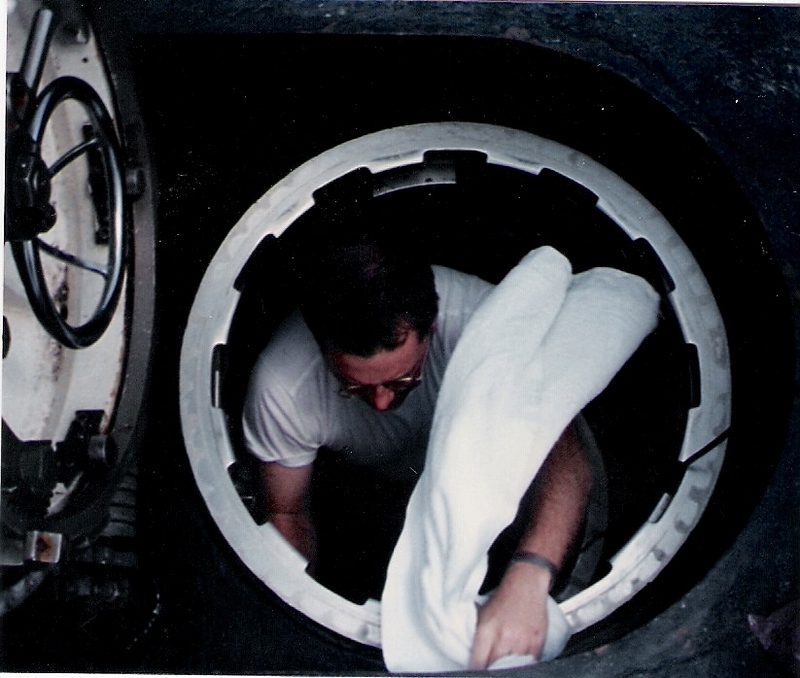 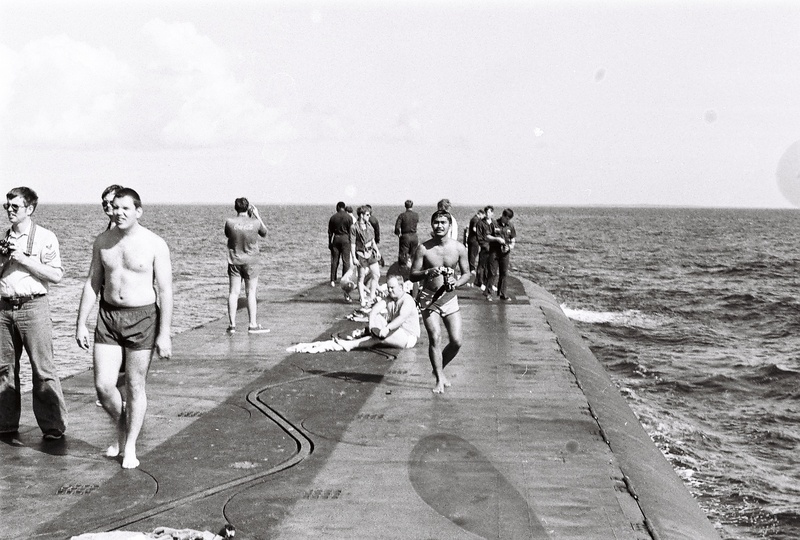 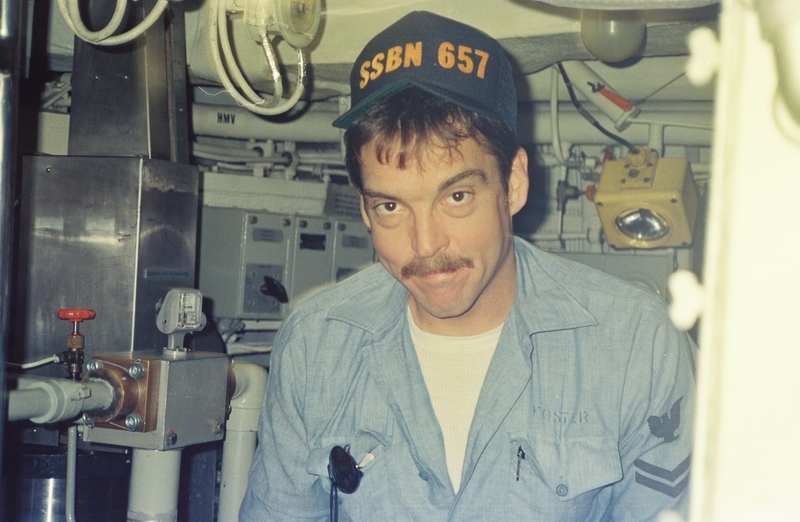 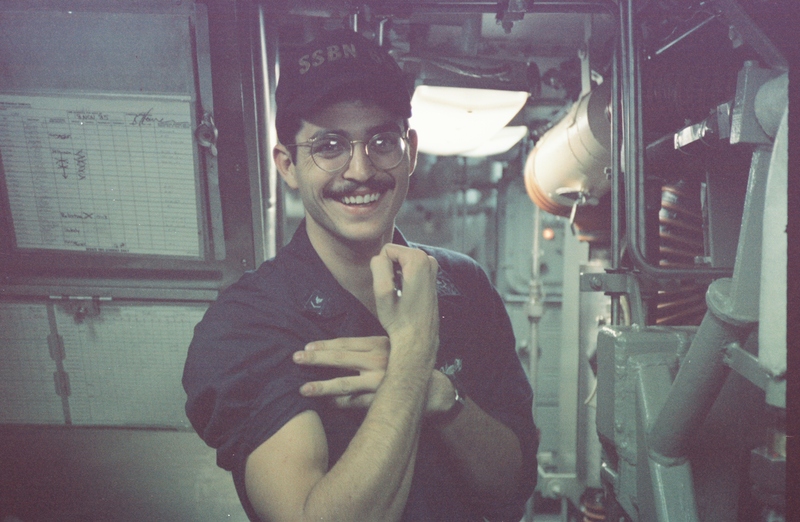 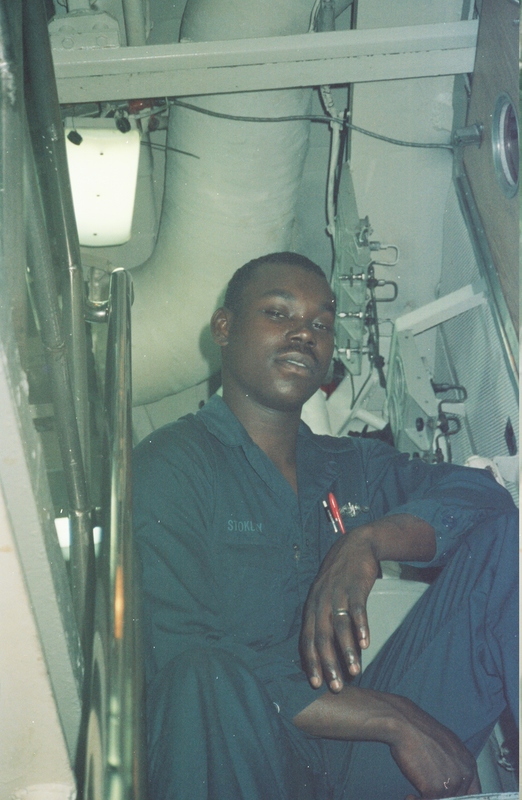 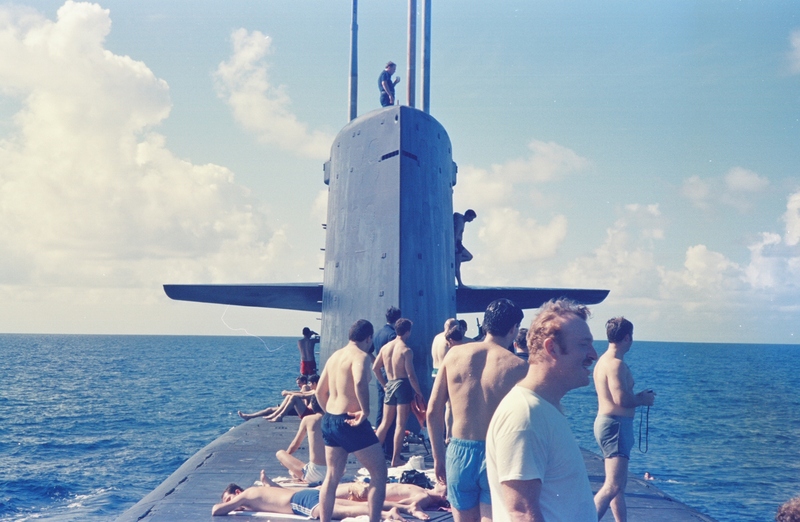 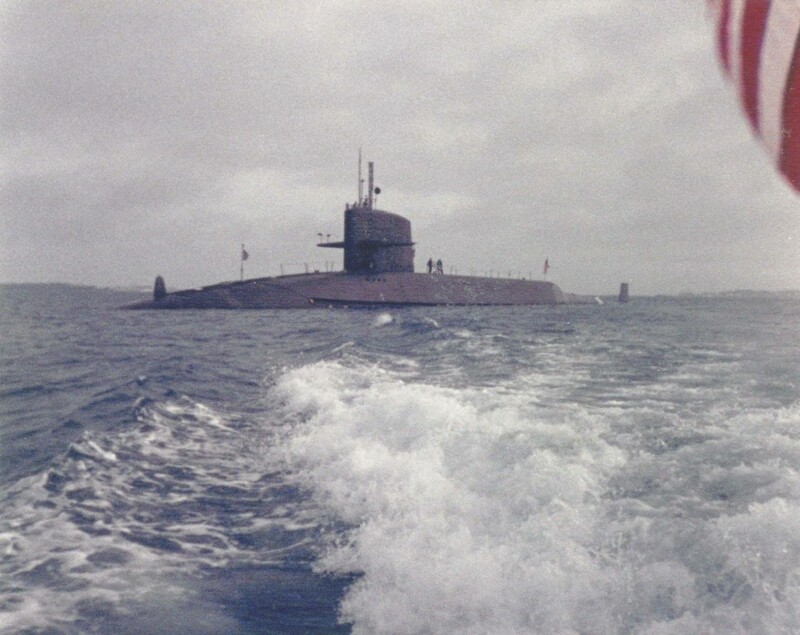 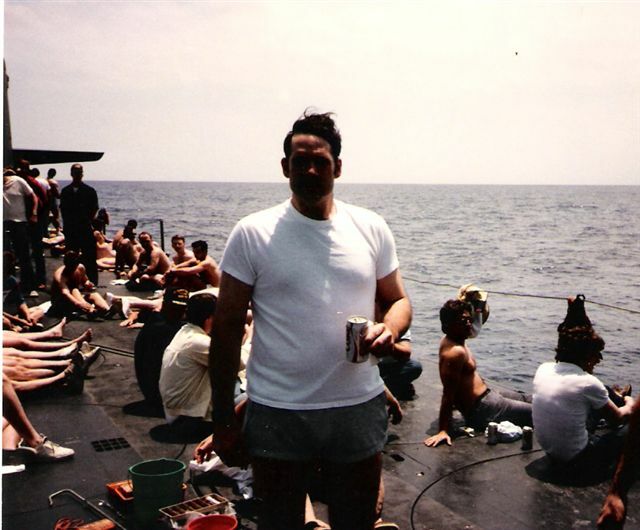 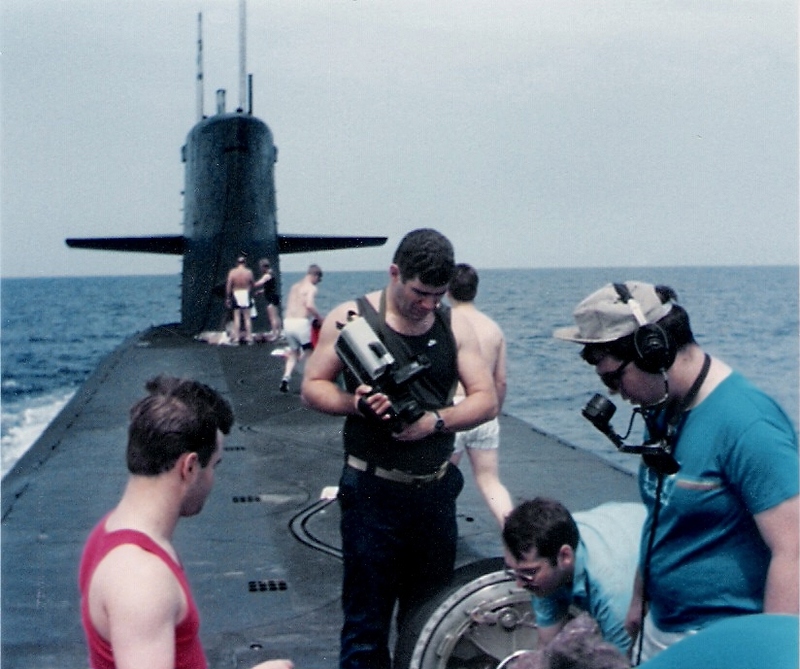 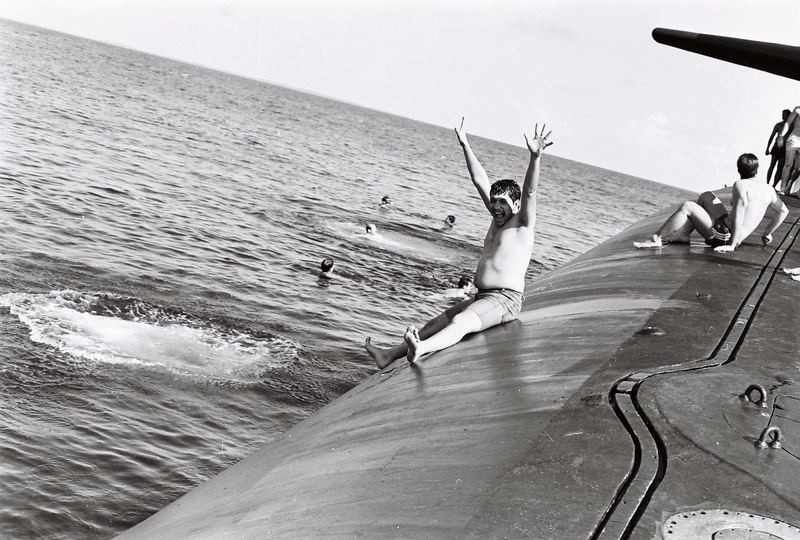 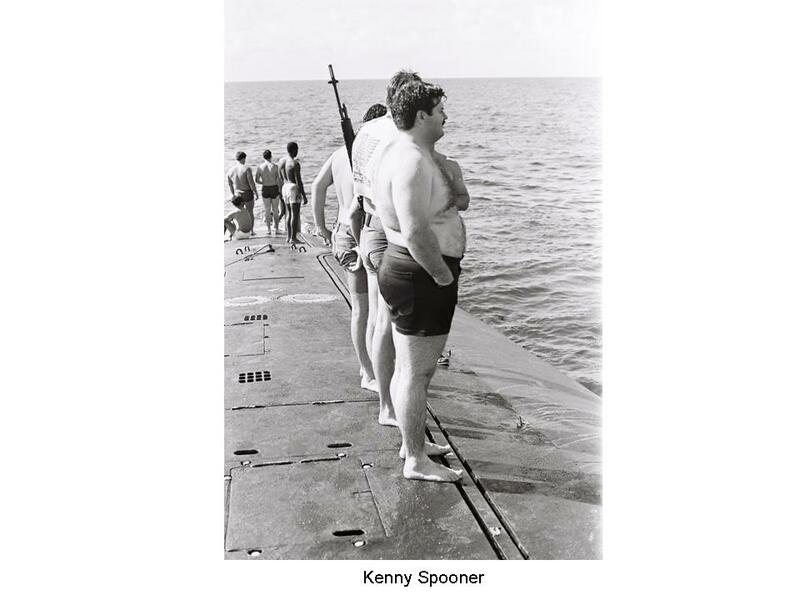 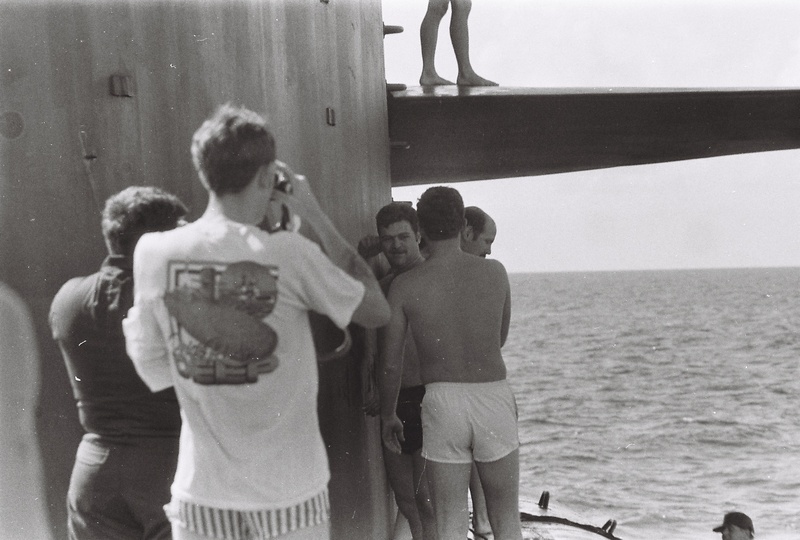 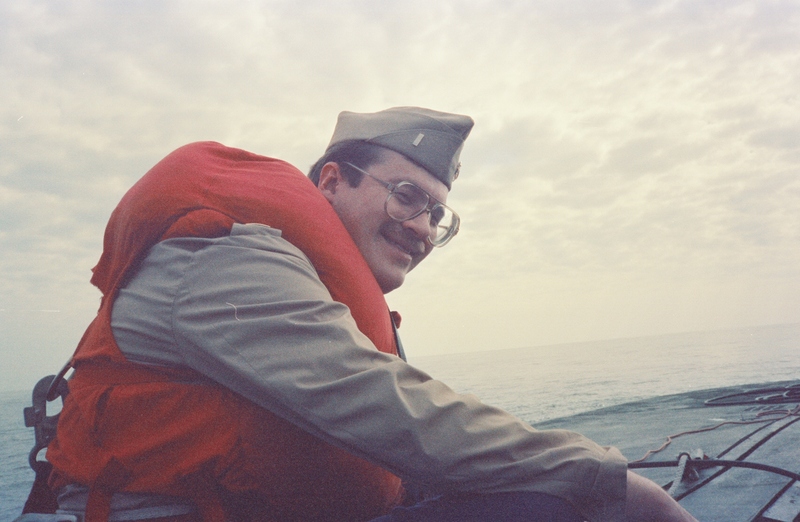 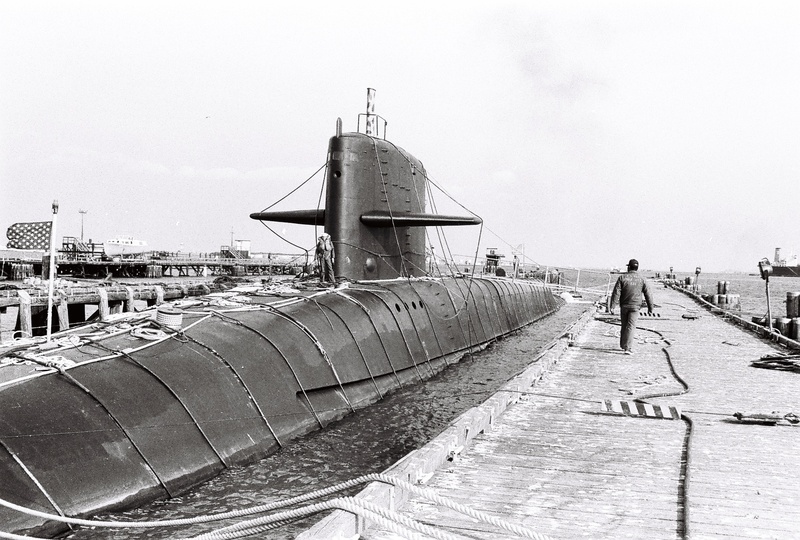 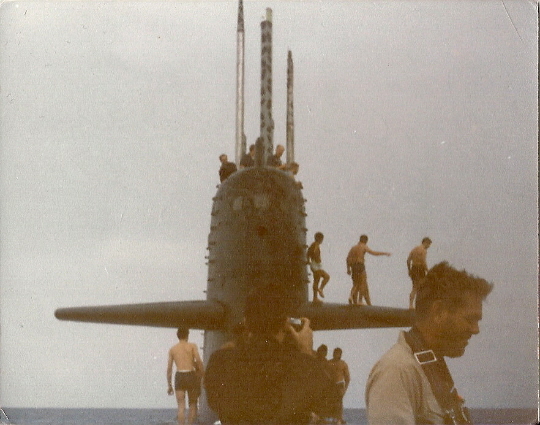 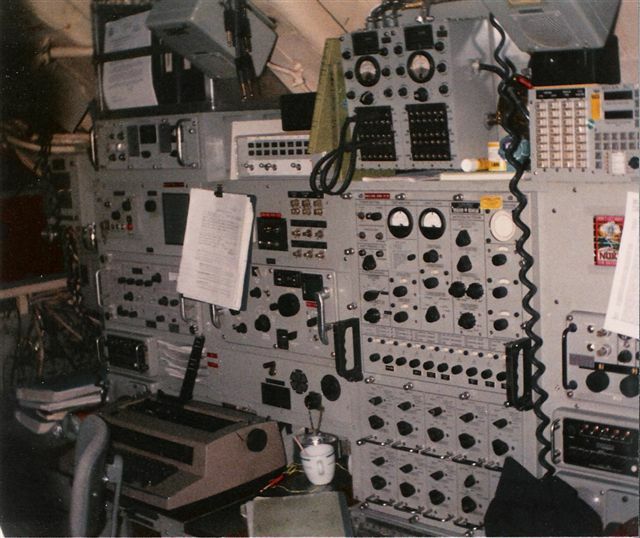 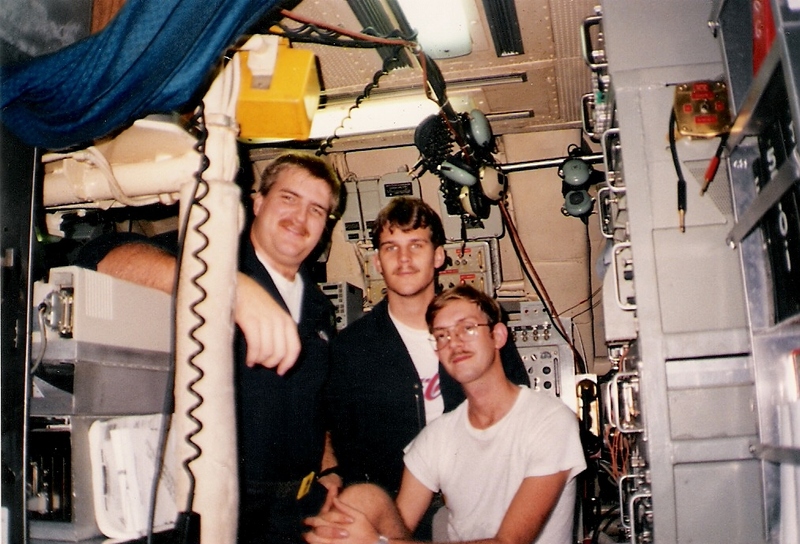 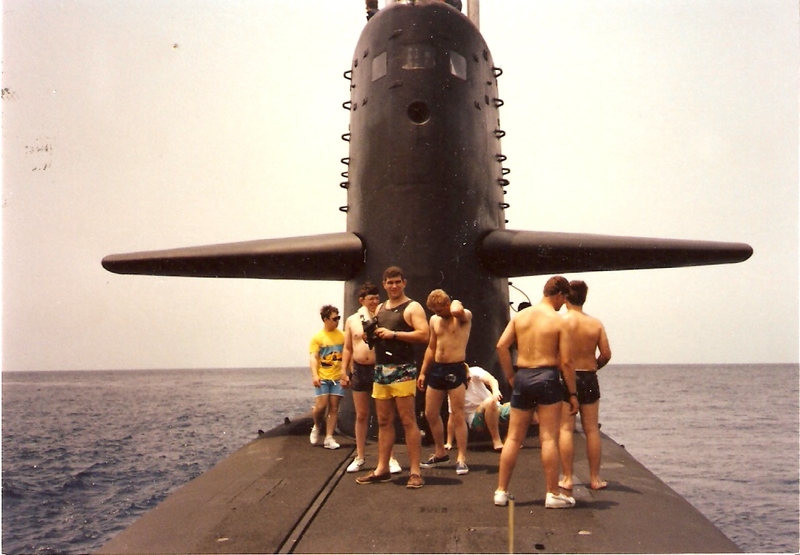 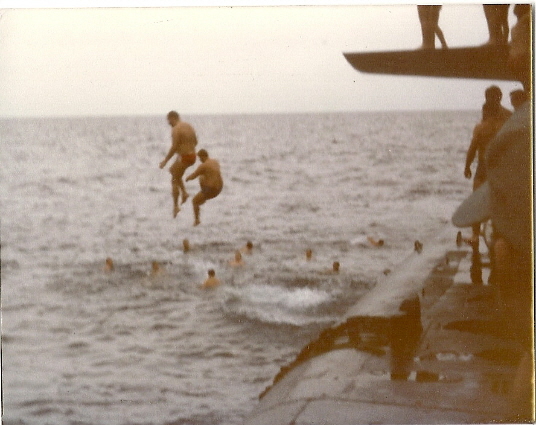 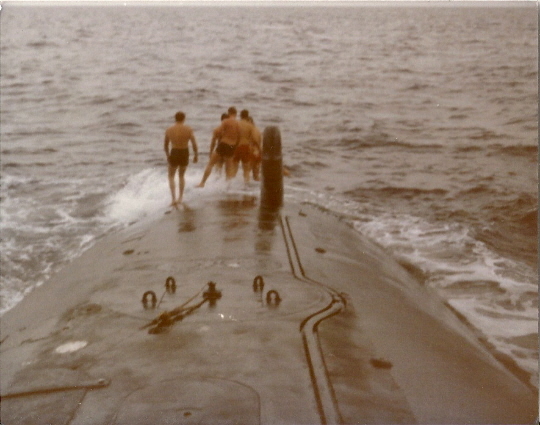 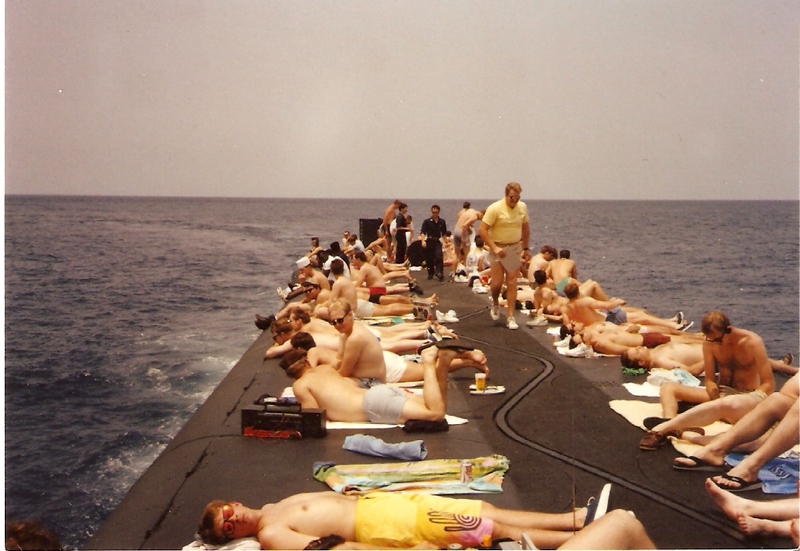 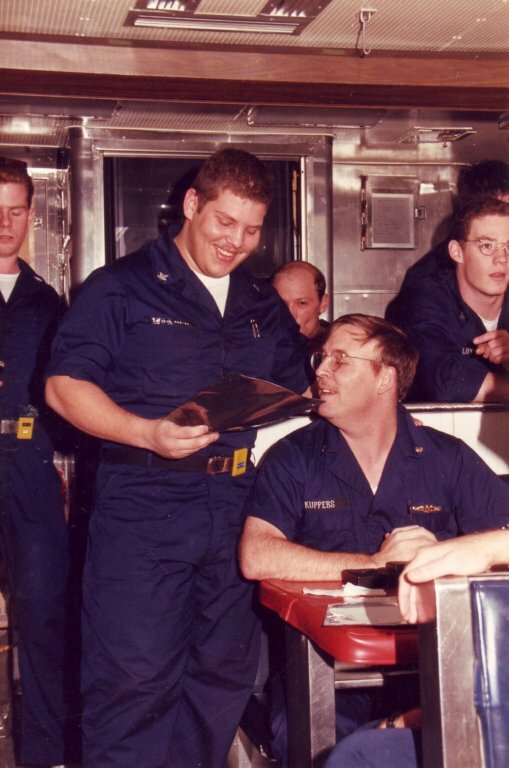 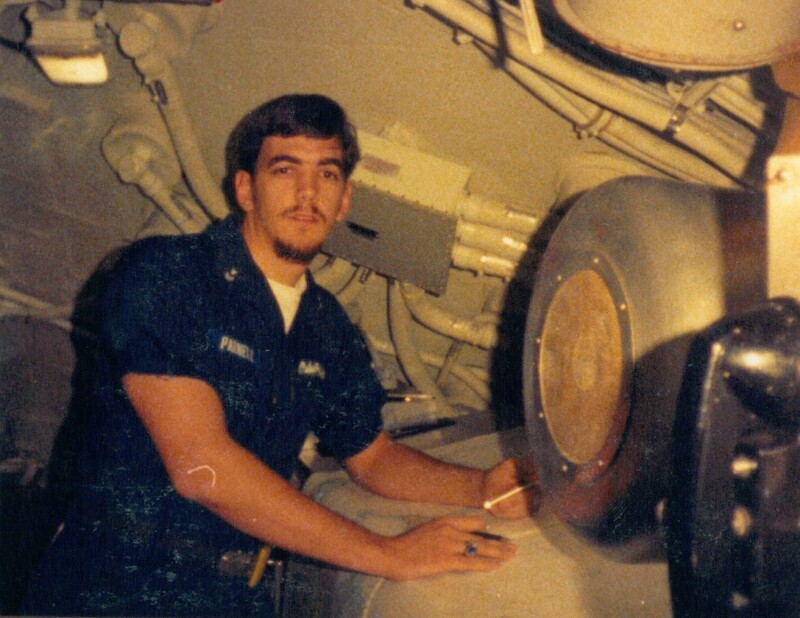 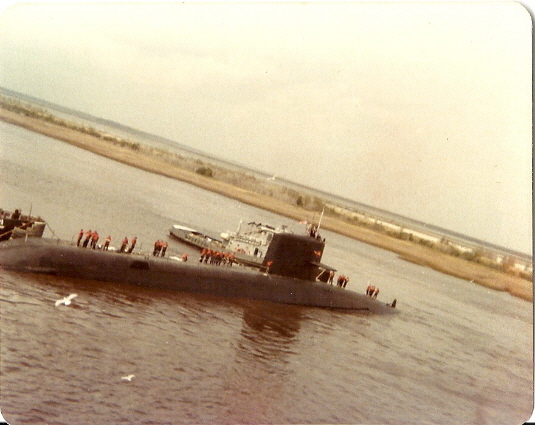 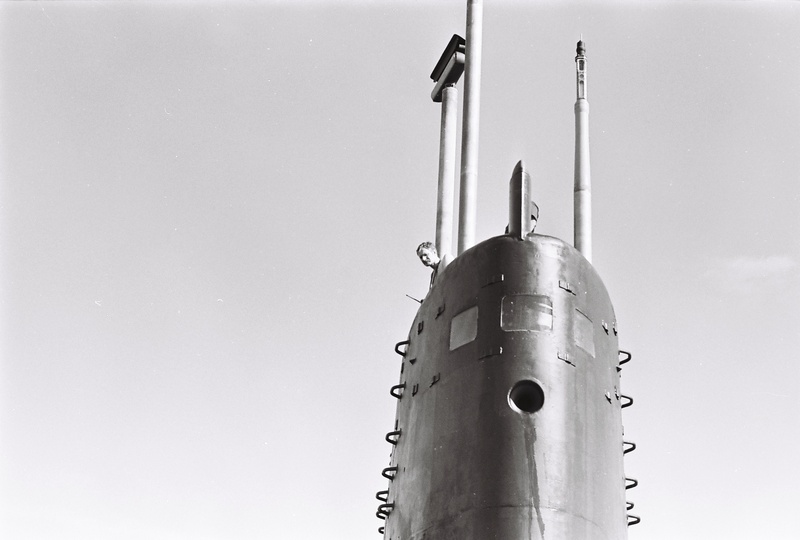 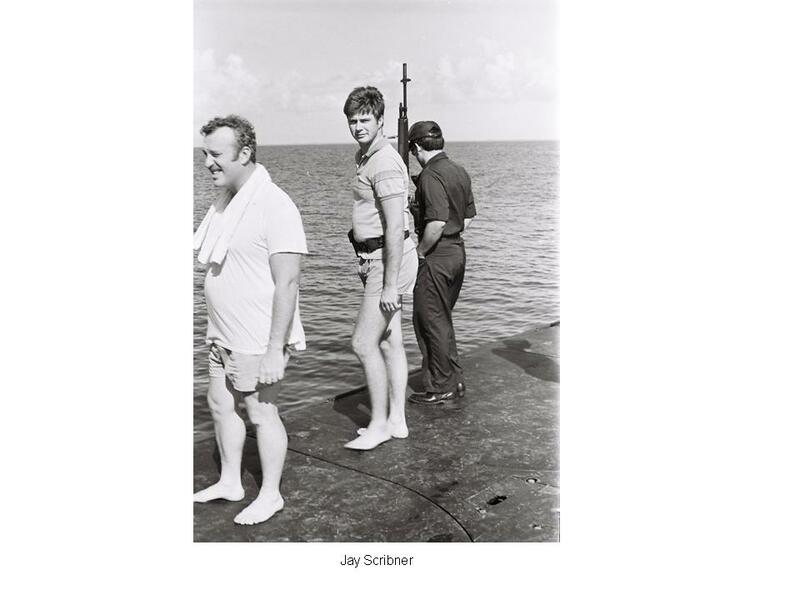 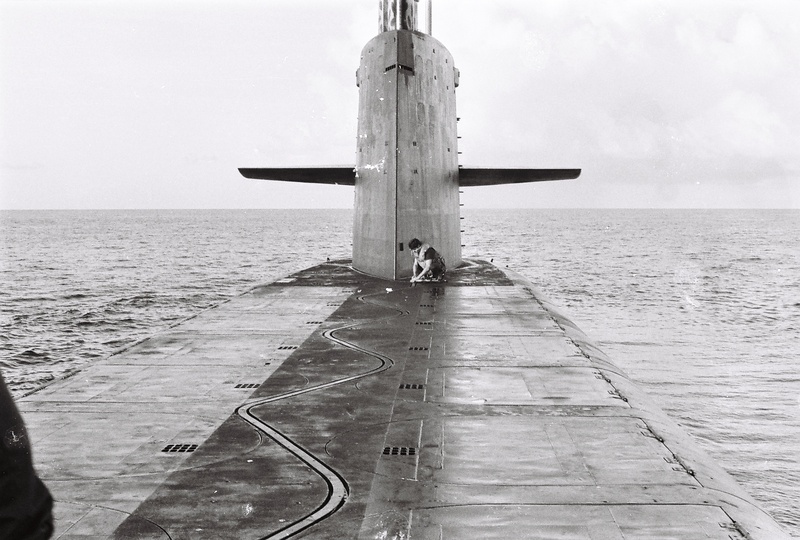 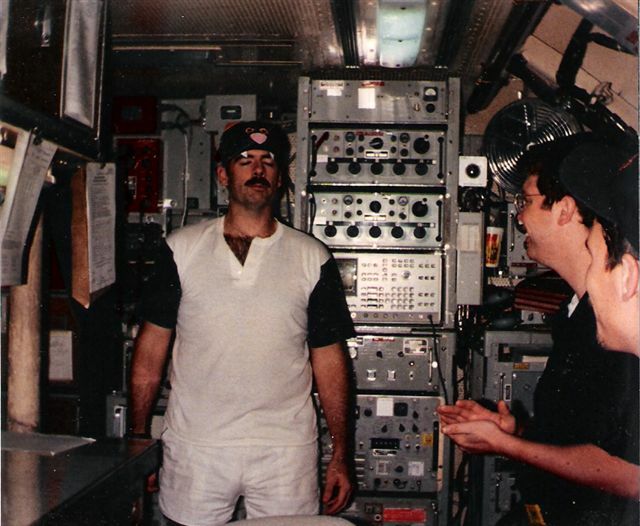 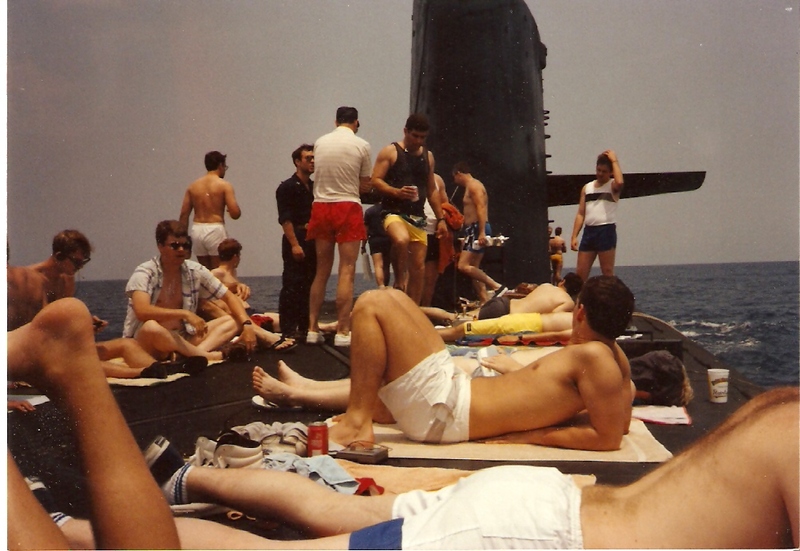 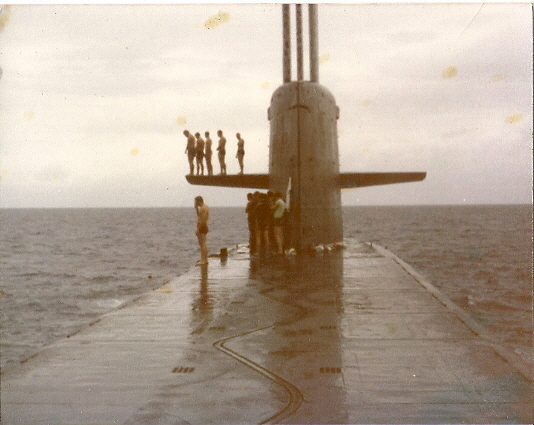 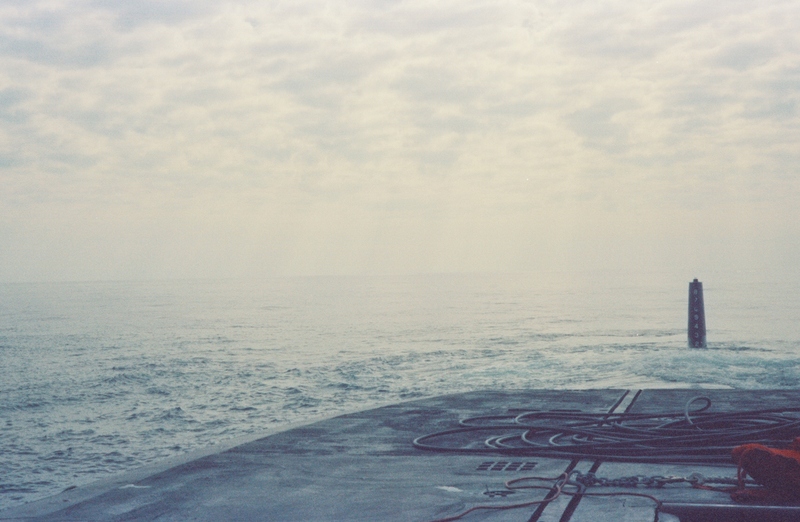 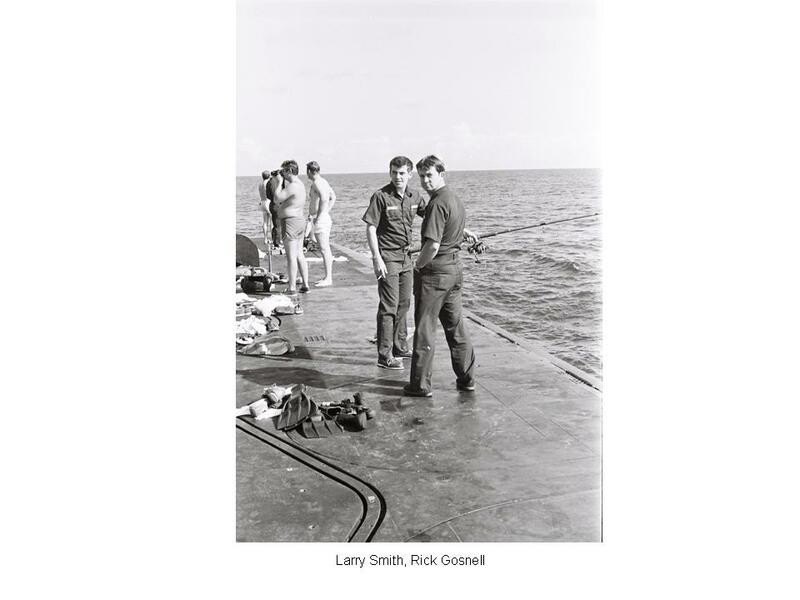 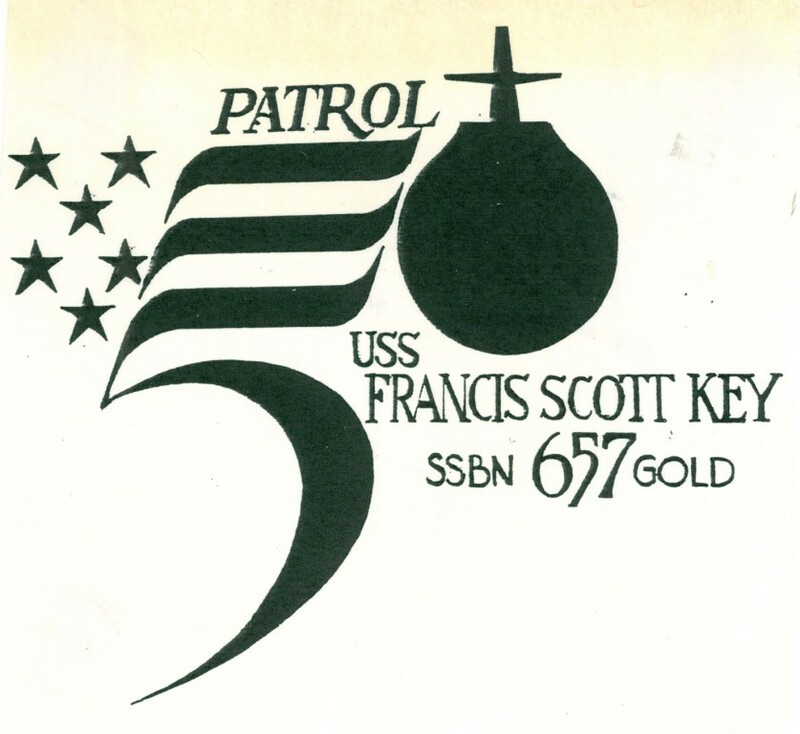 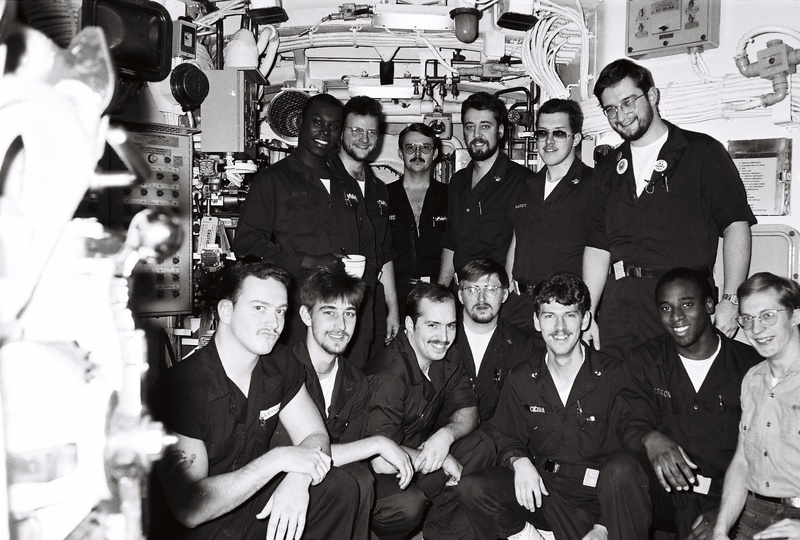 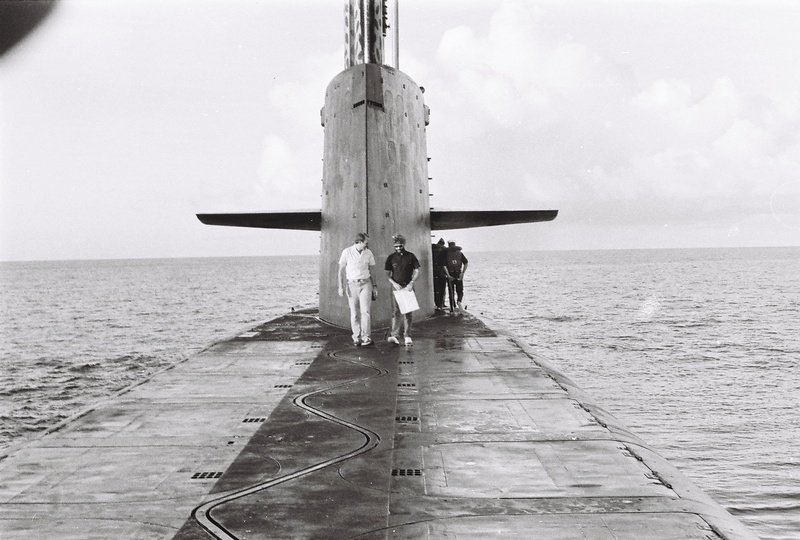 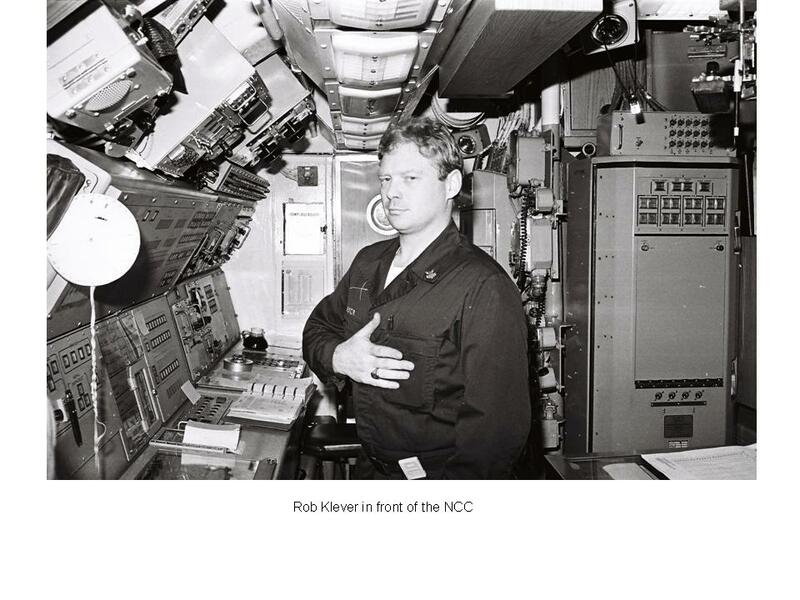 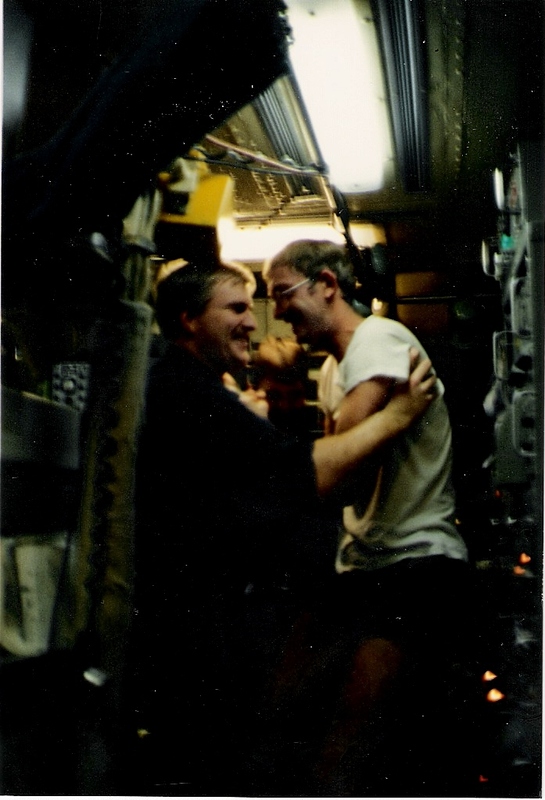 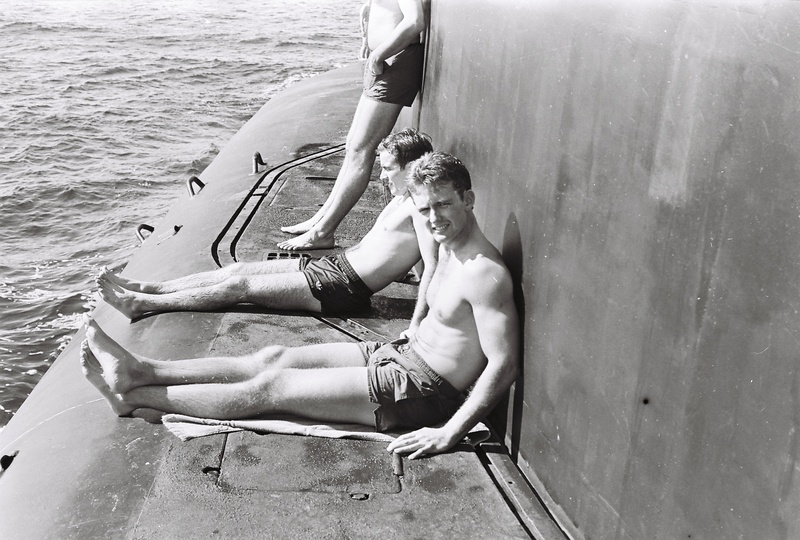 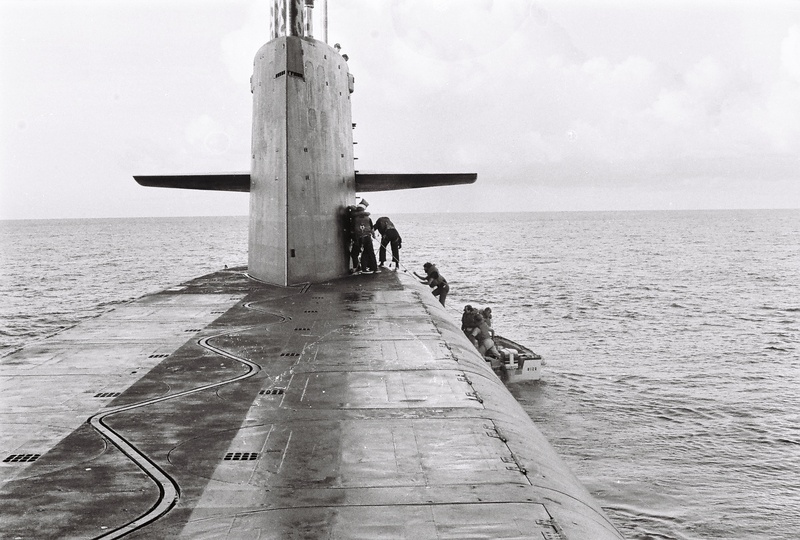 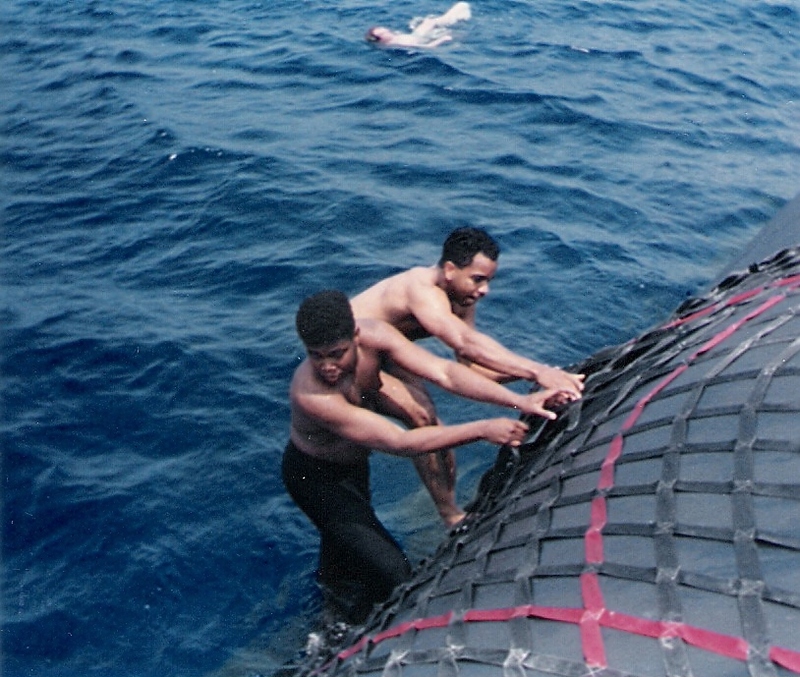 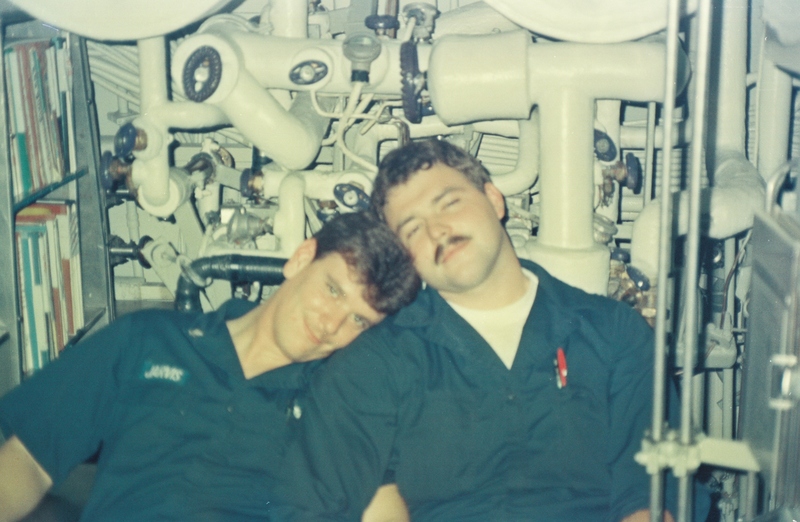 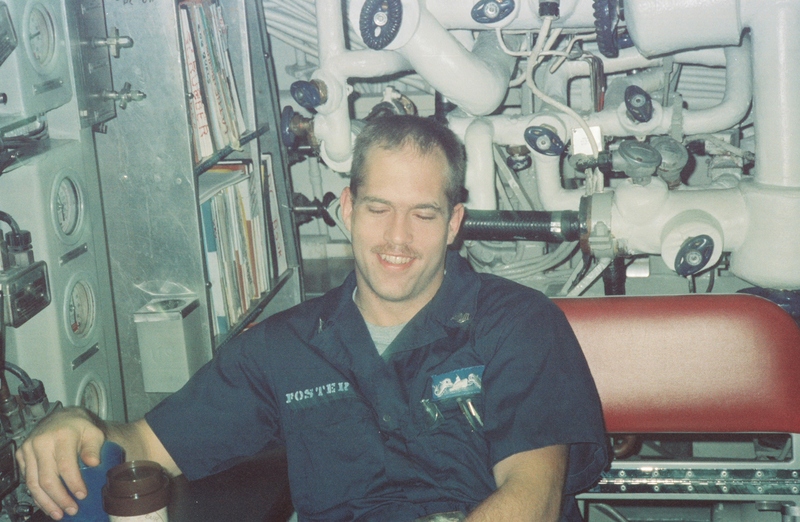 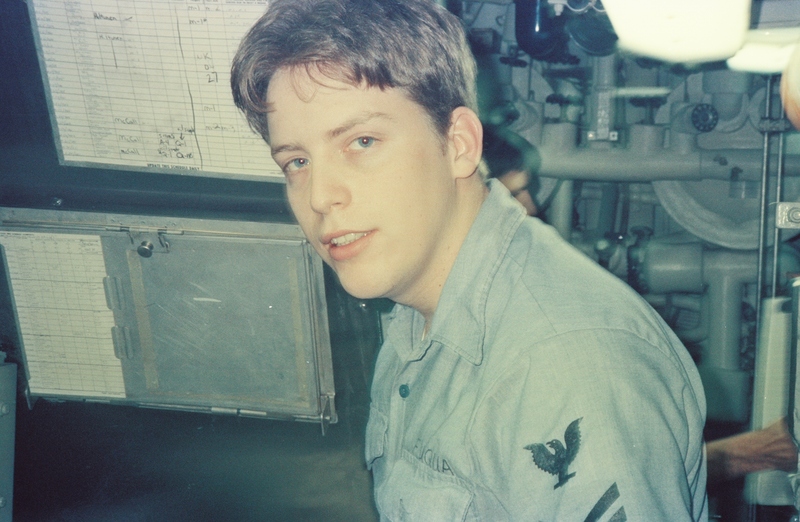 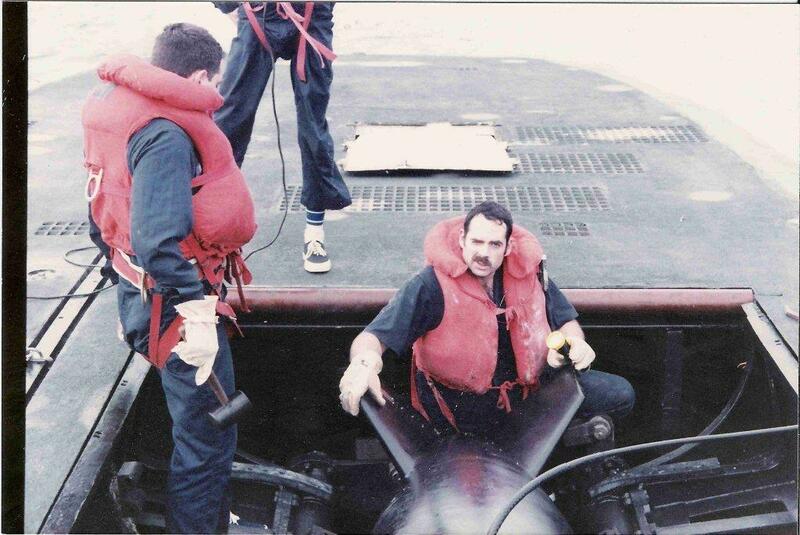 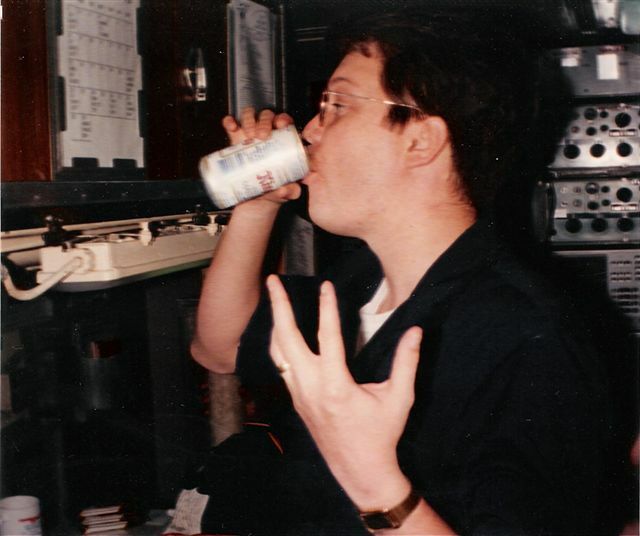 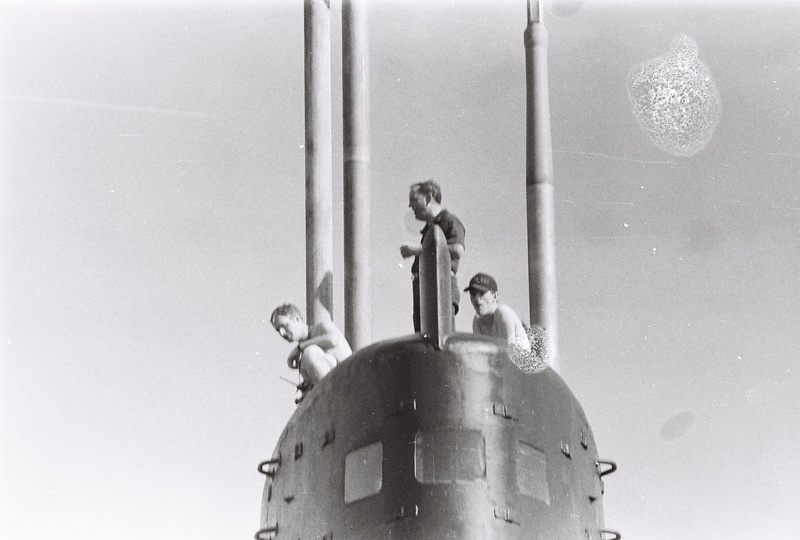 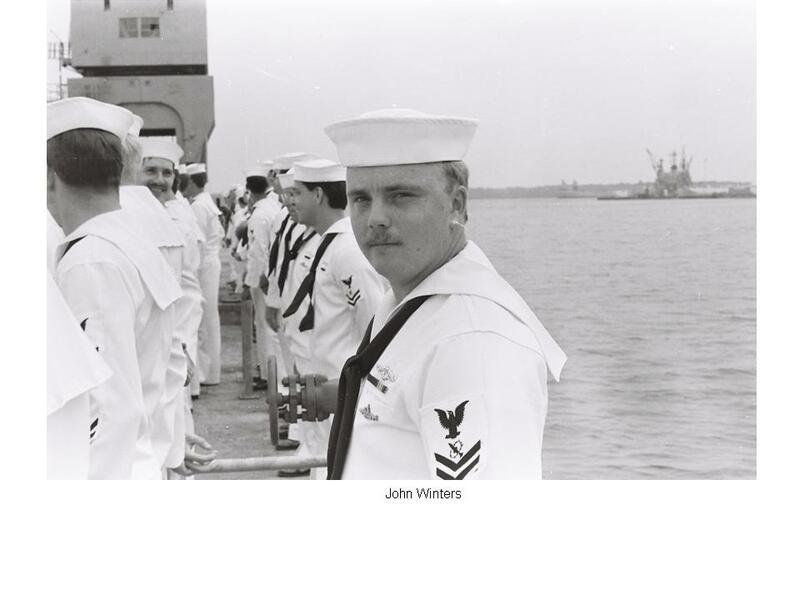 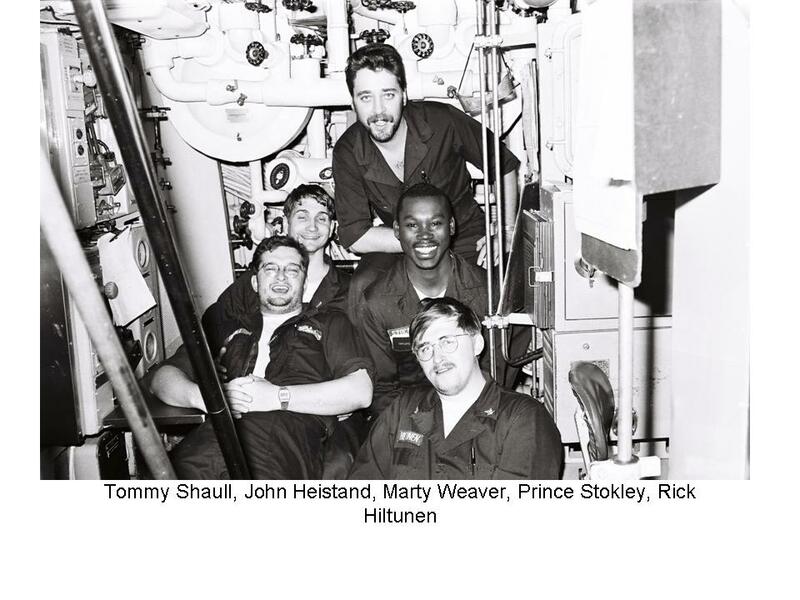 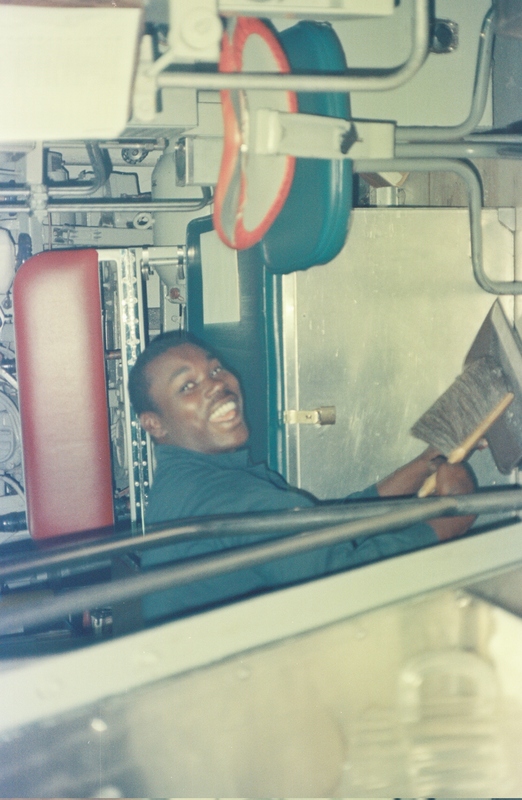 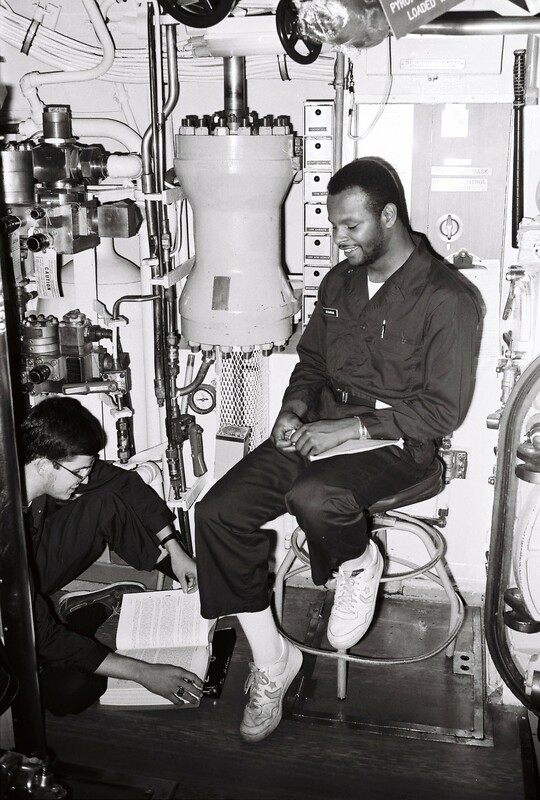 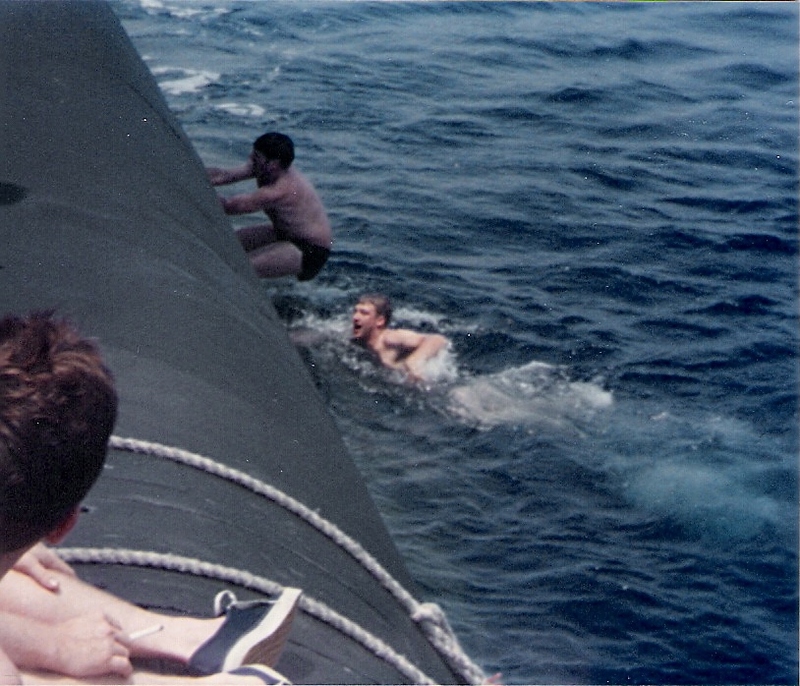 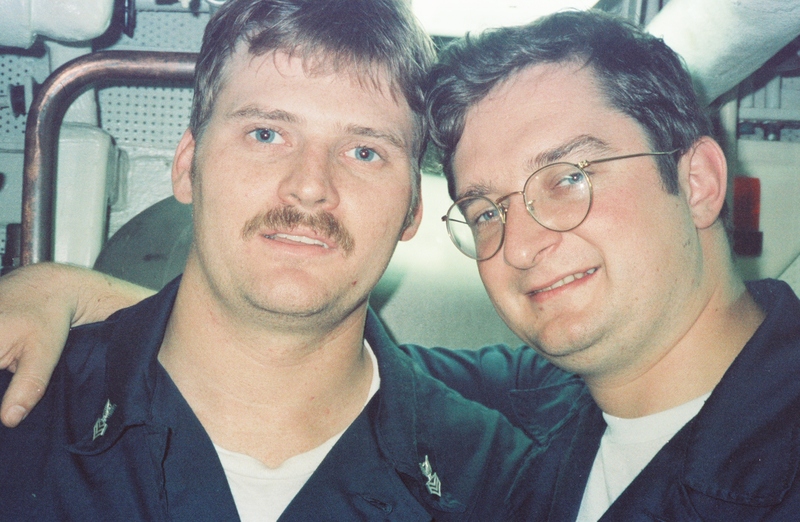 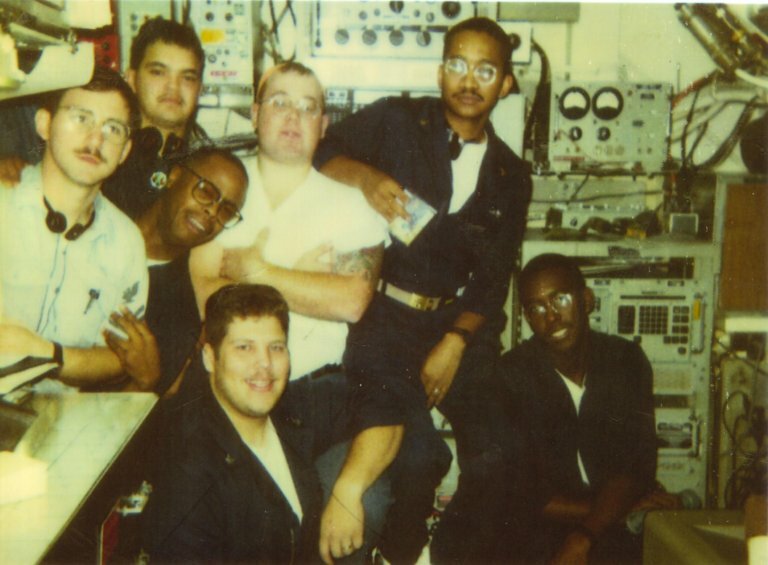 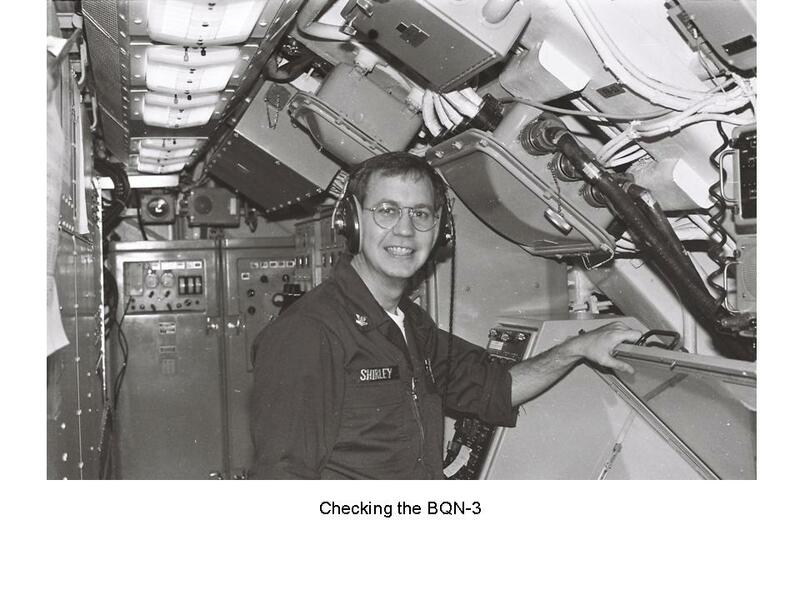 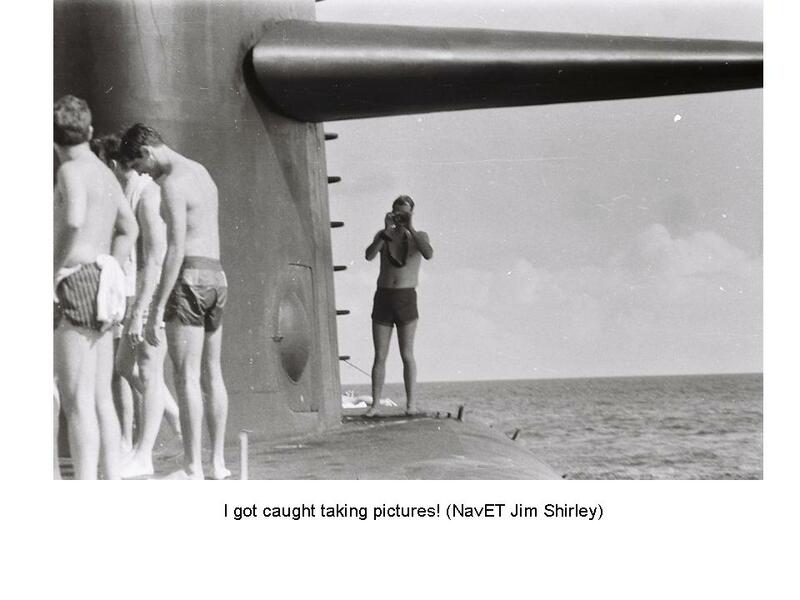 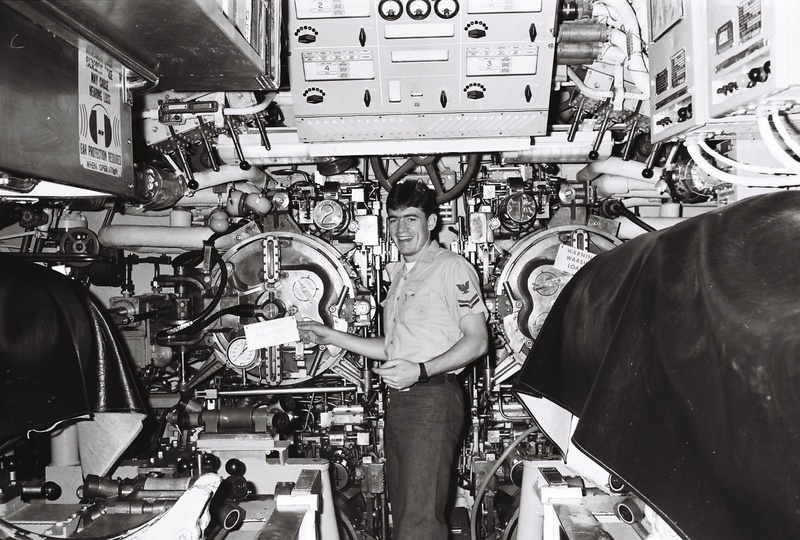 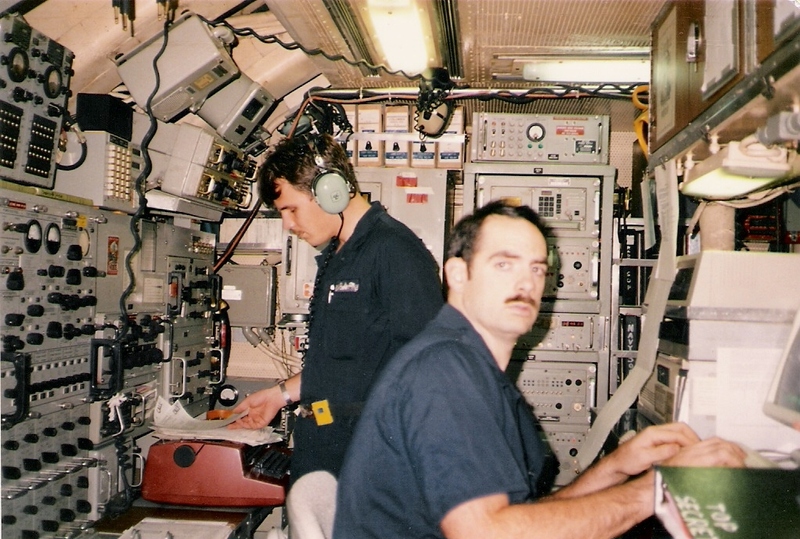 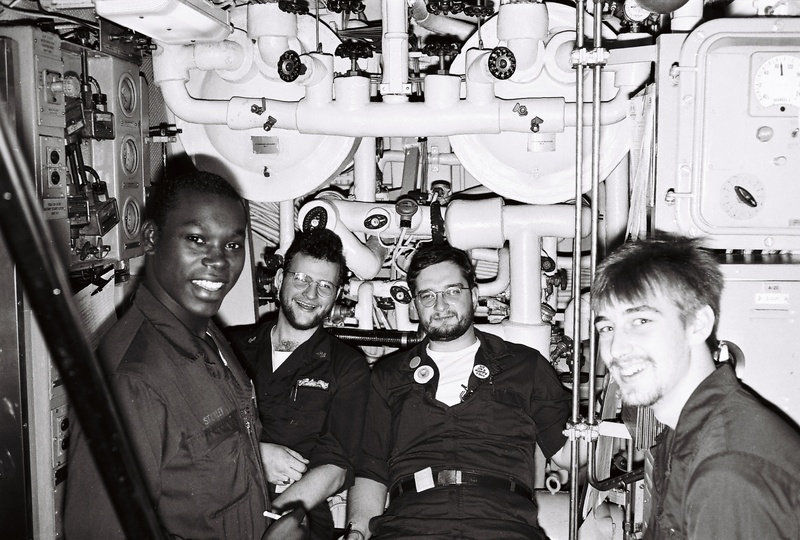 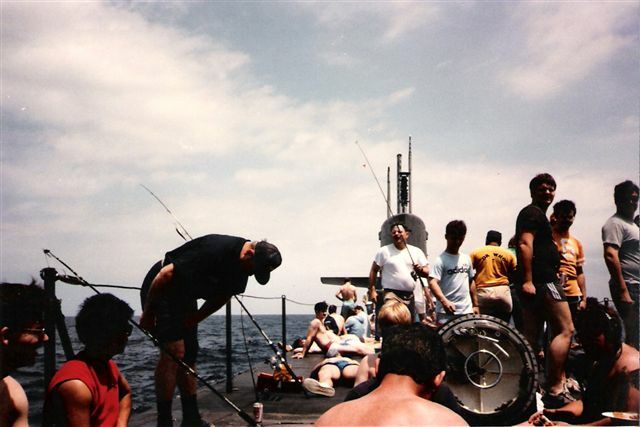 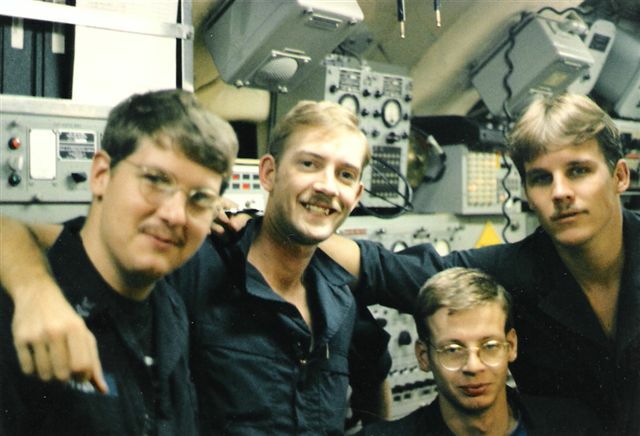 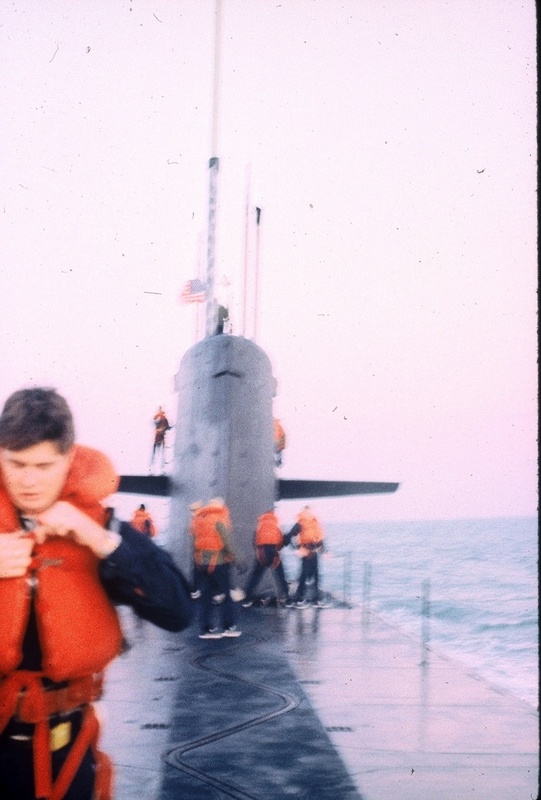 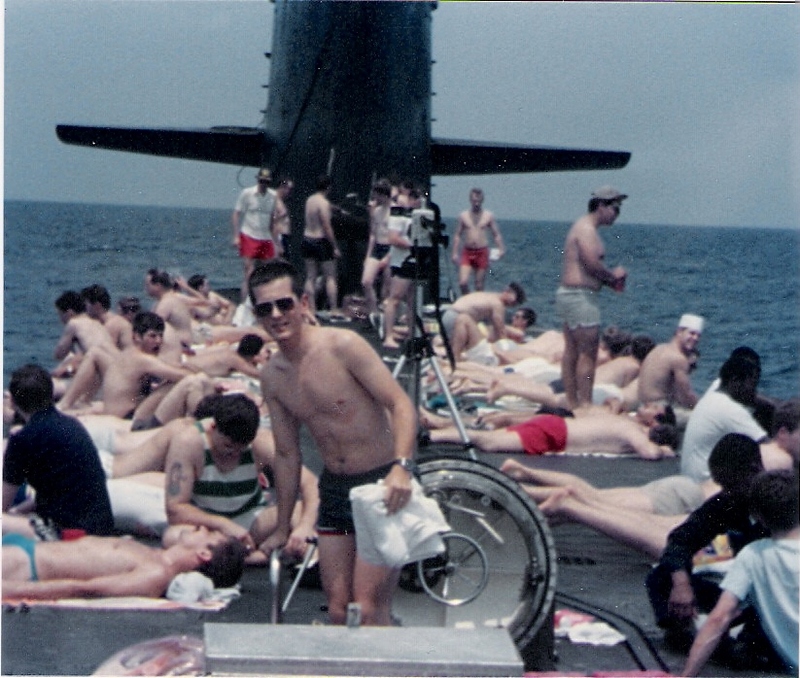 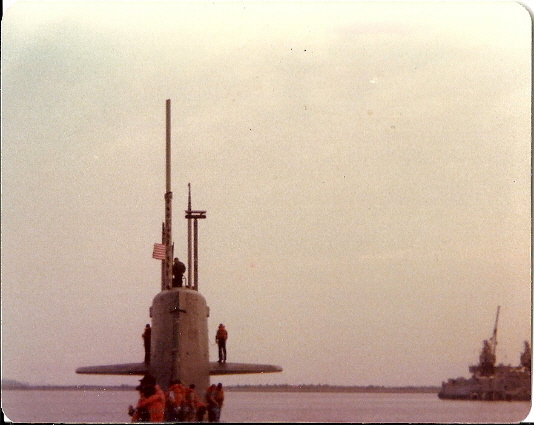 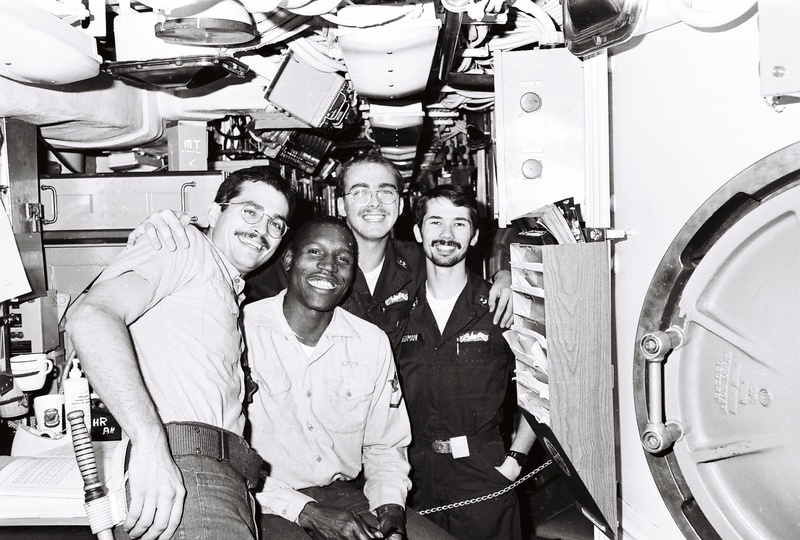 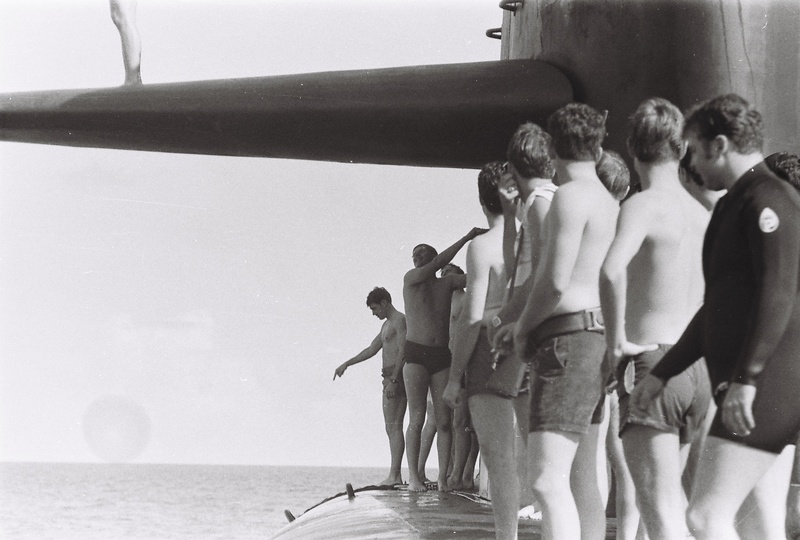 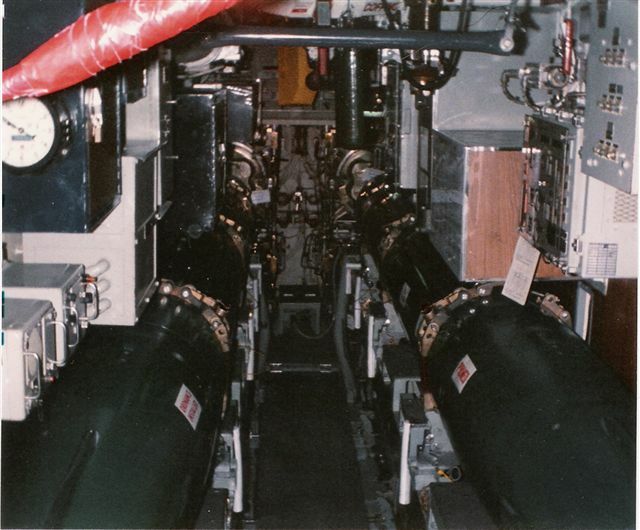 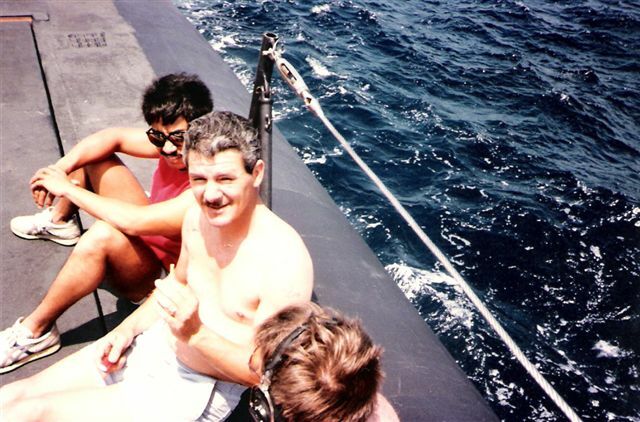 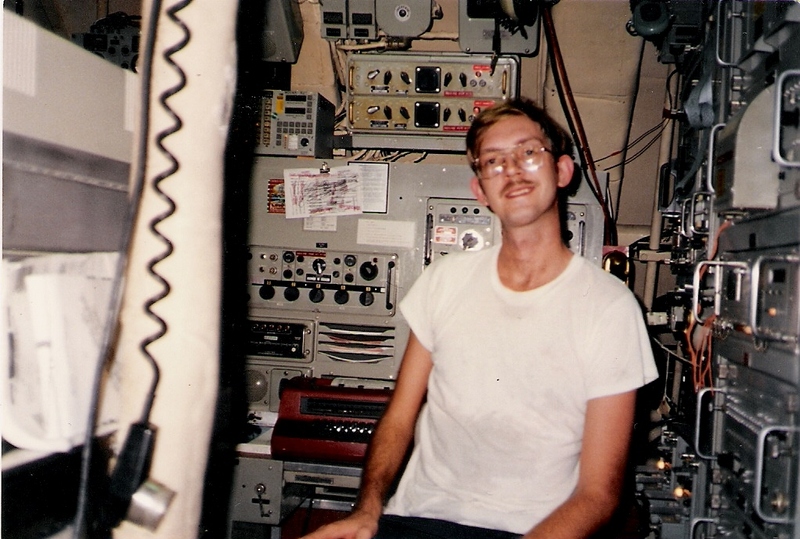 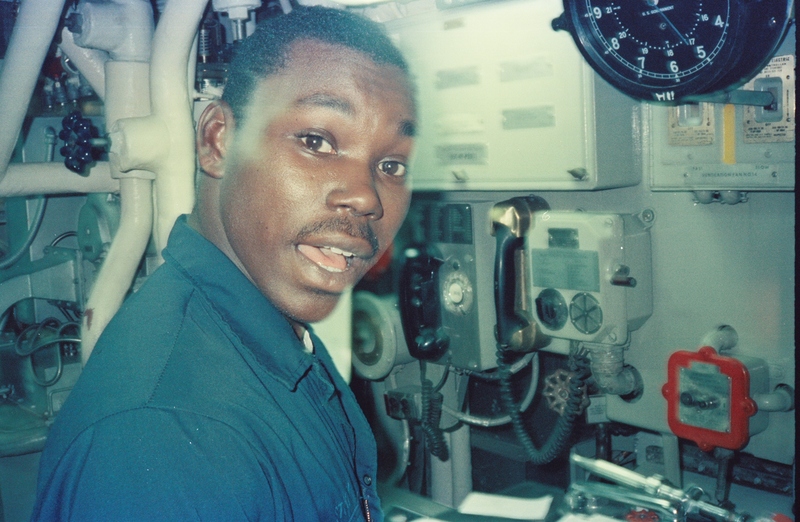 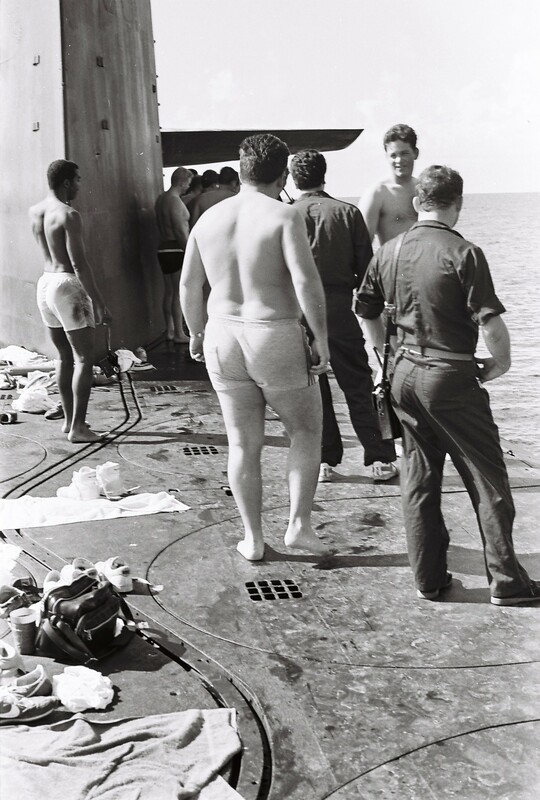 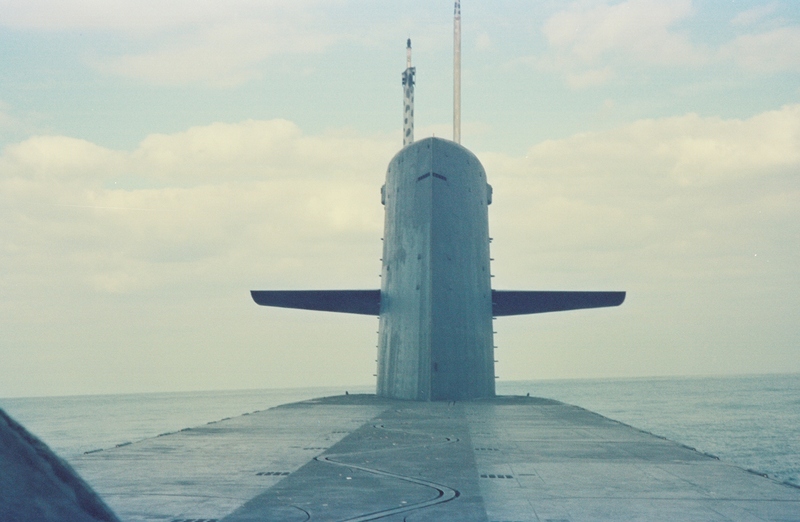 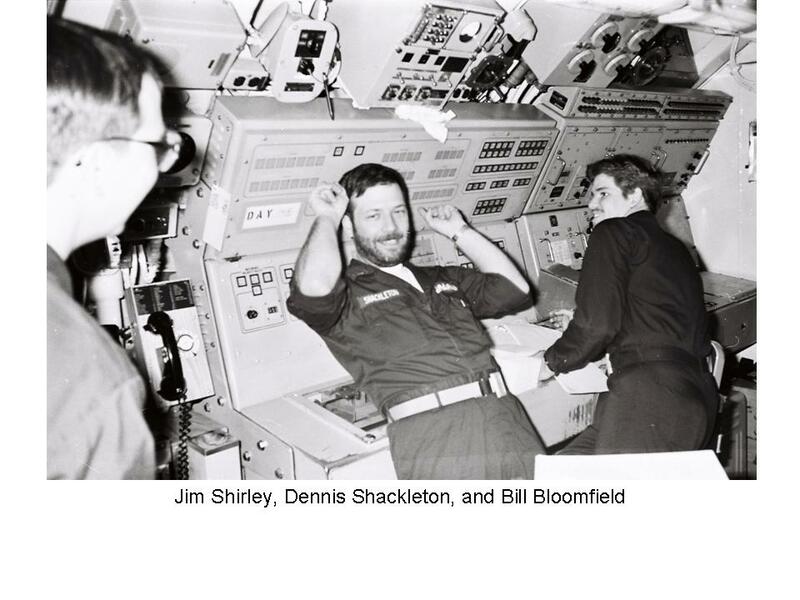 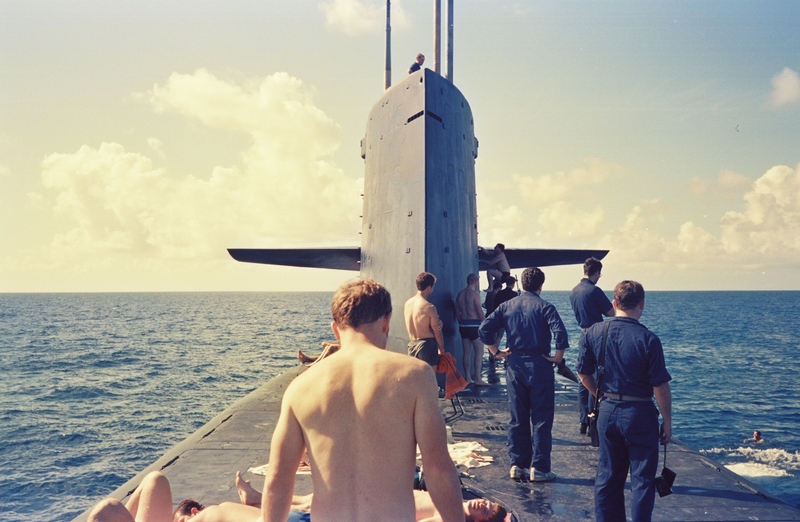 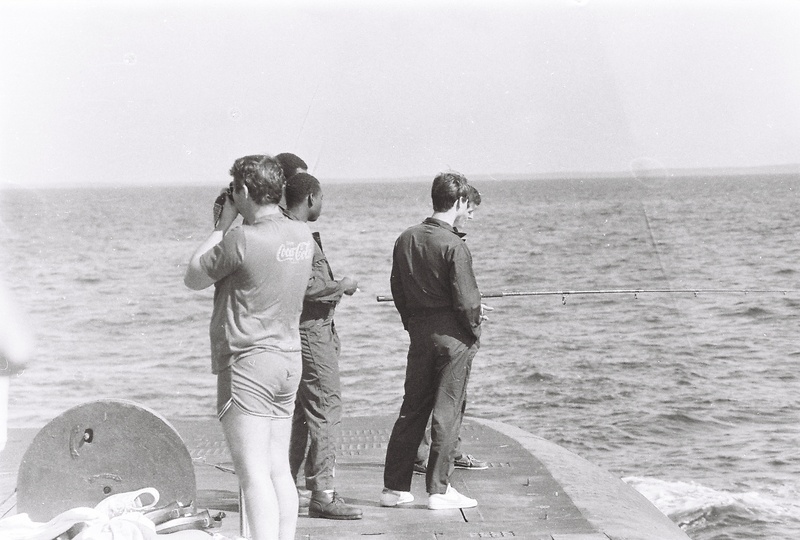 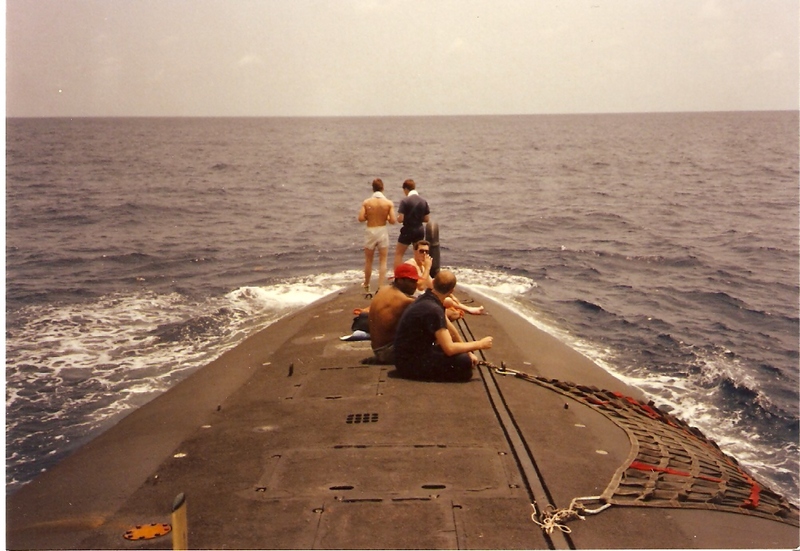 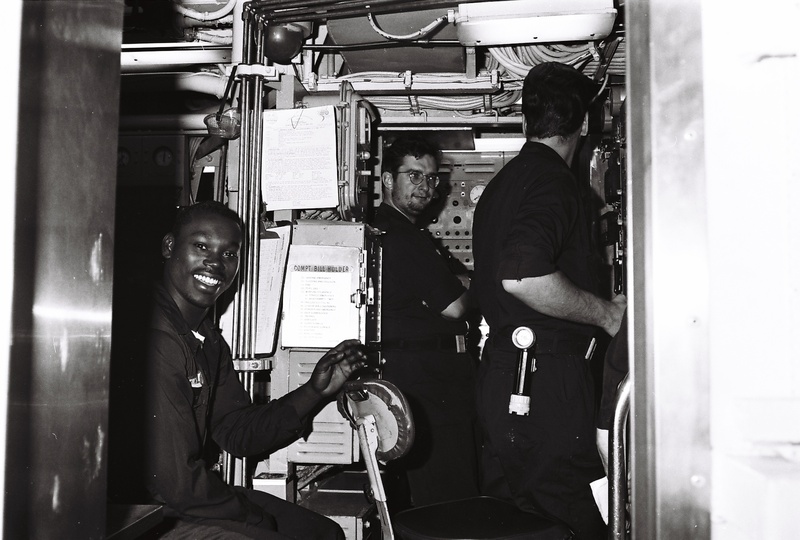 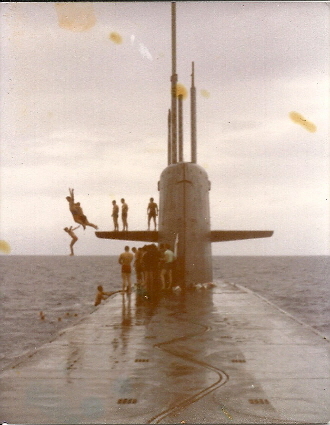 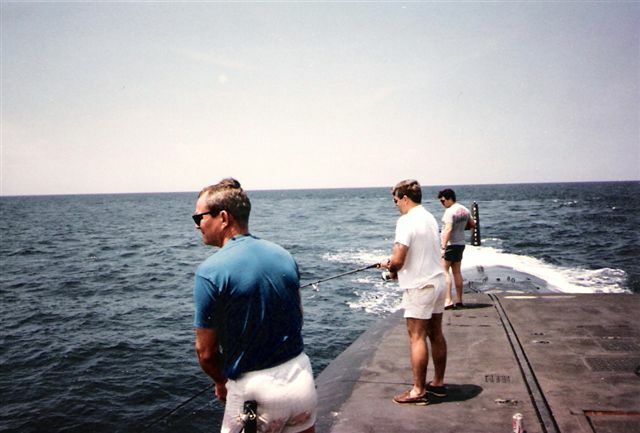 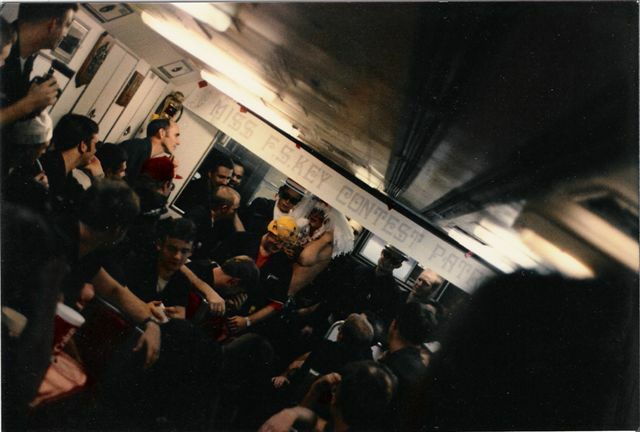 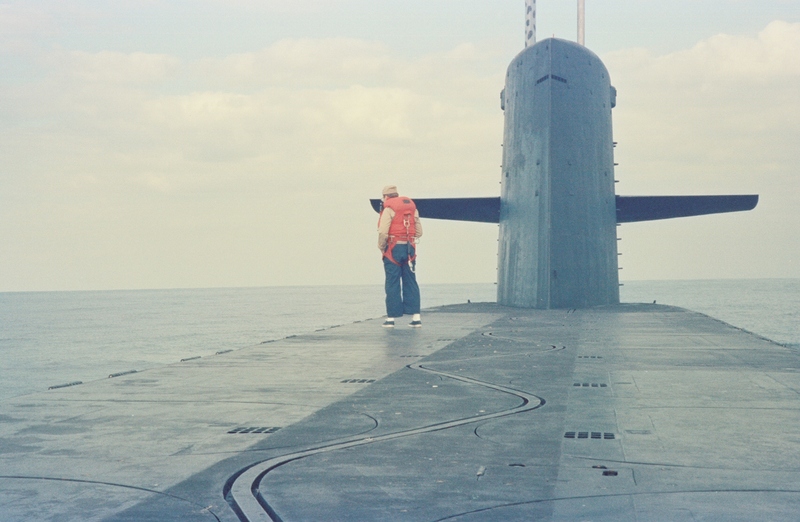 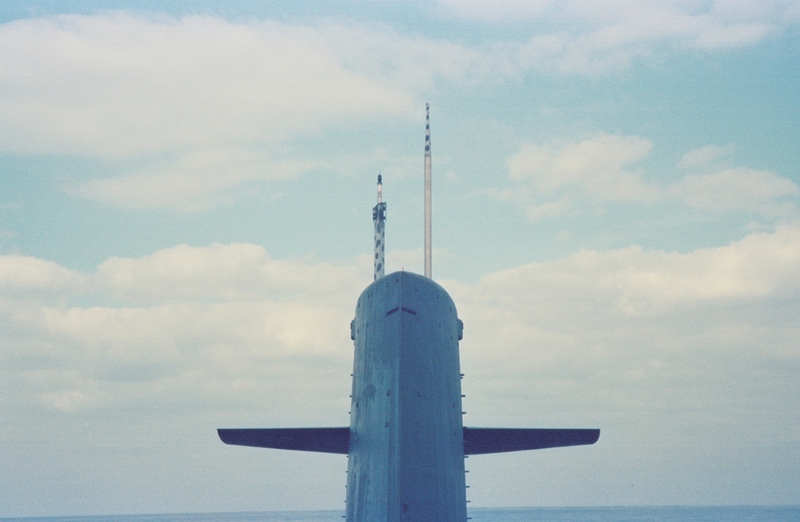 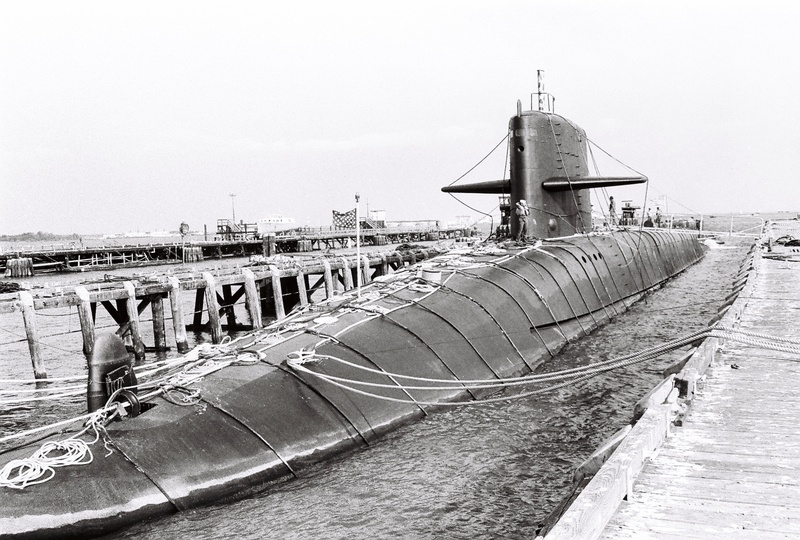 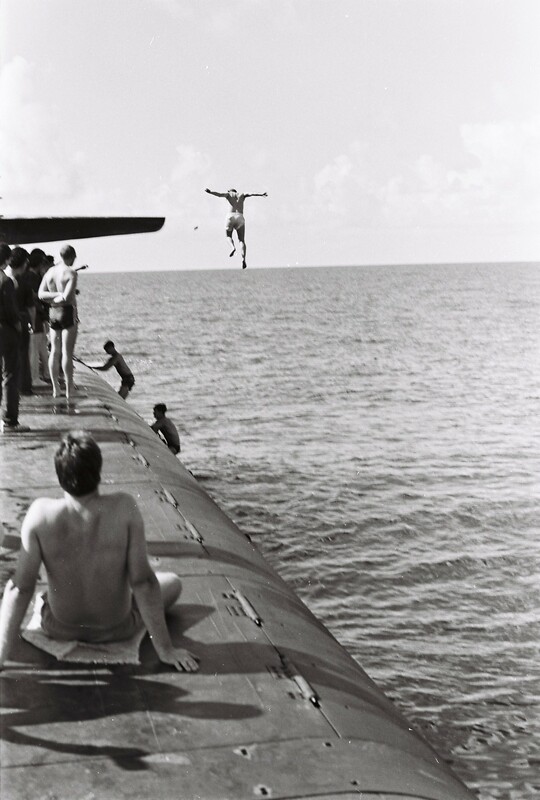 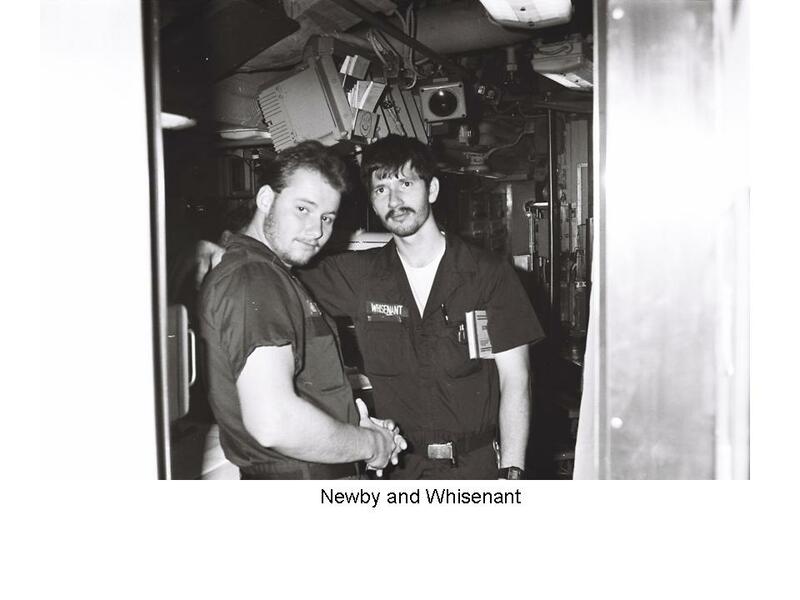 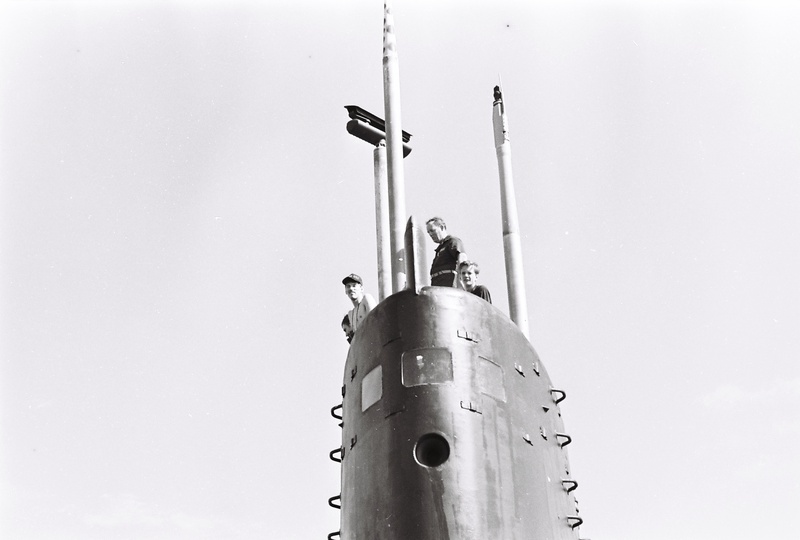 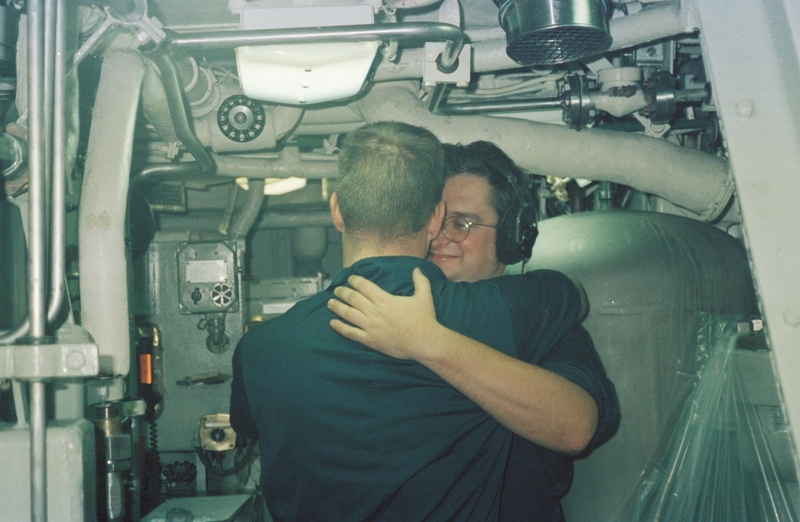 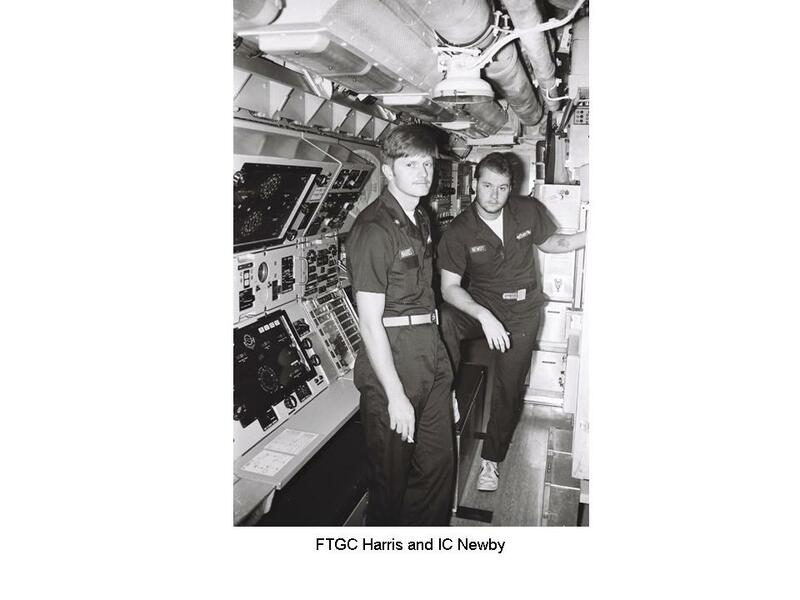 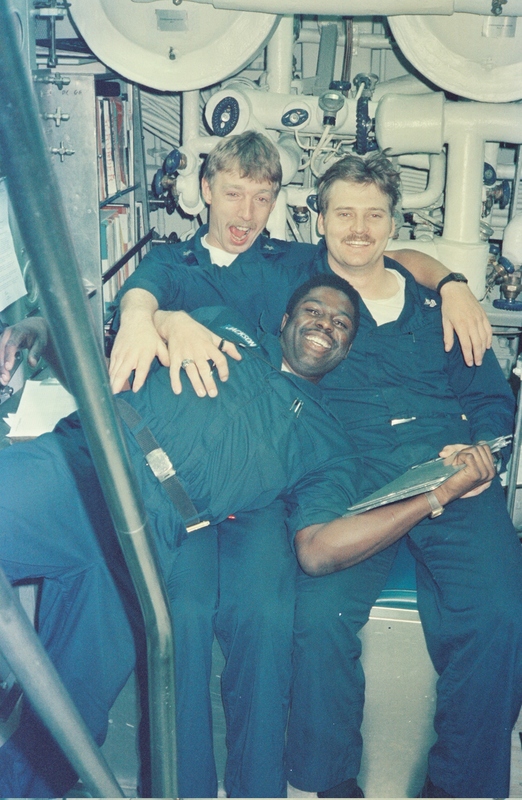 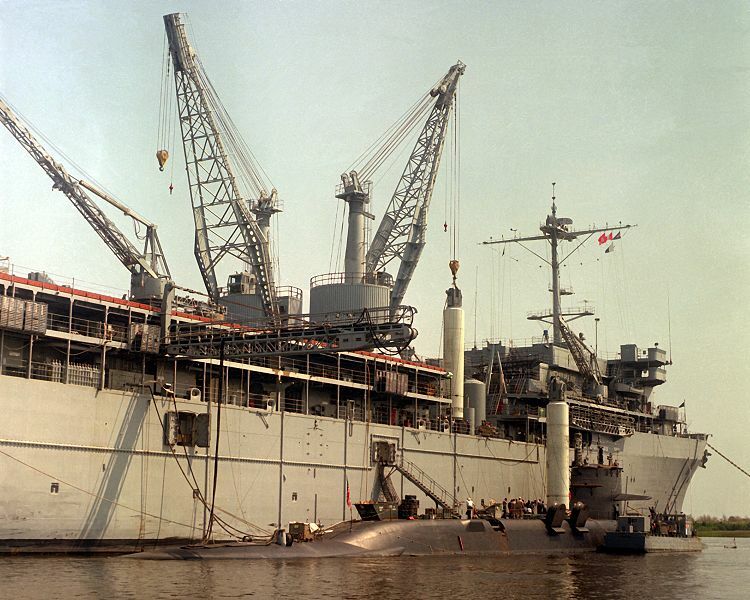 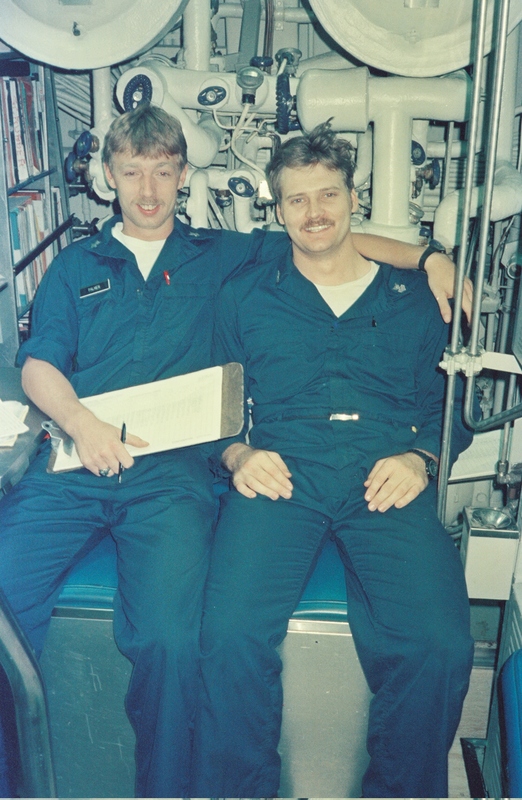 If you have some pics to share, send them to ssbn657@comcast.net. 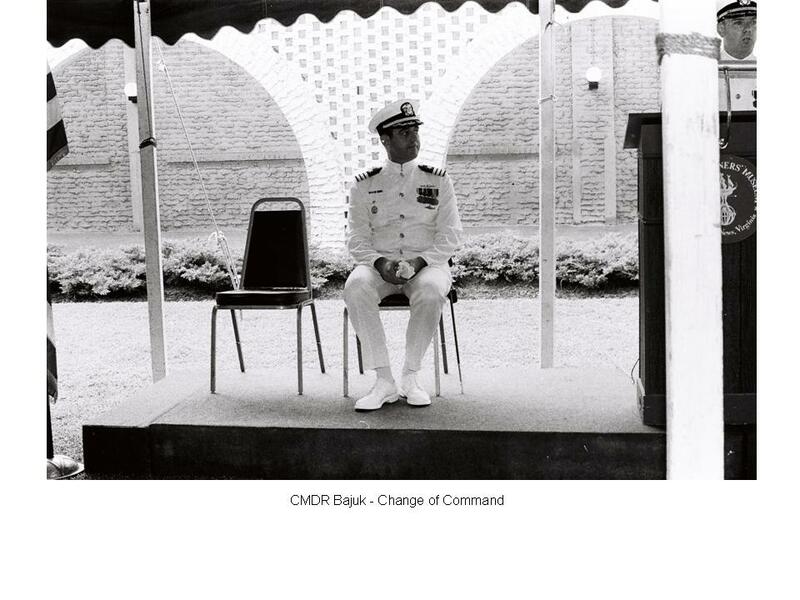 GCM presented by CDR Bajuk. 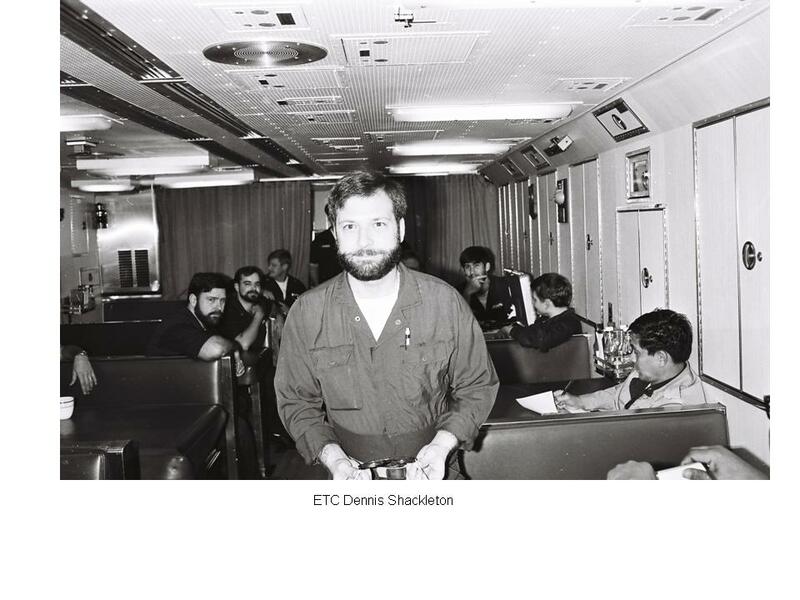 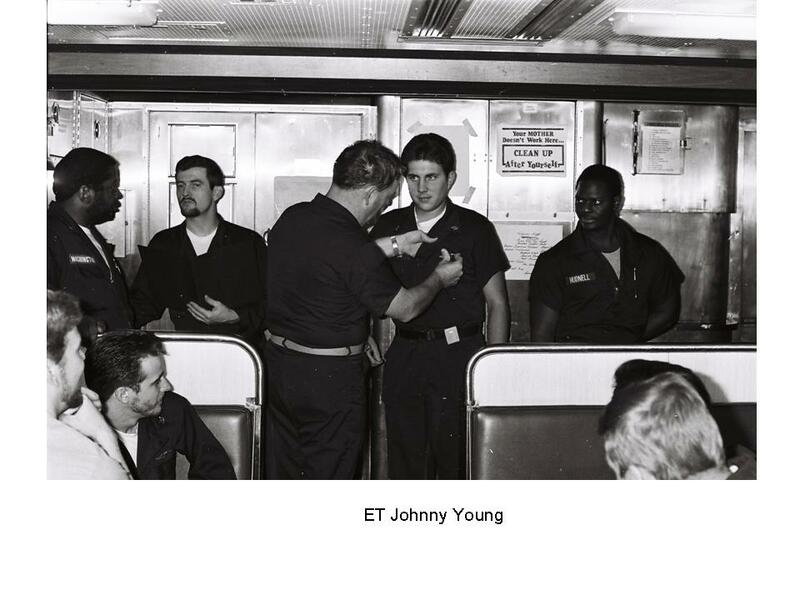 ET2(SS) Robin T. Meredith to my right in background. 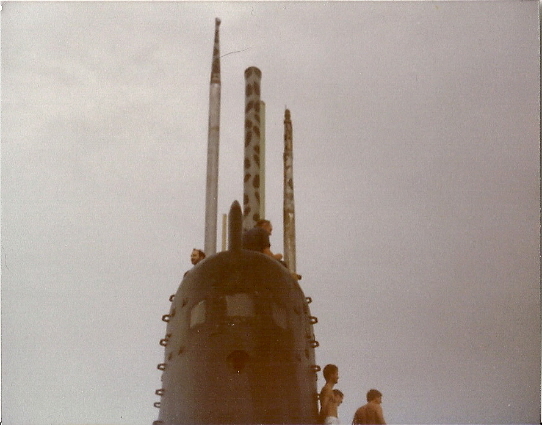 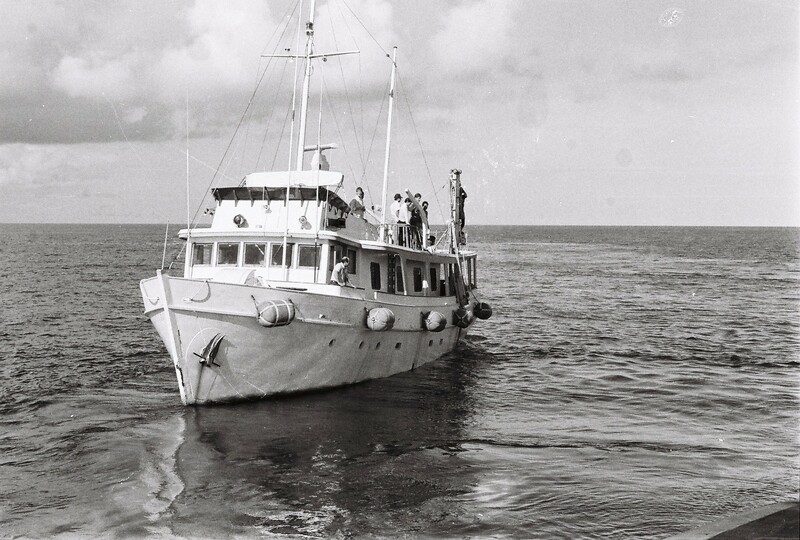 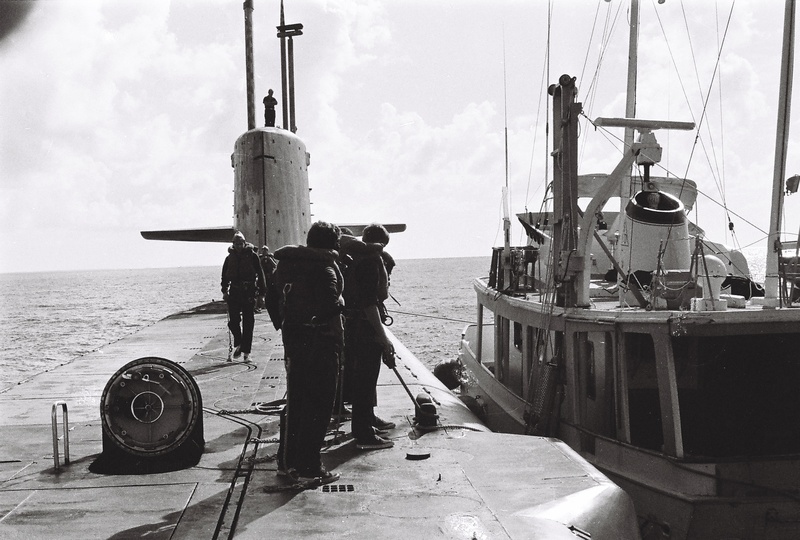 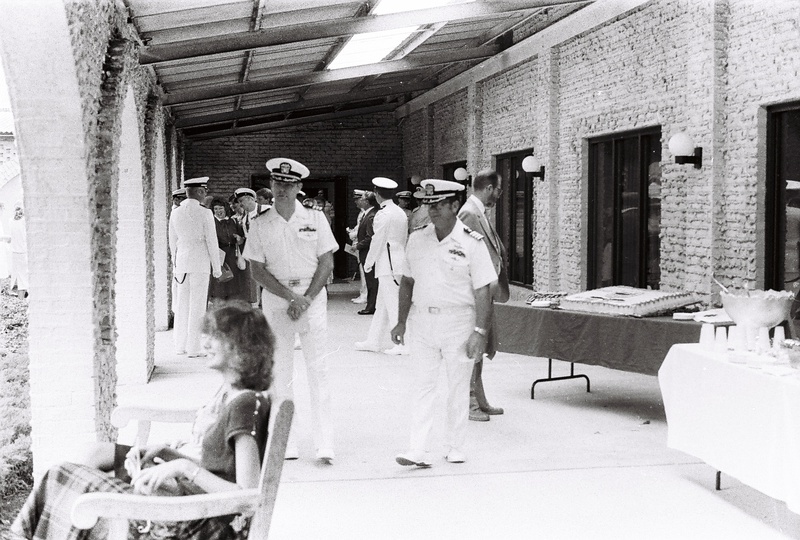 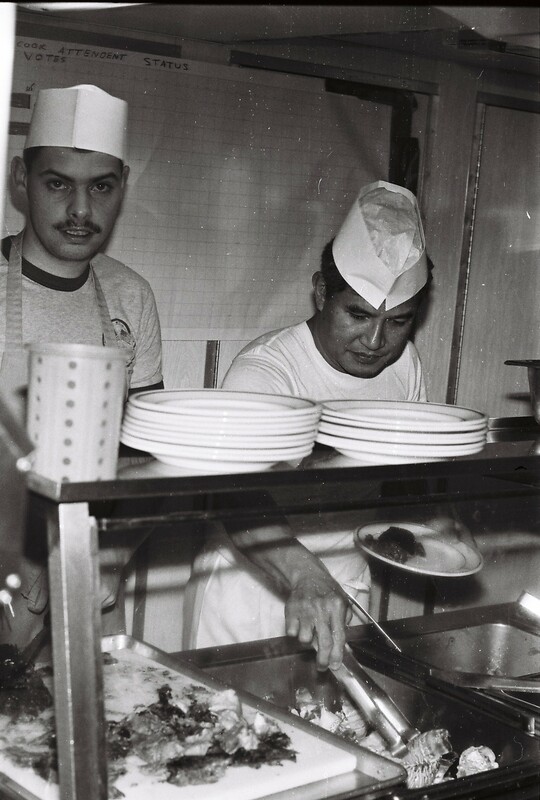 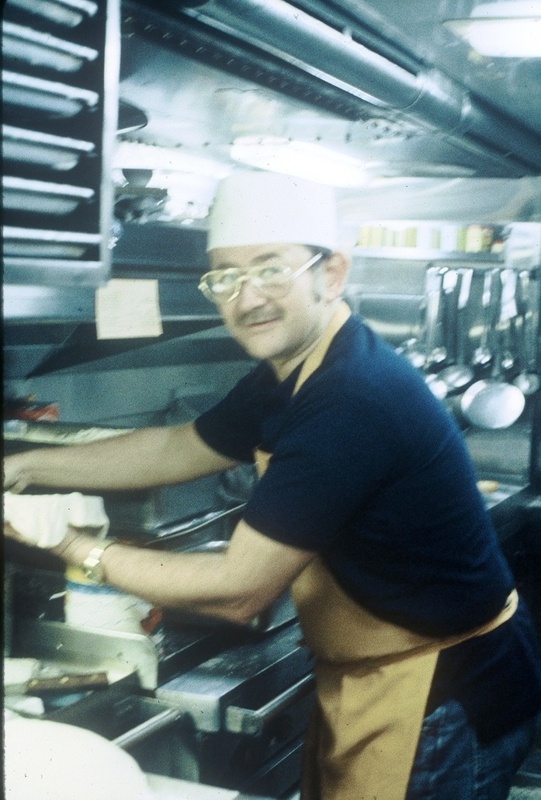 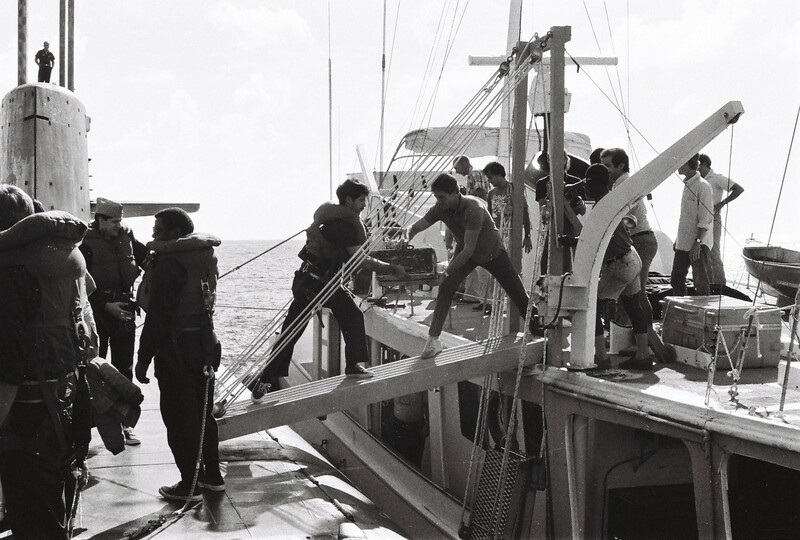 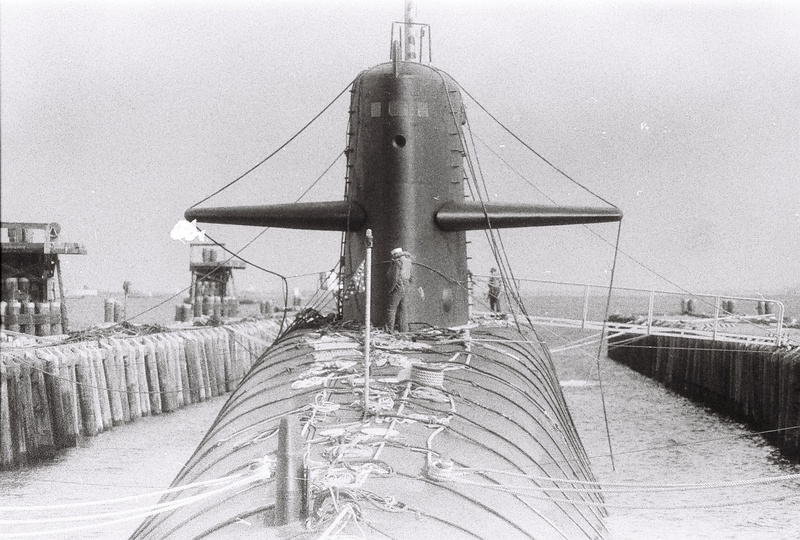 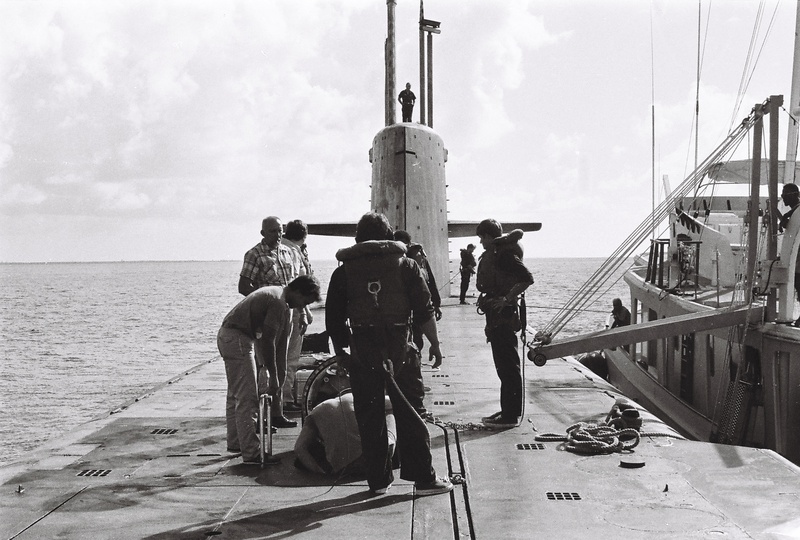 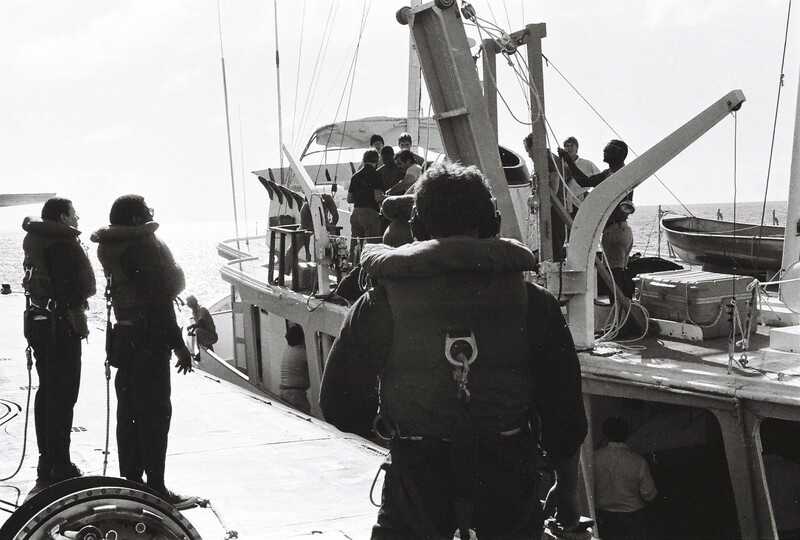 Key loading Tridents in 1981 in St Mary's. 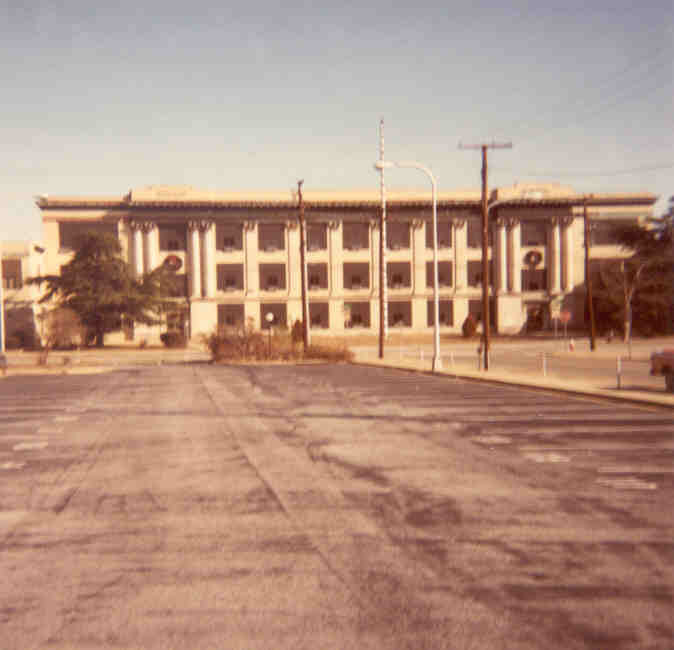 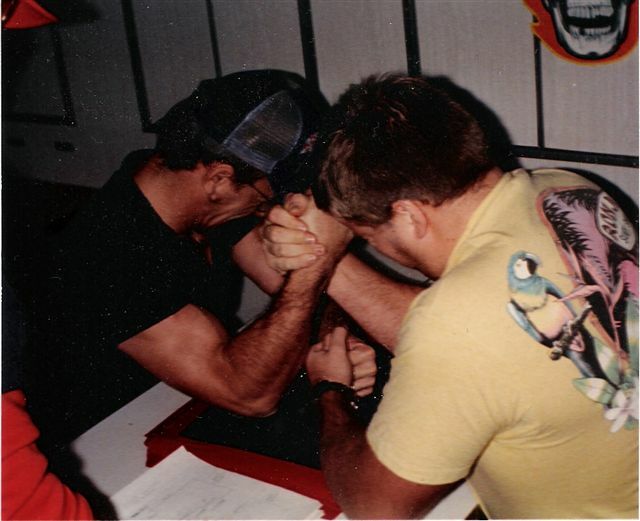 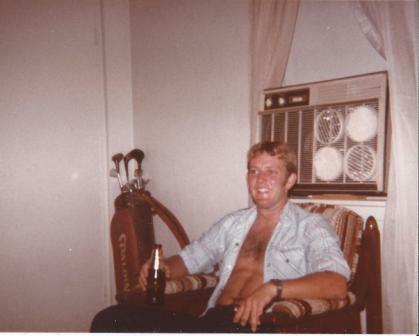 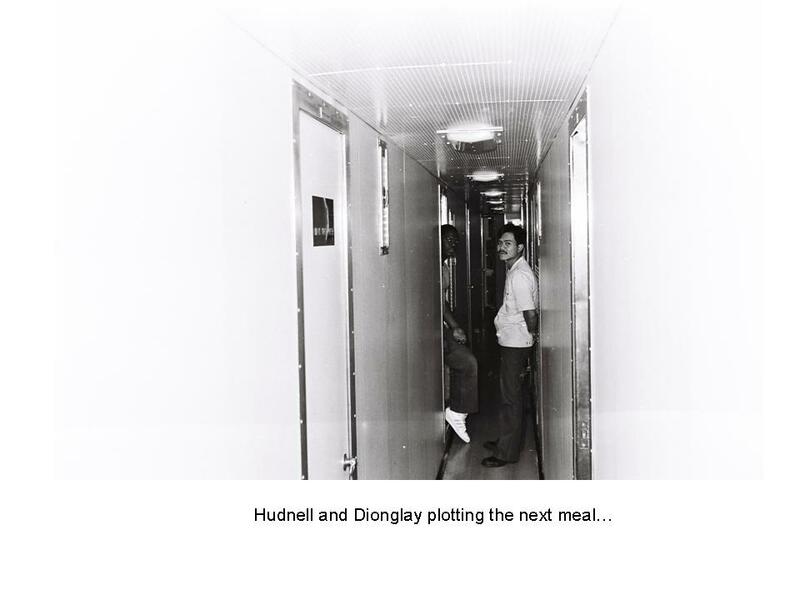 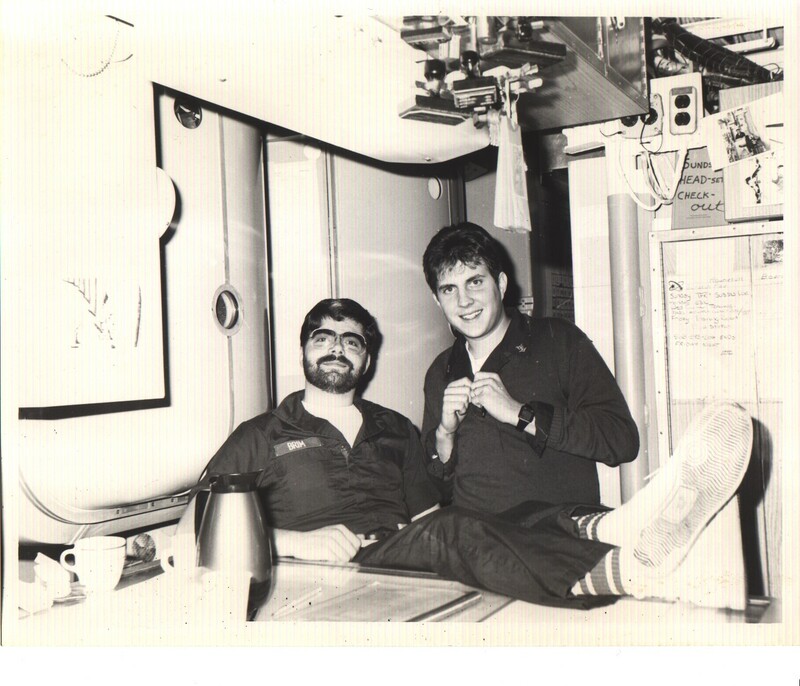 Submitted by Charles Bell - 1980. 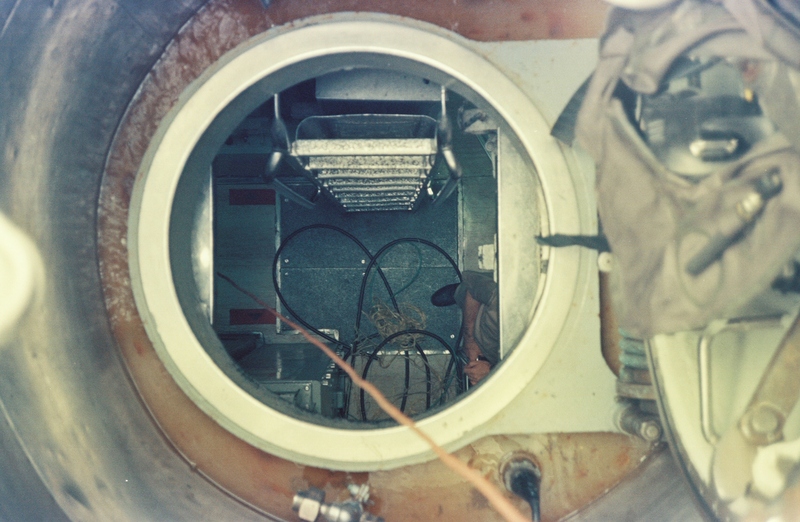 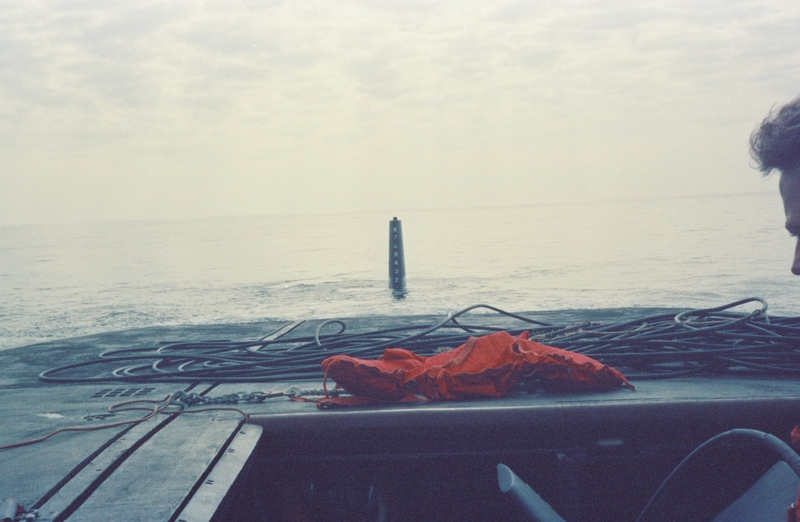 This is a photo of some reentry bodies from a Trident C4 missile launch test my crew did. 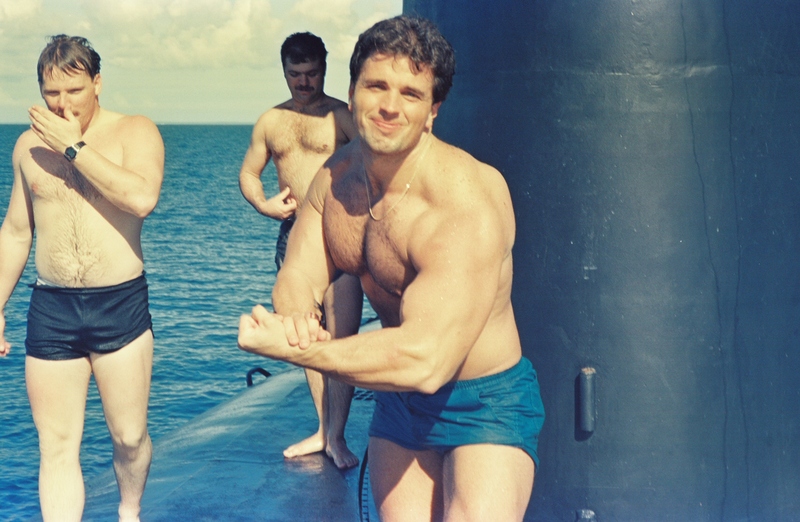 The captain gave us all a copy of this. 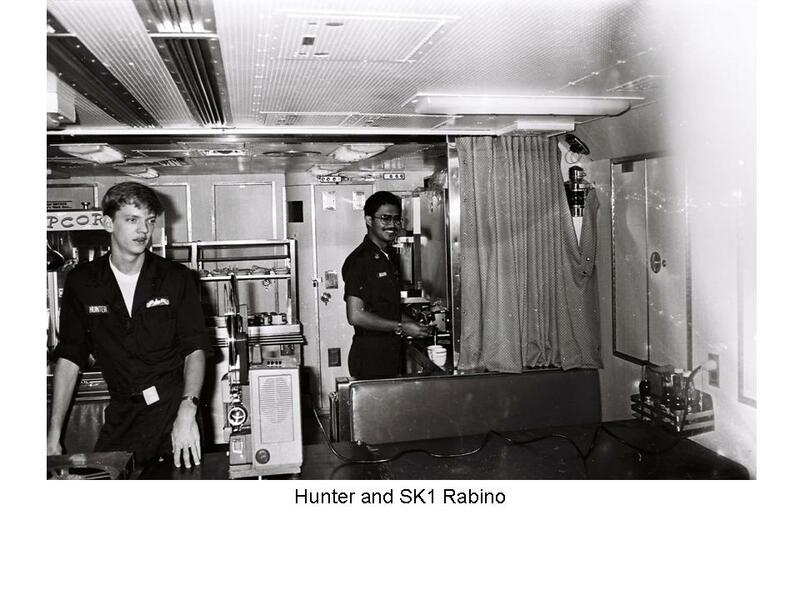 Its supposed to be of several different types of RBs reentering the upper atmosphere taken from a high altitude aircraft. 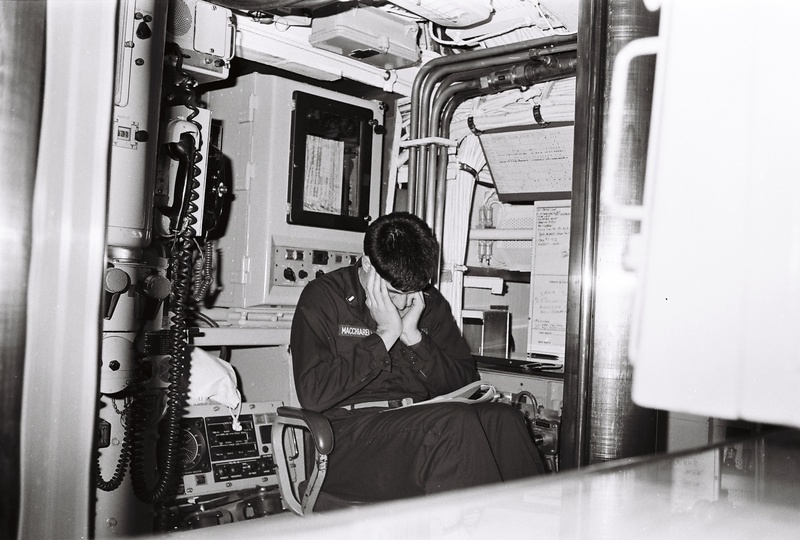 One RB was supposed to have been designed to do some kind of maneuver to evade being shot down. 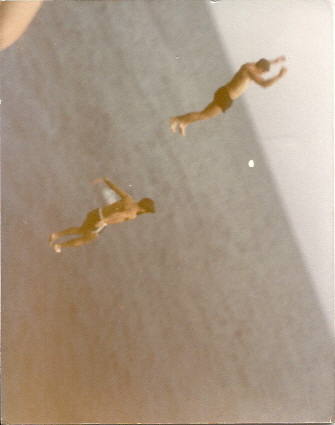 I hope I have the picture oriented properly. 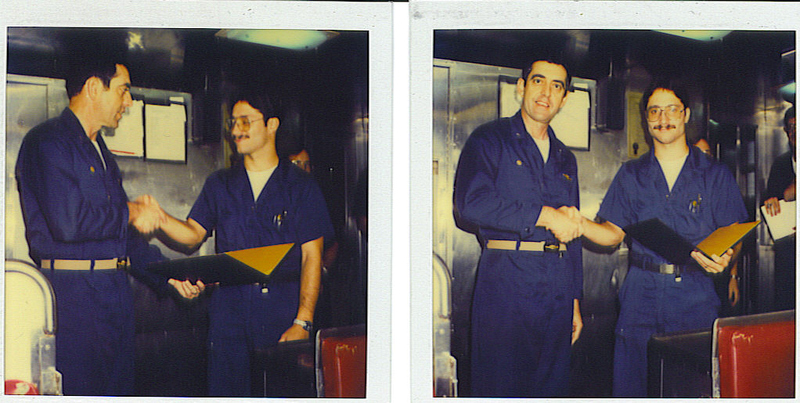 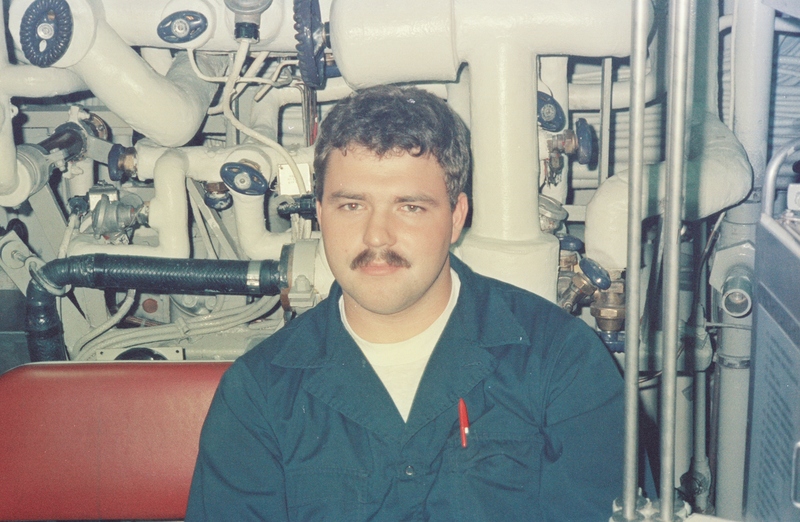 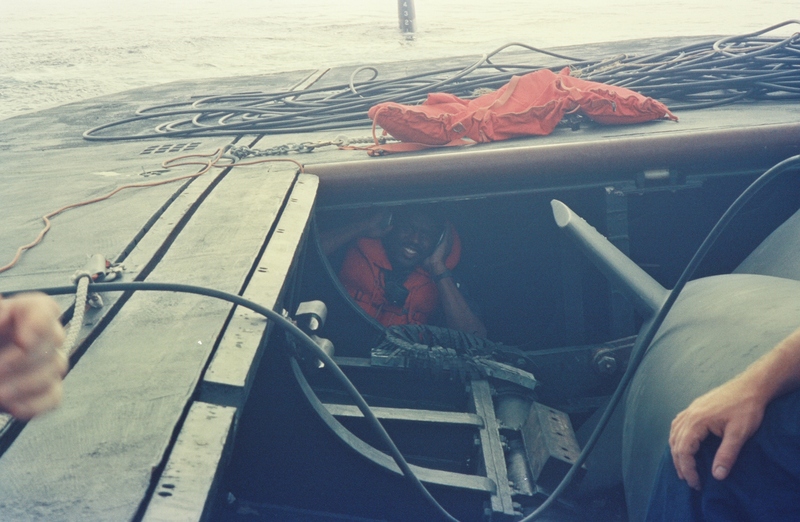 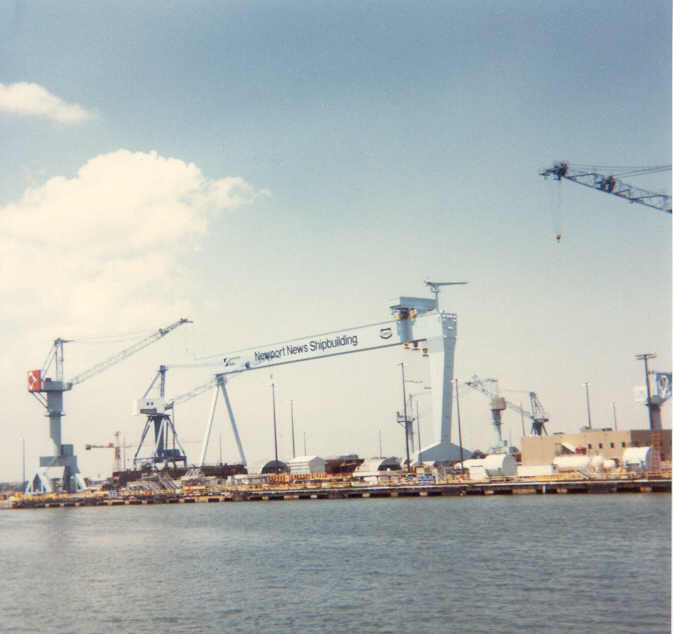 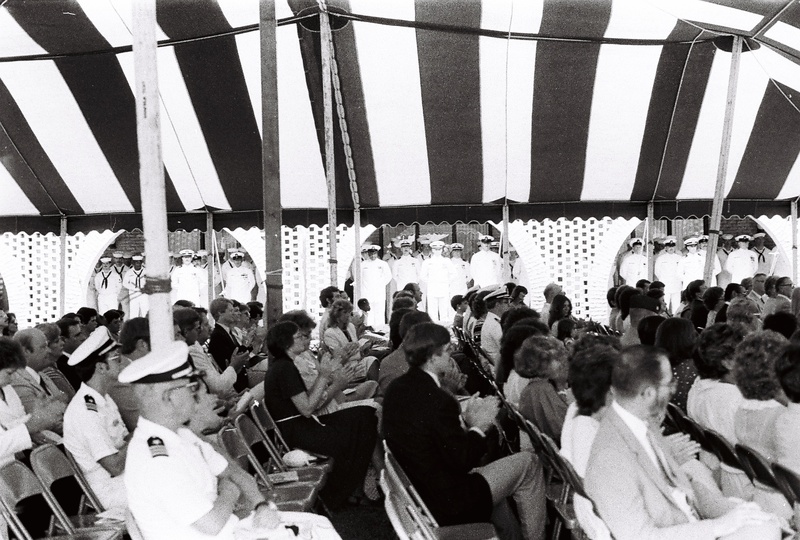 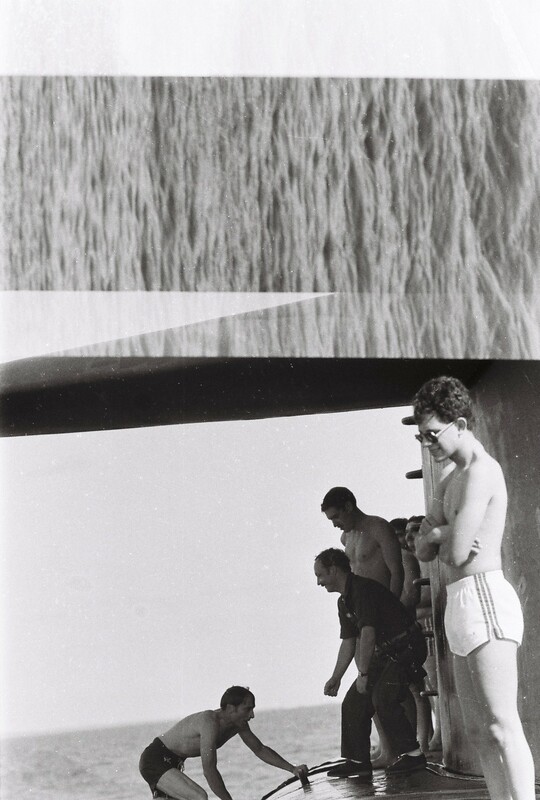 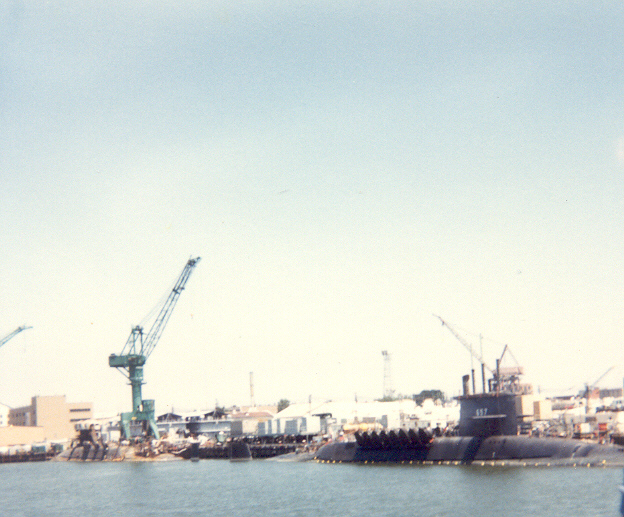 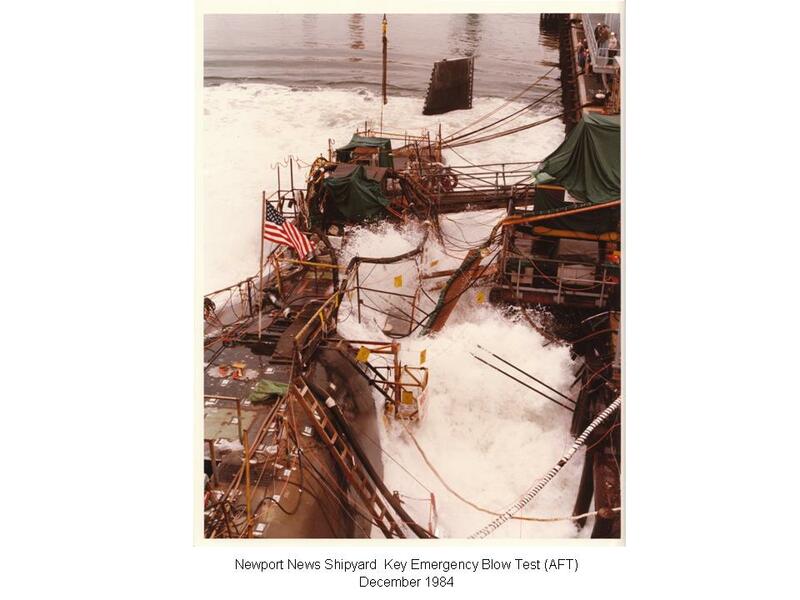 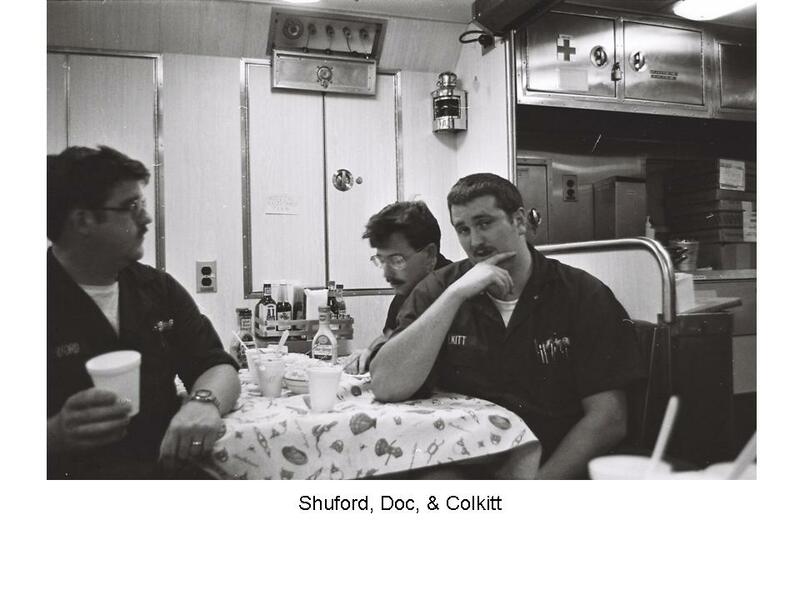 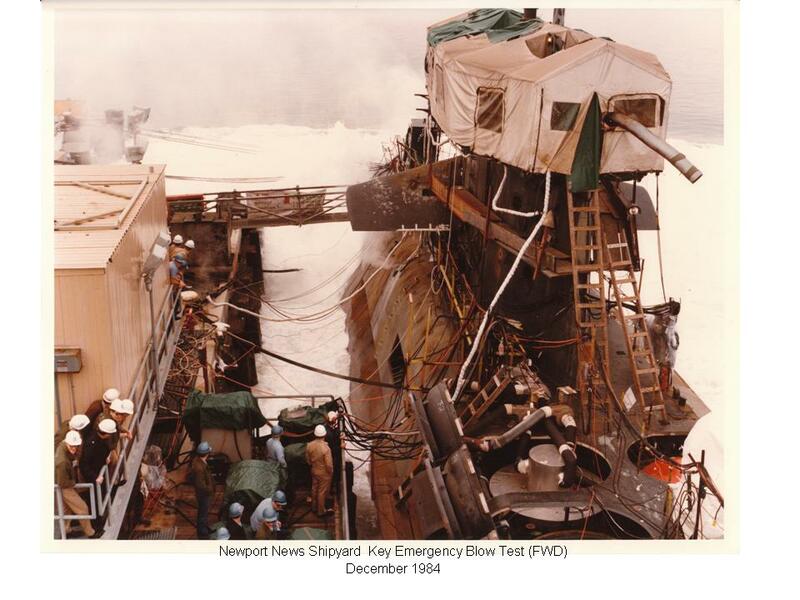 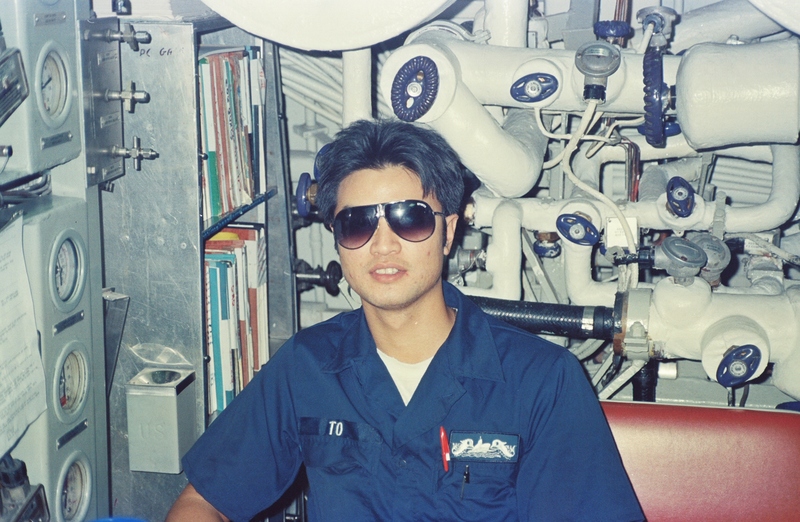 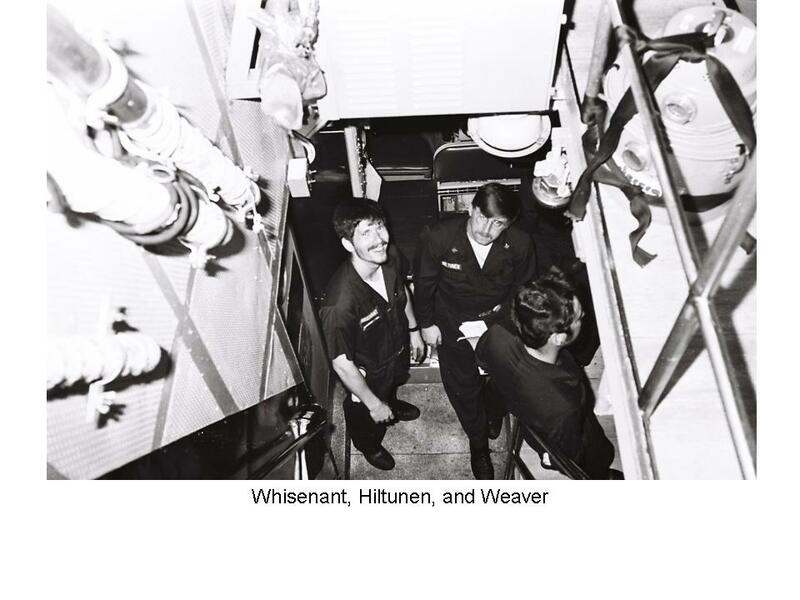 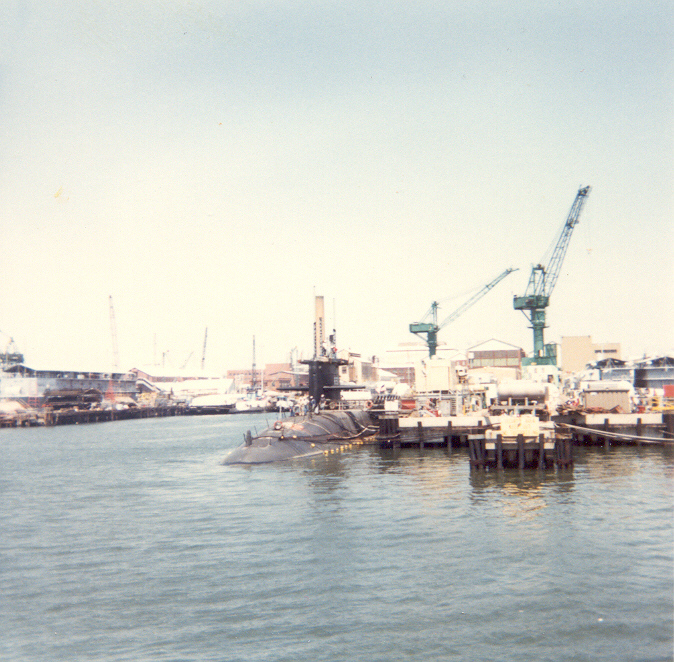 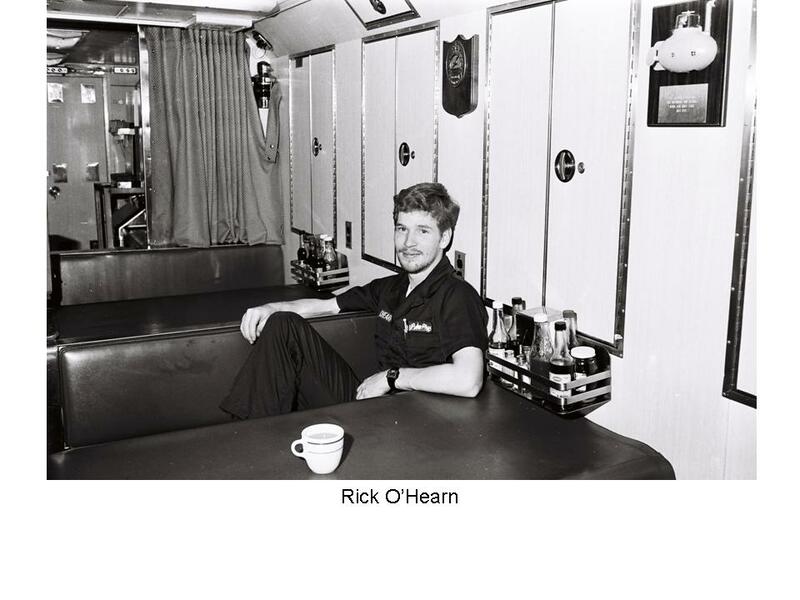 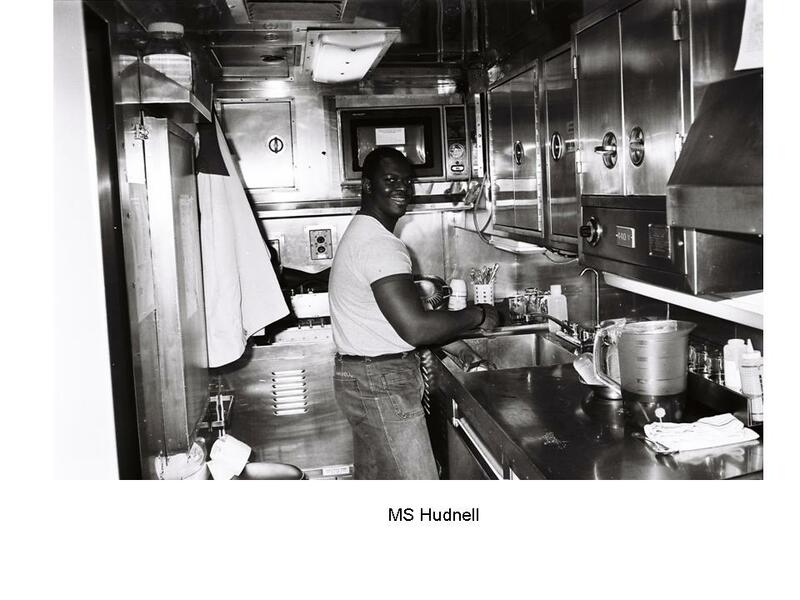 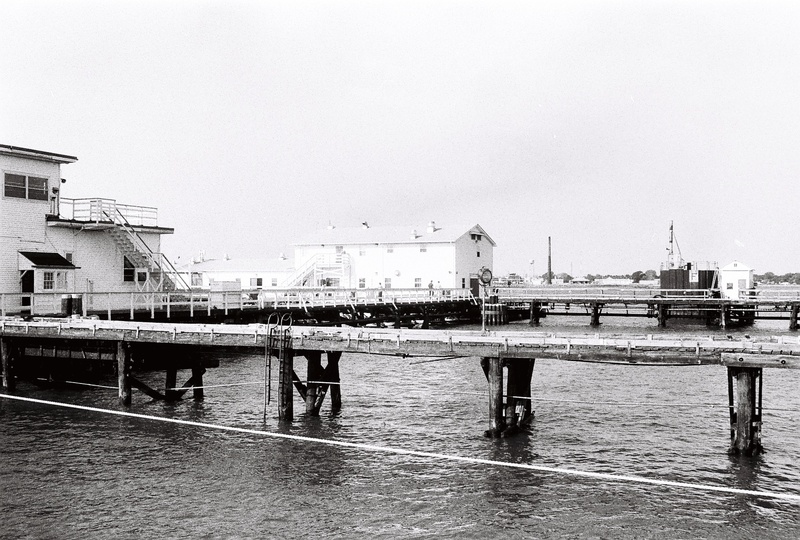 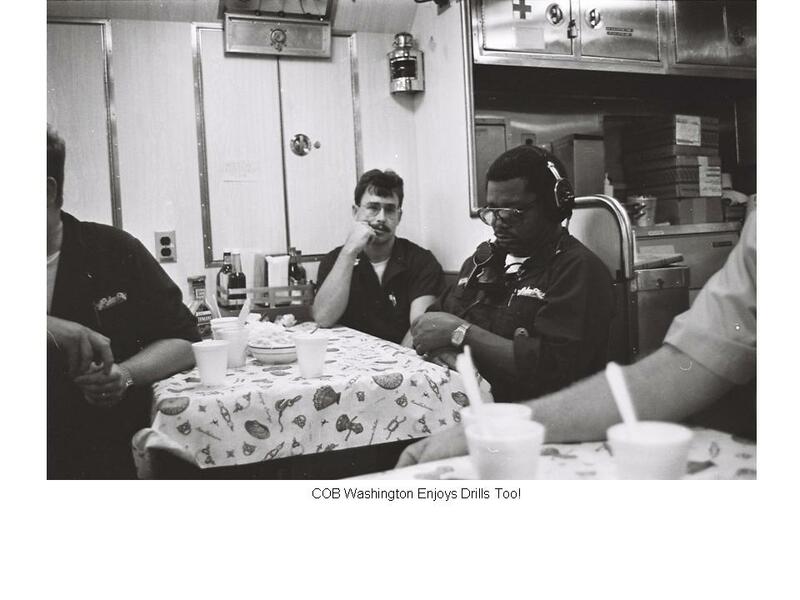 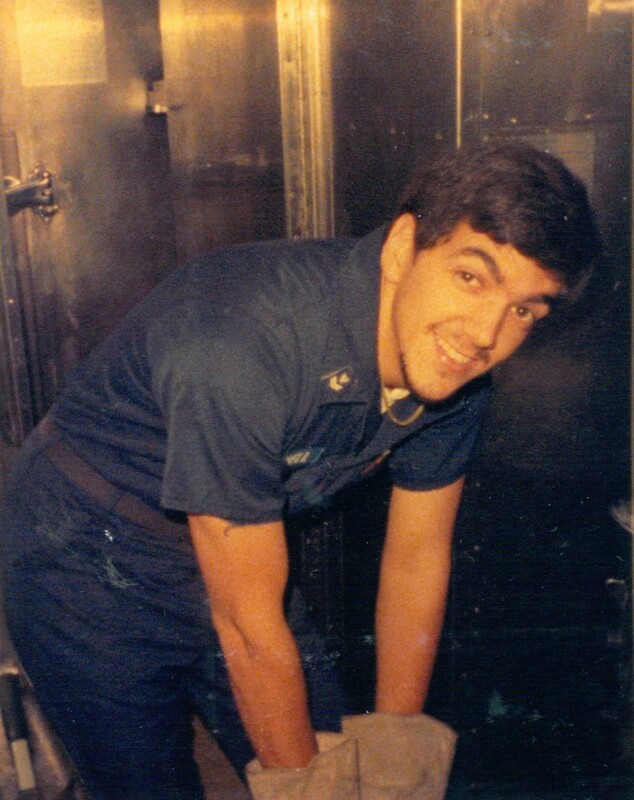 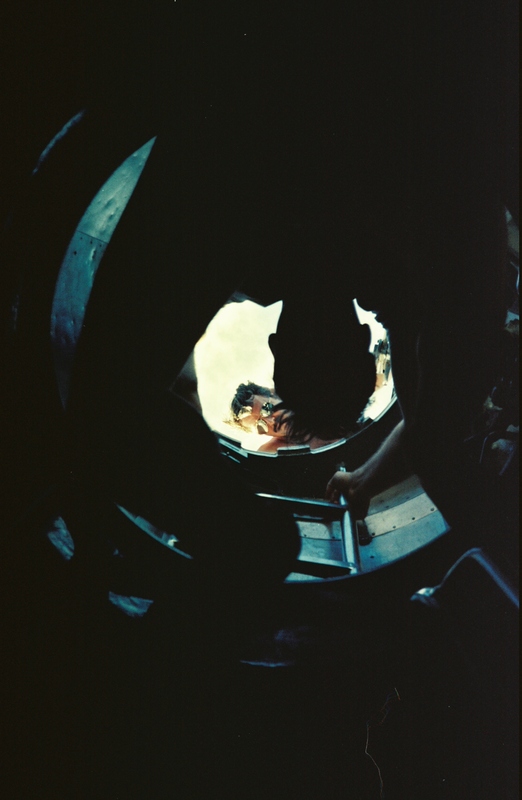 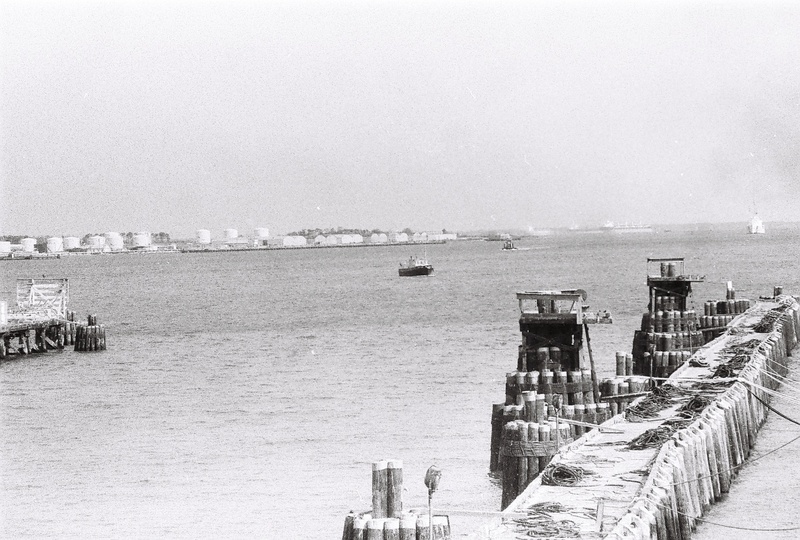 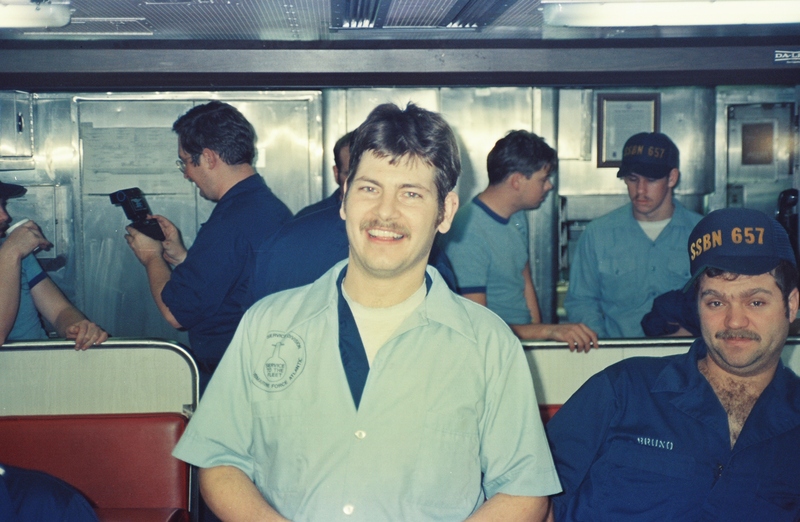 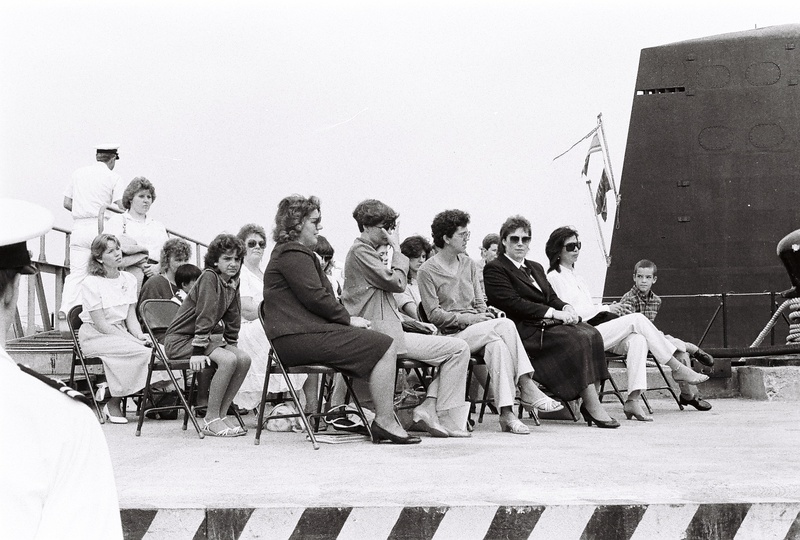 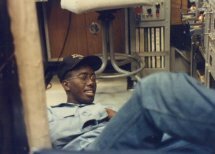 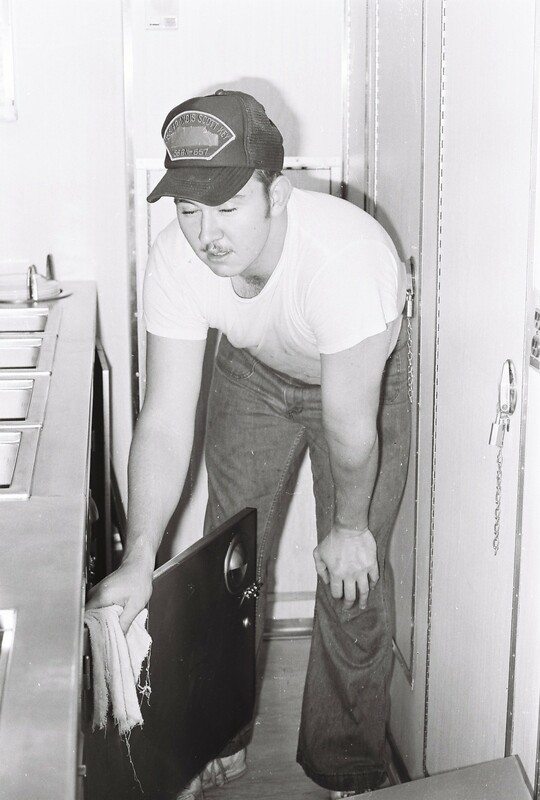 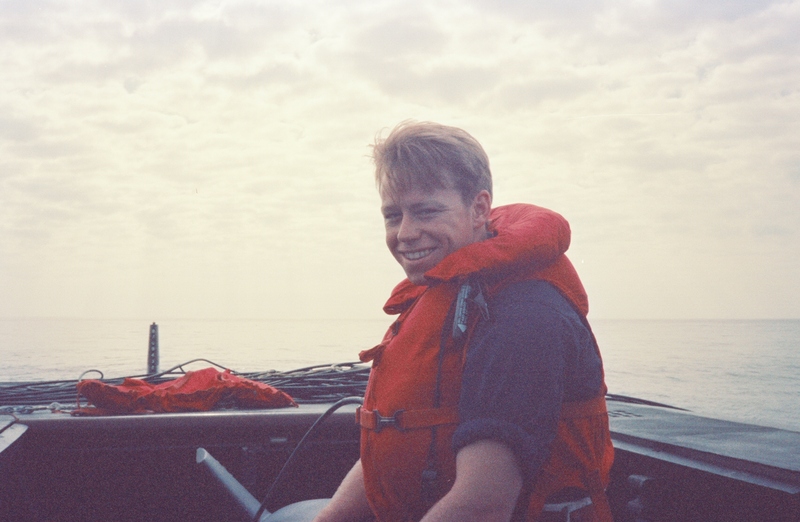 These were taken in the summer of 1984 while the boat was undergoing a refueling overhaul at Newport News Shipyard. 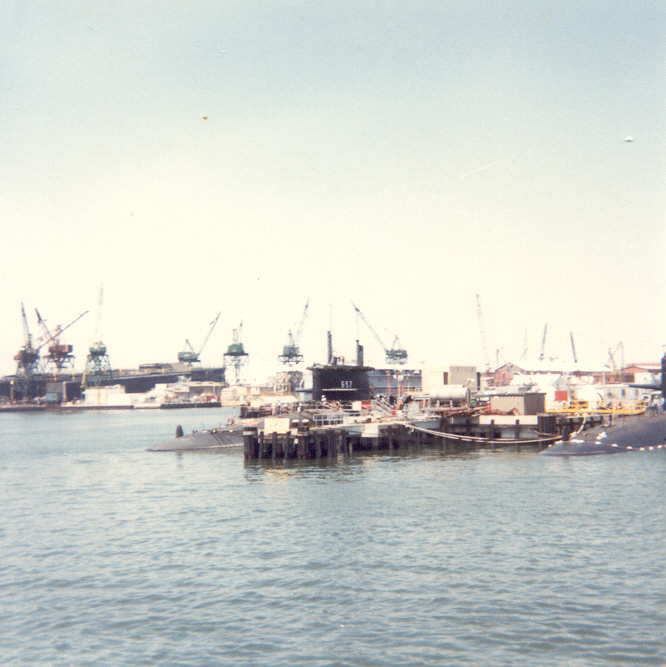 We found out about a Harbor Cruise which went by the shipyard, So one Saturday we took the cruise and I took these pictures. 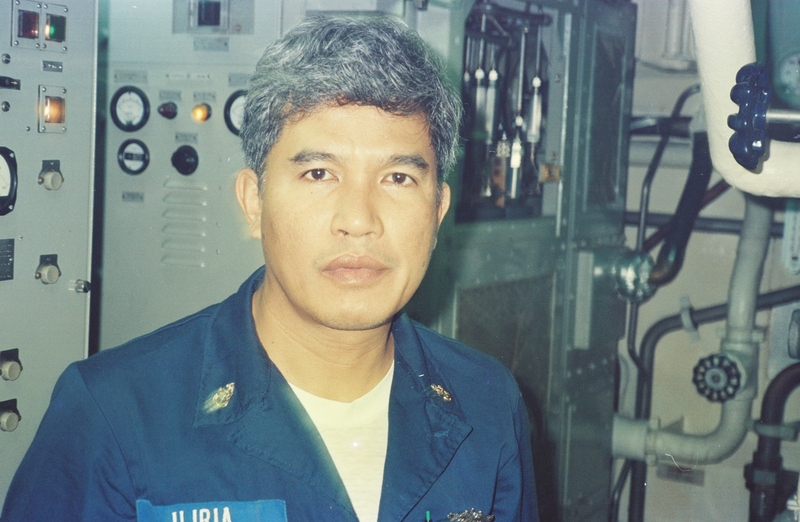 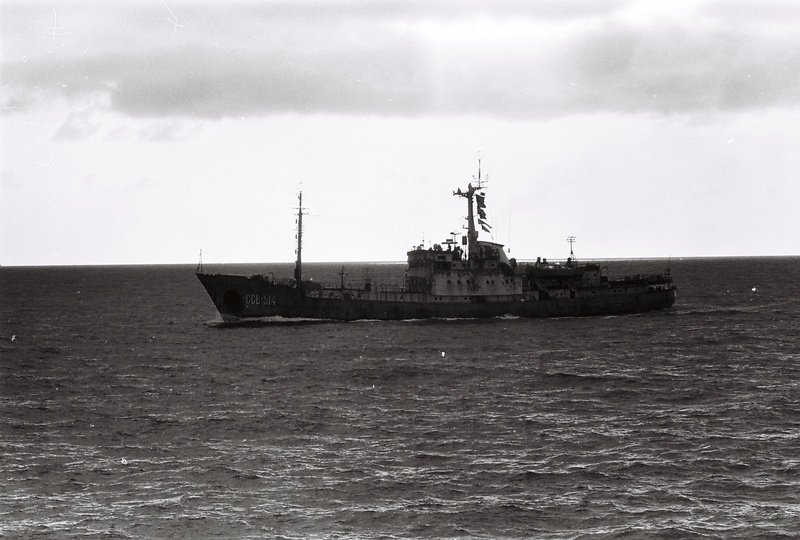 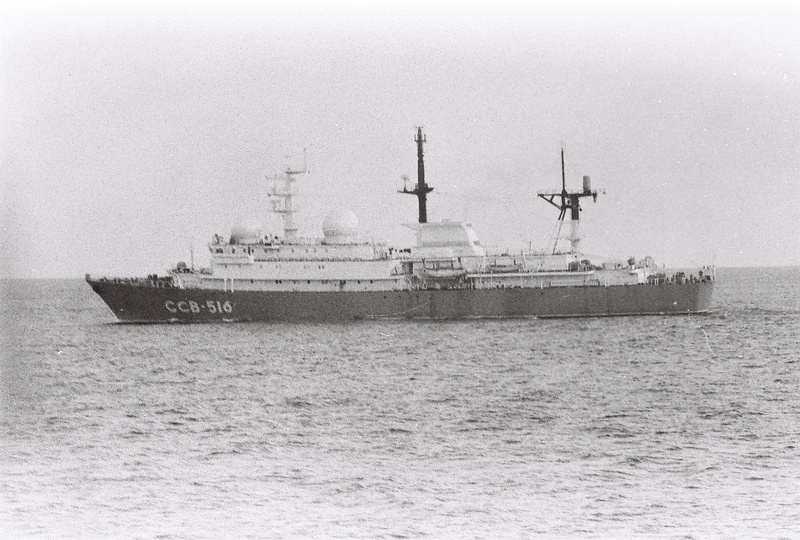 CDR G.E. 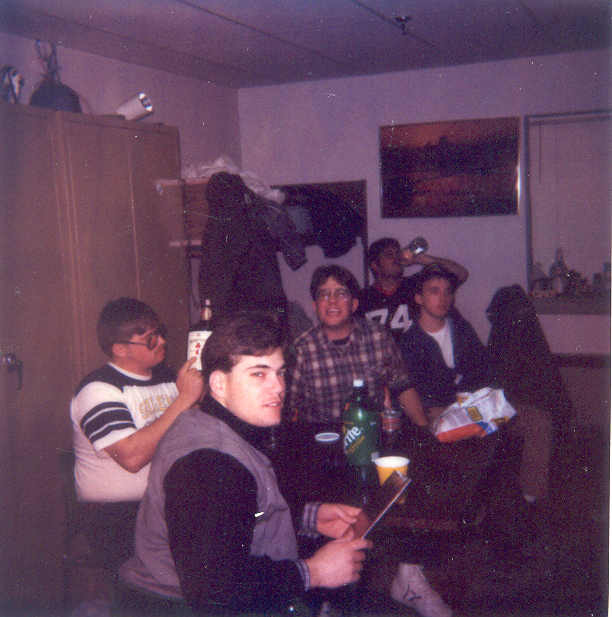 Bajuk, COB Michael Rinehart, Jeff Buss, and Robert Reeder. 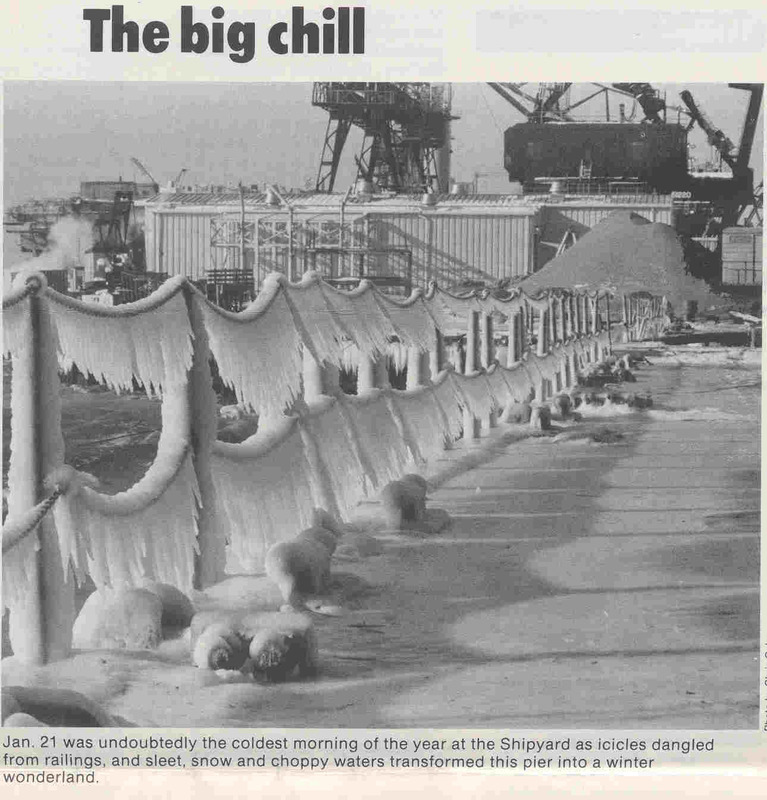 January 1986. 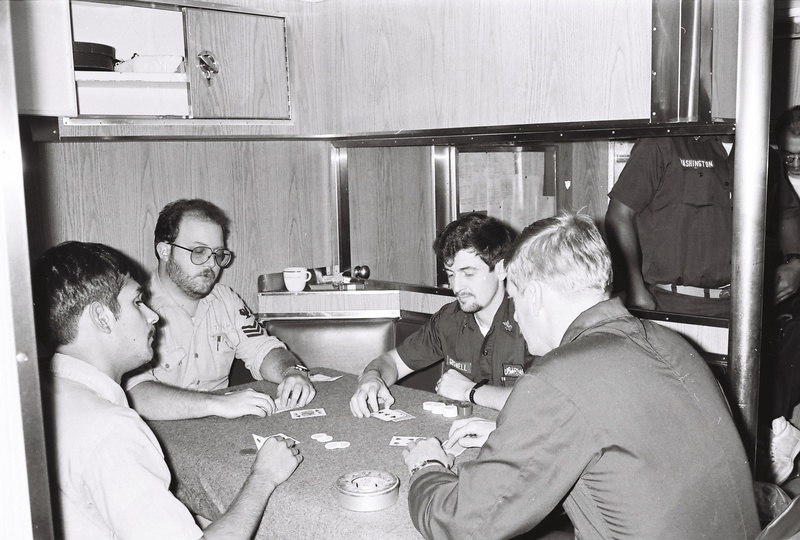 Jim Dixon, Gregory "Frog" Pelton, Ricky Hiltunen. 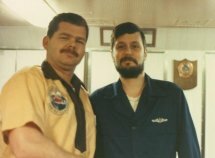 This picture was shortly after beards were banned. 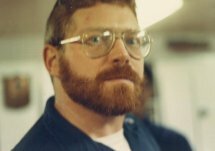 Before he shaved, no one knew how "Frog" got his nickname. 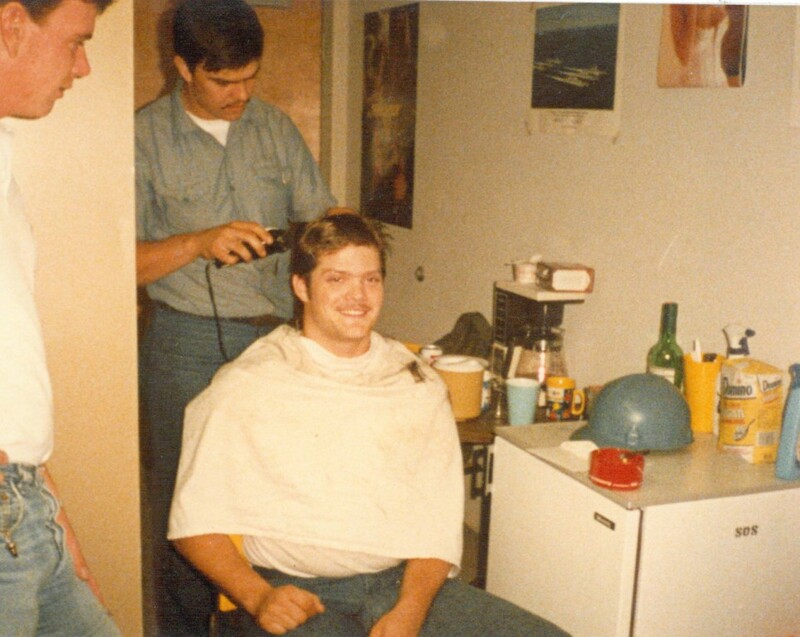 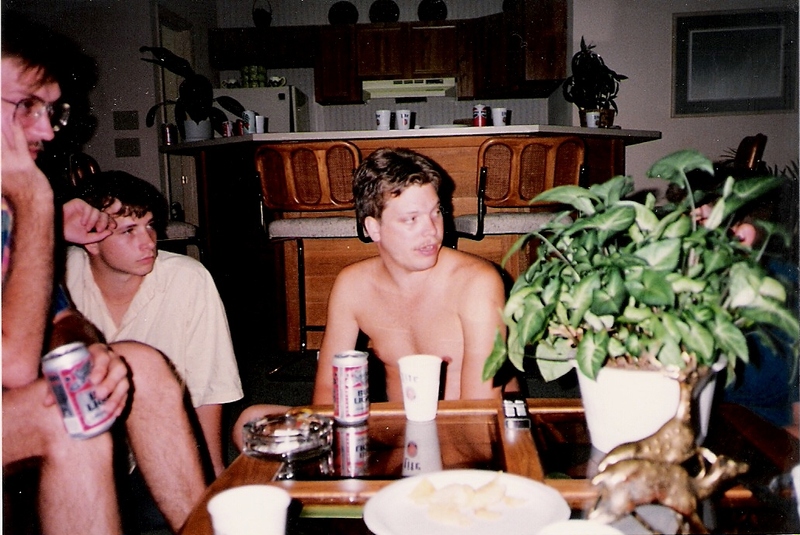 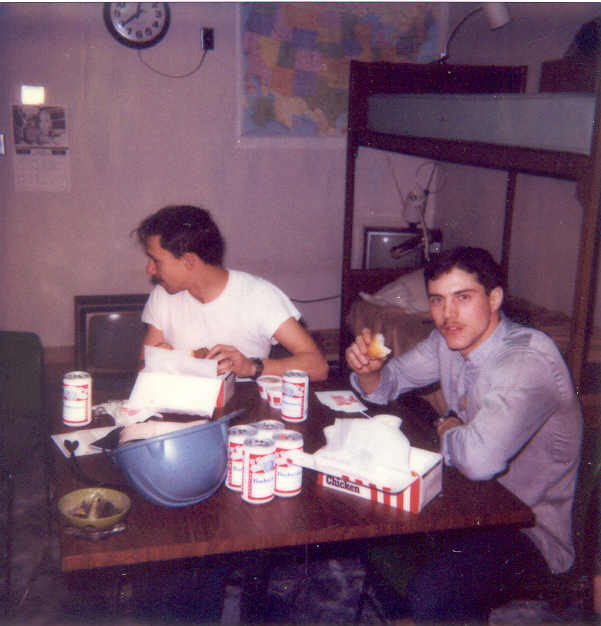 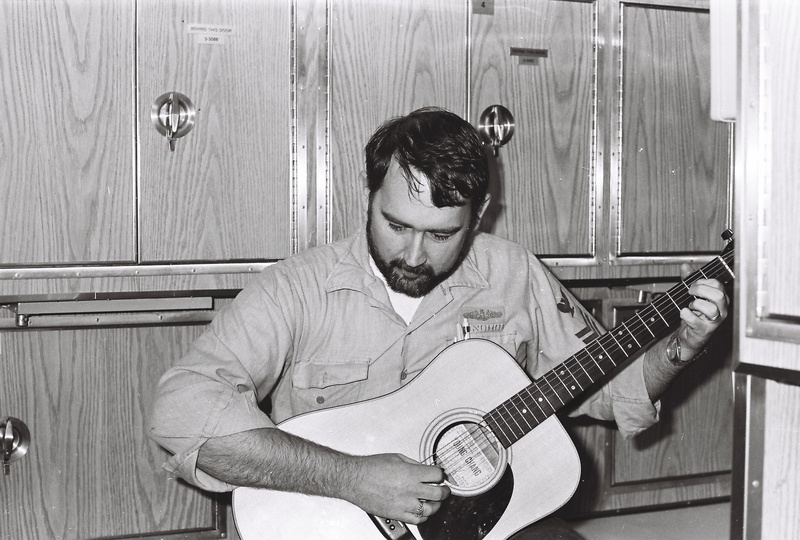 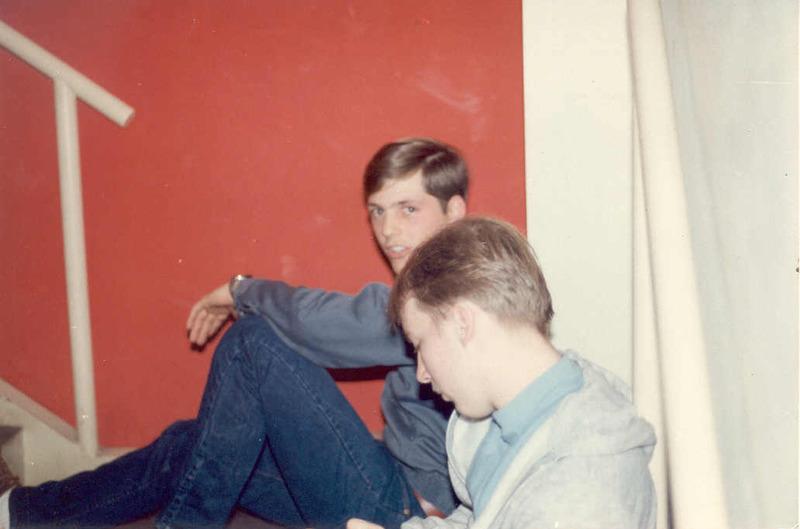 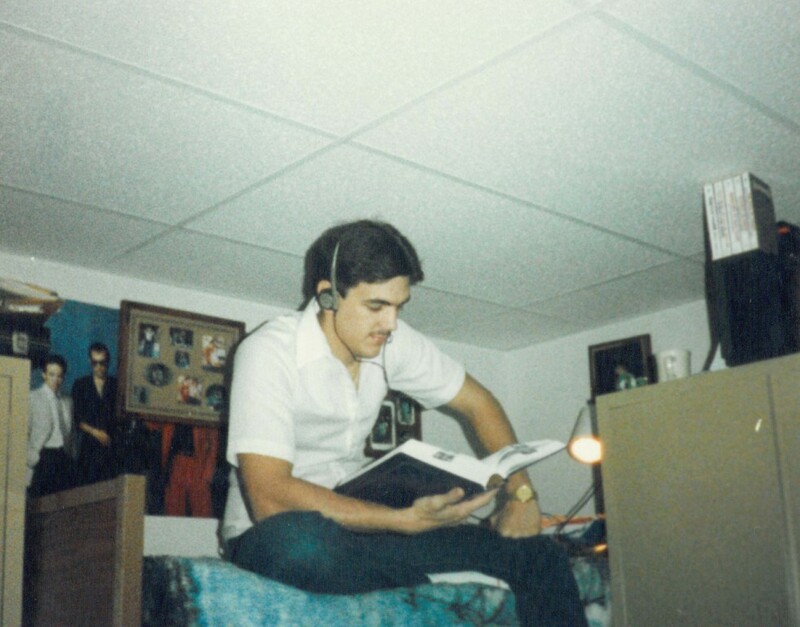 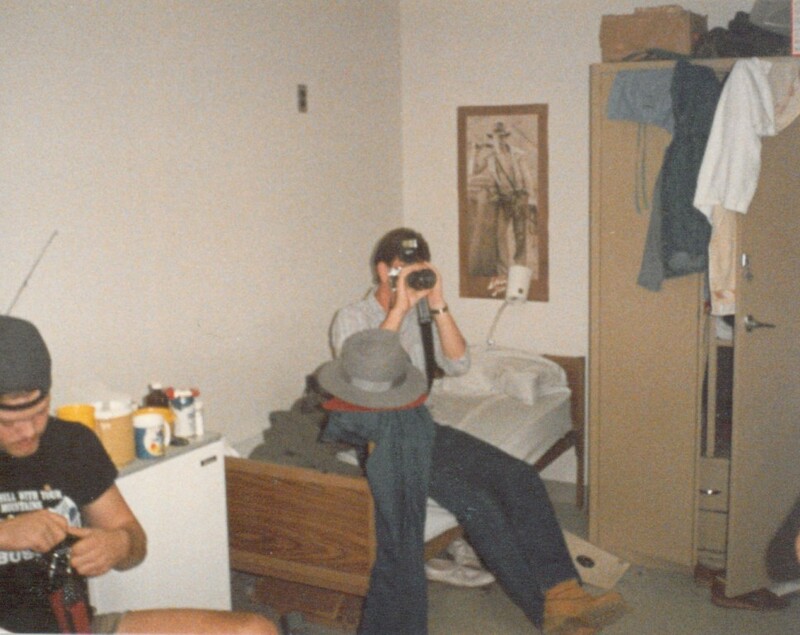 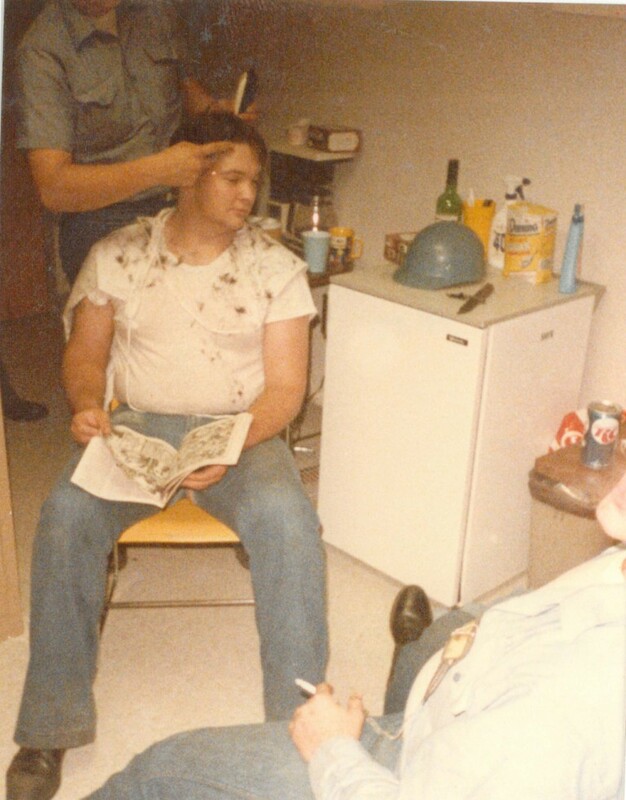 Kirk Parnell in the dorm at "The Hall" 1984. . 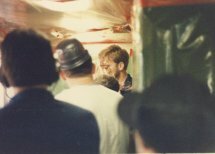 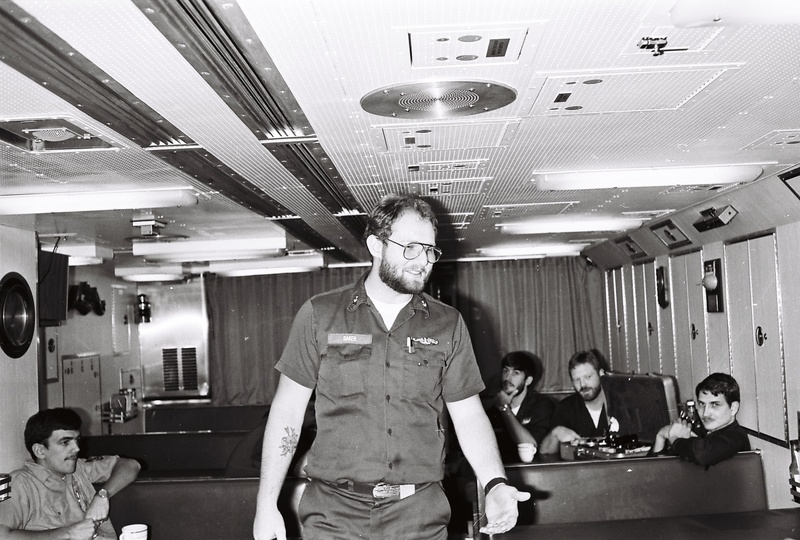 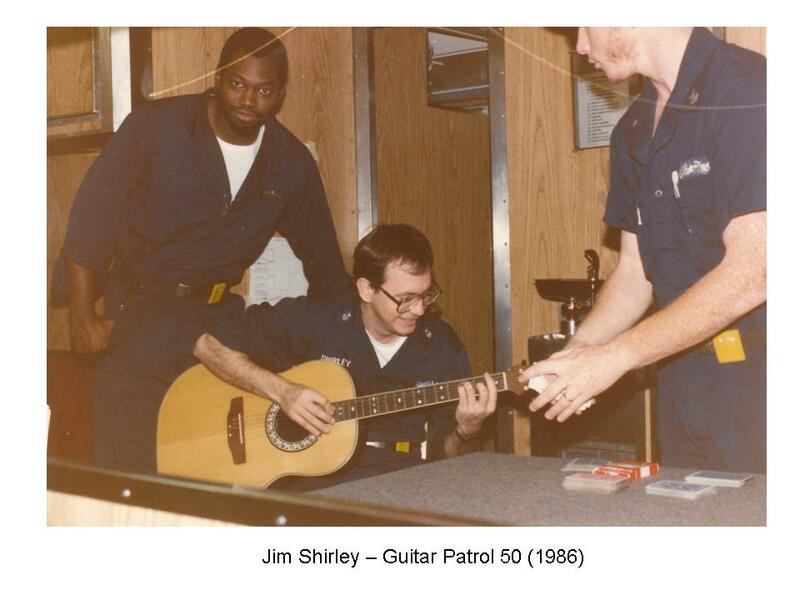 I (Kirk Parnell) came to the boat early in 1984 and was assigned a room with Bingham and Jarvis. 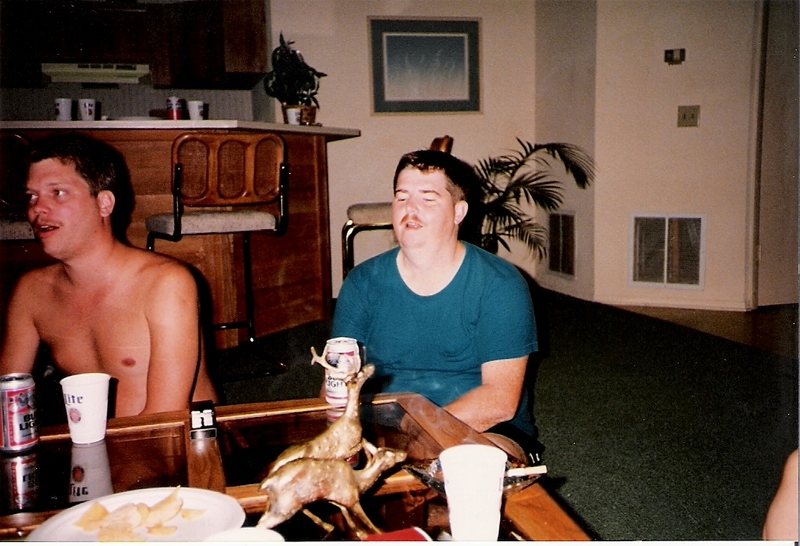 I think Tubby just came into our room for the beer. 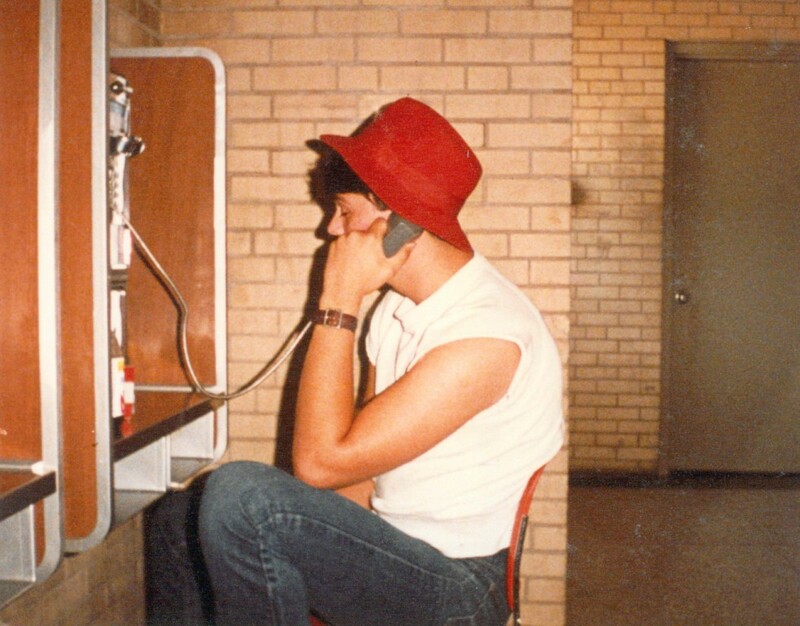 Fred Bingham on the phone in the Hall 1984. 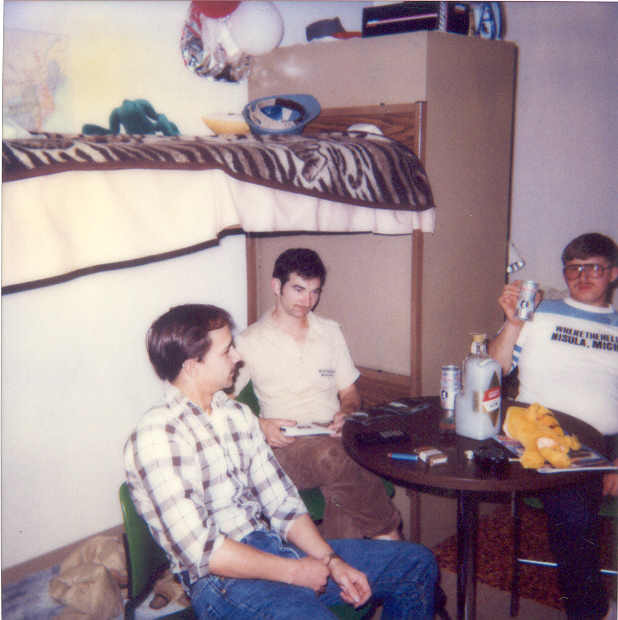 Huntington Hall is where we stayed during the overhaul. 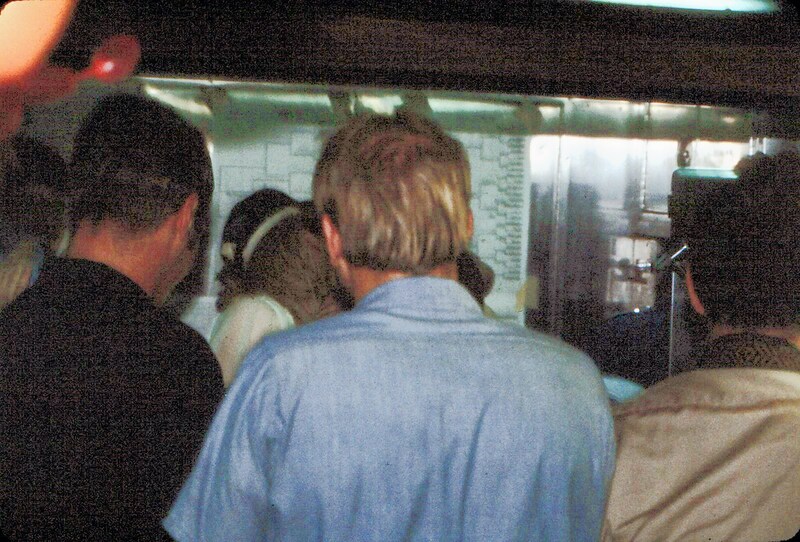 There were rows of pay phones out in the passageway. 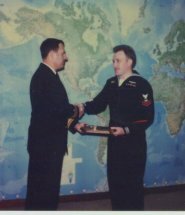 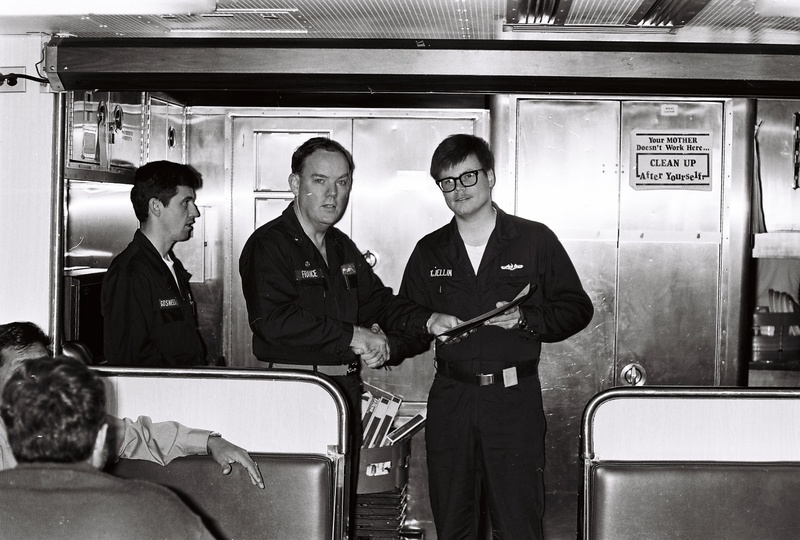 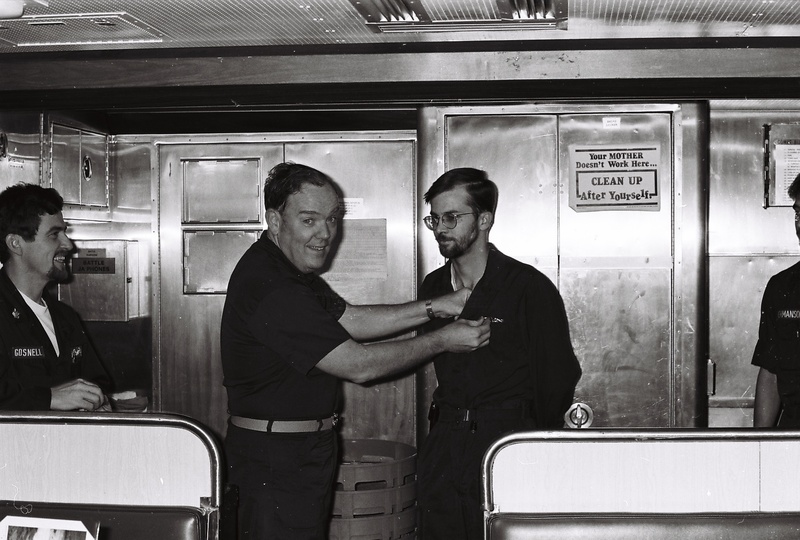 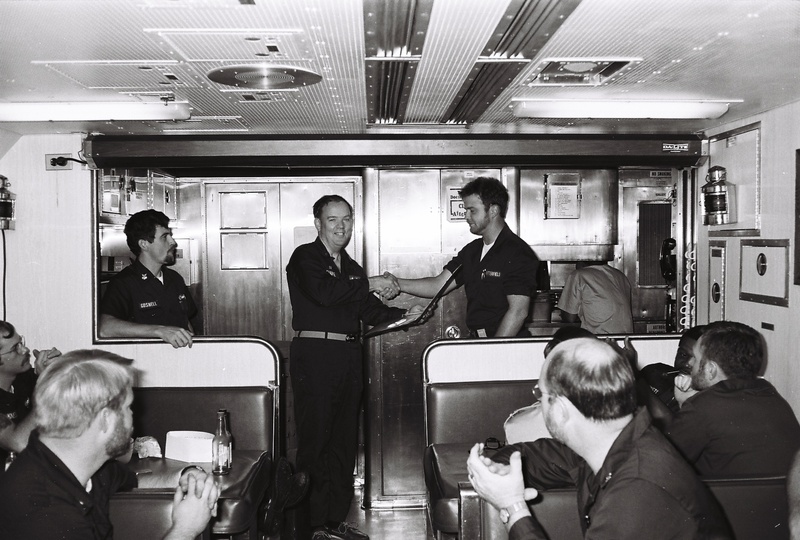 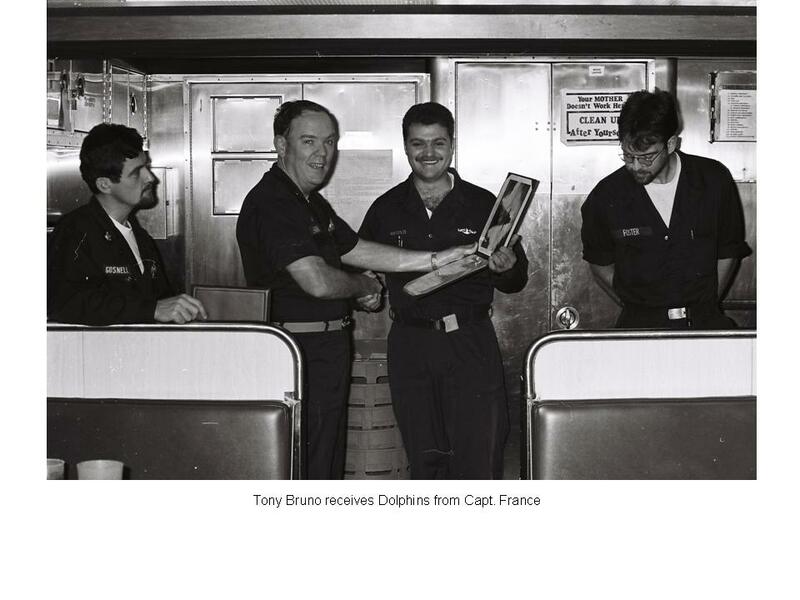 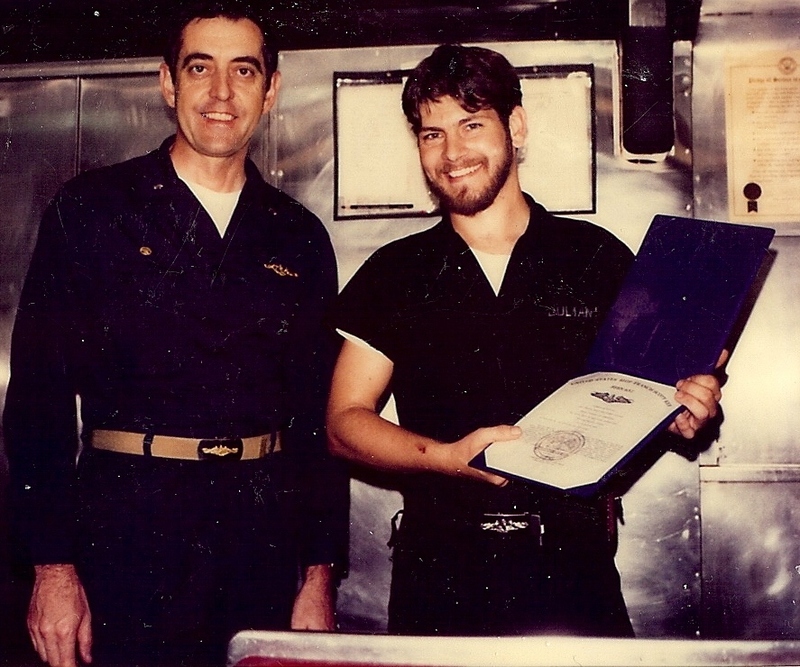 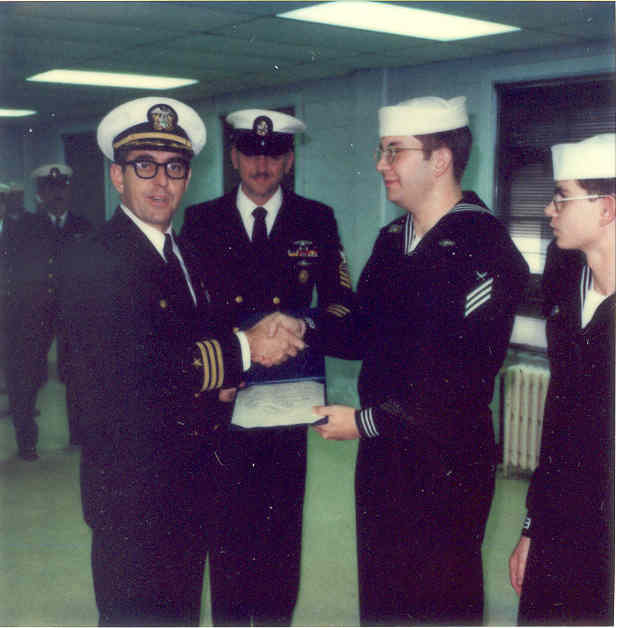 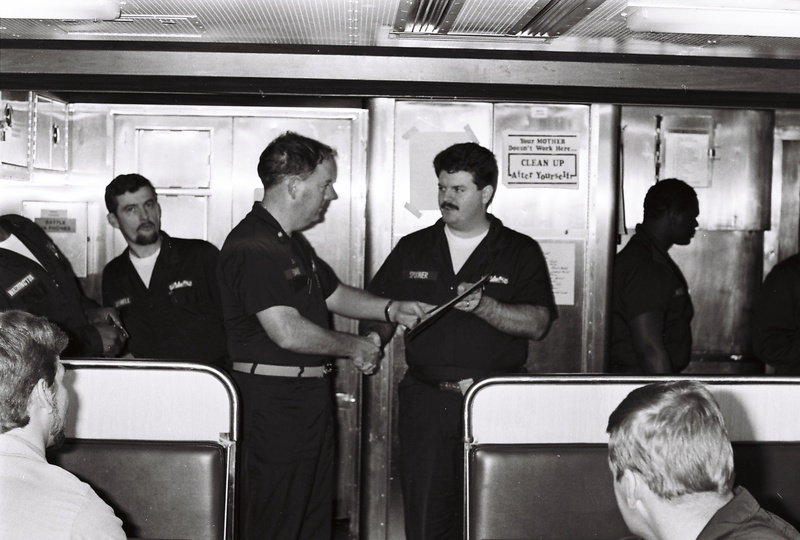 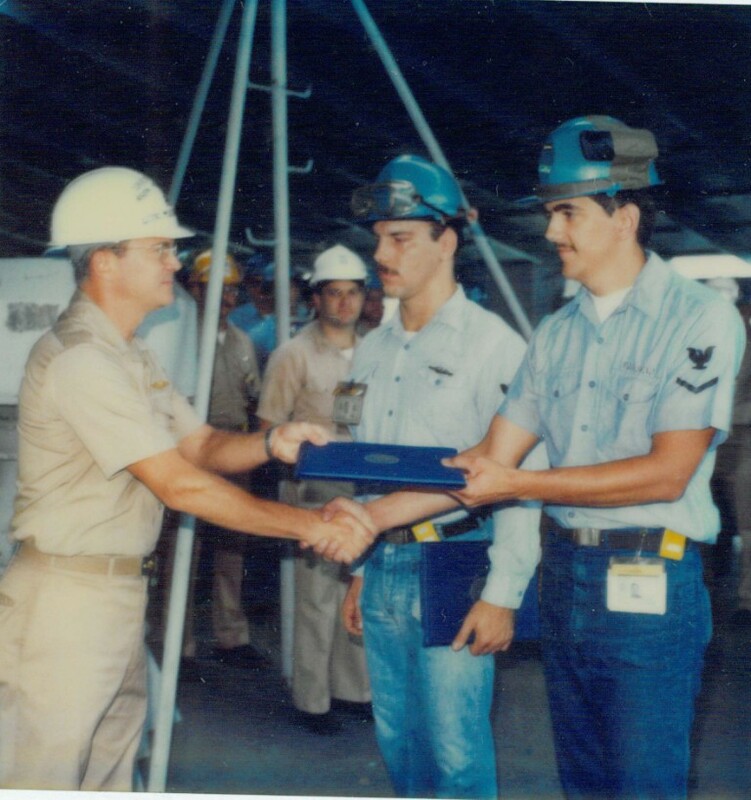 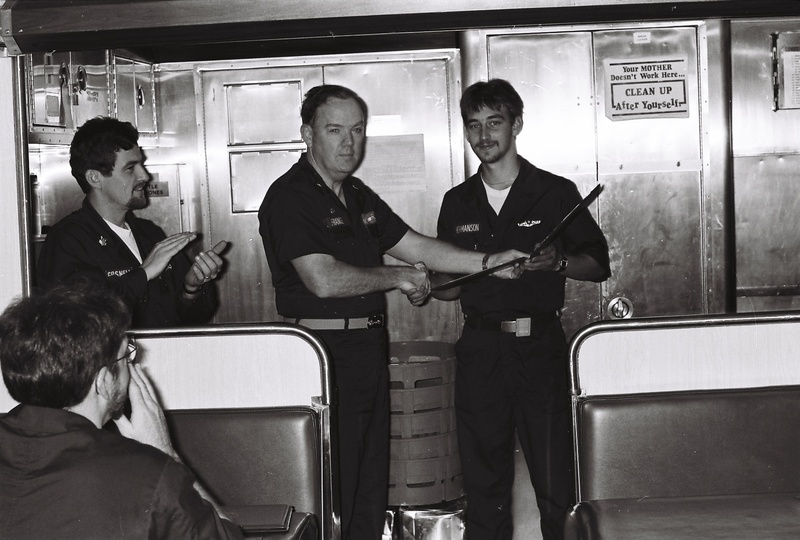 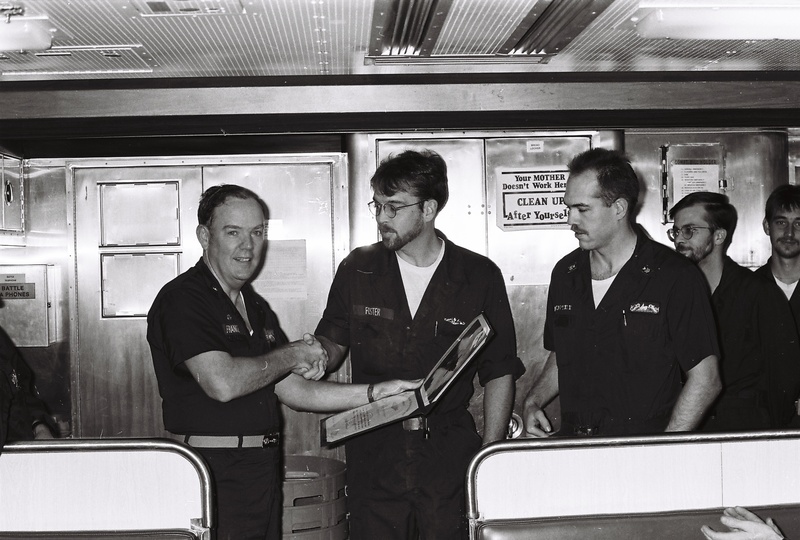 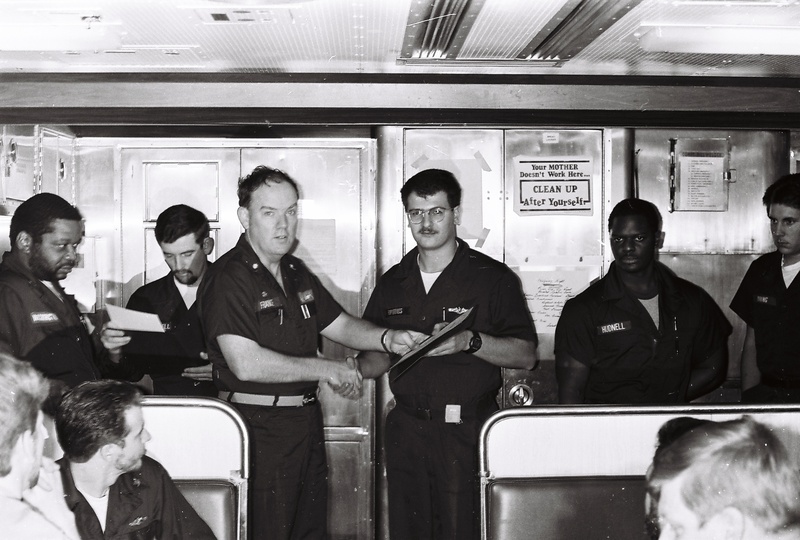 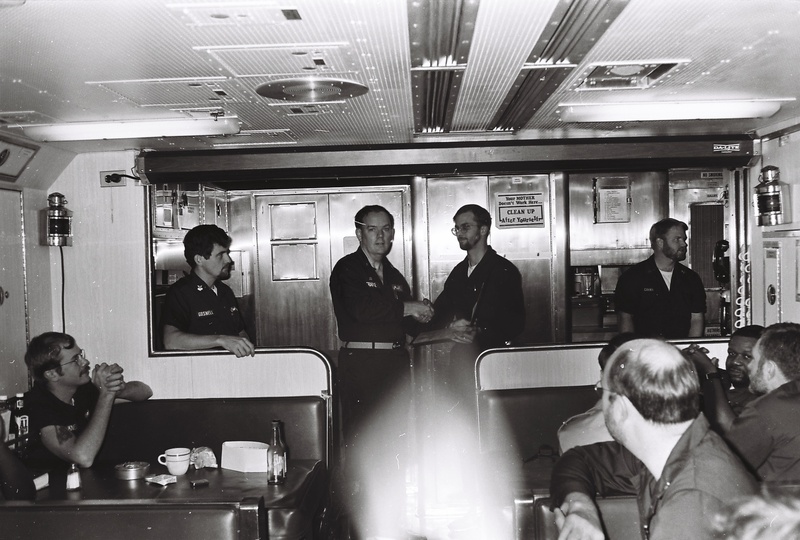 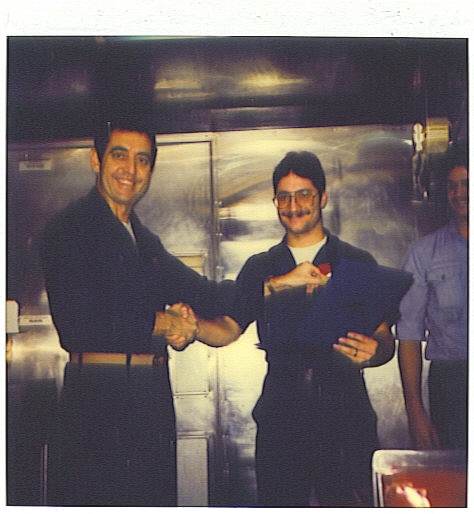 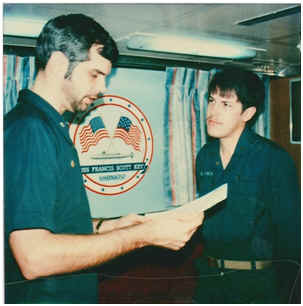 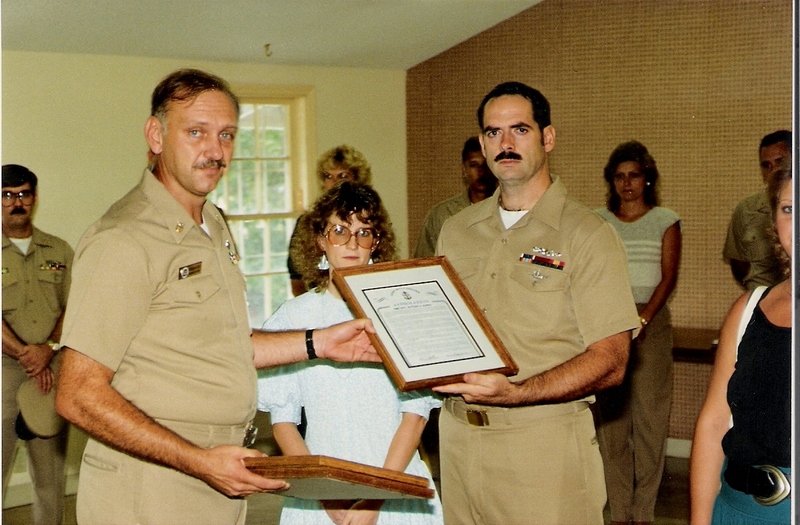 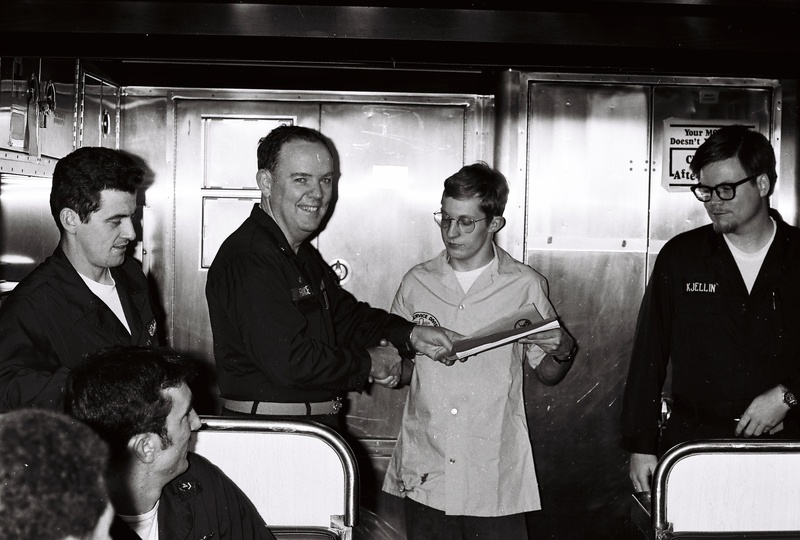 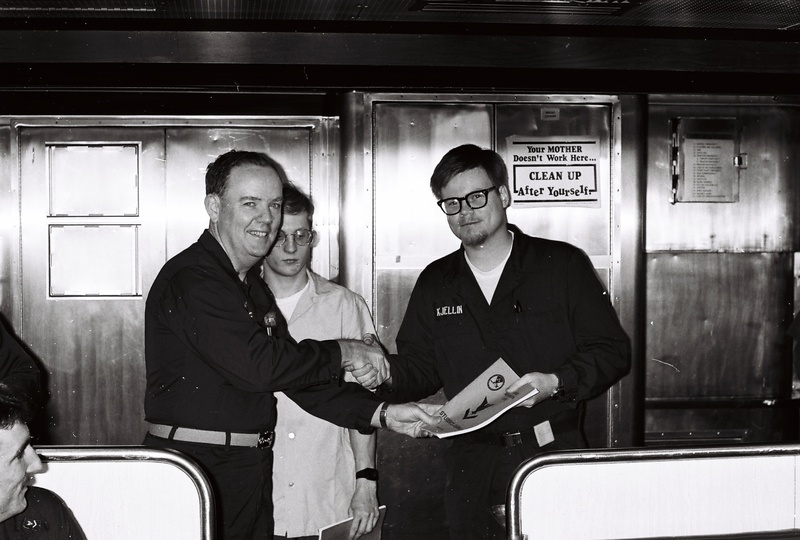 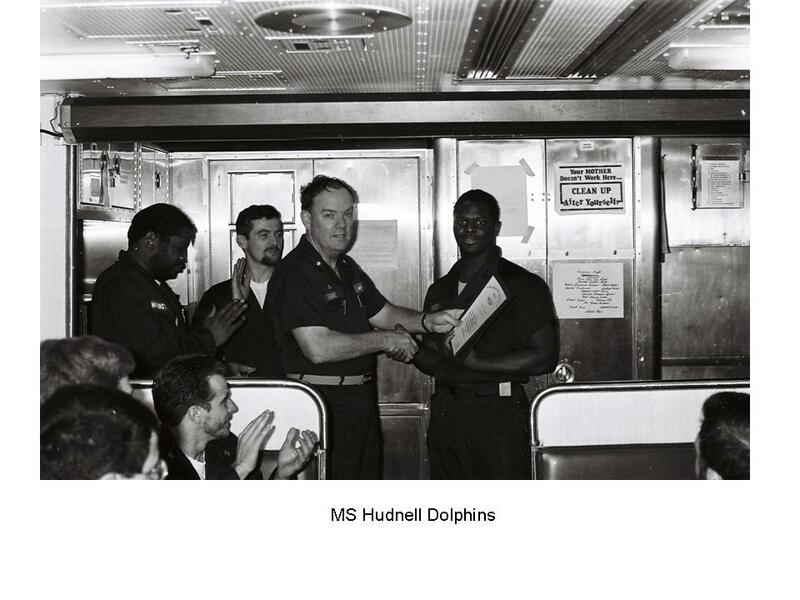 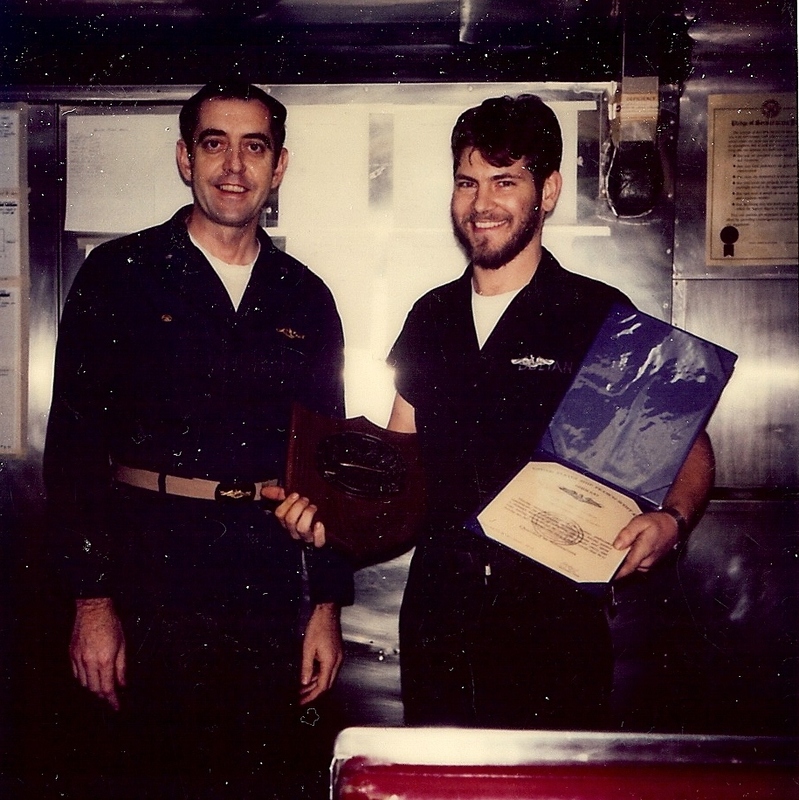 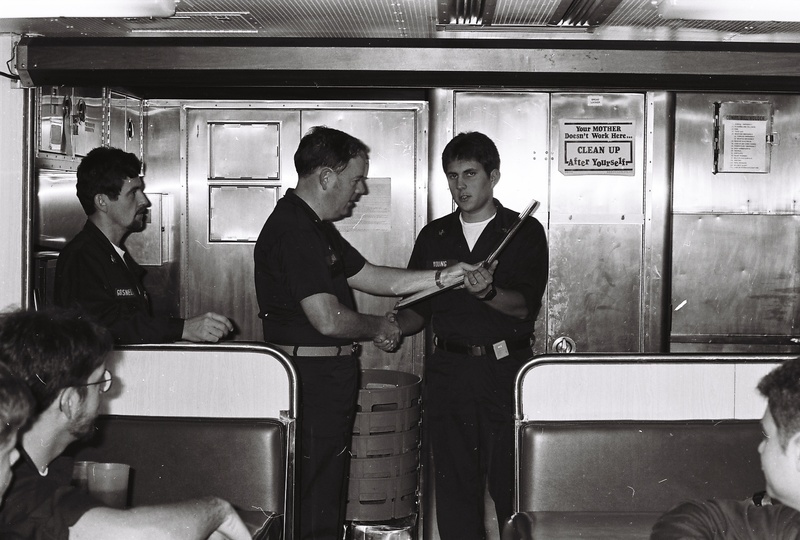 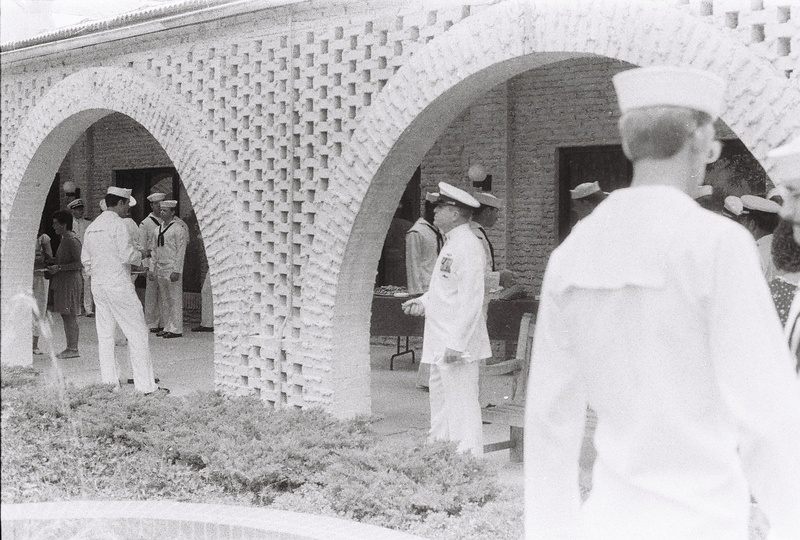 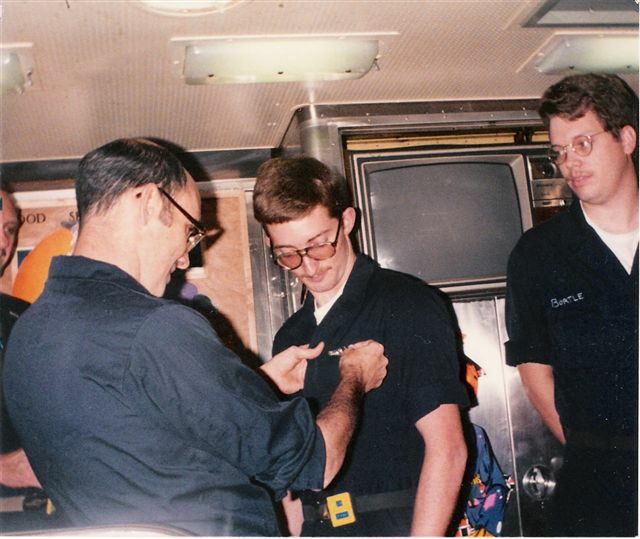 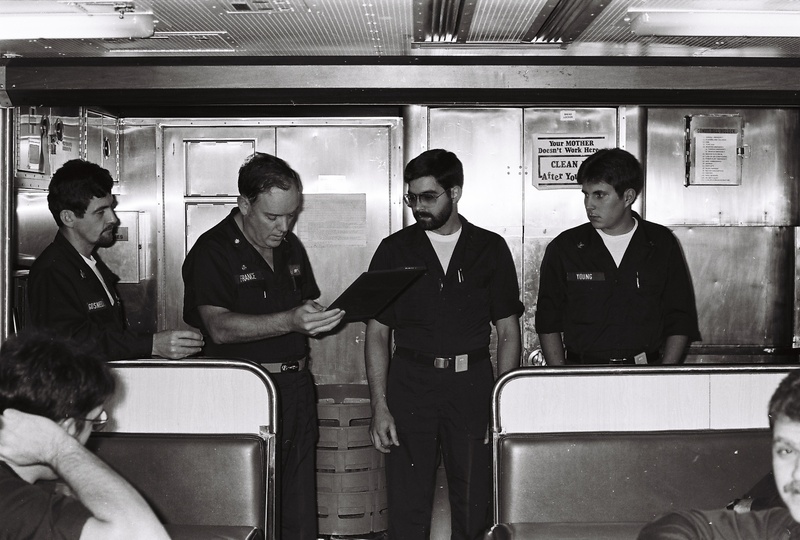 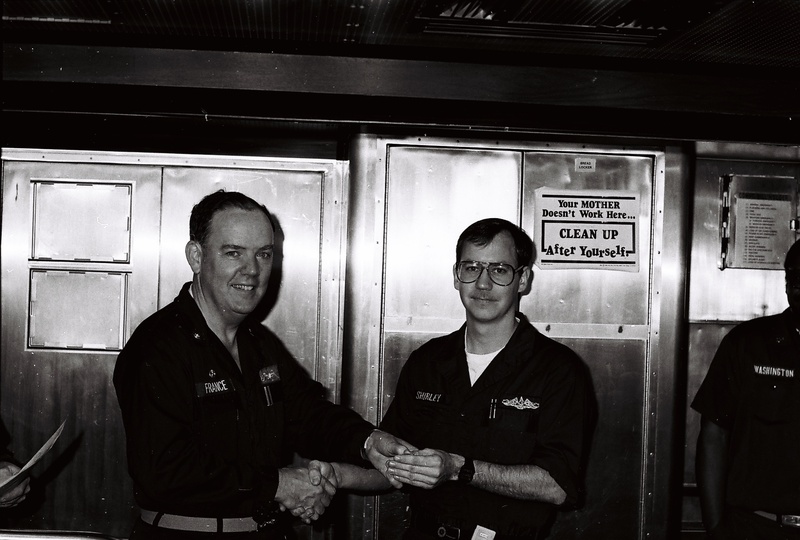 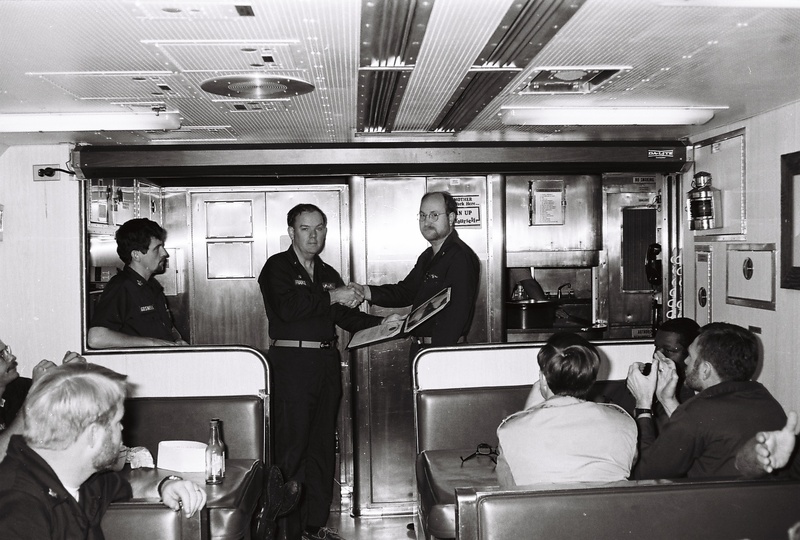 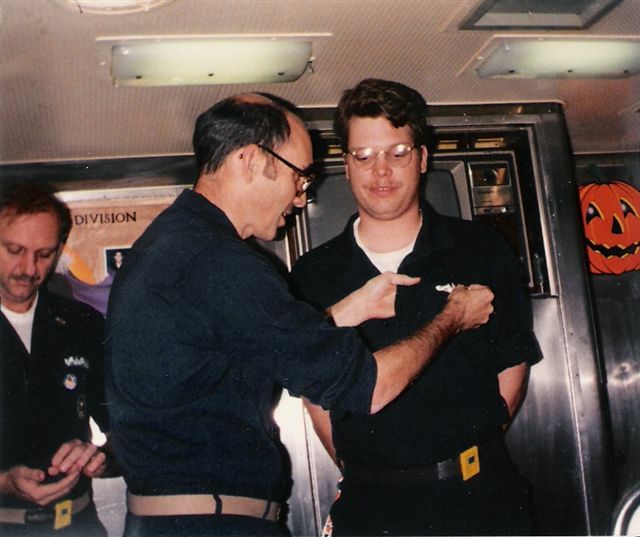 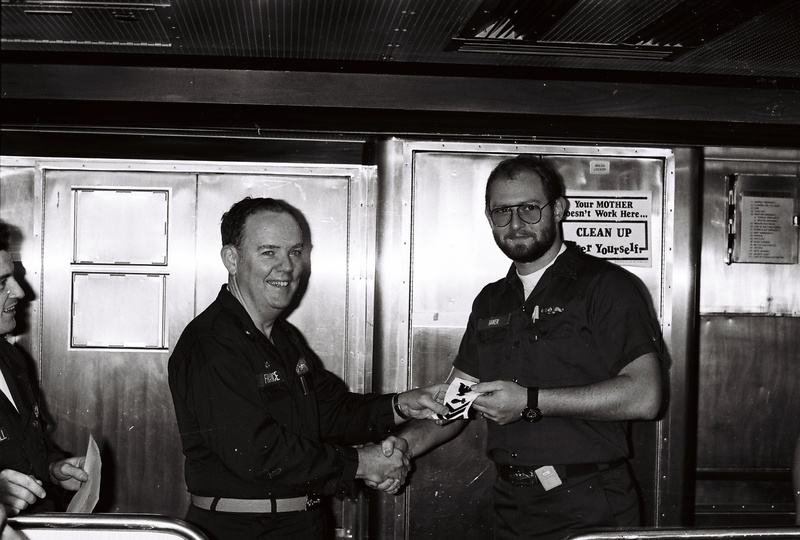 Kirk Parnell receiving his "Shipyard Dauphins". 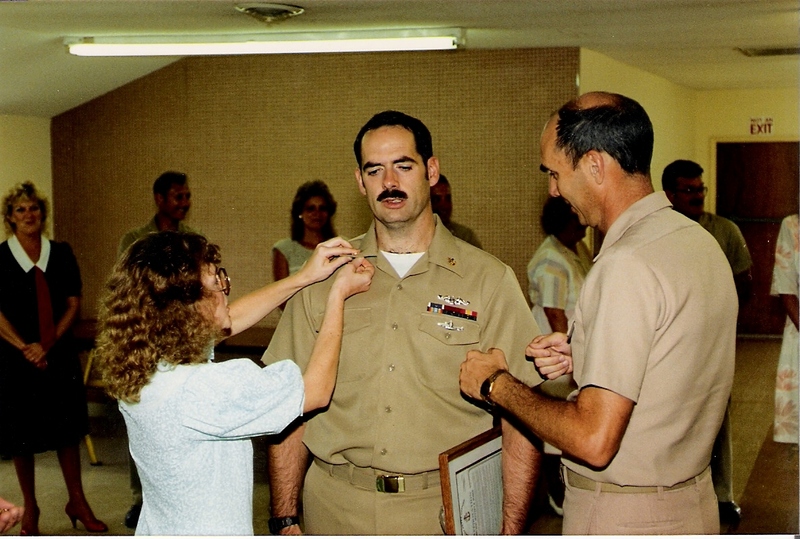 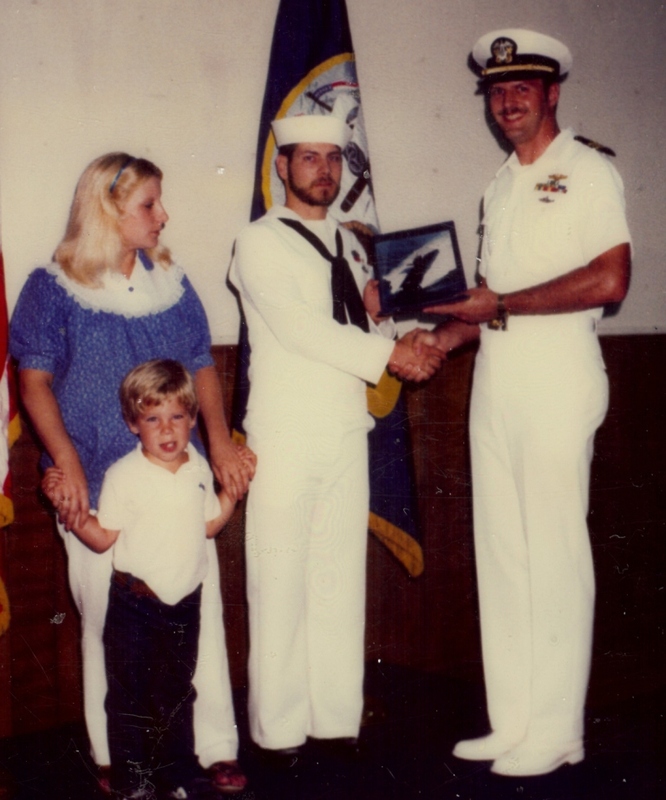 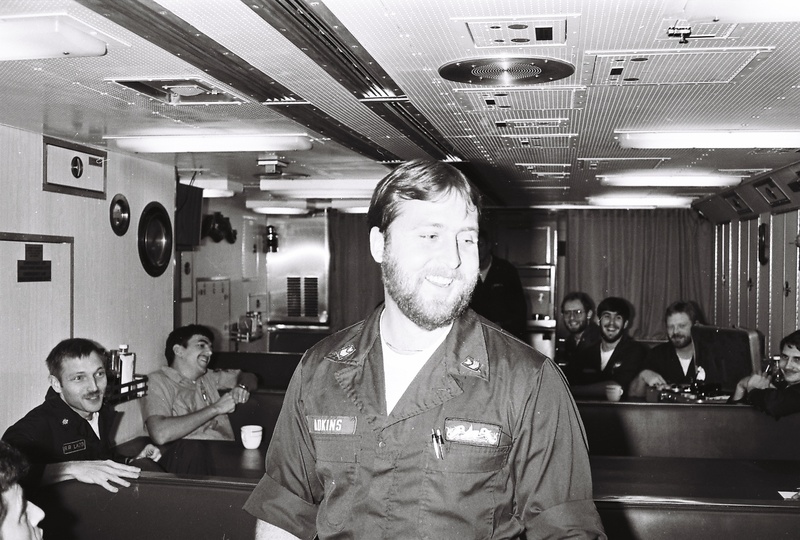 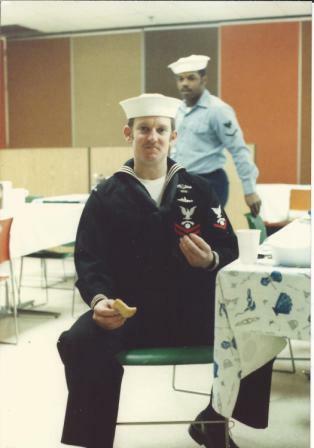 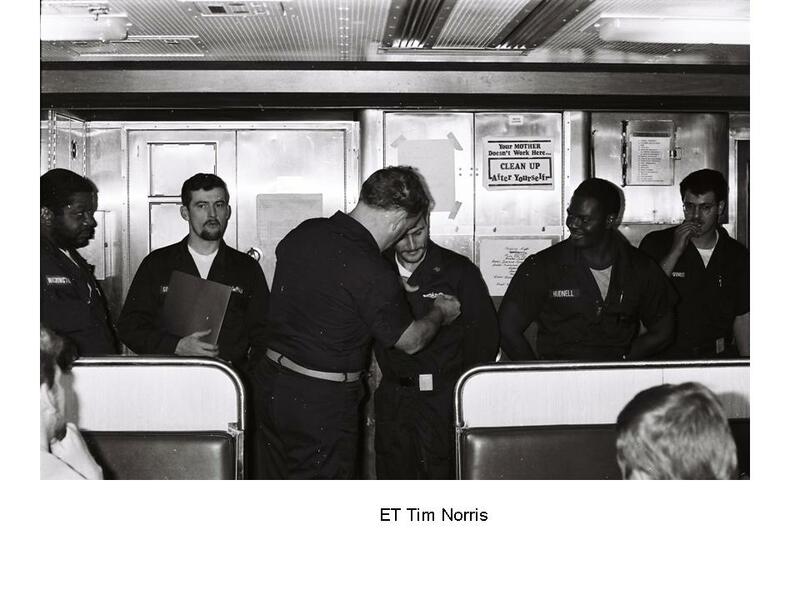 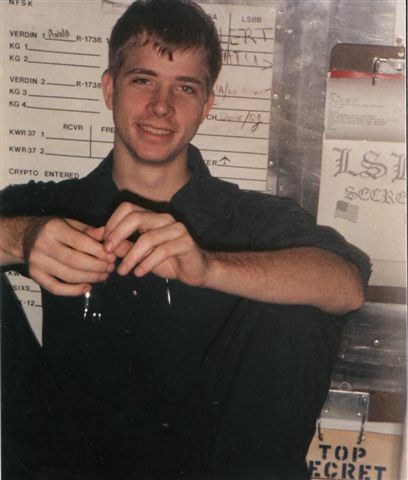 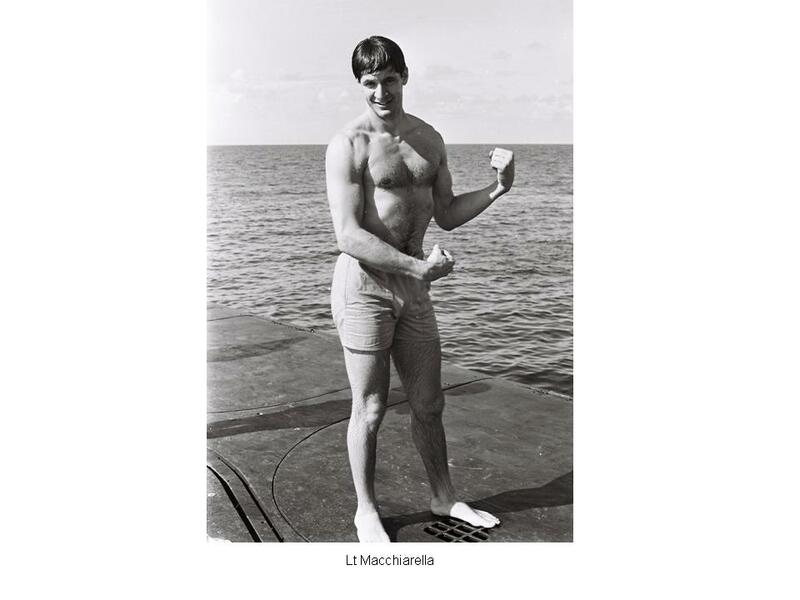 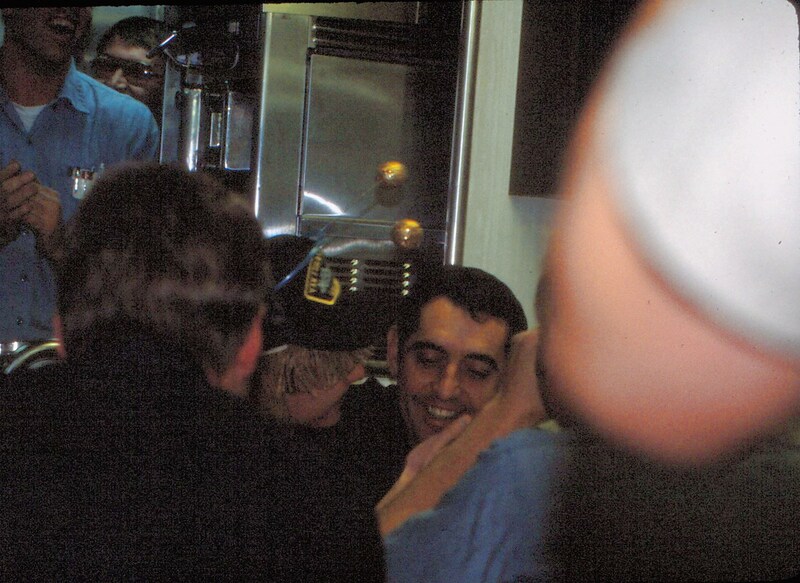 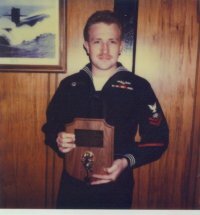 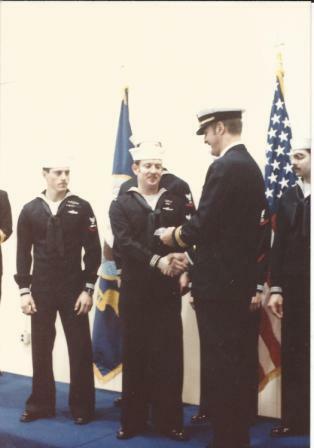 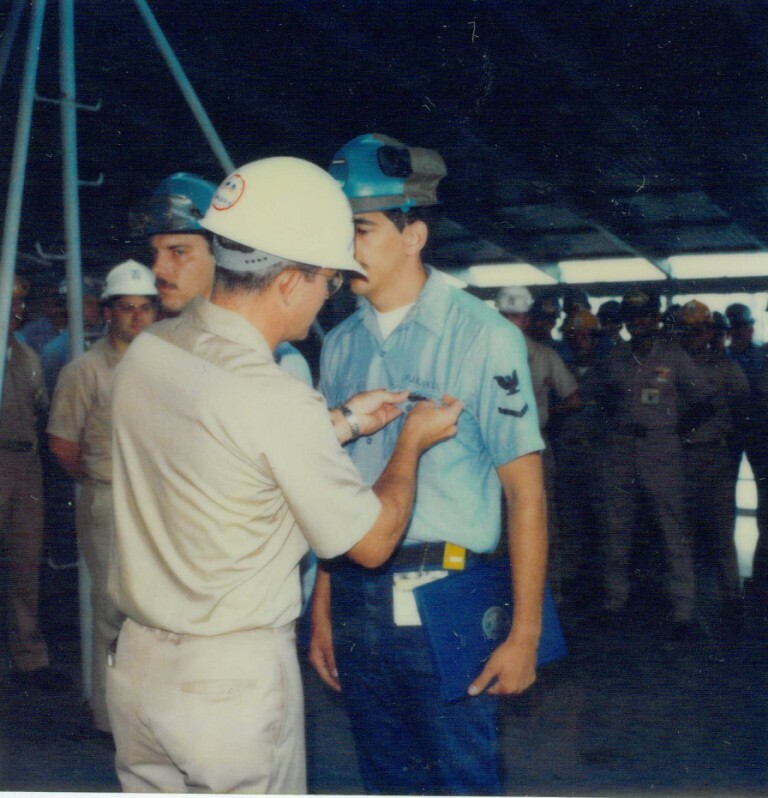 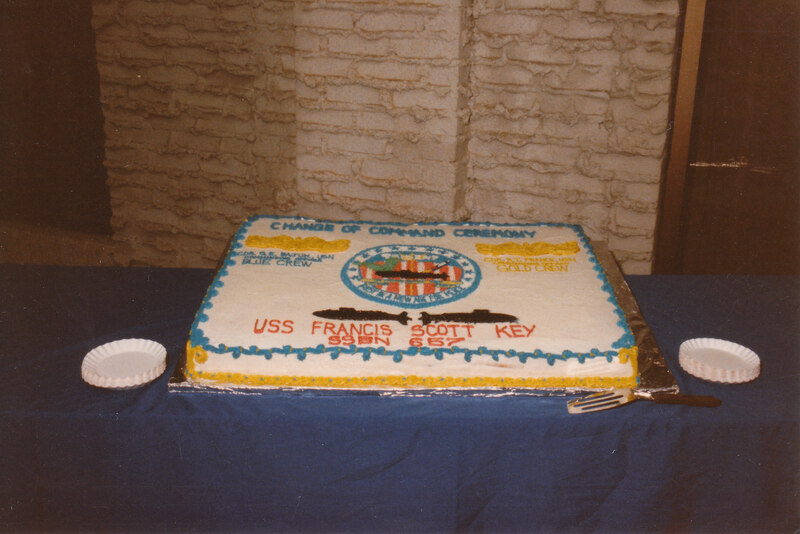 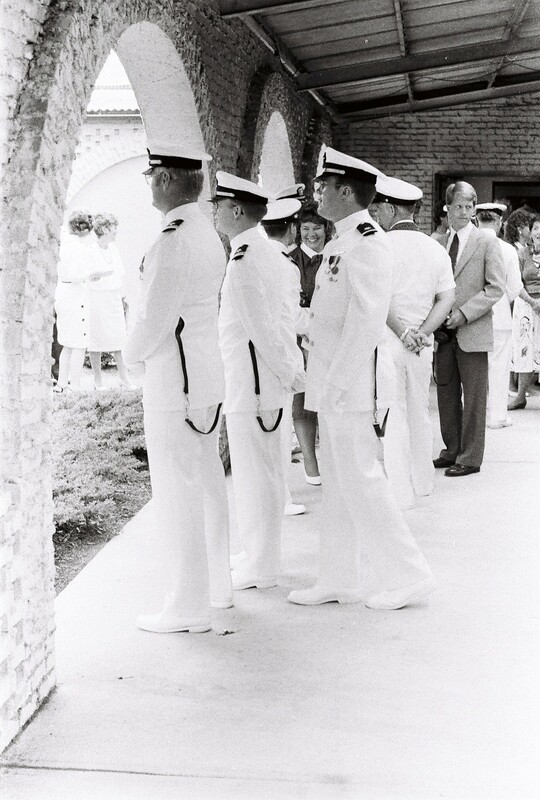 This was January 1985, when Kirk received his 3rd class chevron. 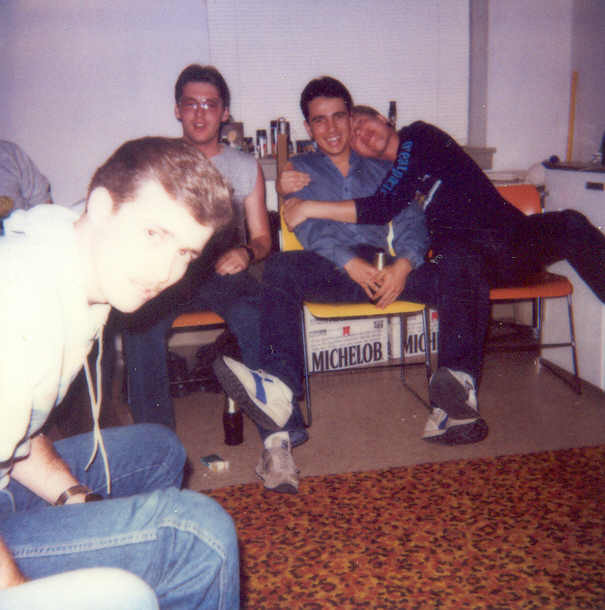 The only person in the picture that I remember is the guy behind me, wearing glasses, I think his name was Cato. 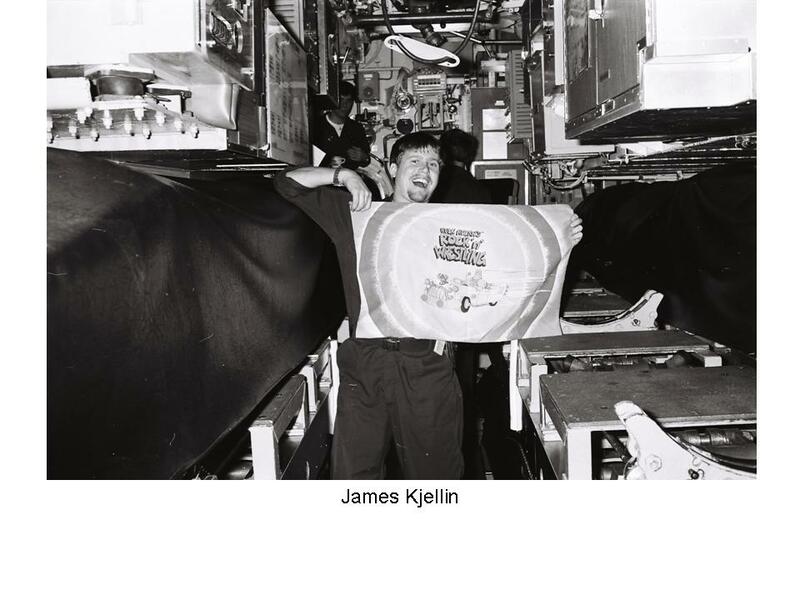 Chris Kajellin, brother to James, was always clowning around. 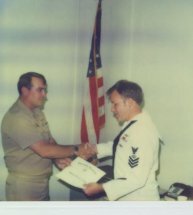 He and I got a Bravo flag and an old Poopie Suit and made a flag that resembled a Clemson flag. 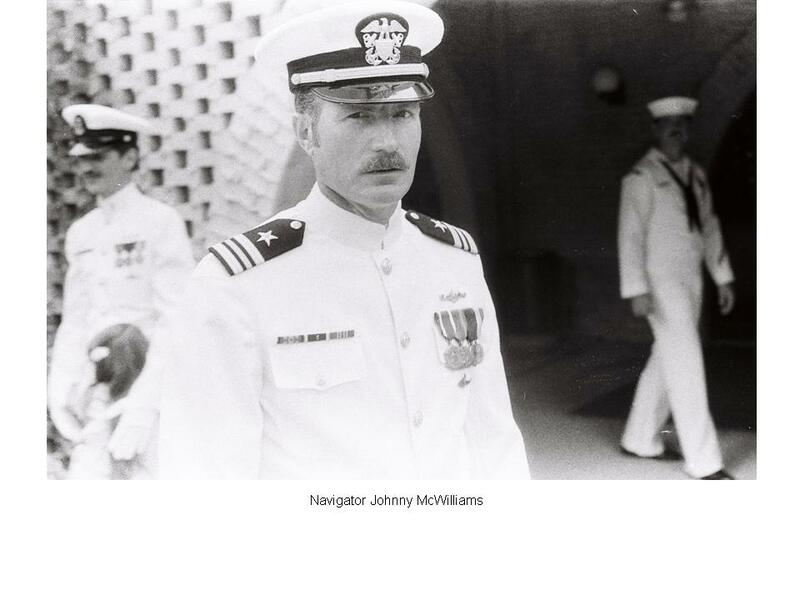 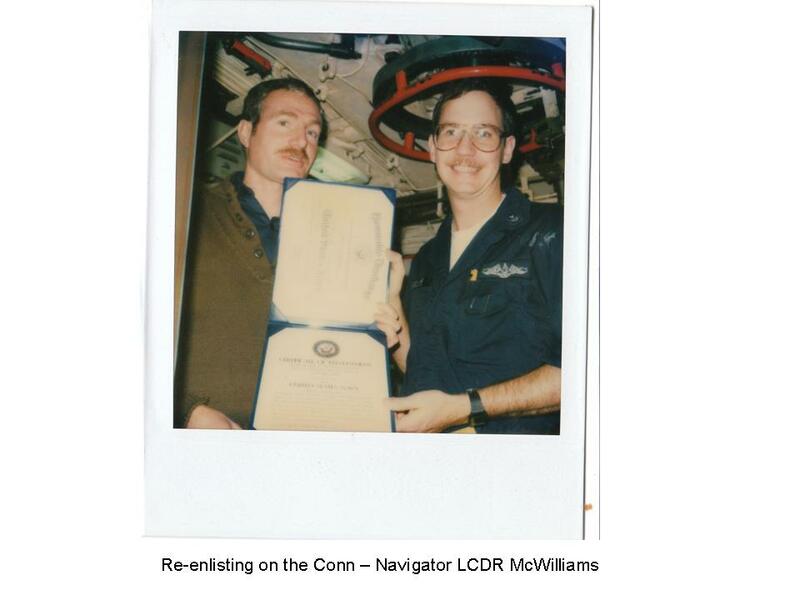 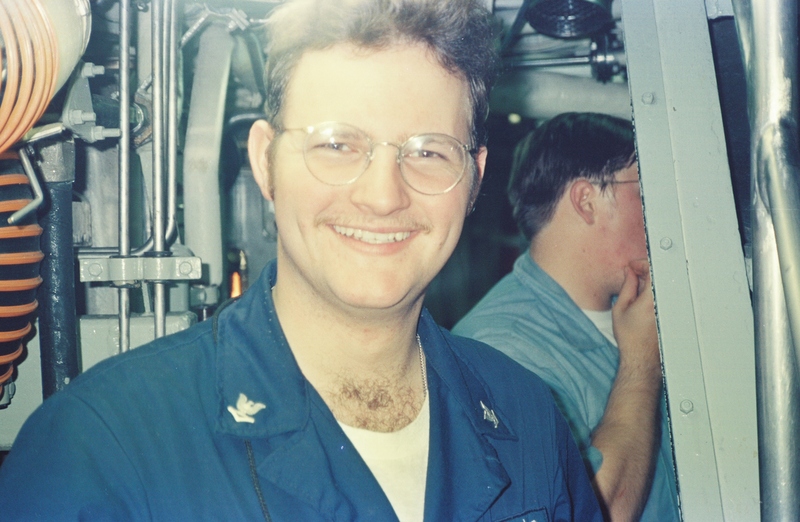 Our Navigator (Cmd.McWilliams) graduated from Auburn and hated Clemson. 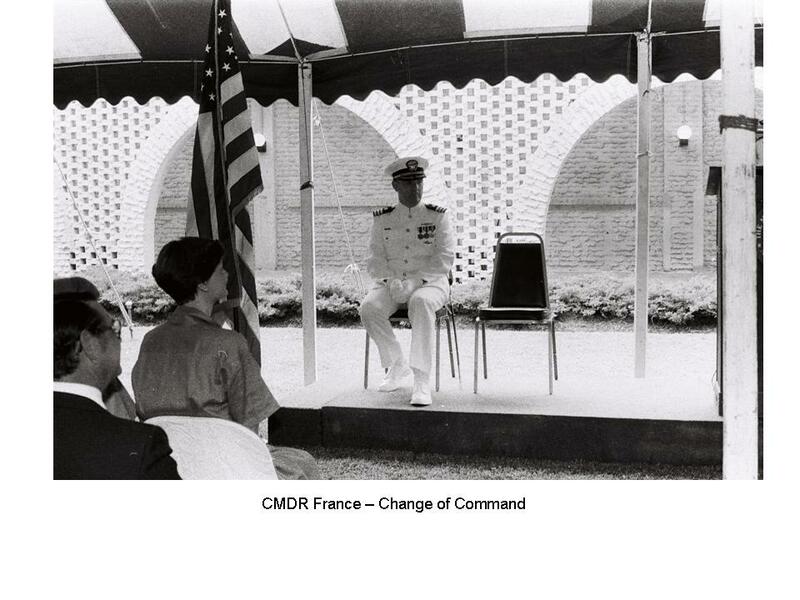 So we made this flag and hung it in the Ward Room on his birthday. 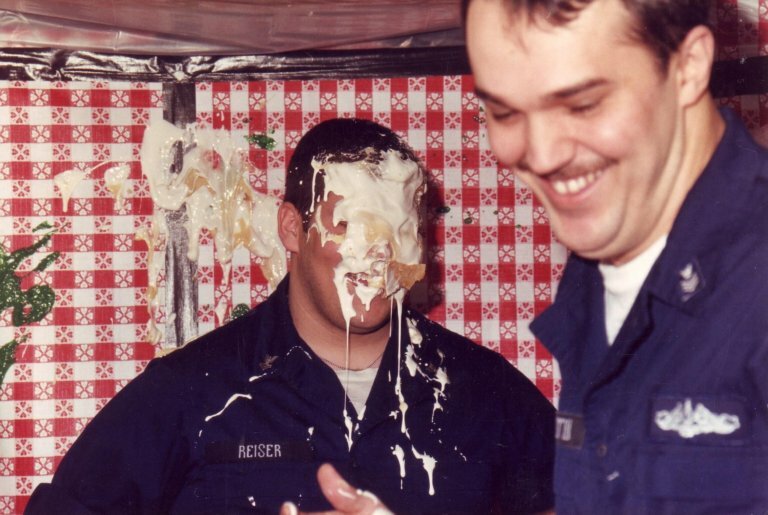 He was mildly amused. 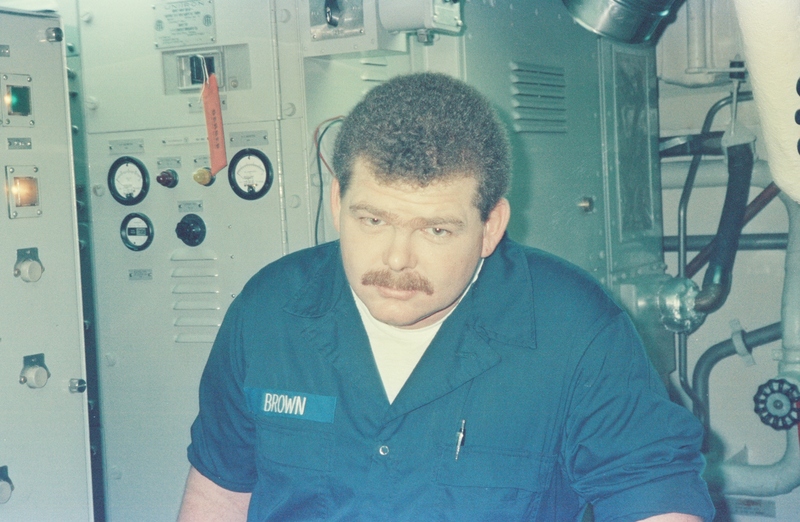 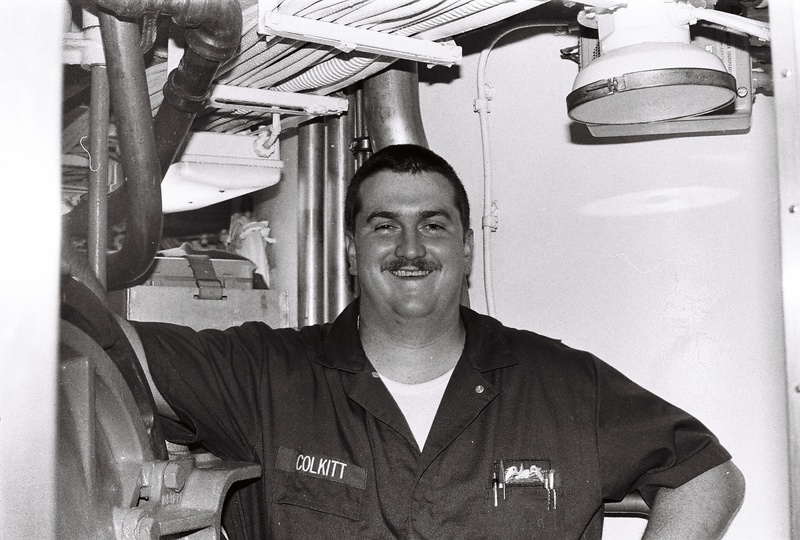 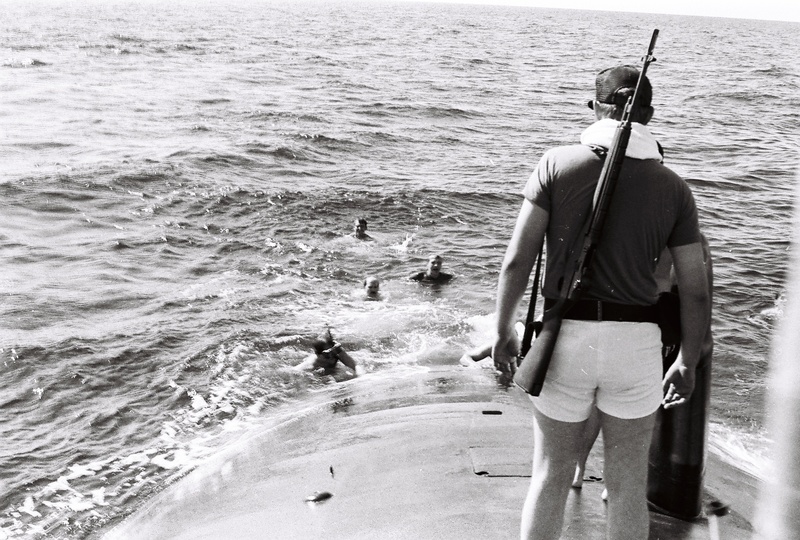 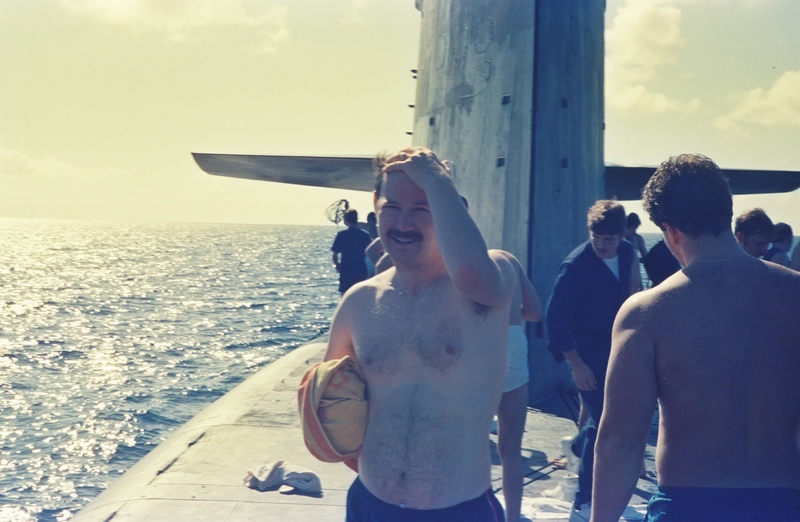 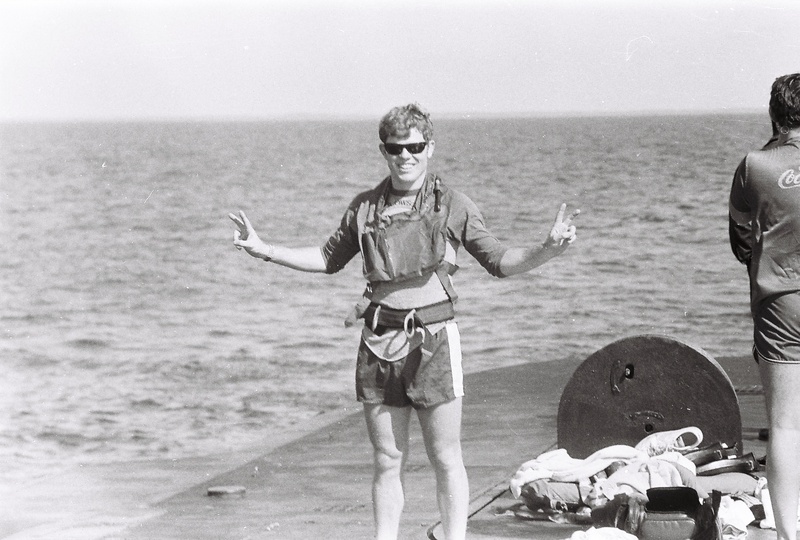 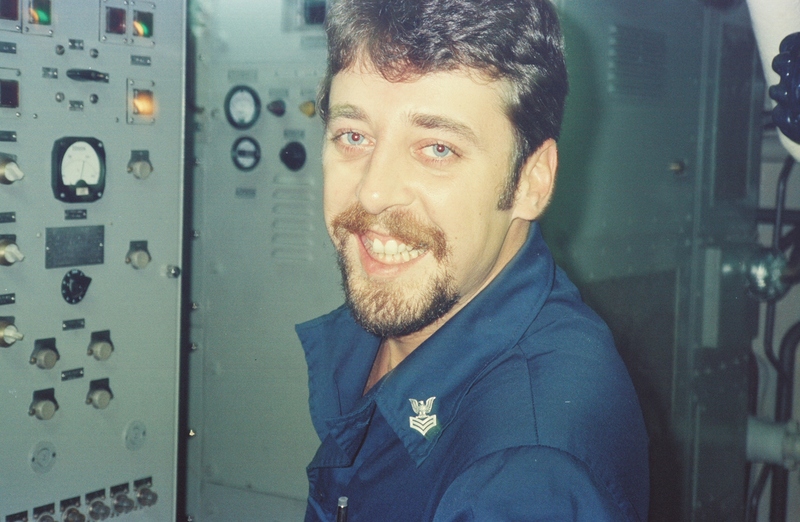 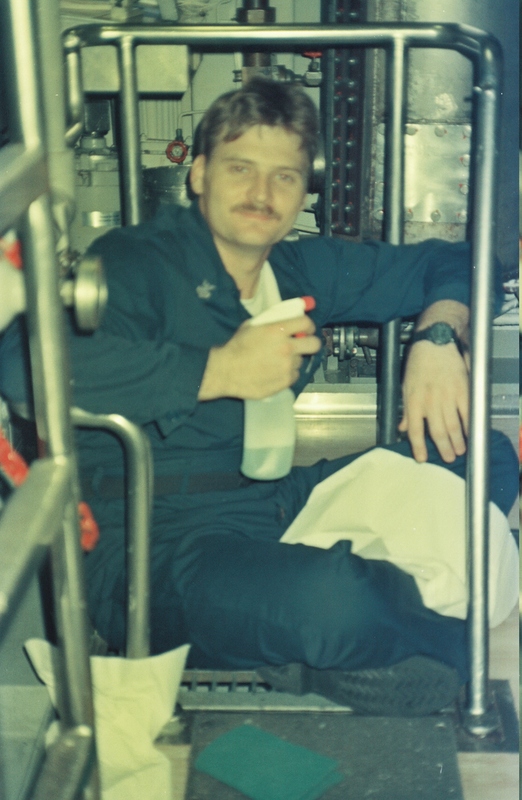 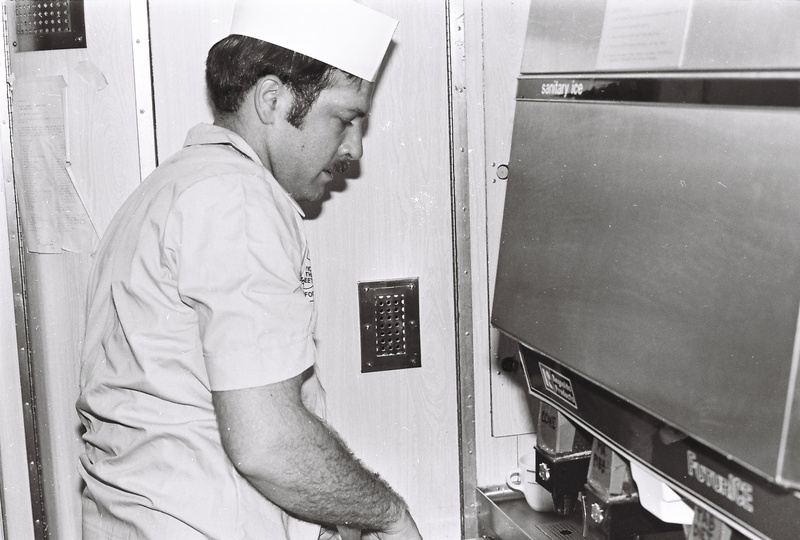 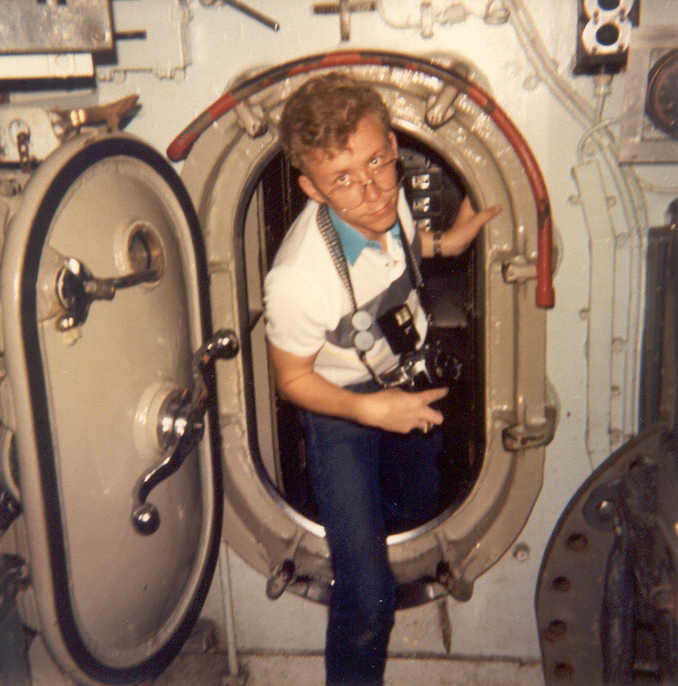 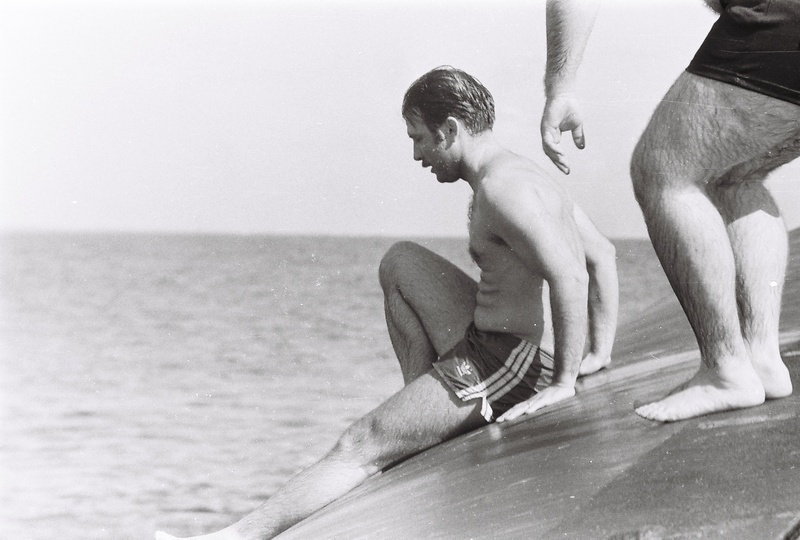 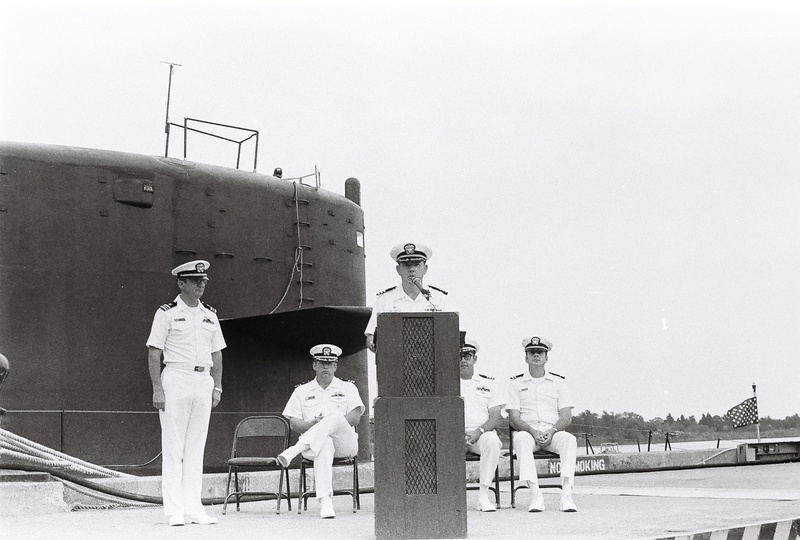 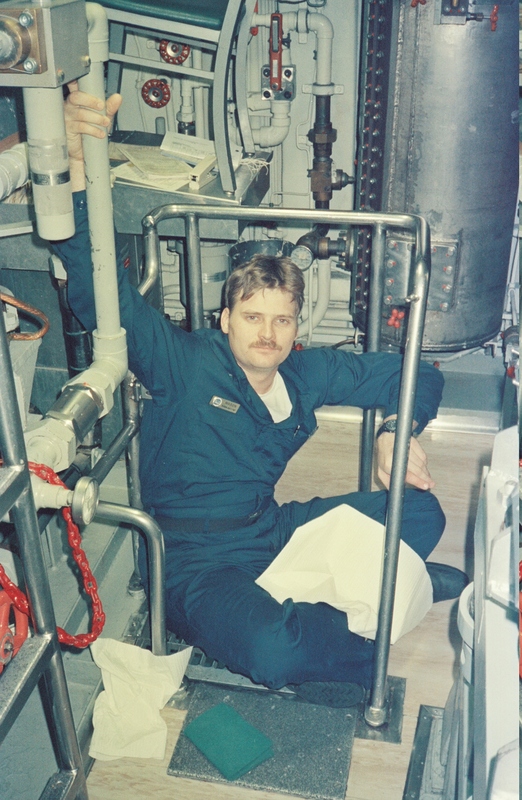 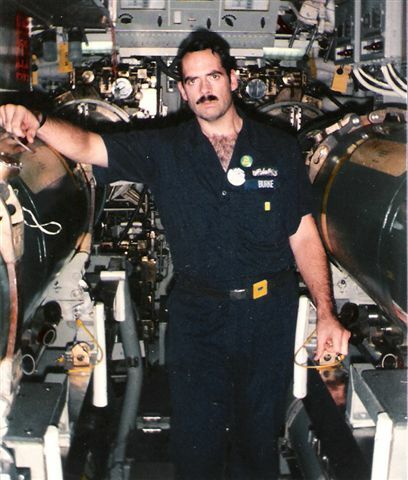 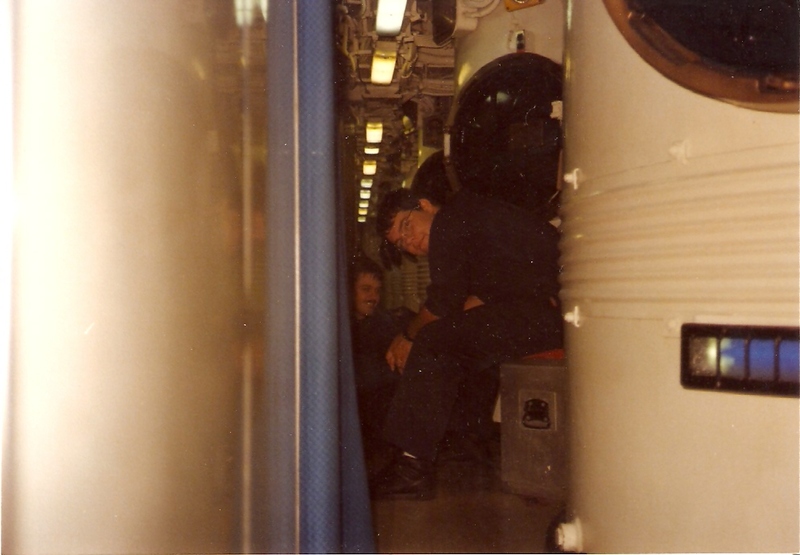 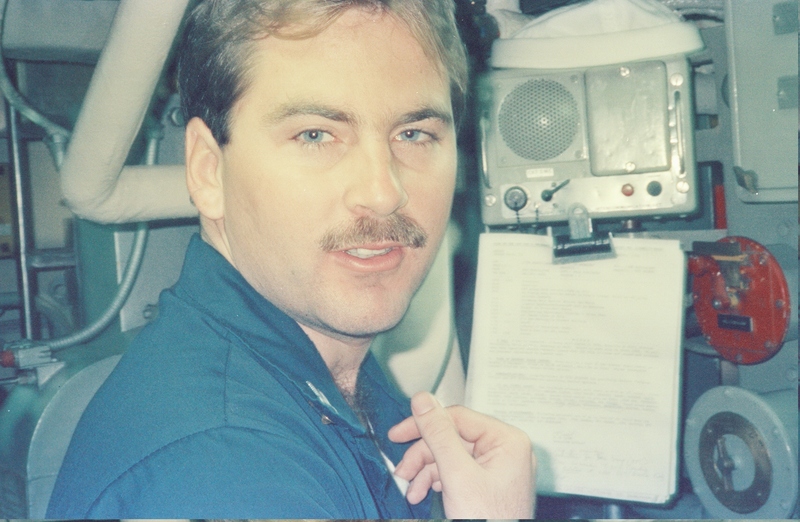 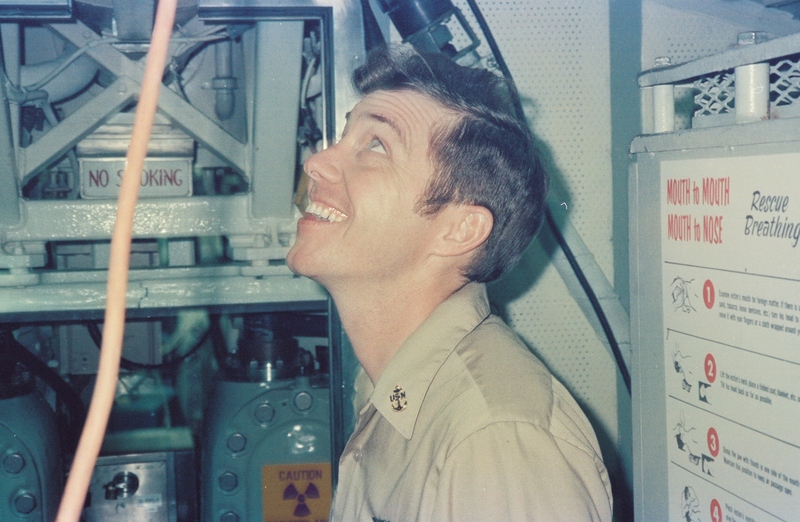 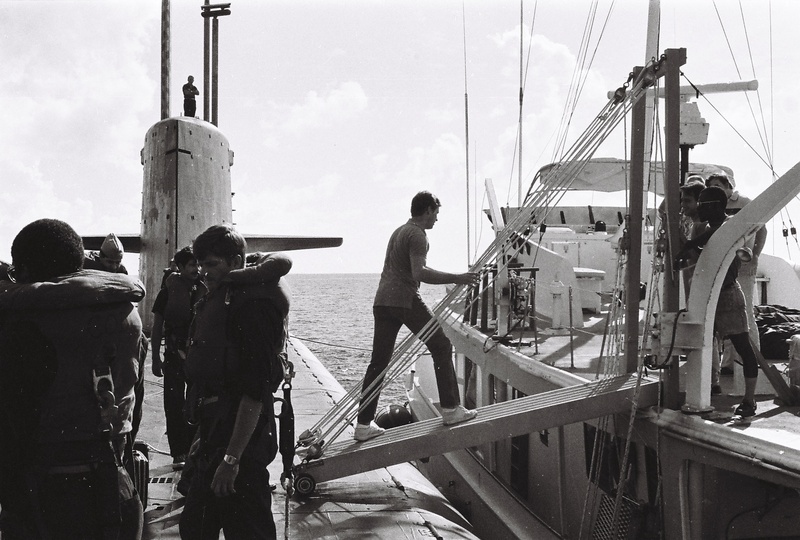 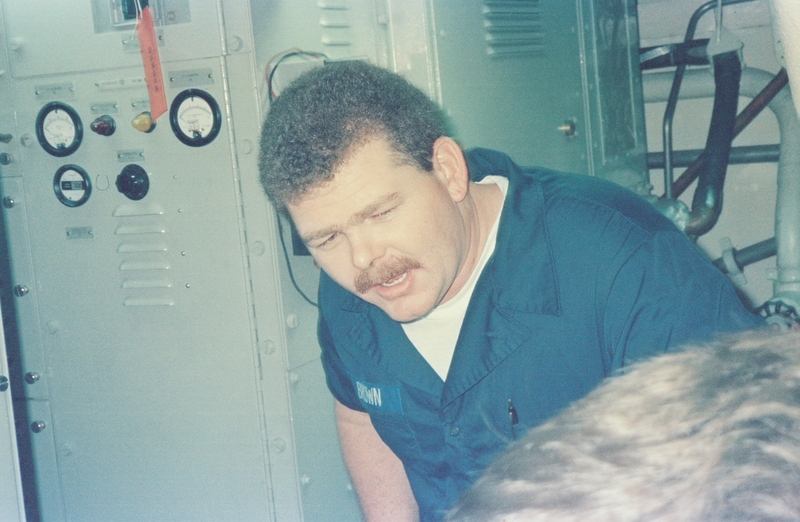 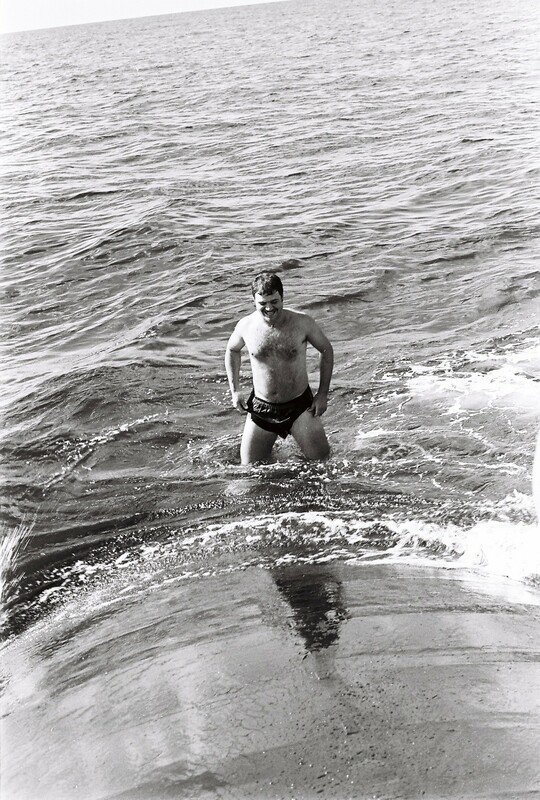 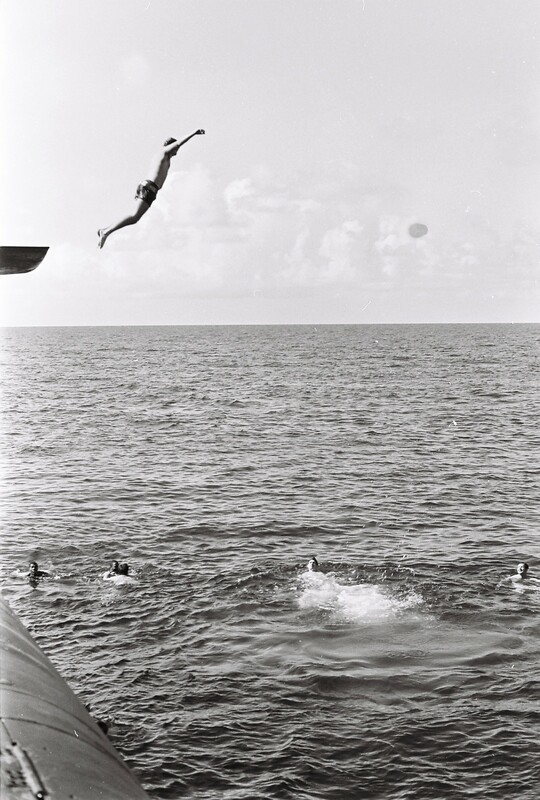 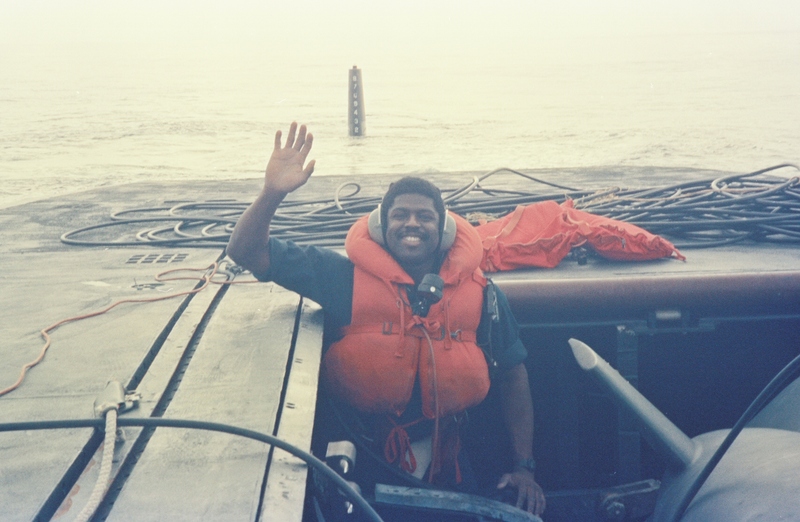 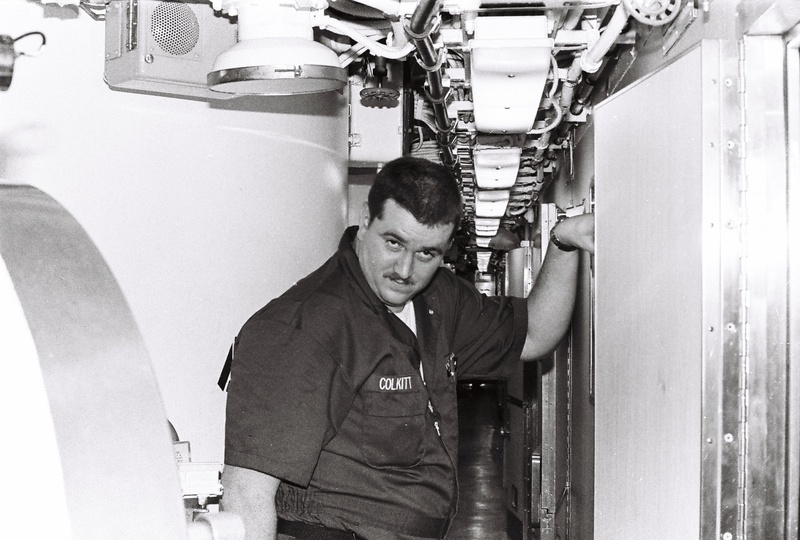 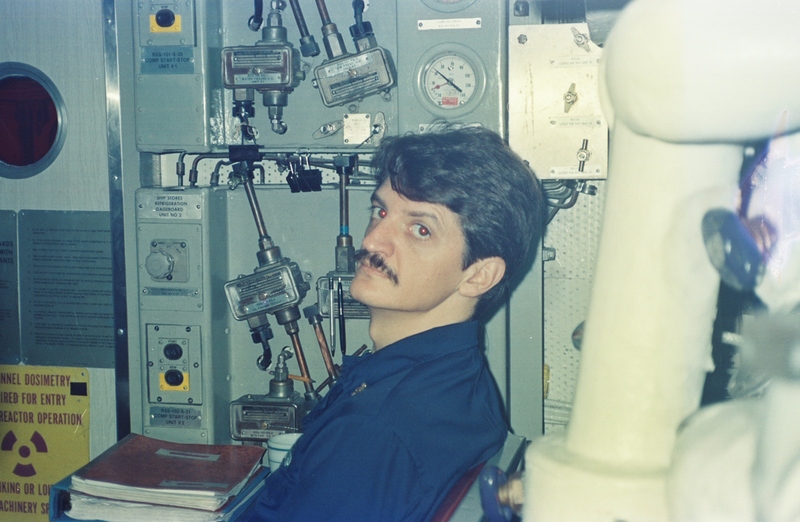 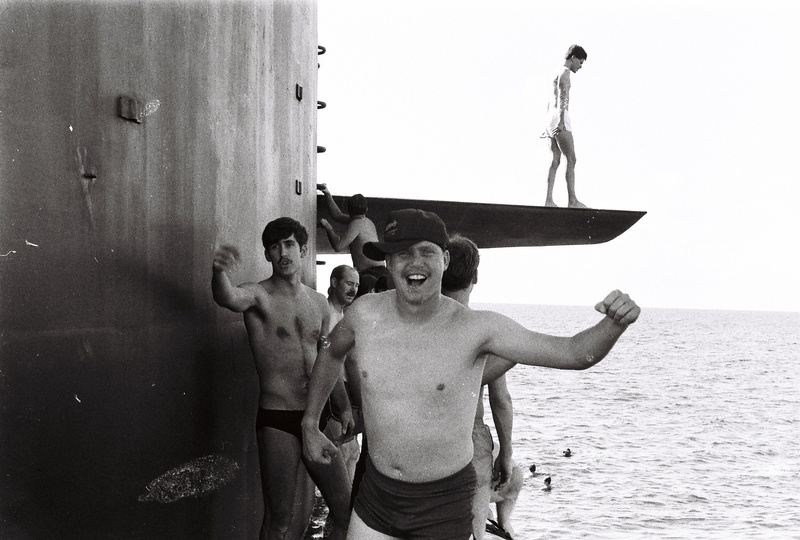 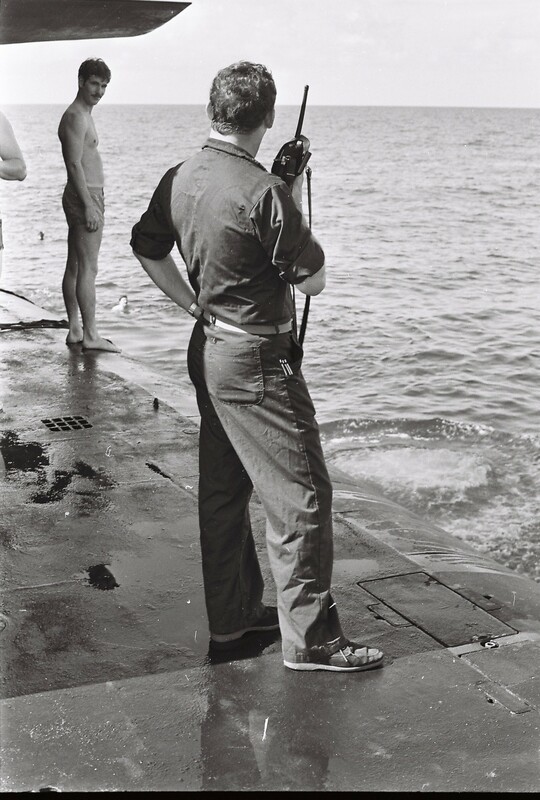 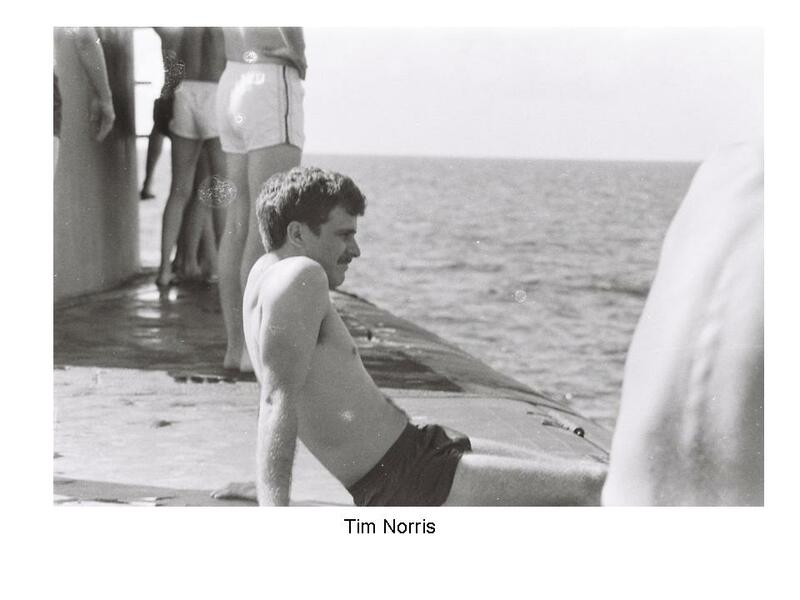 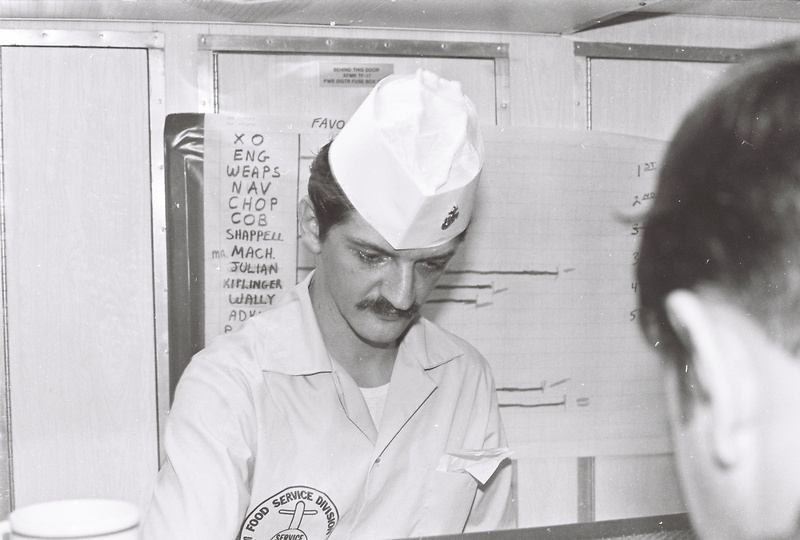 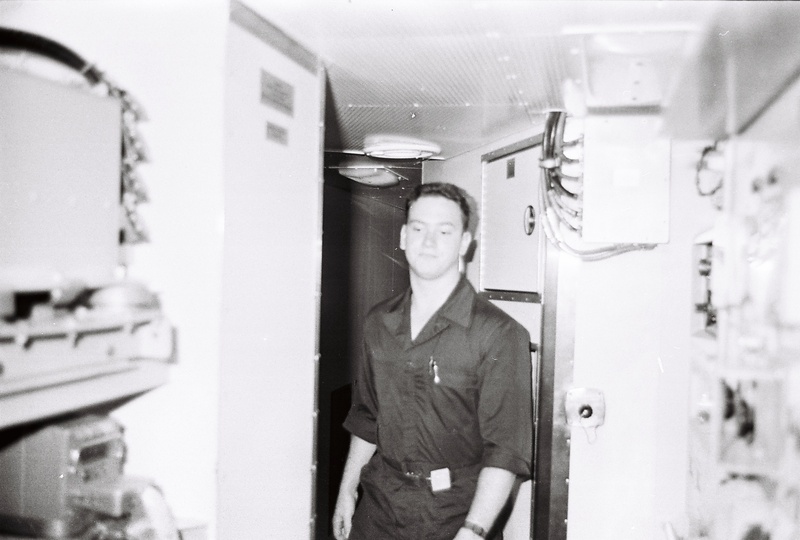 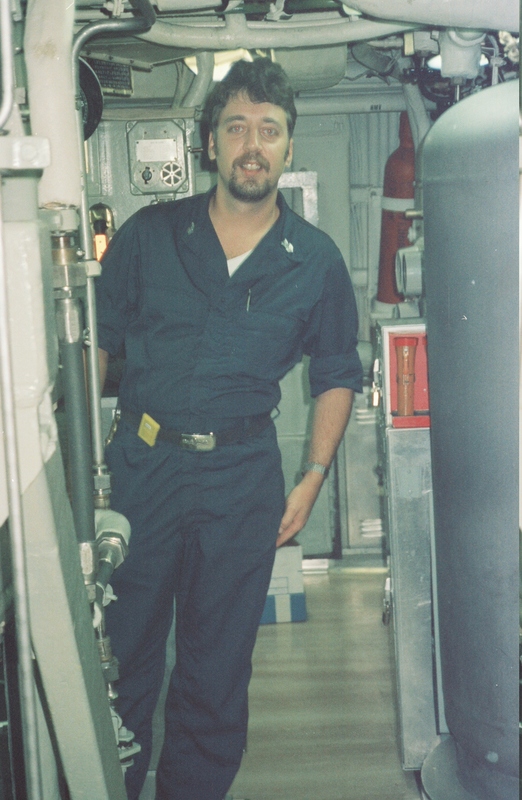 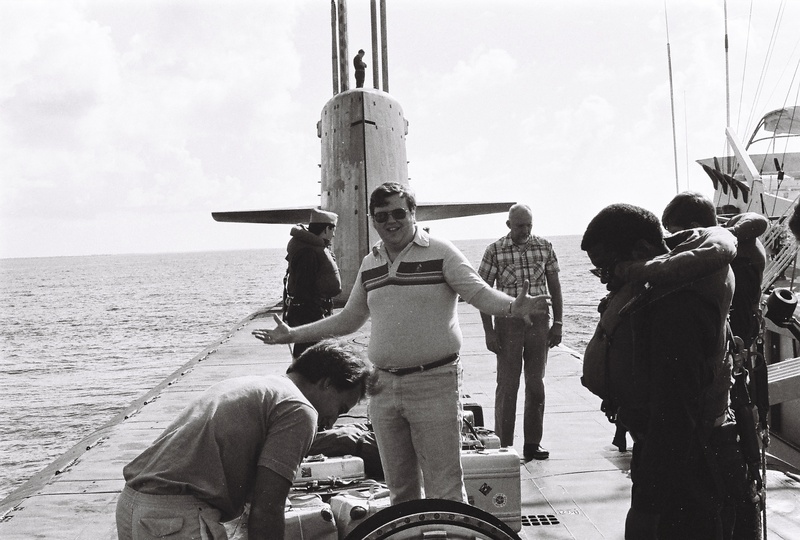 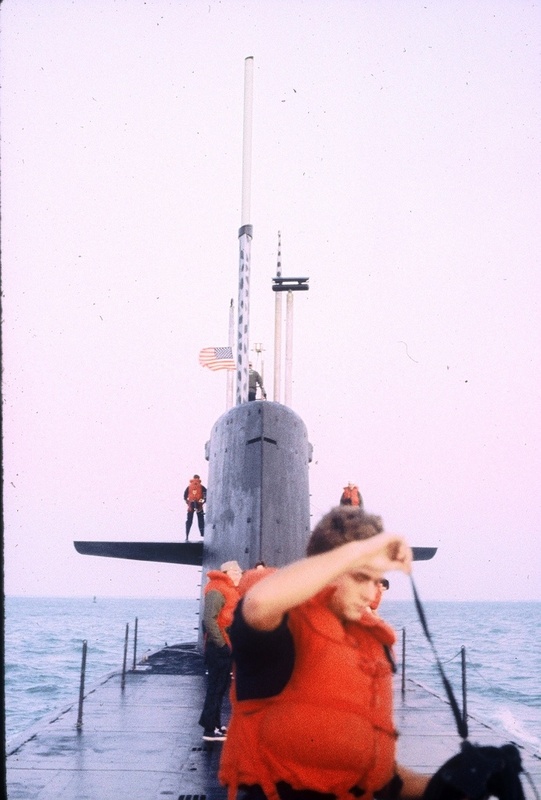 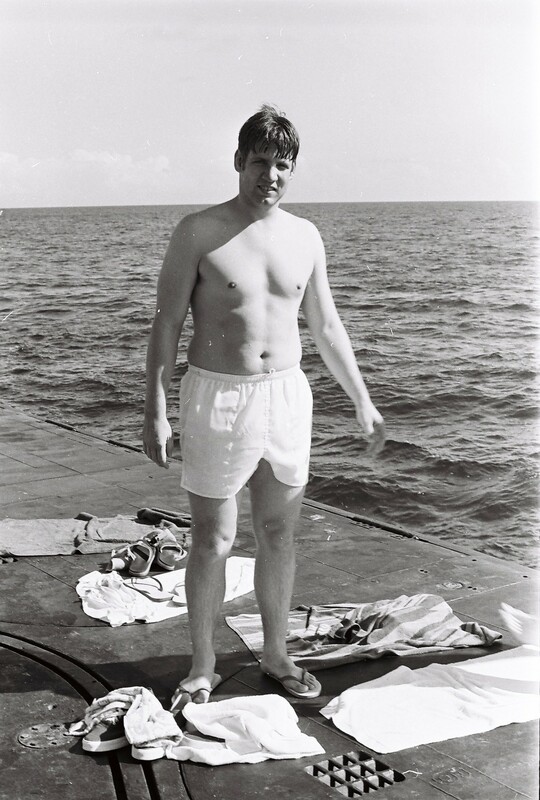 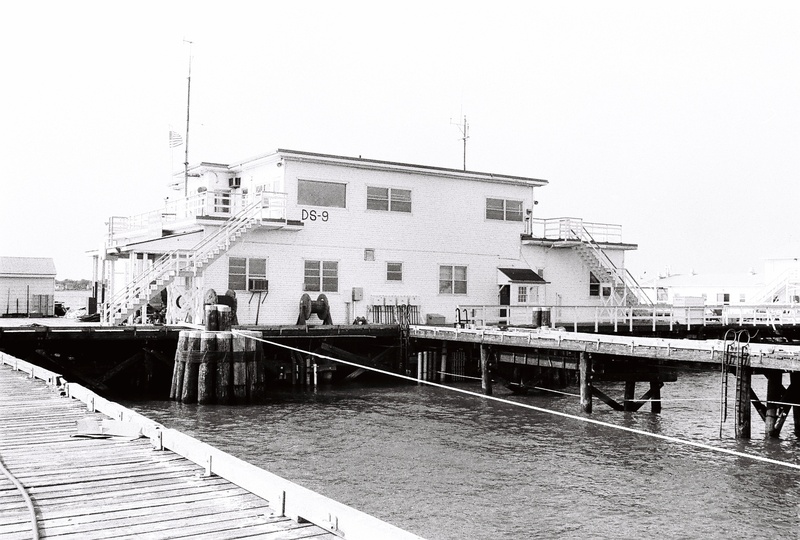 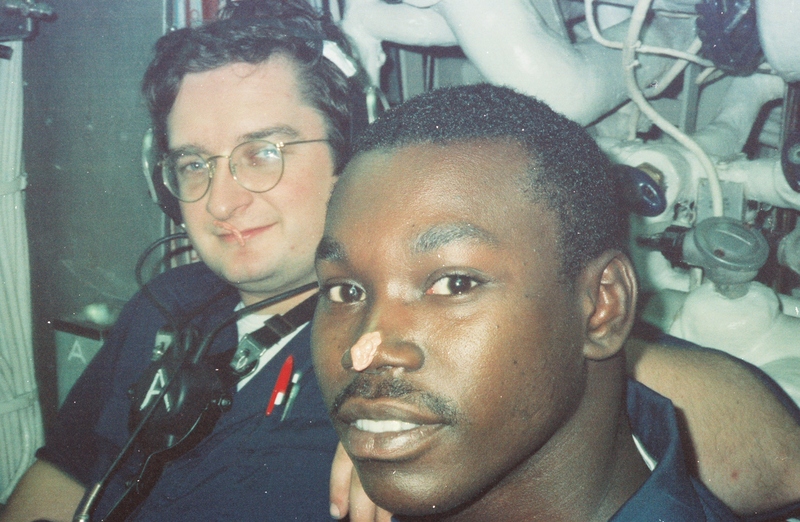 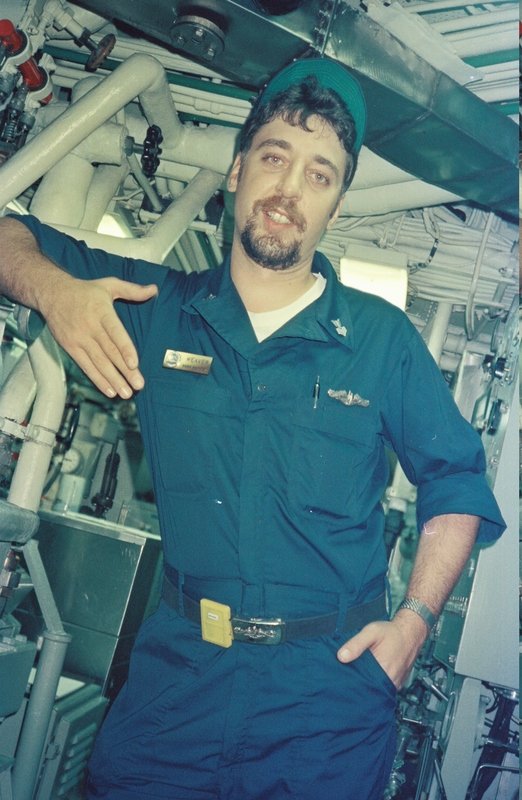 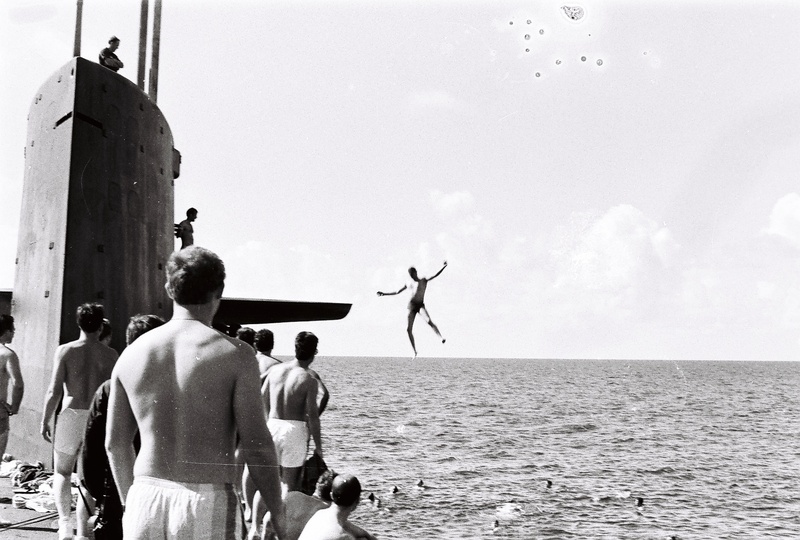 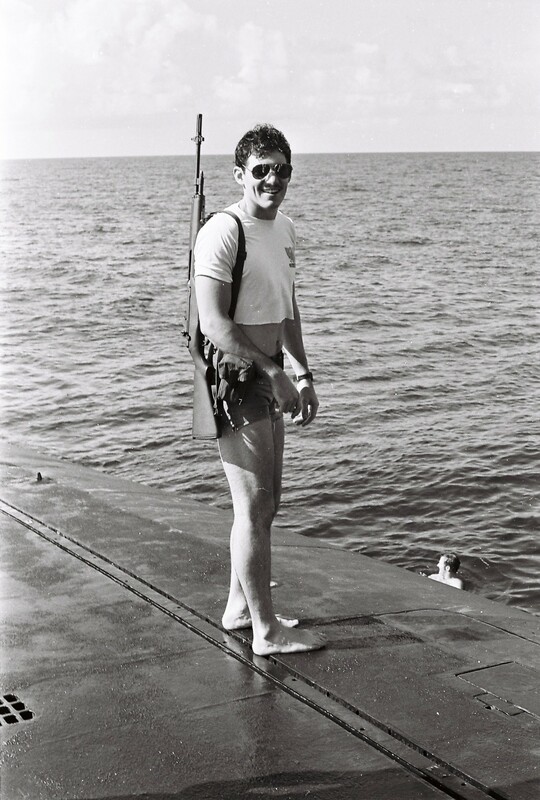 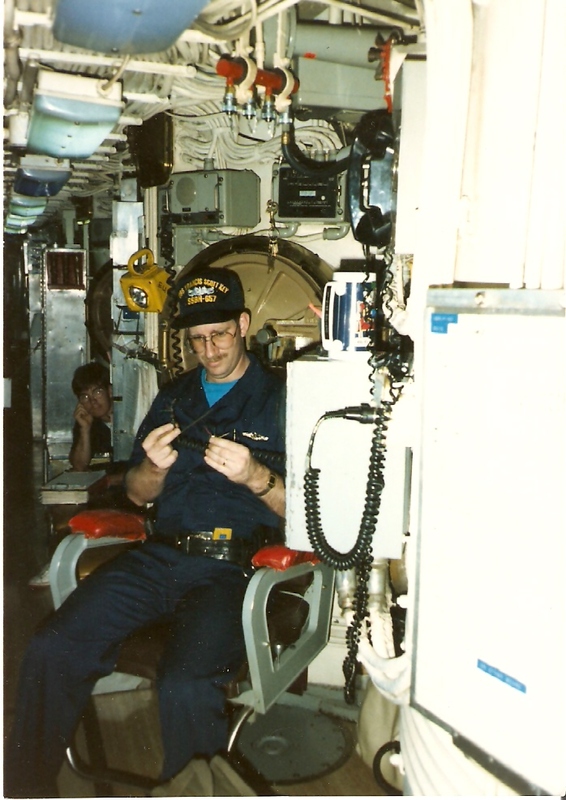 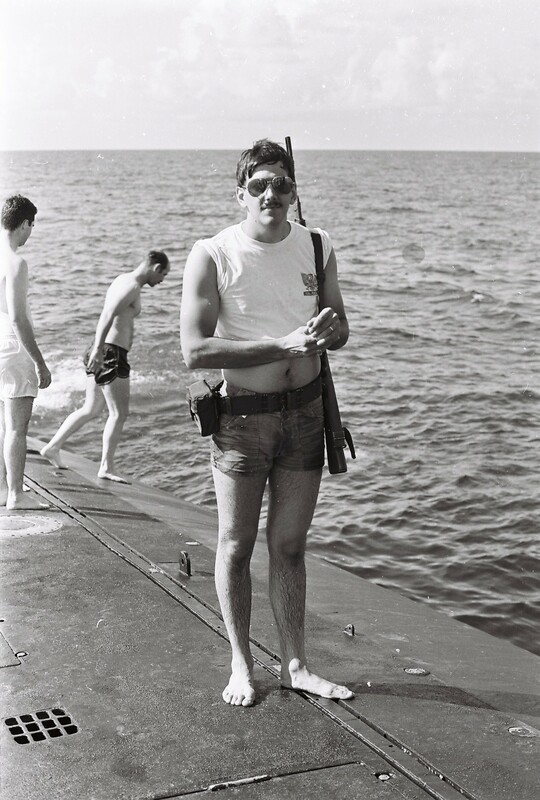 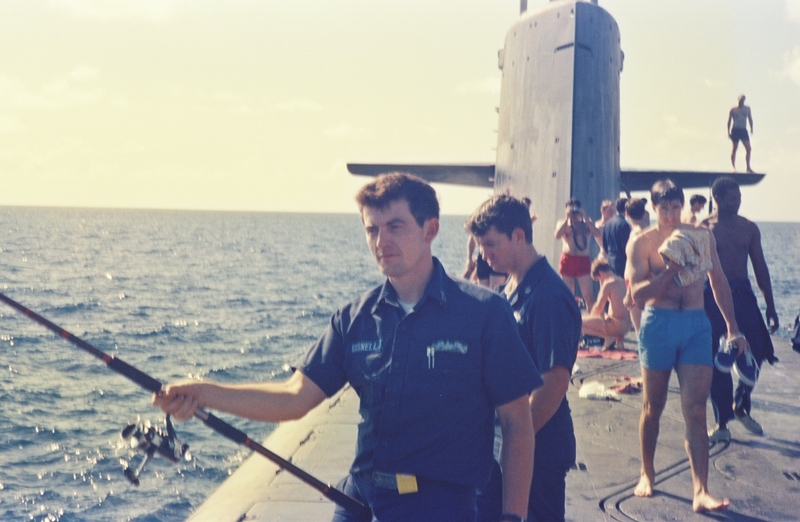 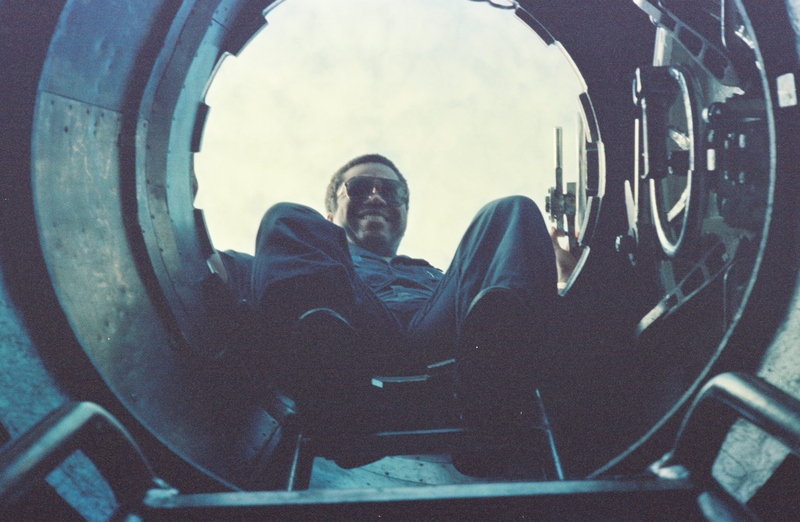 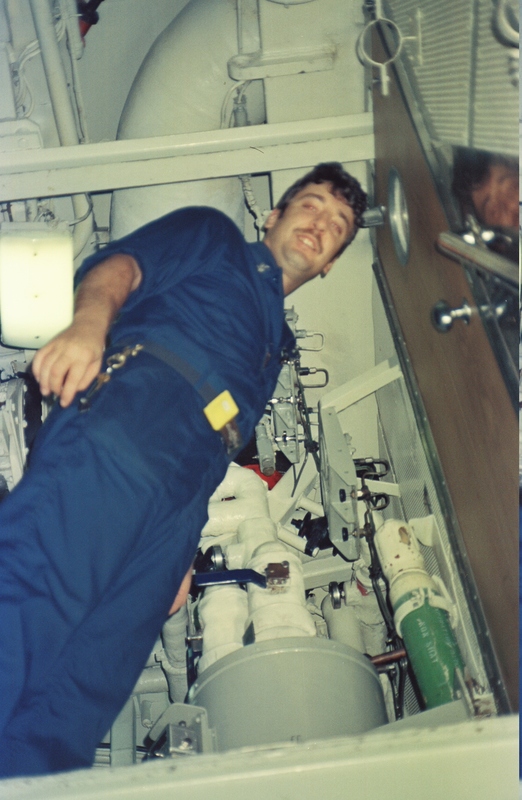 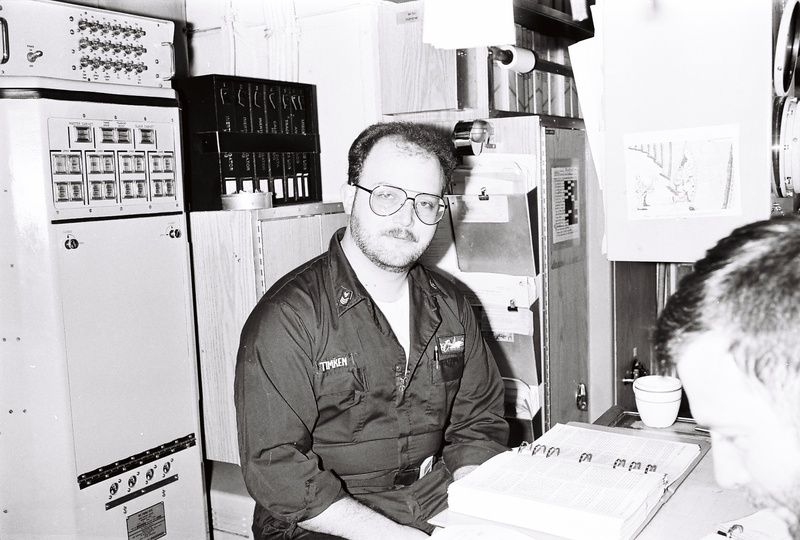 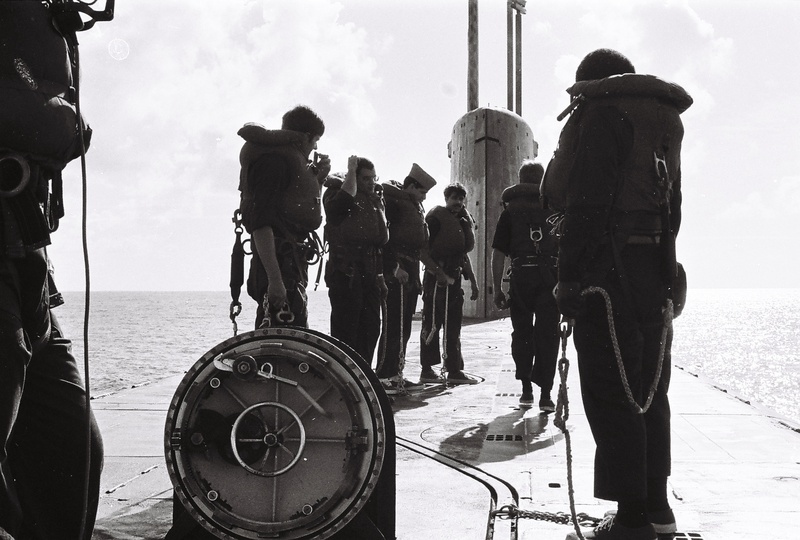 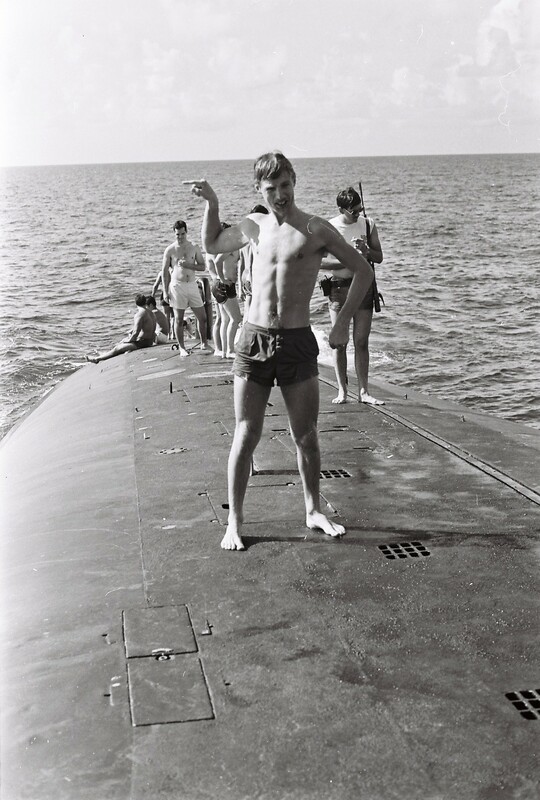 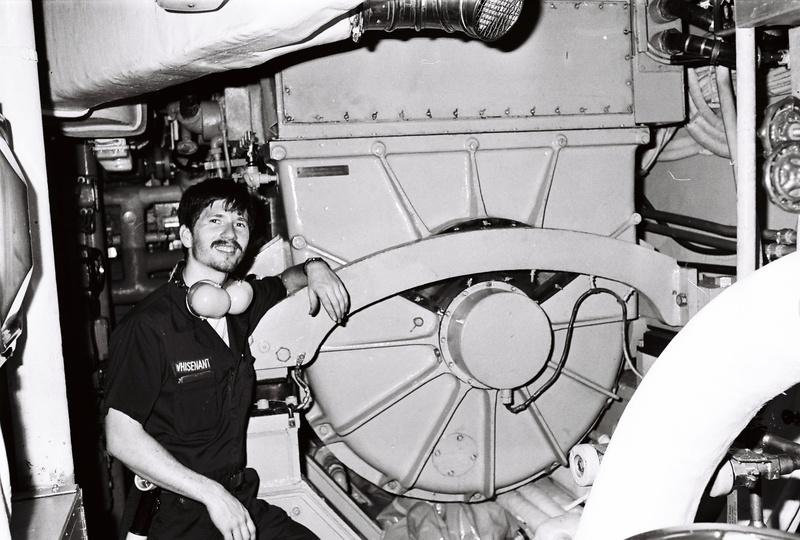 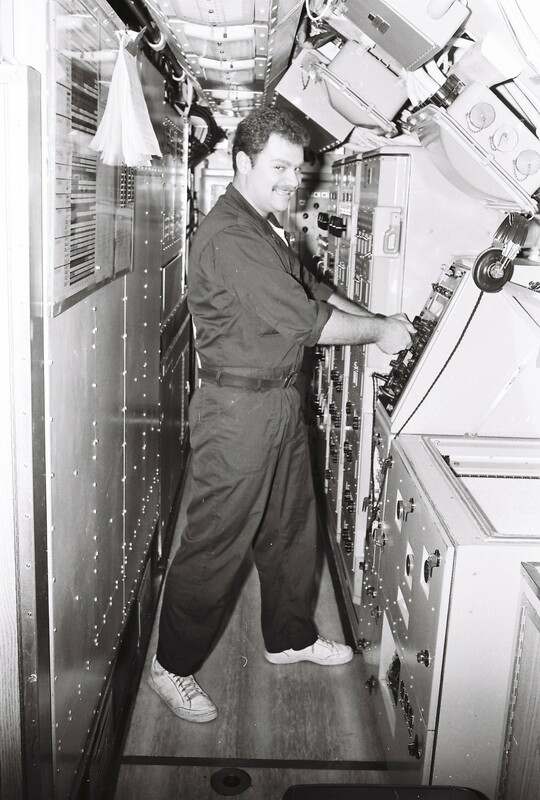 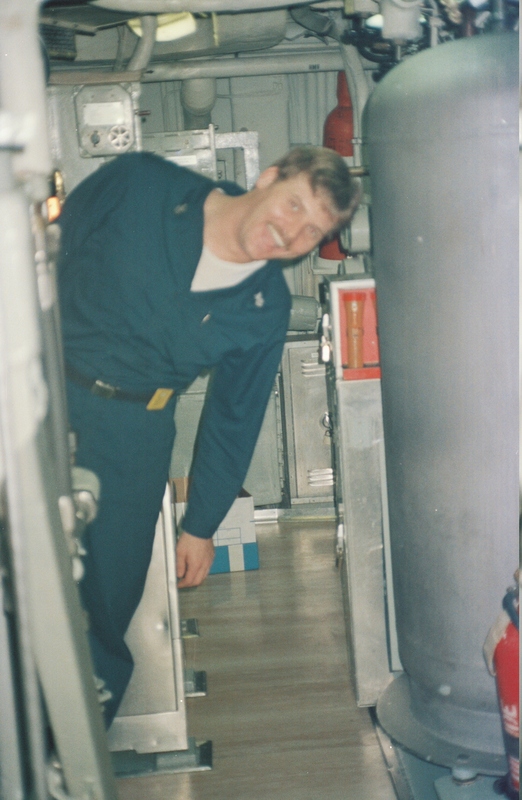 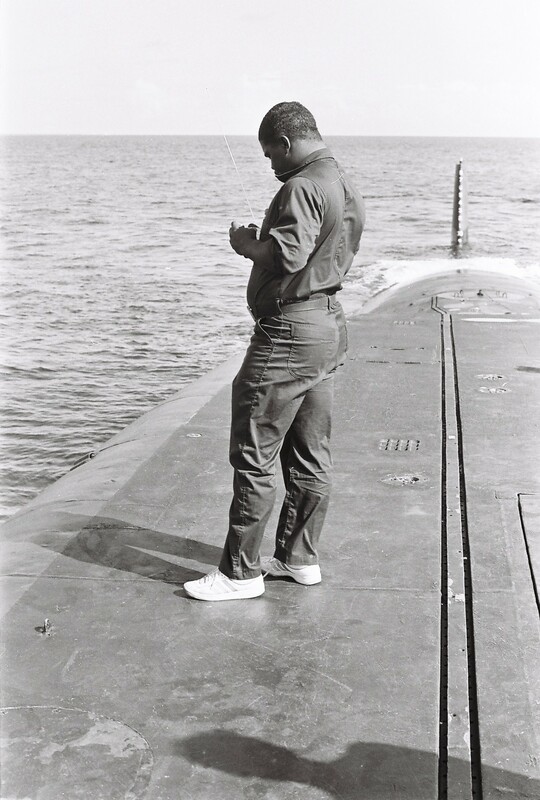 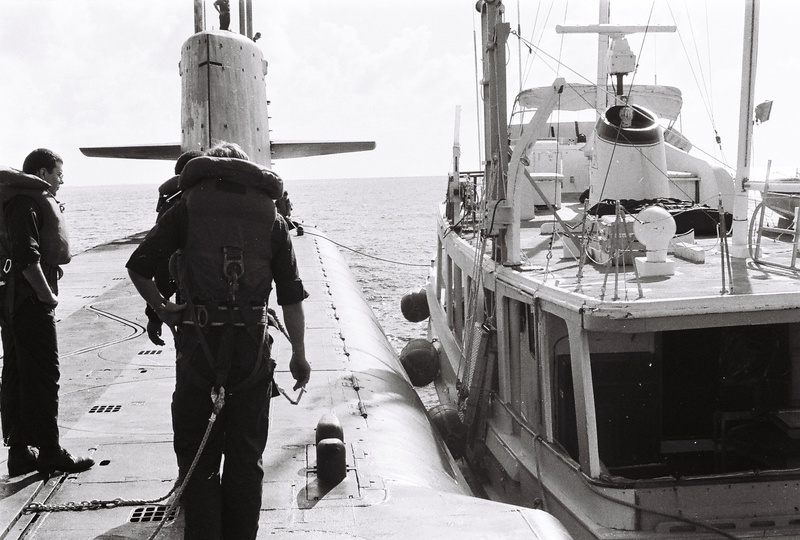 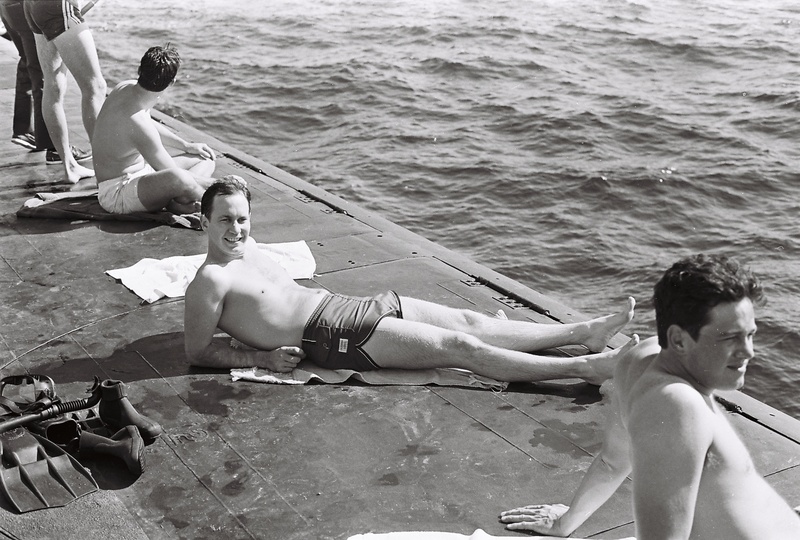 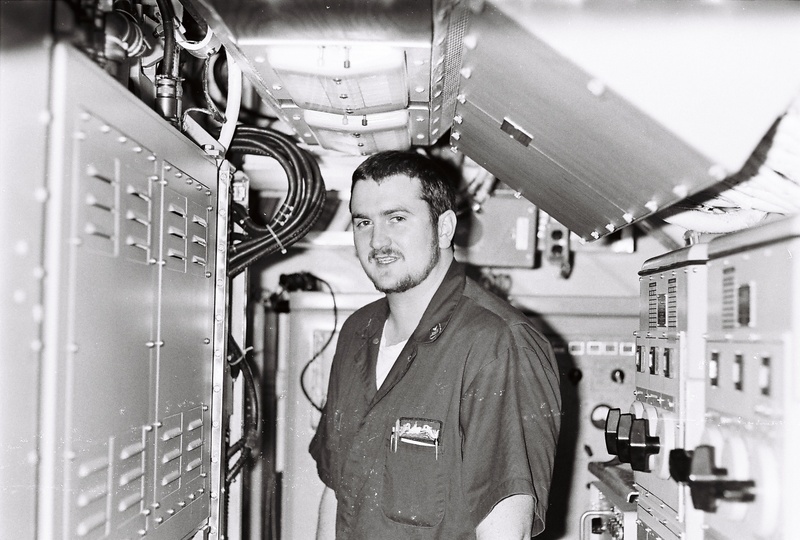 Chief Chris McCool as Diving Officer Of the Watch. 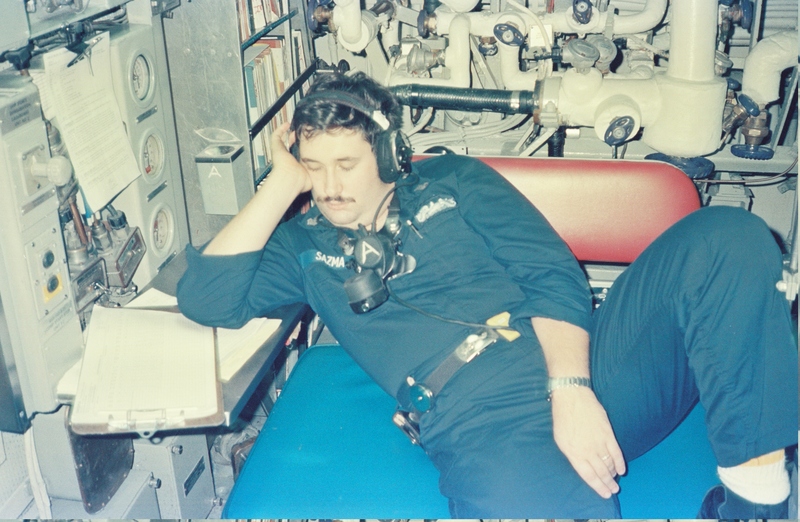 He had been on watch for so long that the Doc brought him an IV (as a joke). 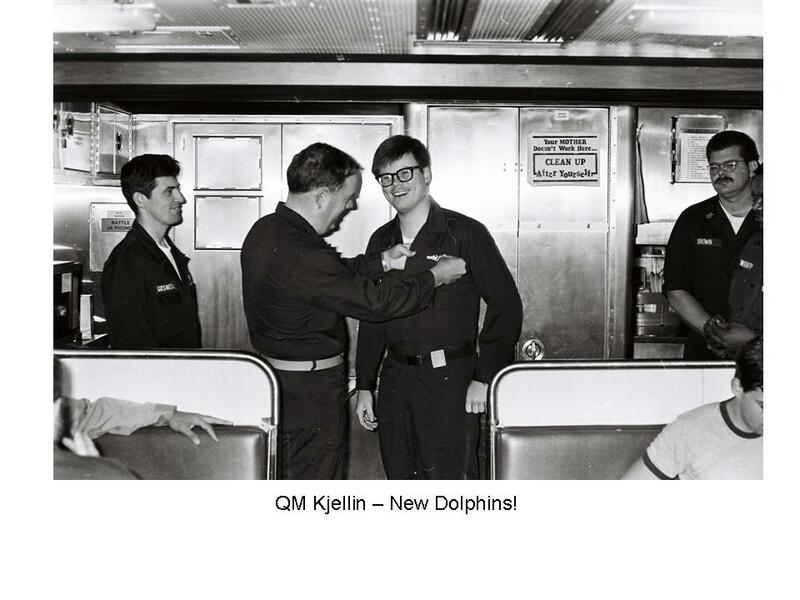 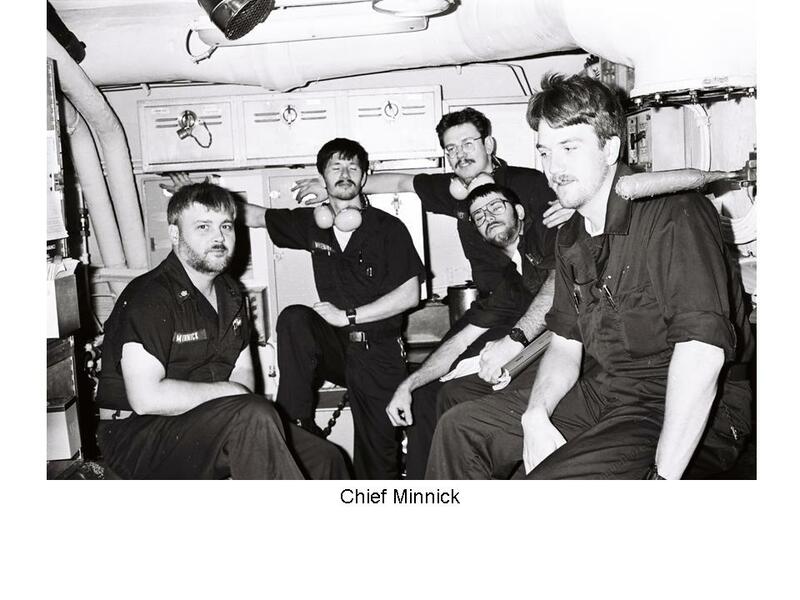 We were short handed as Quartermasters and Chief had to fill in as QMOW and DOOW with back to back watches. 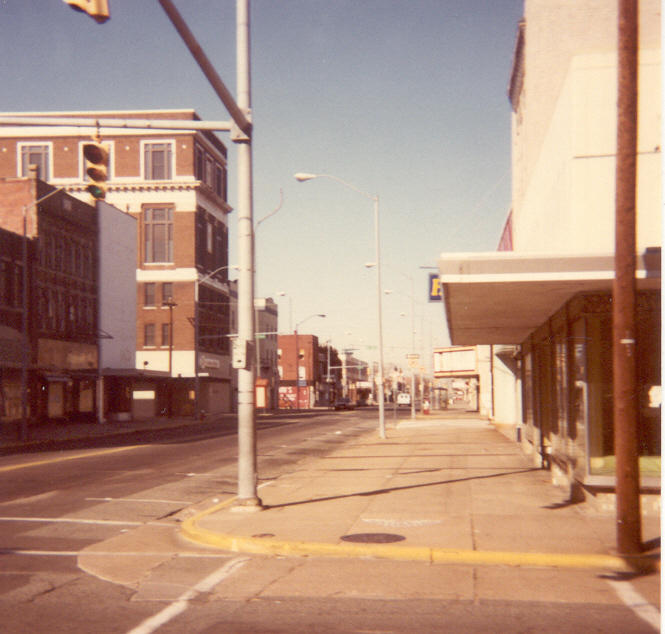 Beautiful downtown Newport News on a busy day. 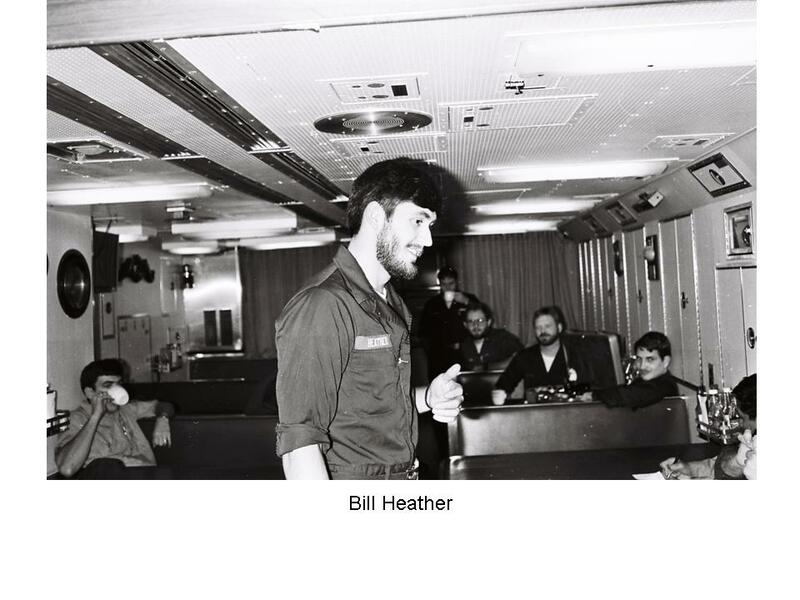 Bill Heather and Chase Champaign The Boat is in the background. 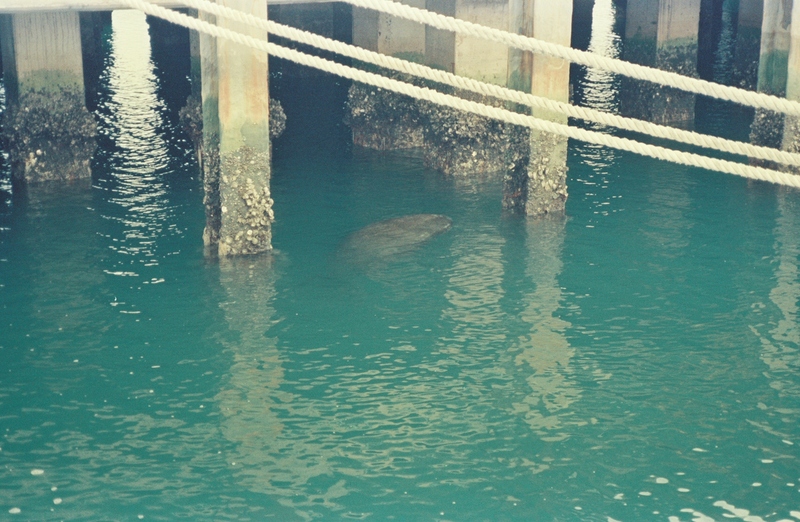 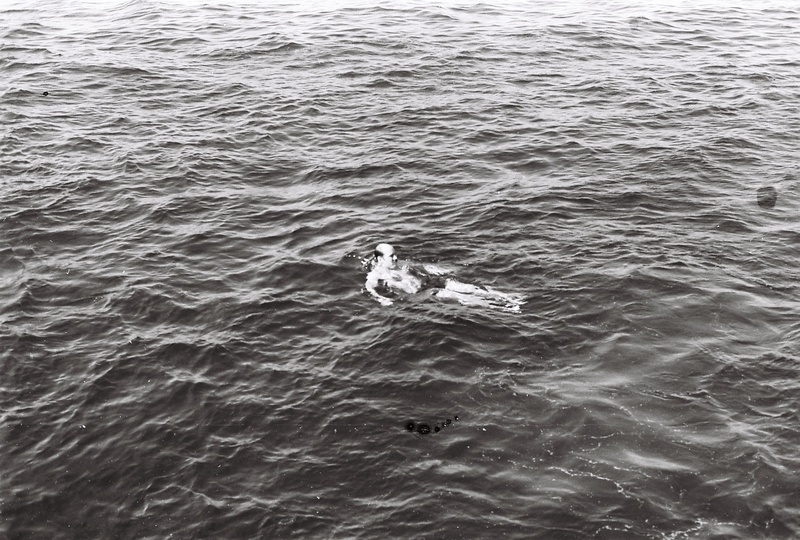 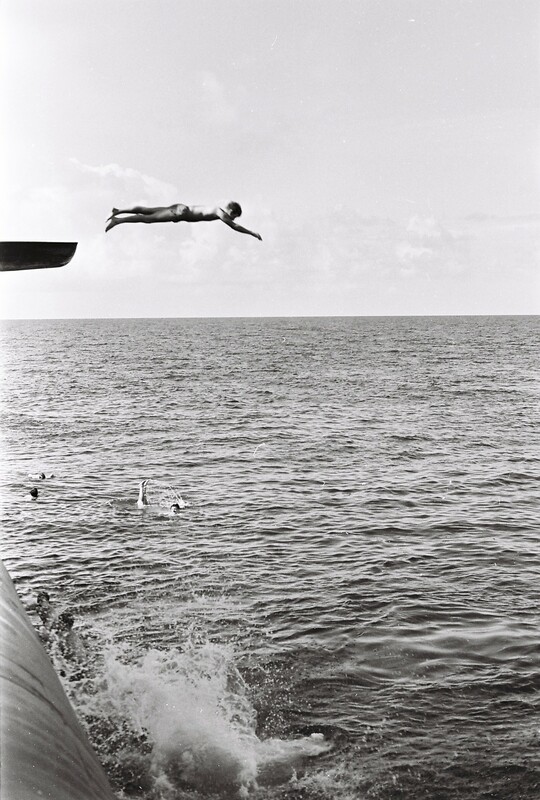 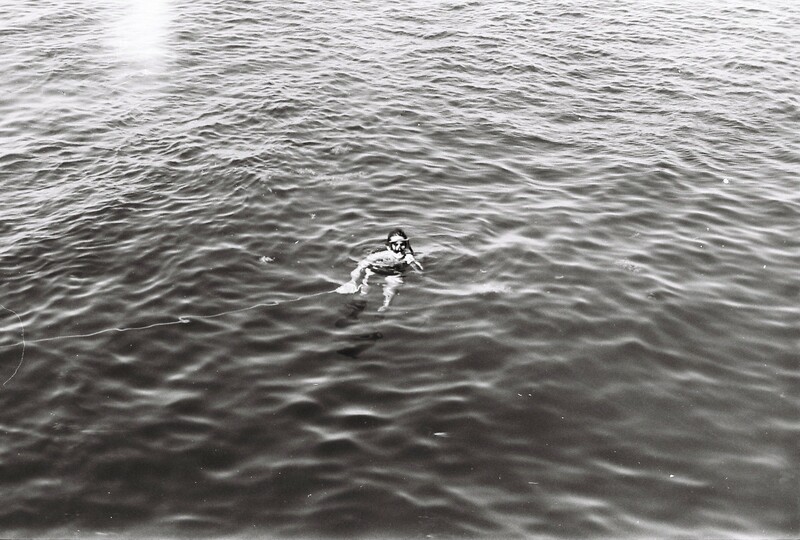 Me swimming in the buff in Bermuda. 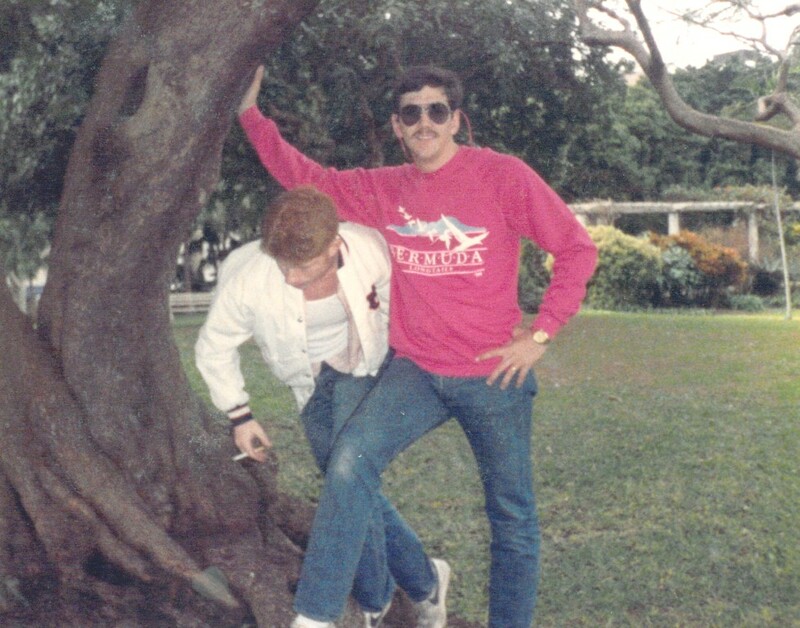 My God I once wore pink, that is Esterling jumping through the pic. 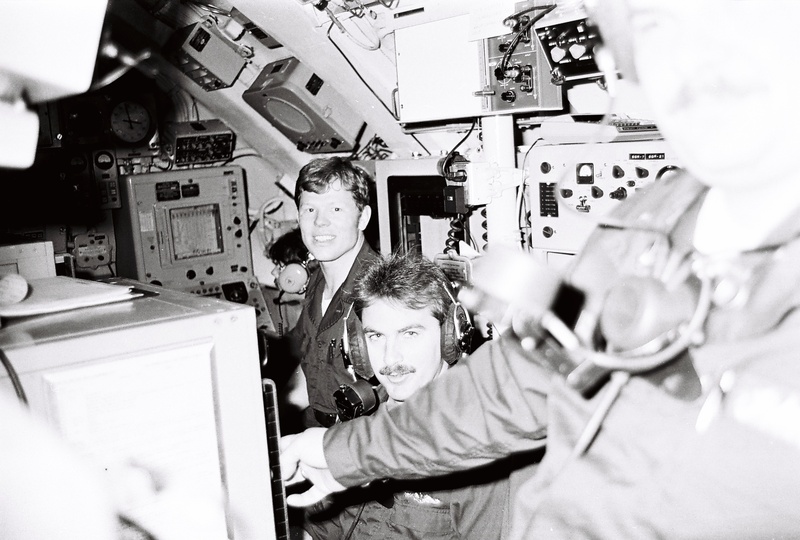 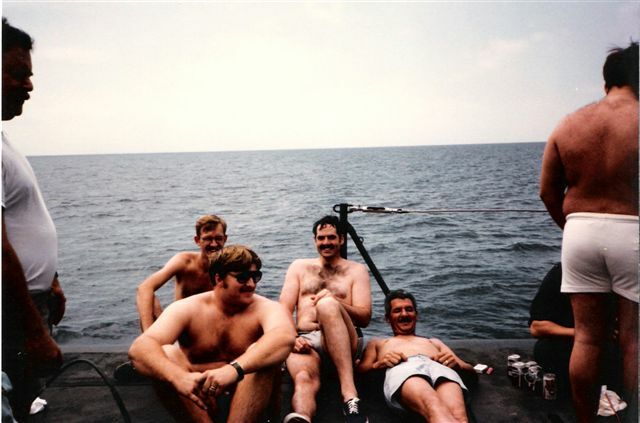 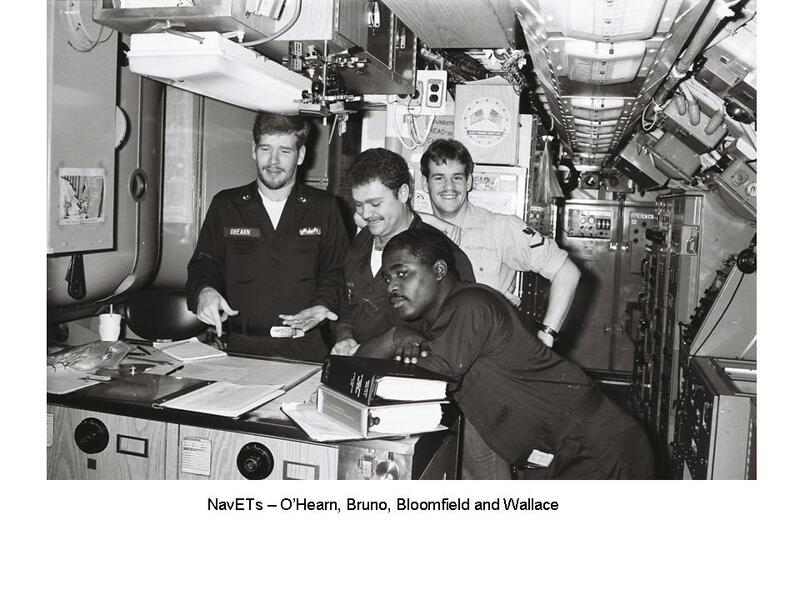 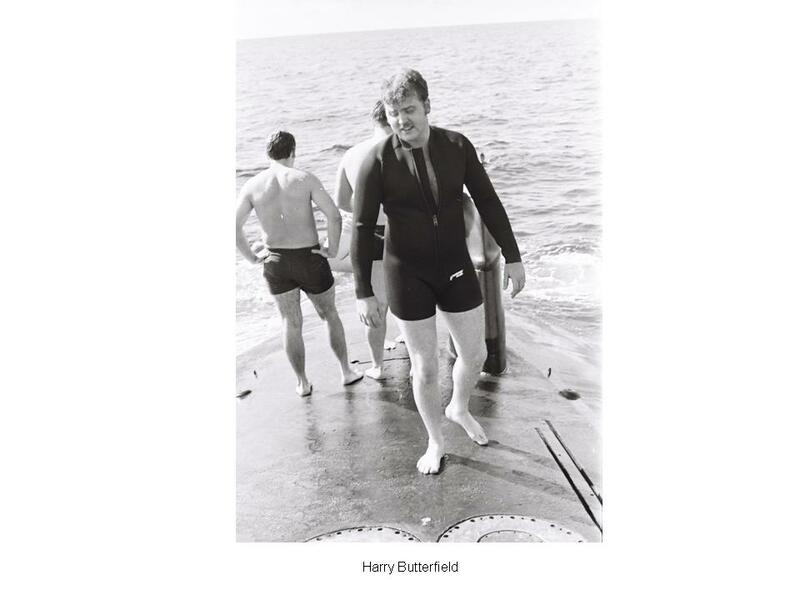 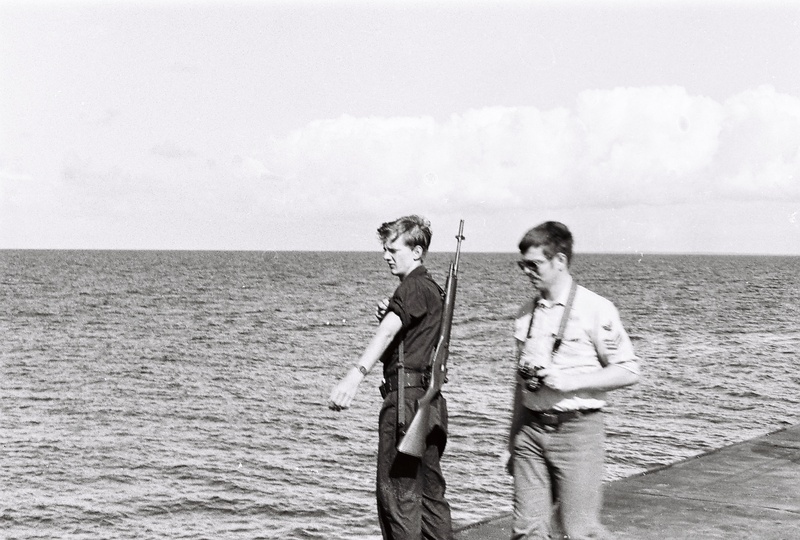 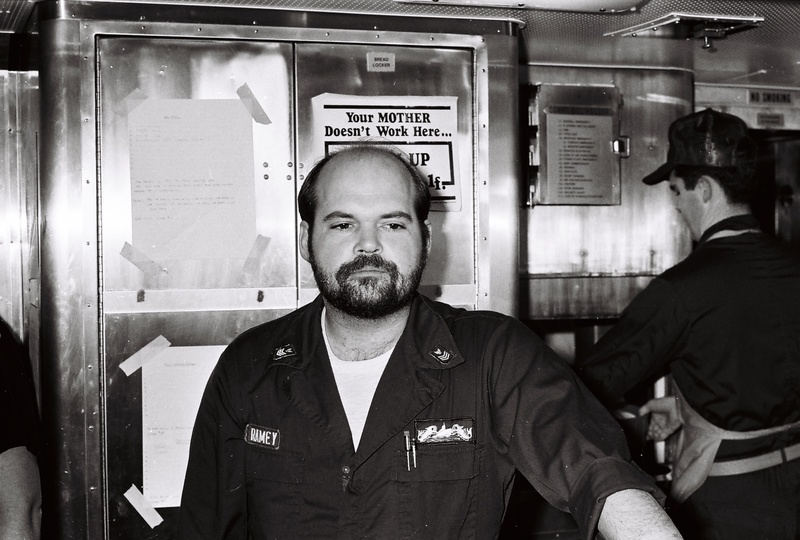 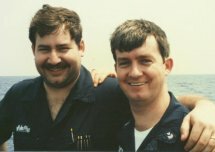 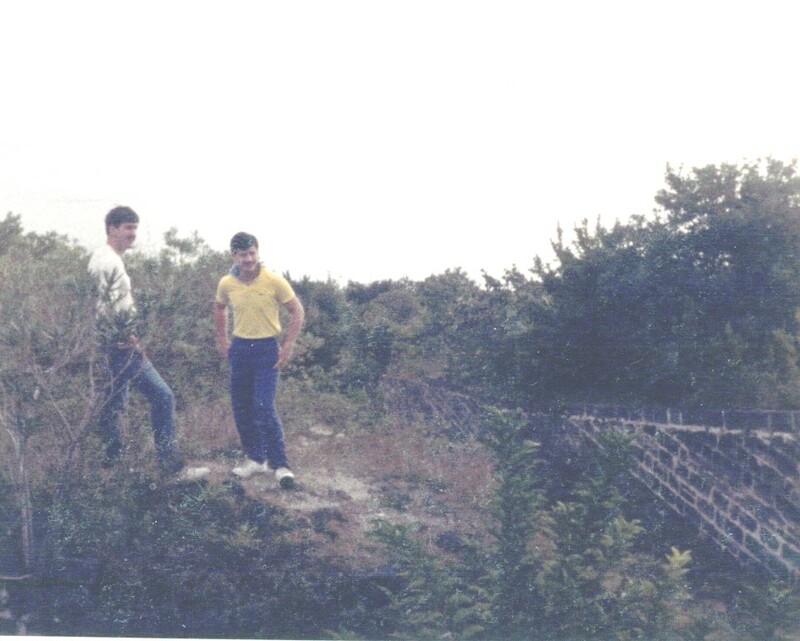 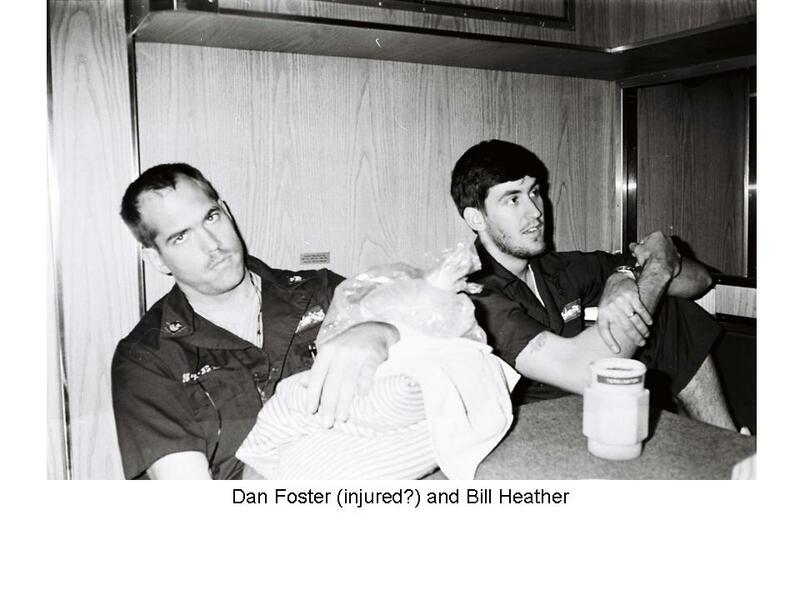 This is a pic of me (Kirk Parnell) and FTG2 Bill Heather (on the left) taken on patrol in 1986 in Ops UL. 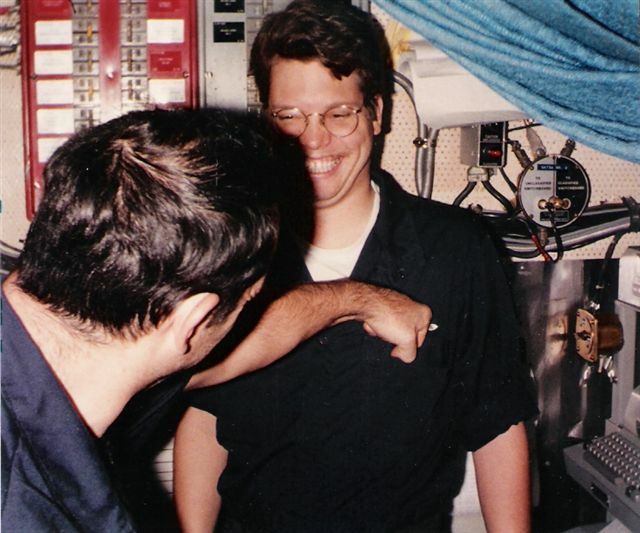 Bill was a good friend while I was on the Key. 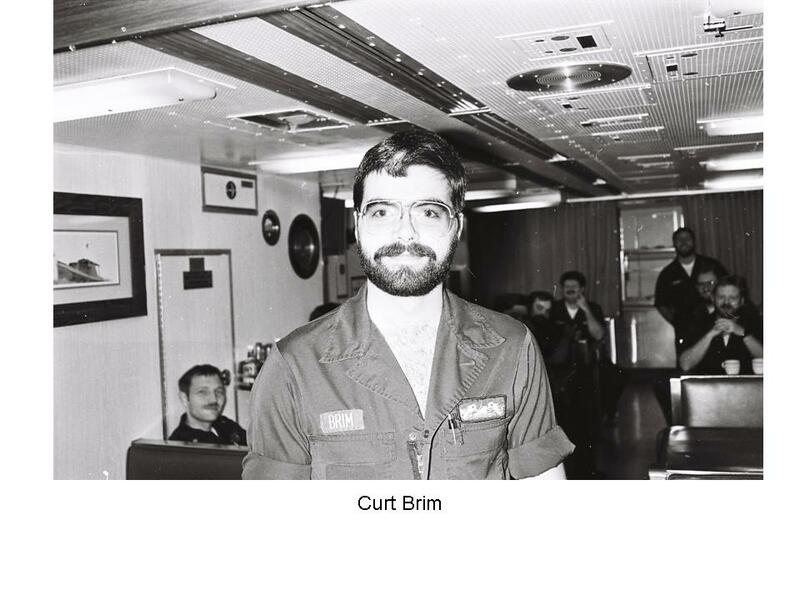 He and I were often mistaken for each other. 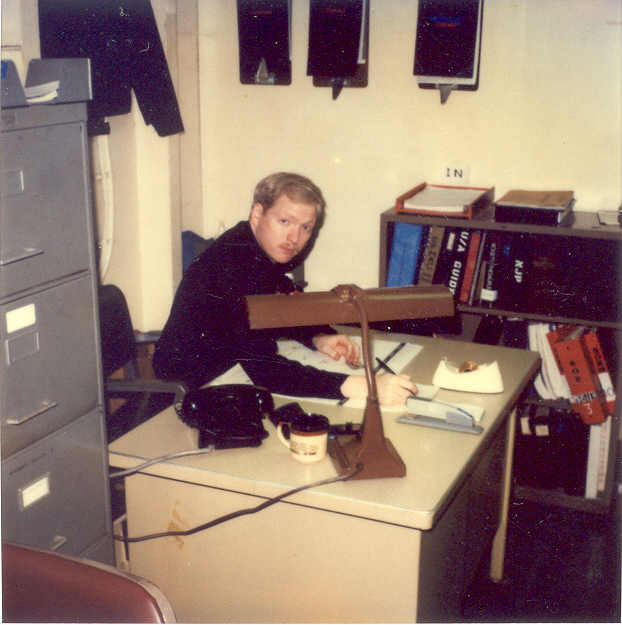 The last I heard, Bill was a Senior Chief in Bangor getting ready to retire. 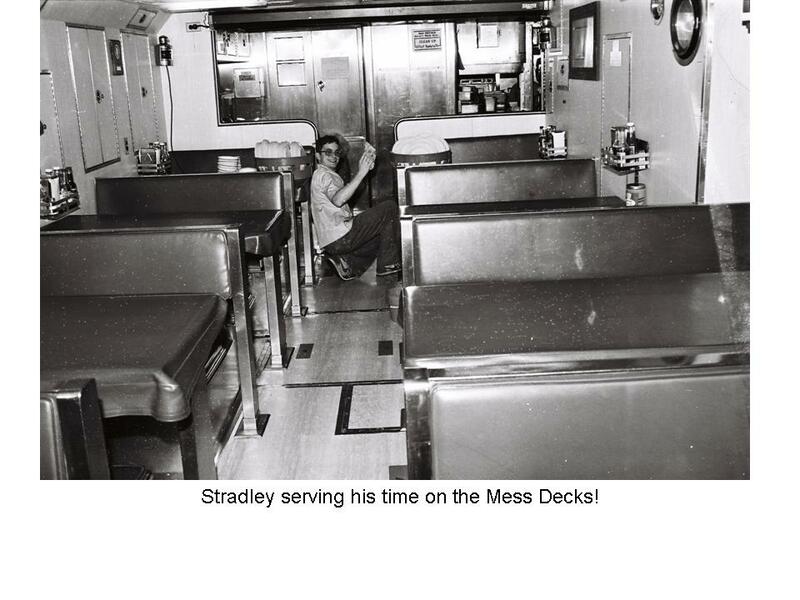 I'd like to find out where he is now. 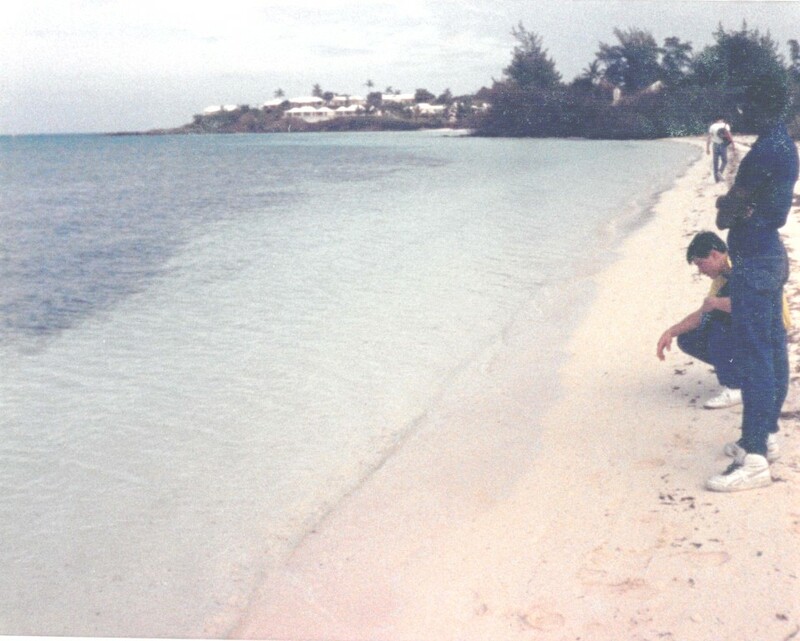 This was taken at a pub in Bermuda while in port there. 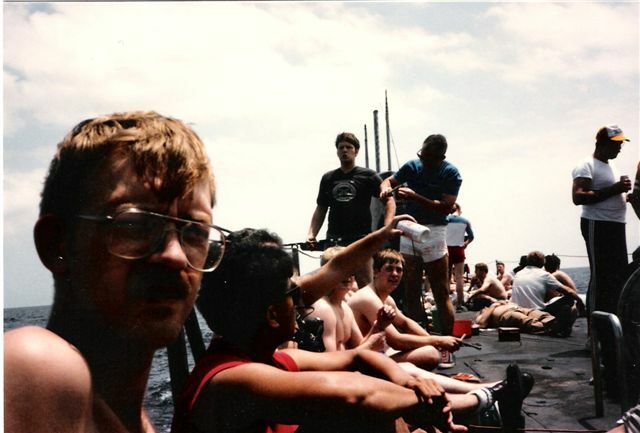 That's me in the center, RM2 Chase Champaigne on the right and Bill Heather on the left. 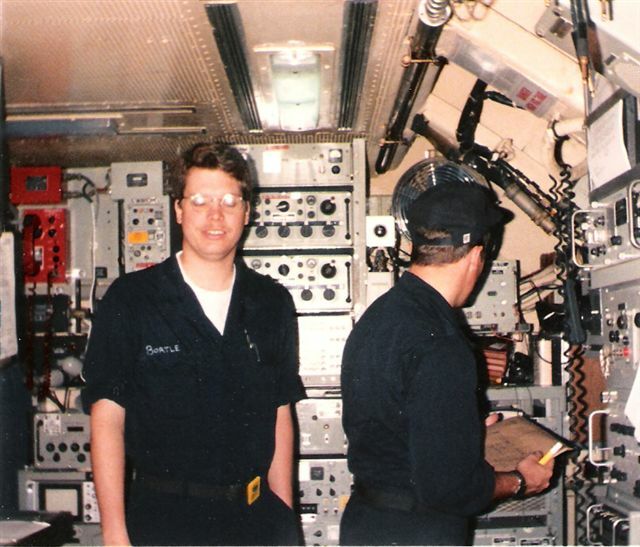 Behind me is Chris Kjellin (QM3) and RM3 Bell. 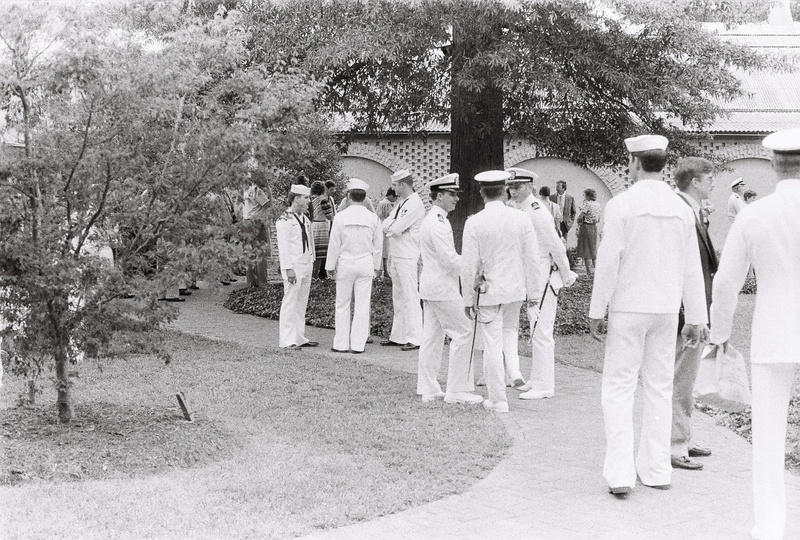 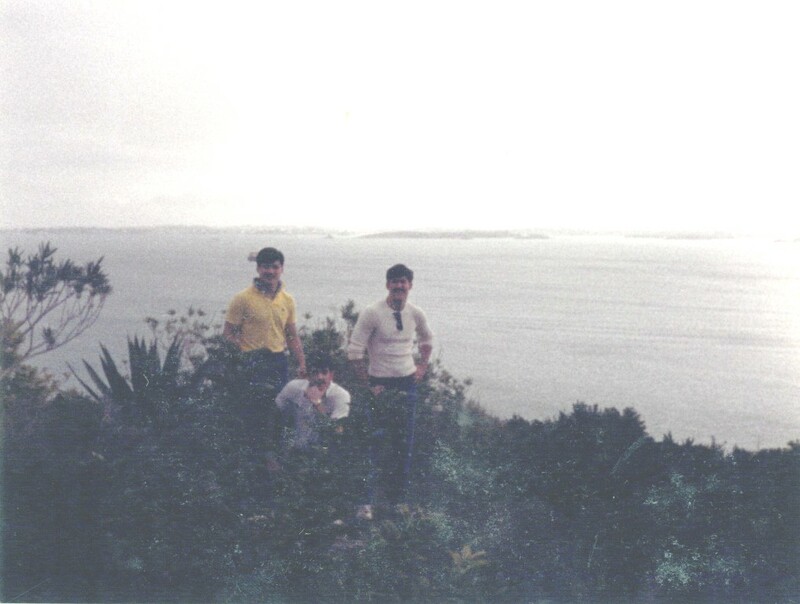 Bell, Parnell and Champaigne at a park in Bermuda. 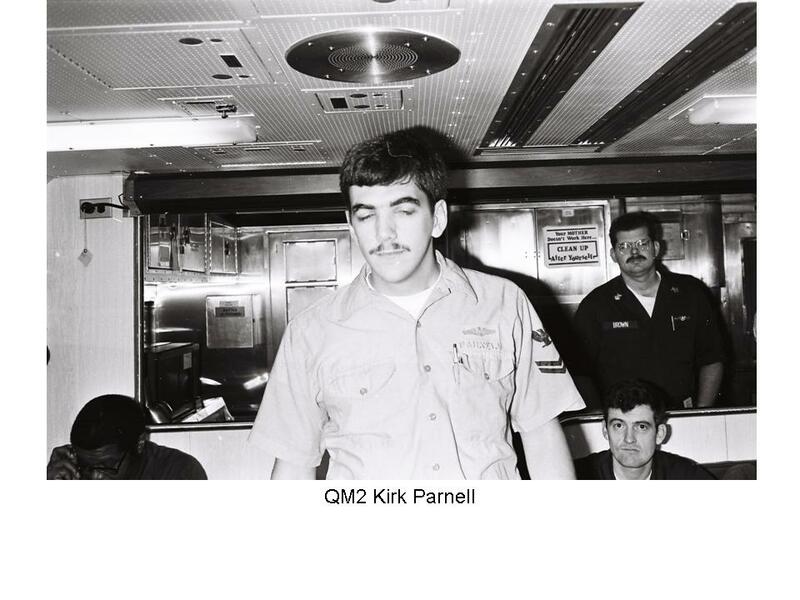 Kirk Parnell at the QM station in Control Room. 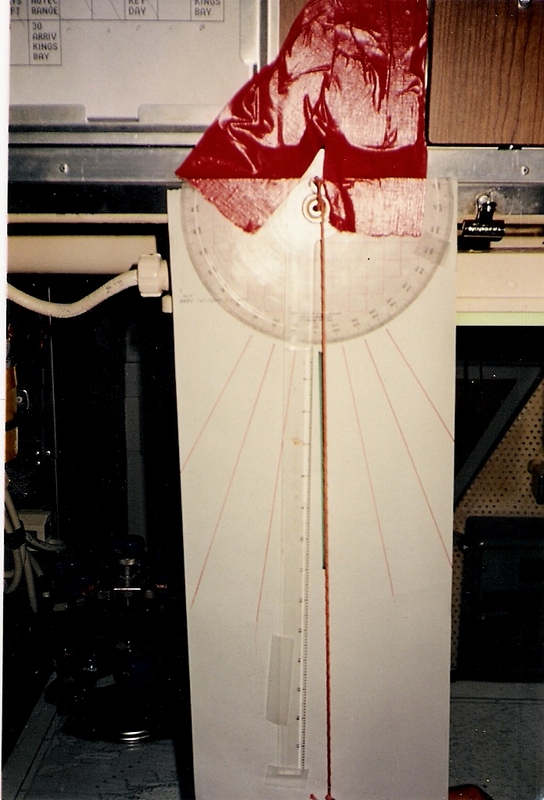 Rigged for red. 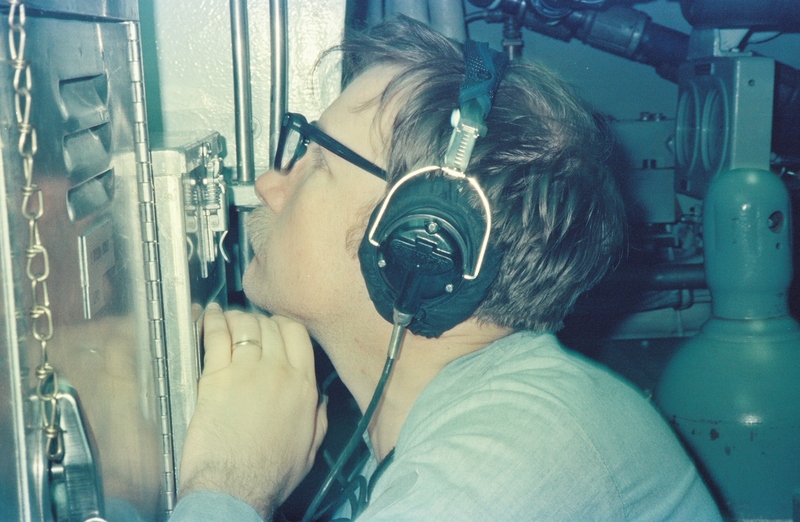 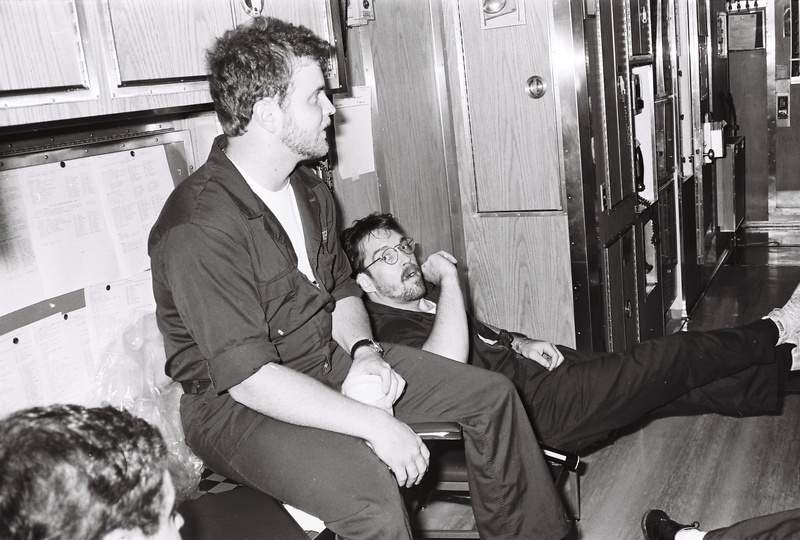 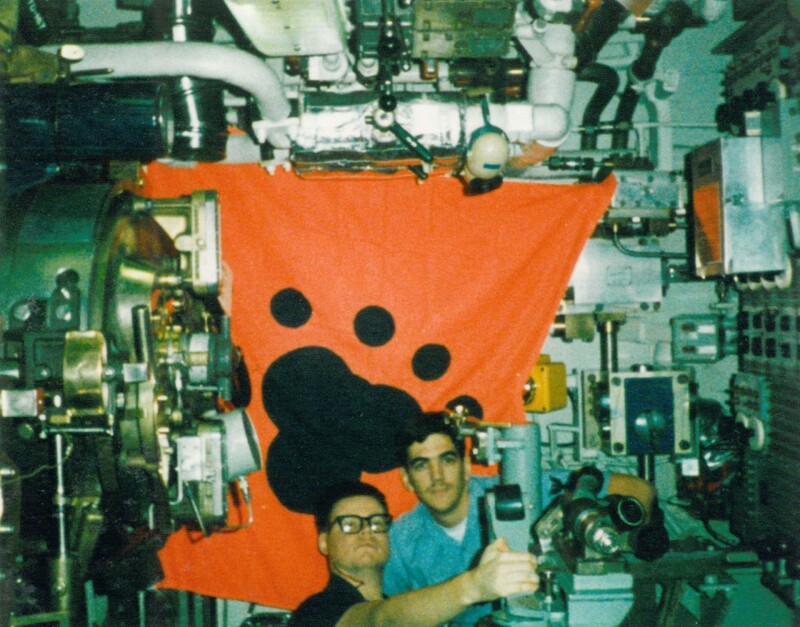 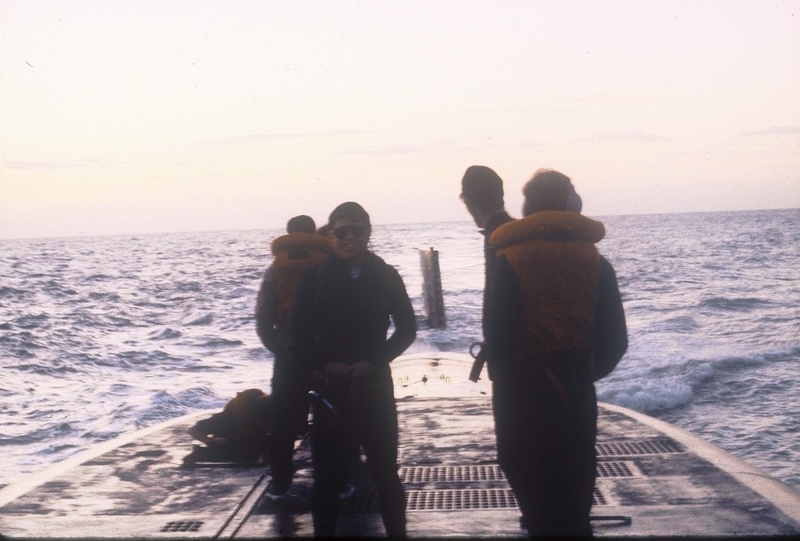 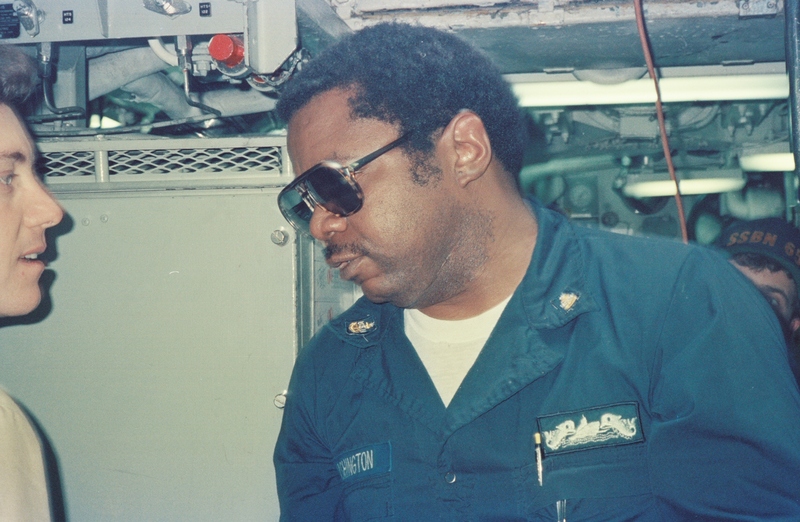 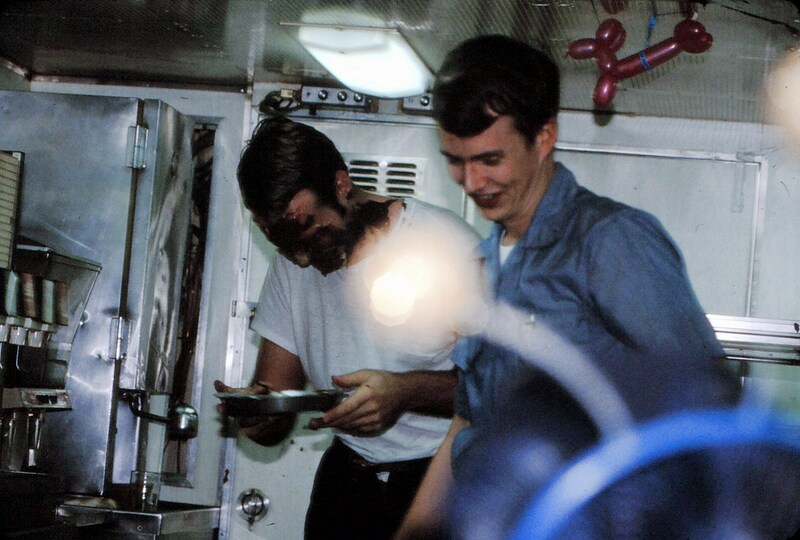 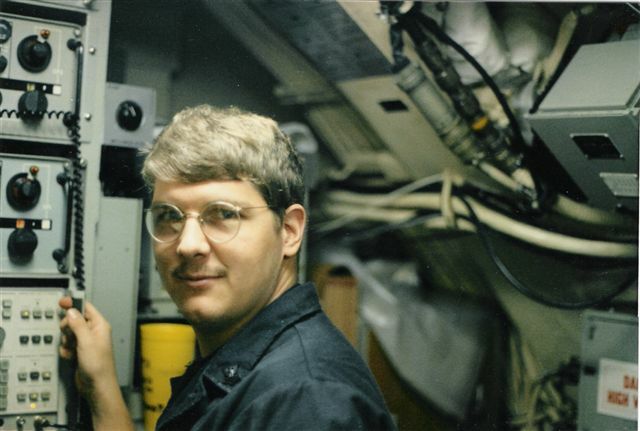 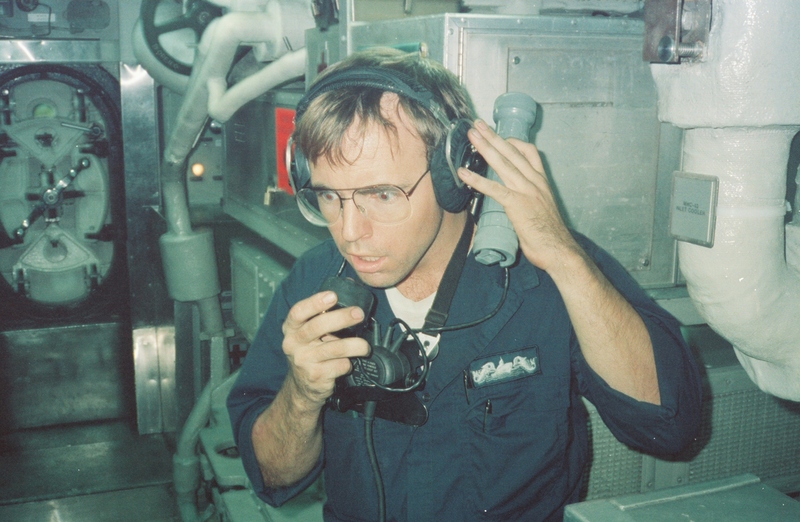 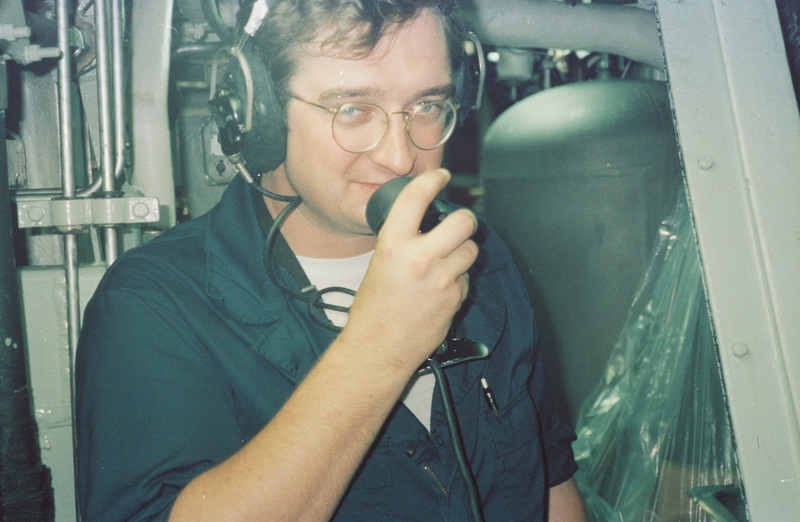 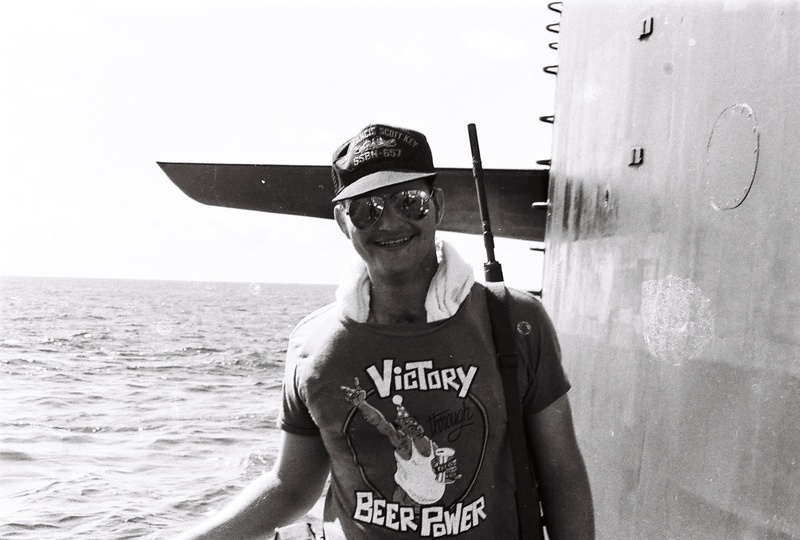 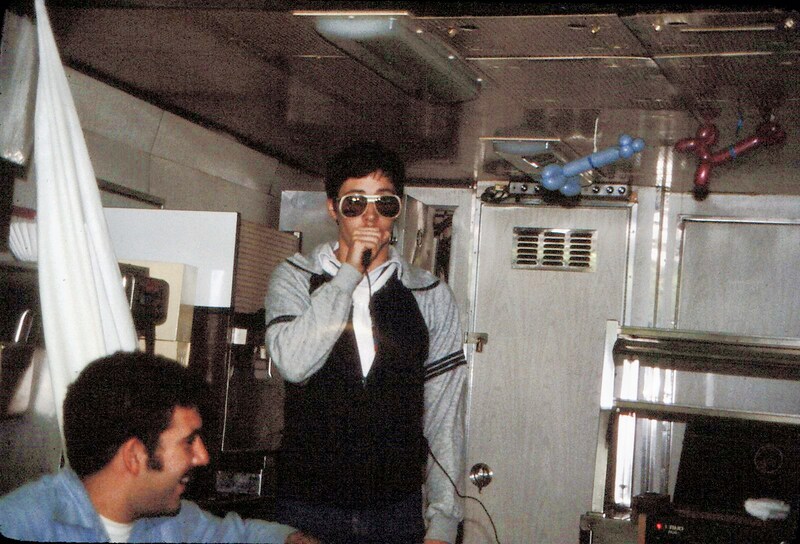 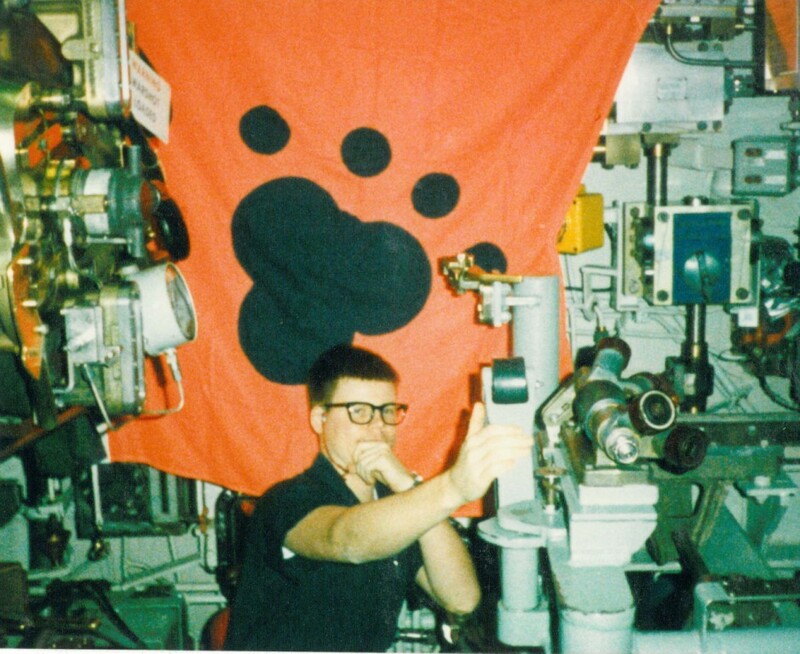 Whenever the sun set the QMOW had to wear the funky red glasses to keep our eyes adjusted to the dark just in case we had to go to periscope depth. 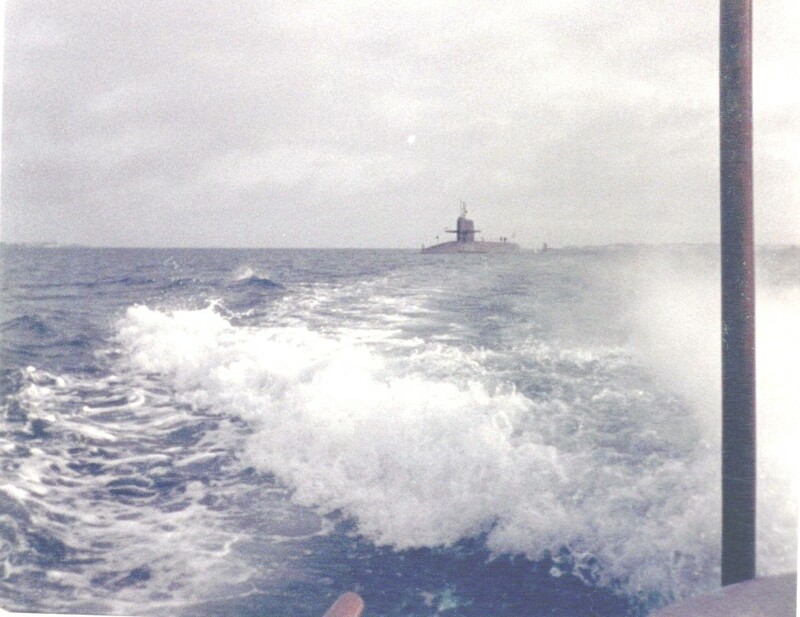 Kirk Parnell on shark watch off Andros Island during a swim call. 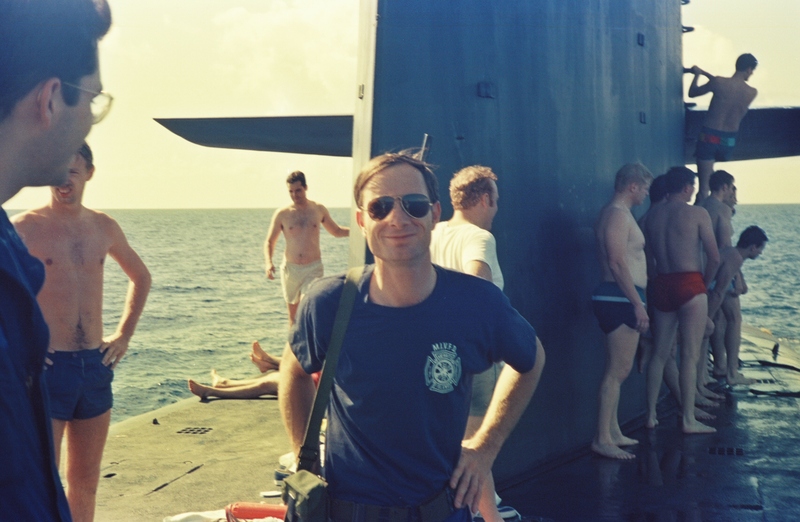 Behind me is Cmdr. 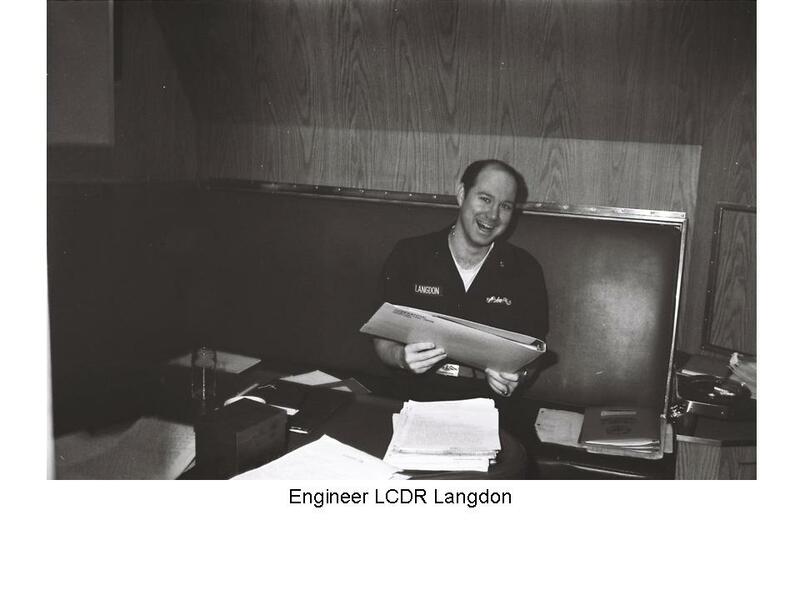 Langdon our Engineer. 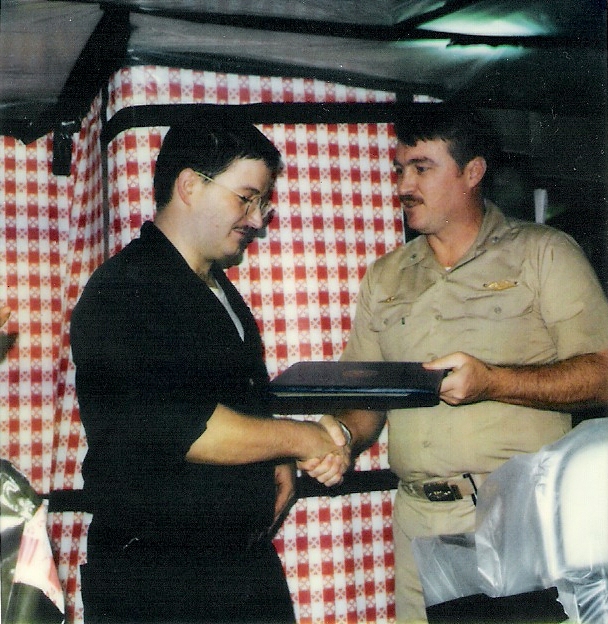 Phil Newsome recognized many of the folks in these pictures. 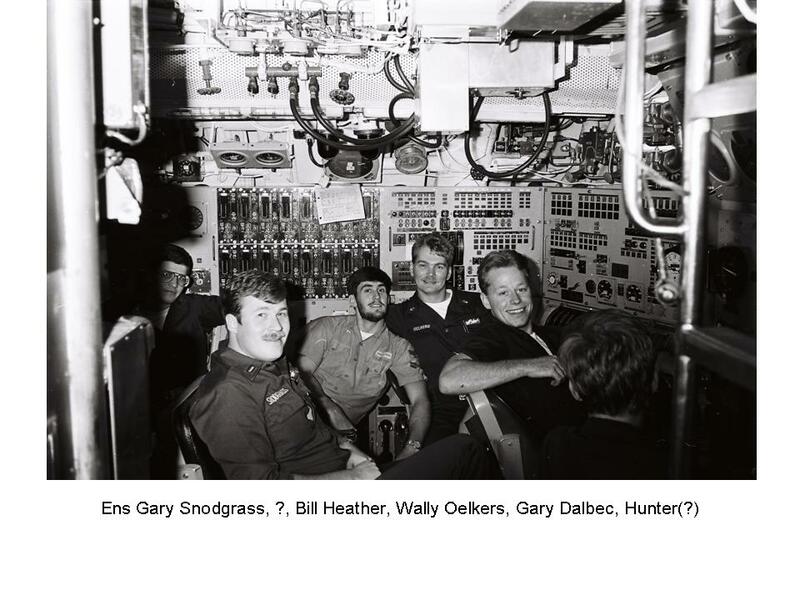 Click on the picture to read names. 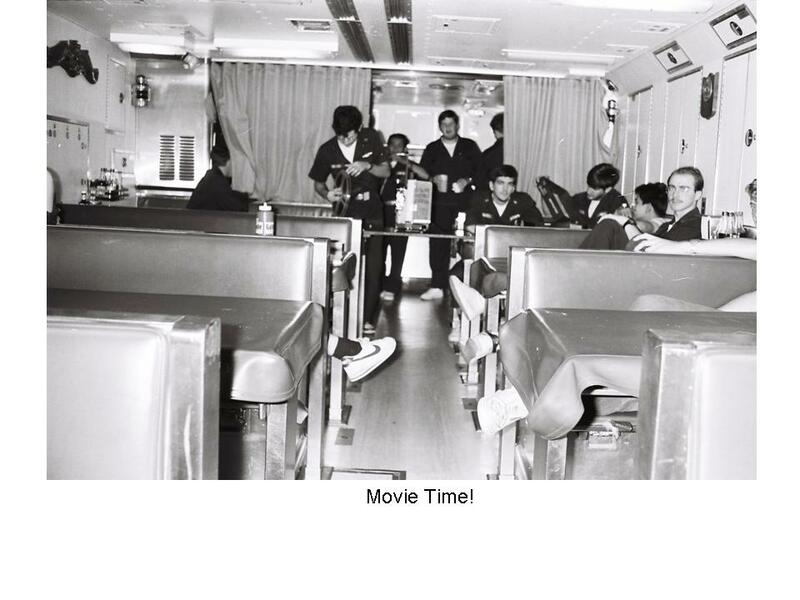 Here are some more names for you for this pic. 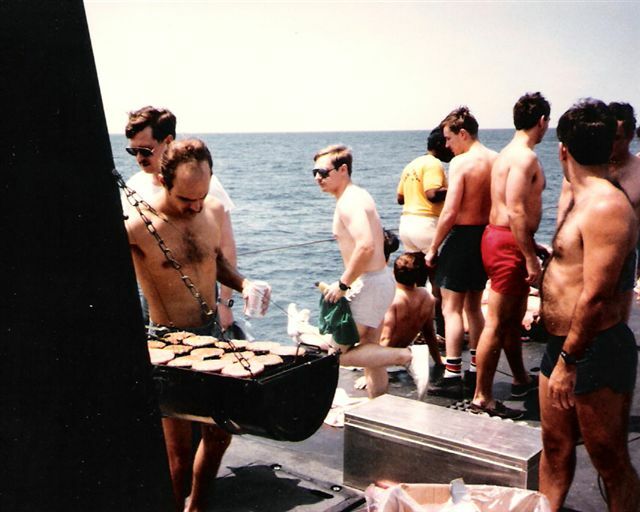 Guy in center of picture with black tank top is Andy Sierra, Guy next to him (in white shirt and red shorts) was the C.O. 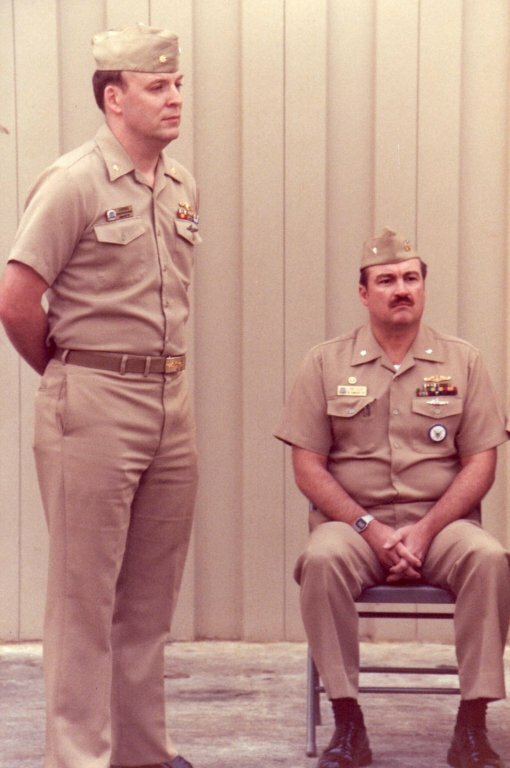 Dave Miller and the guy next to him in poopy suit is Lt Stubbs. 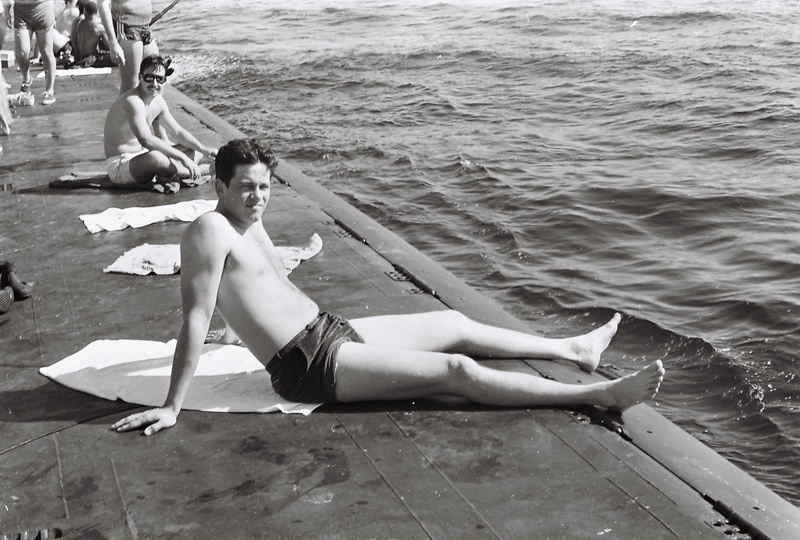 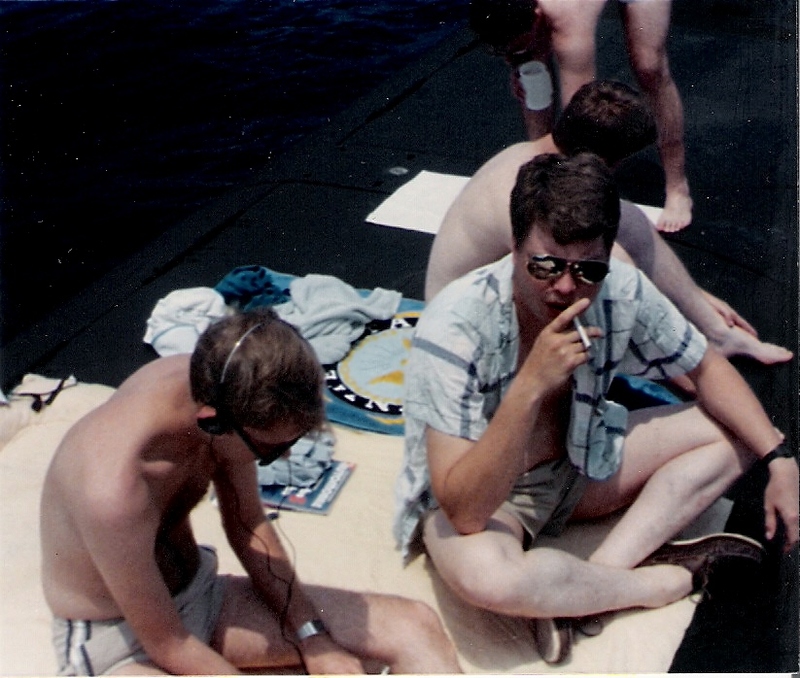 Am pretty sure that the guy looking away in white shorts w/ tan stripe in foreground is Doug Brown Hope this helps. 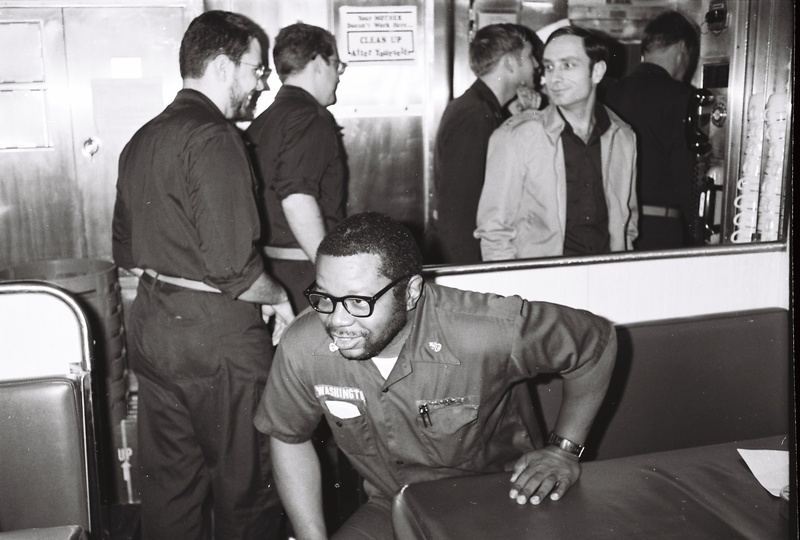 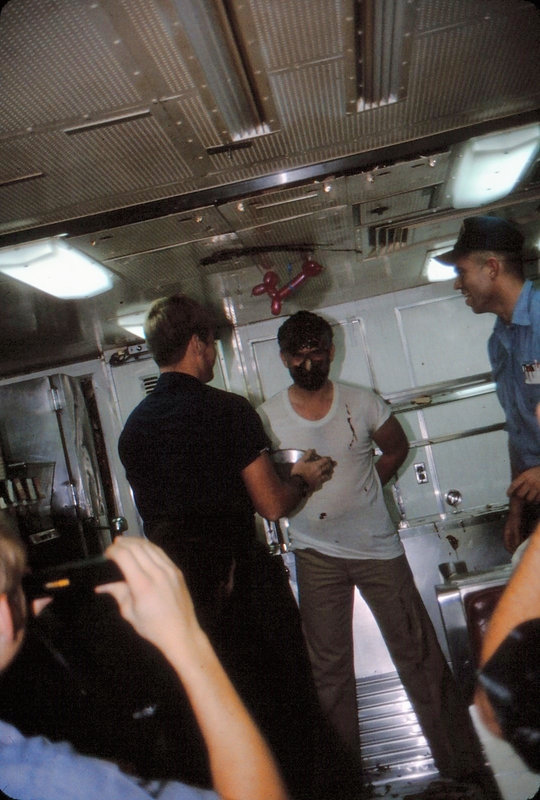 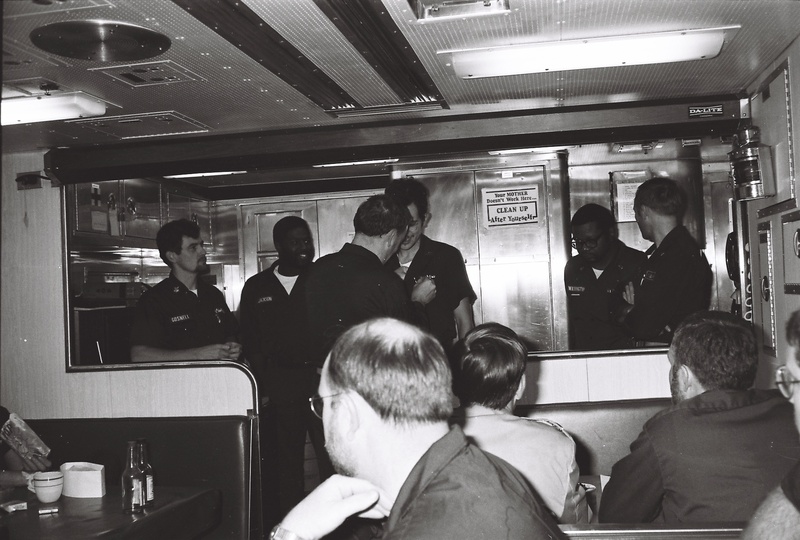 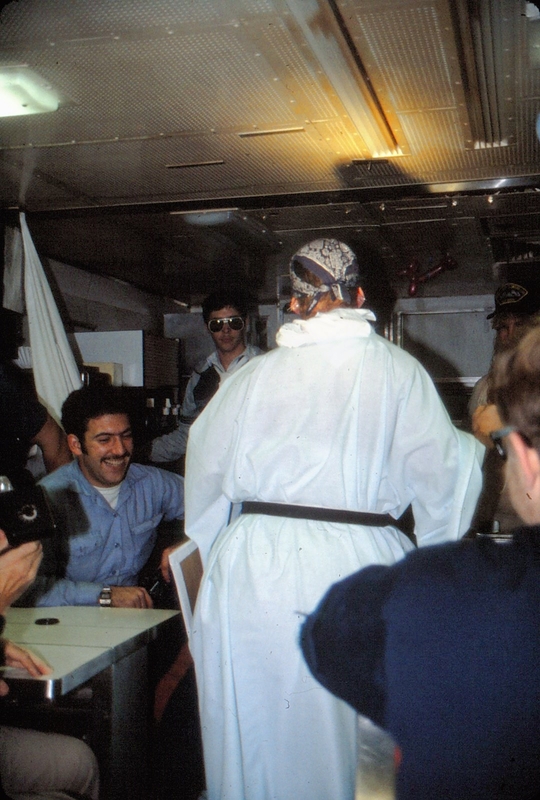 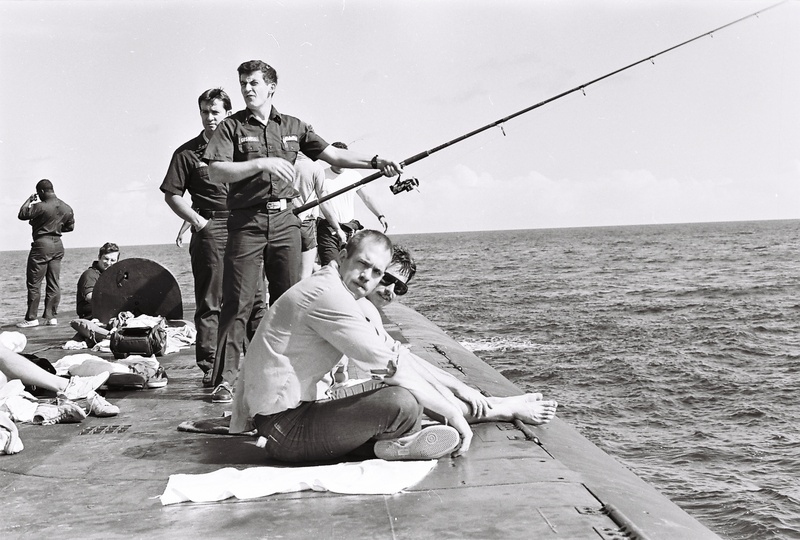 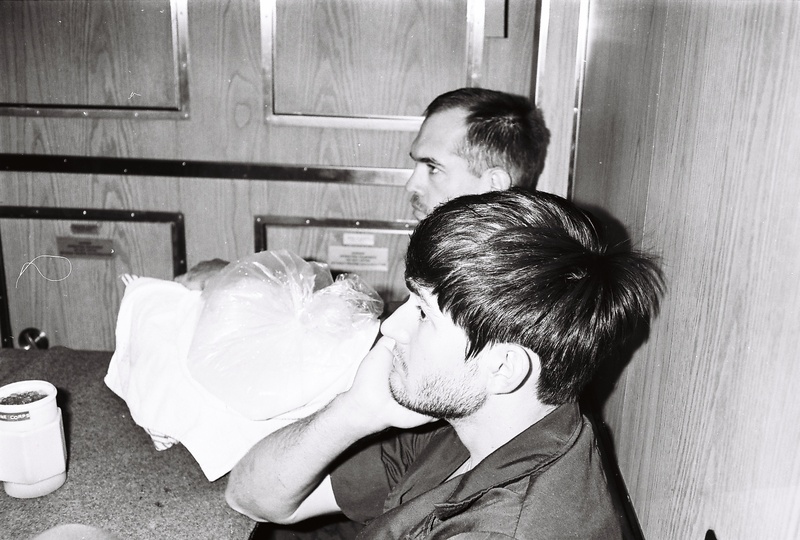 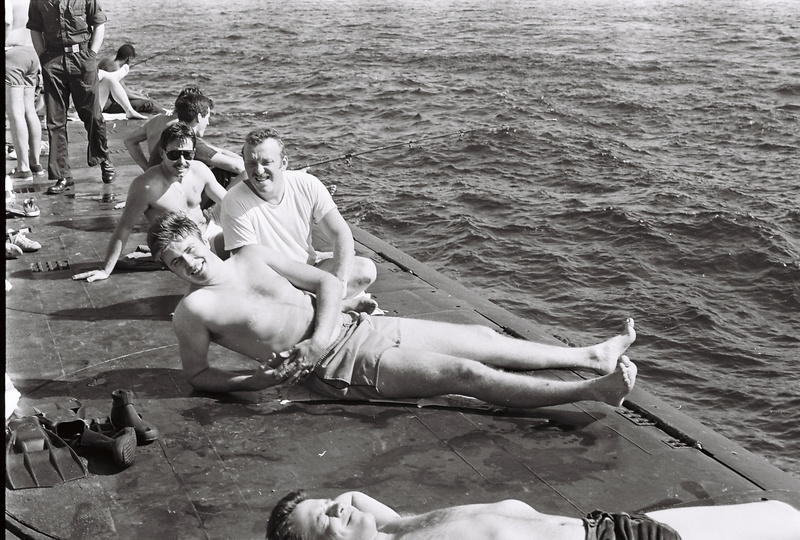 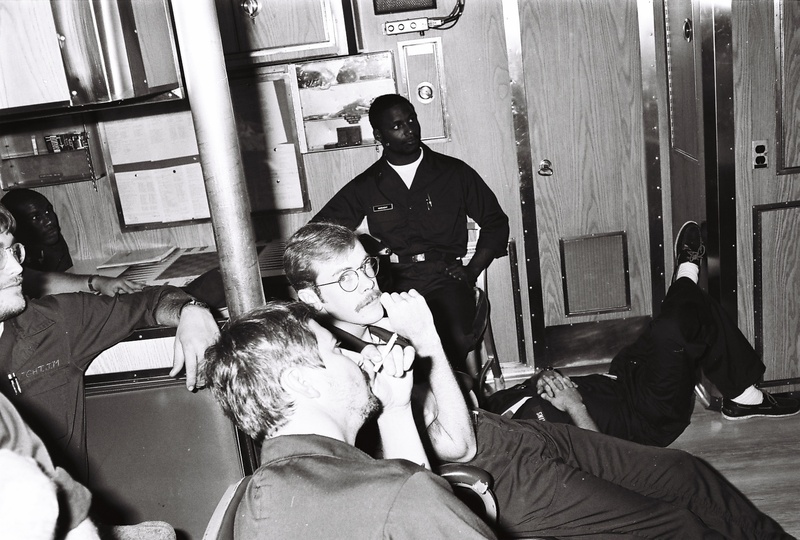 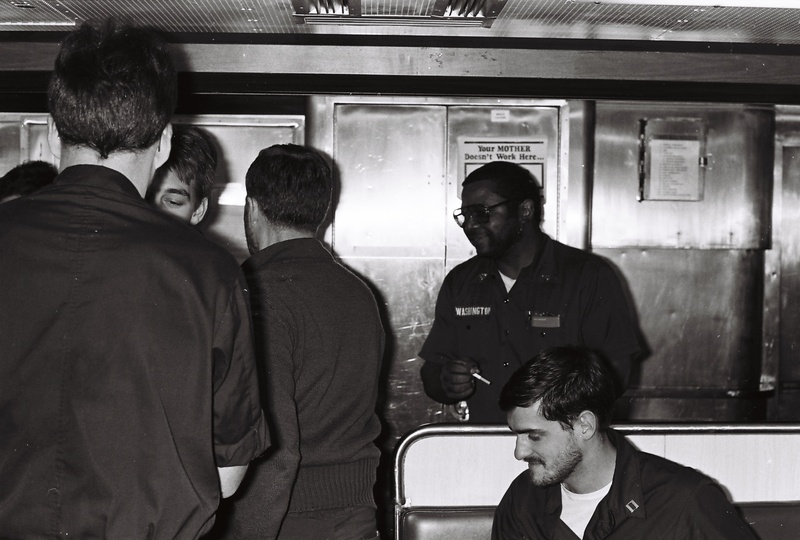 - Craig Bortle is sitting in the white stripped shirt beside Willie "Black Lung" Jarnigan (sunglasses). 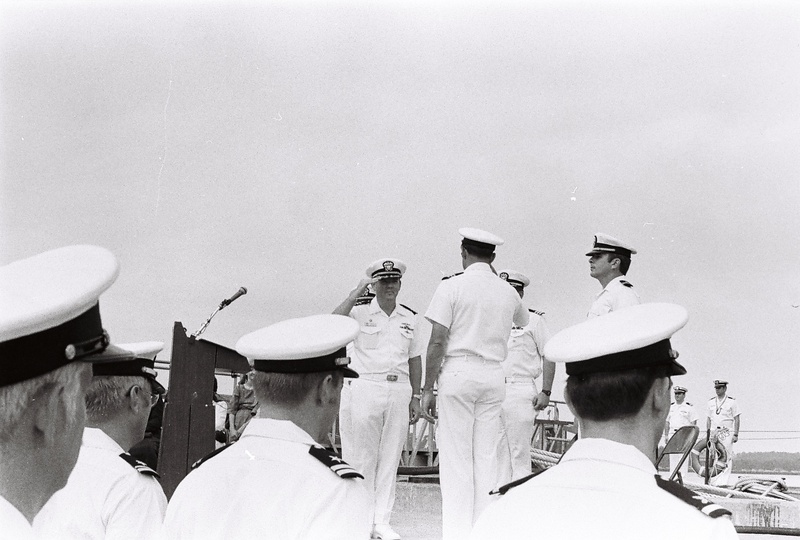 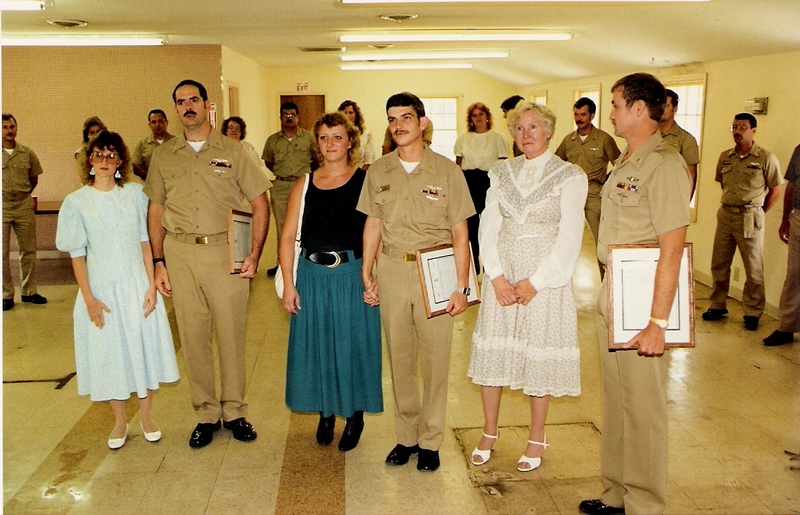 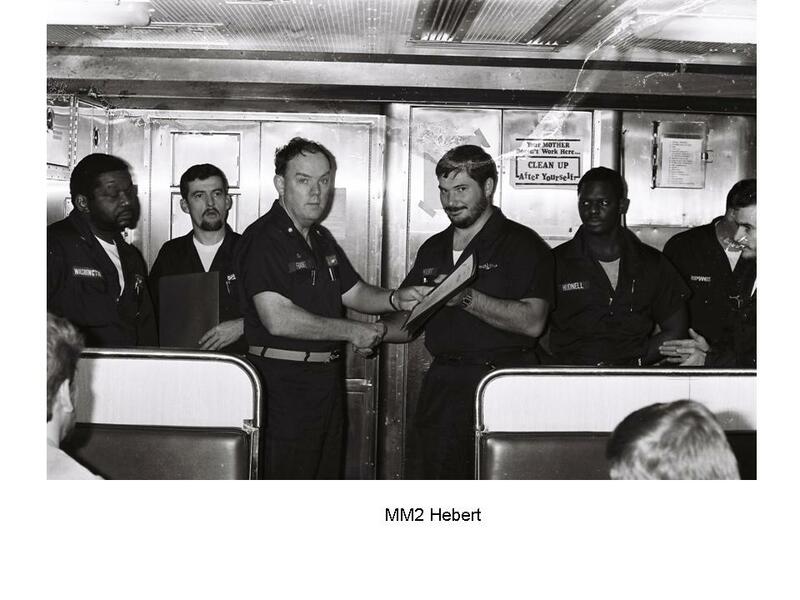 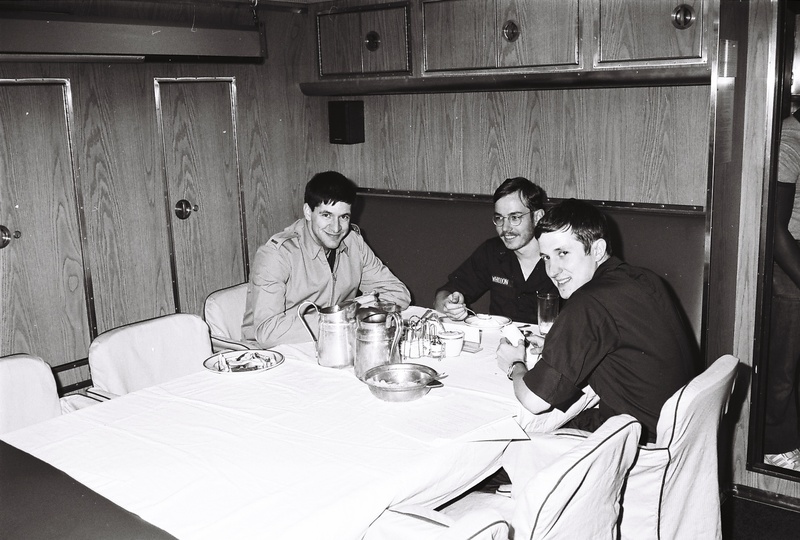 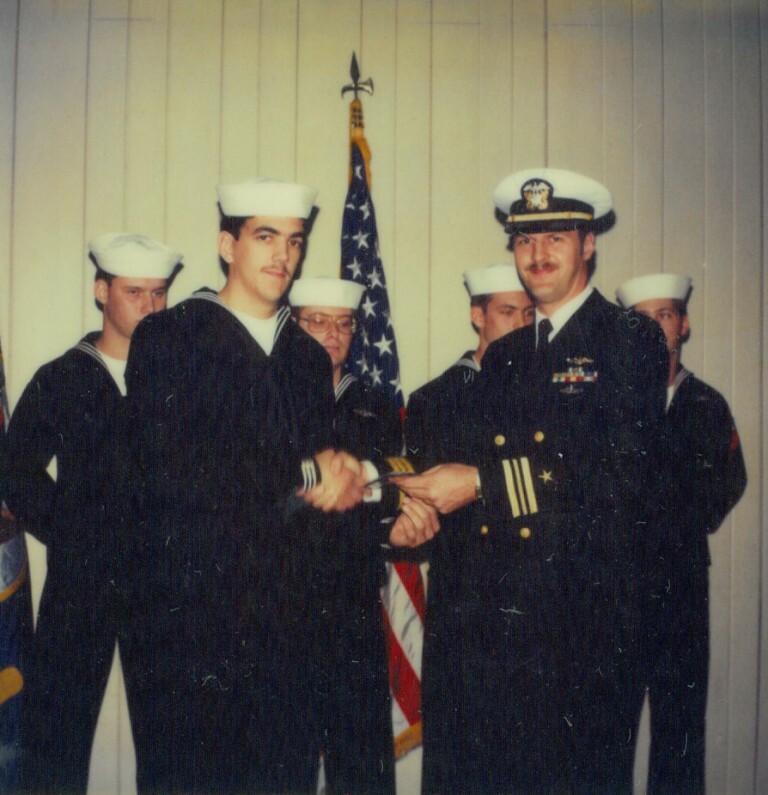 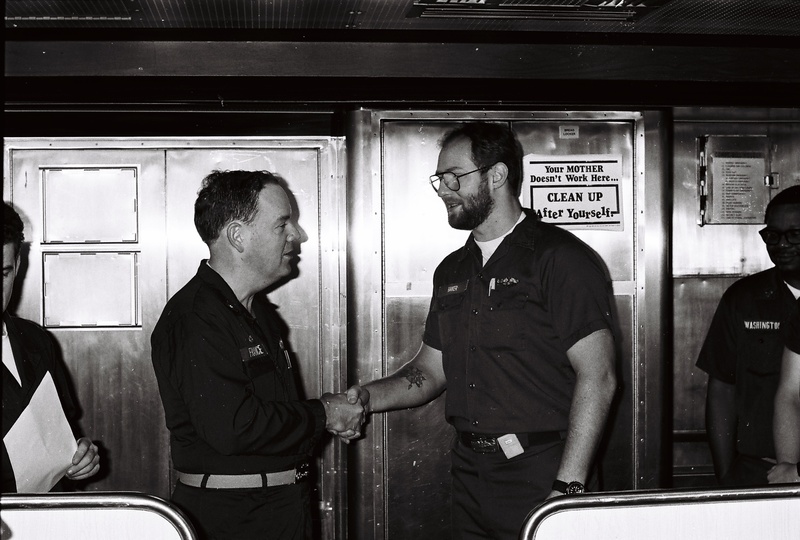 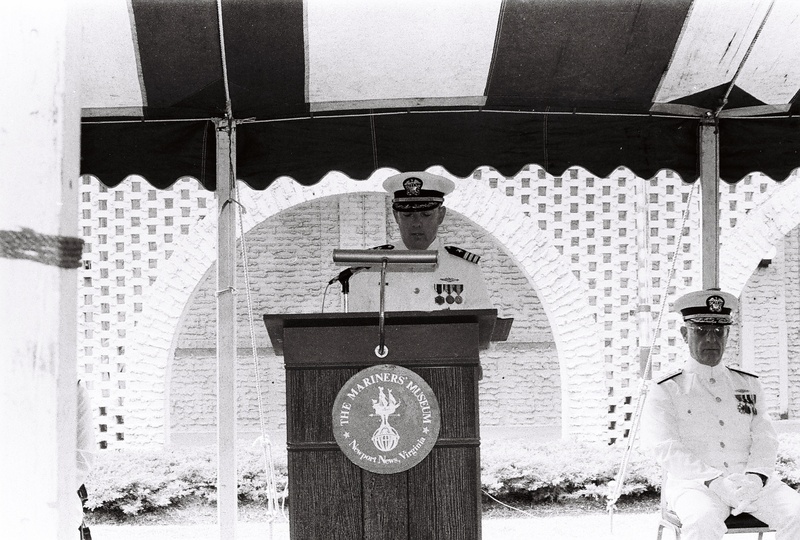 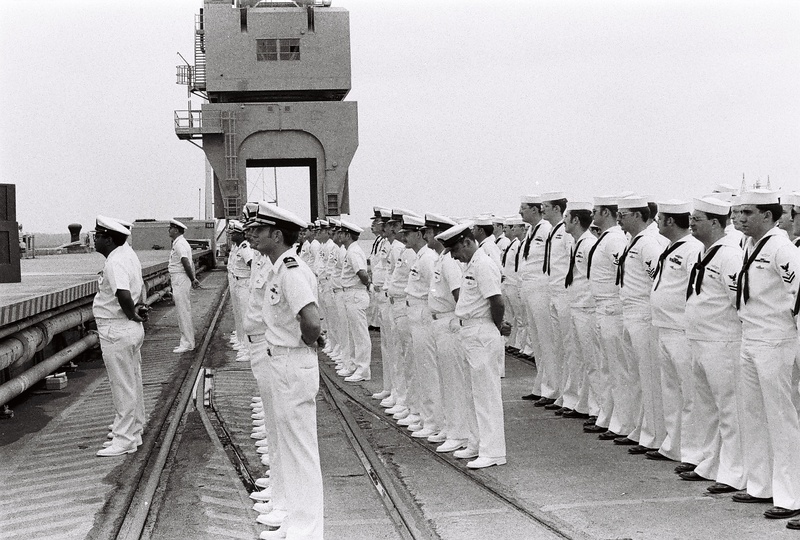 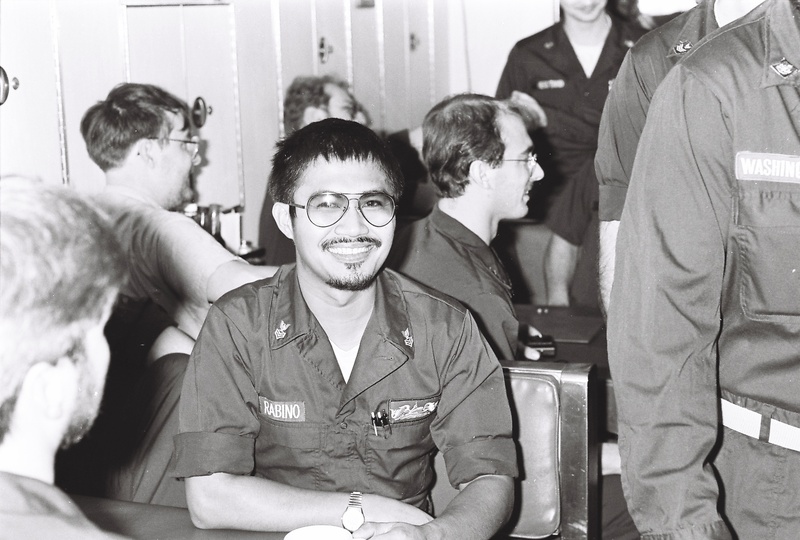 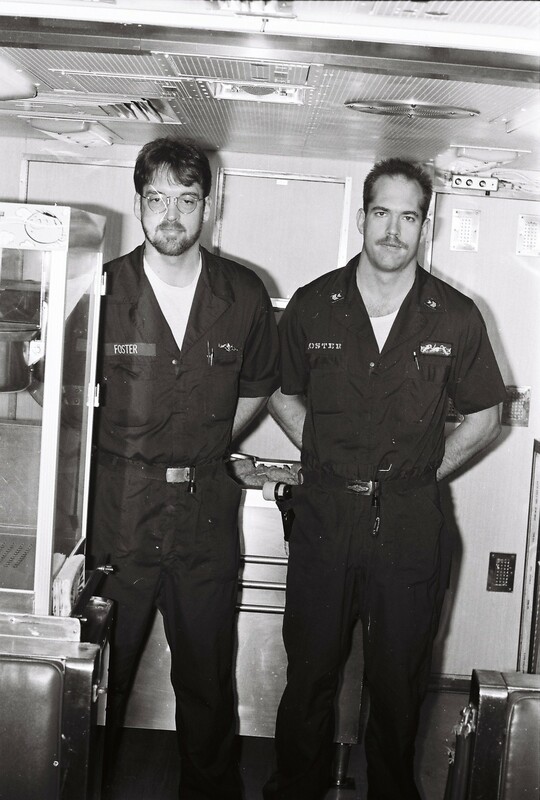 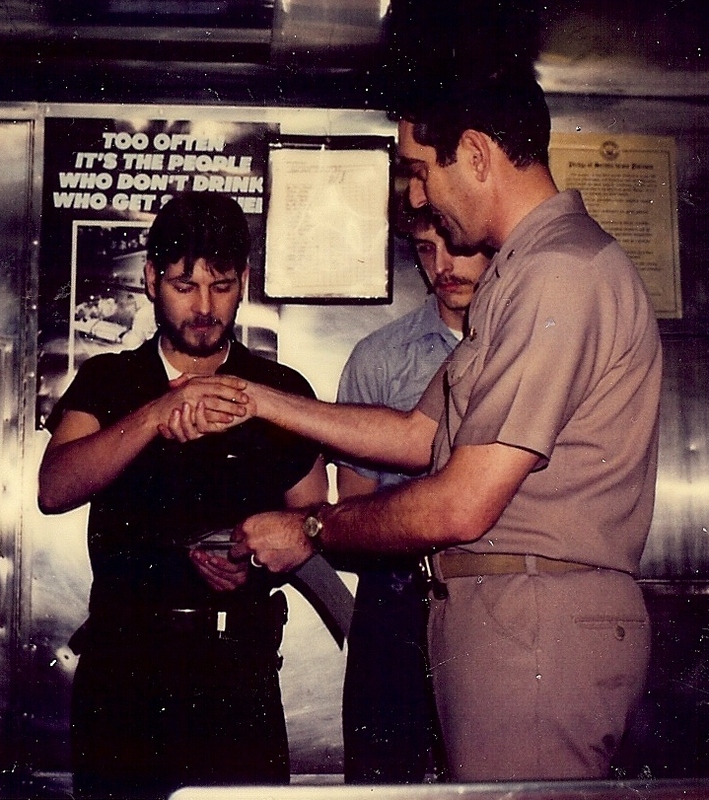 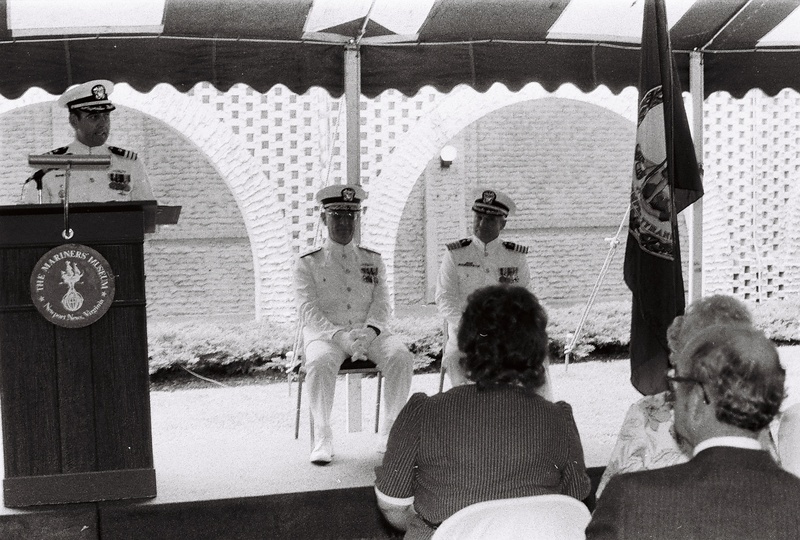 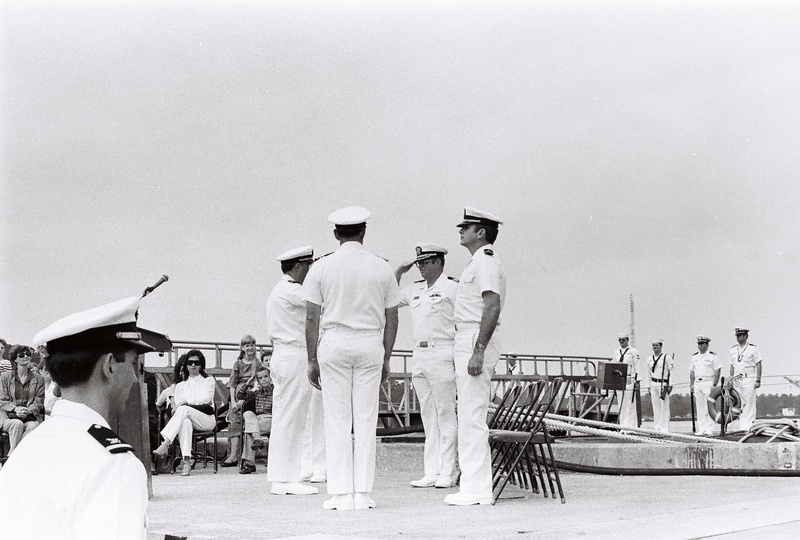 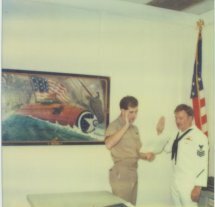 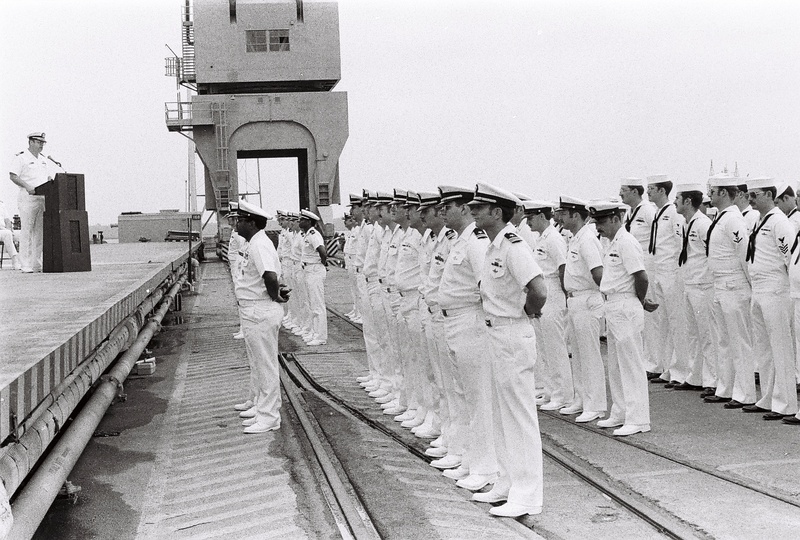 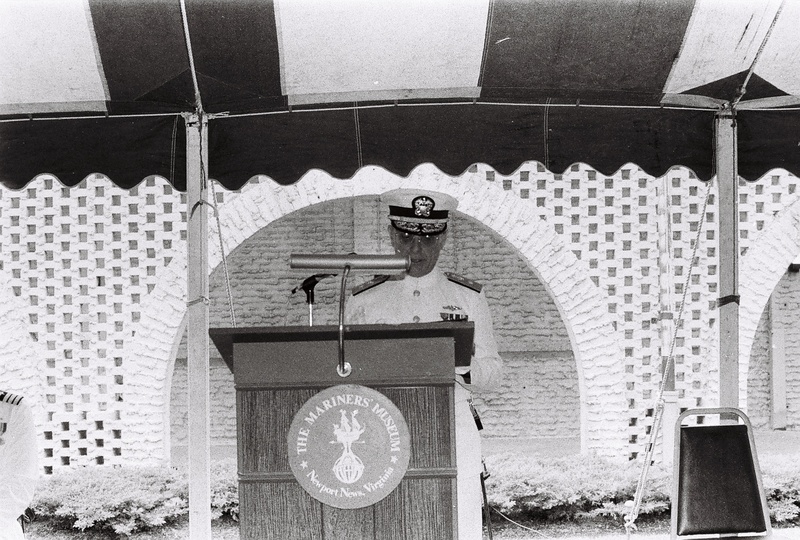 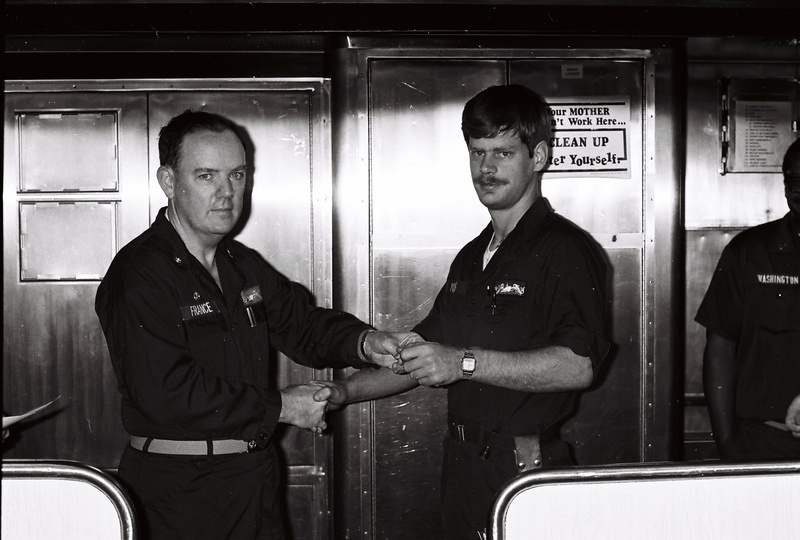 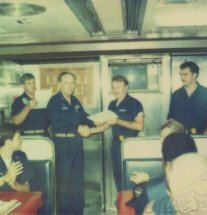 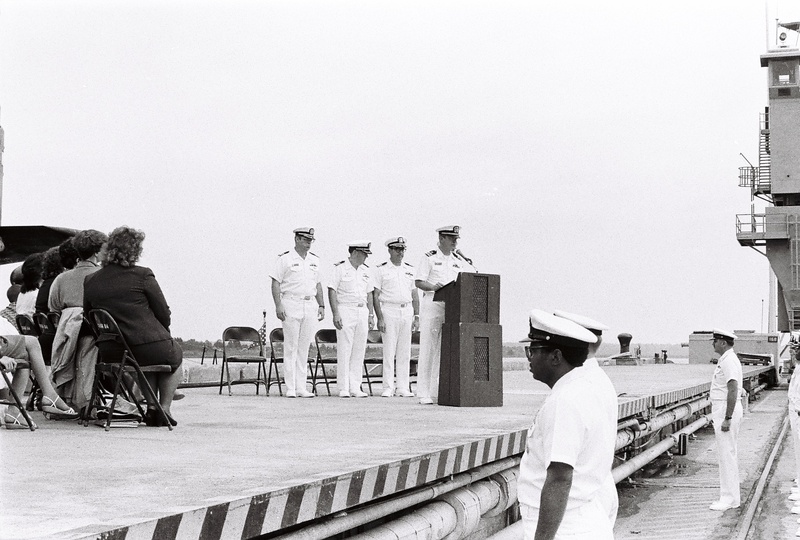 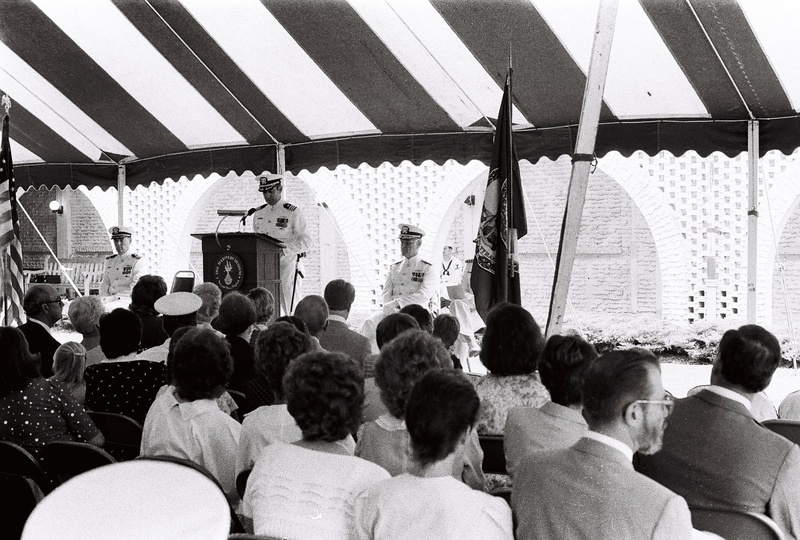 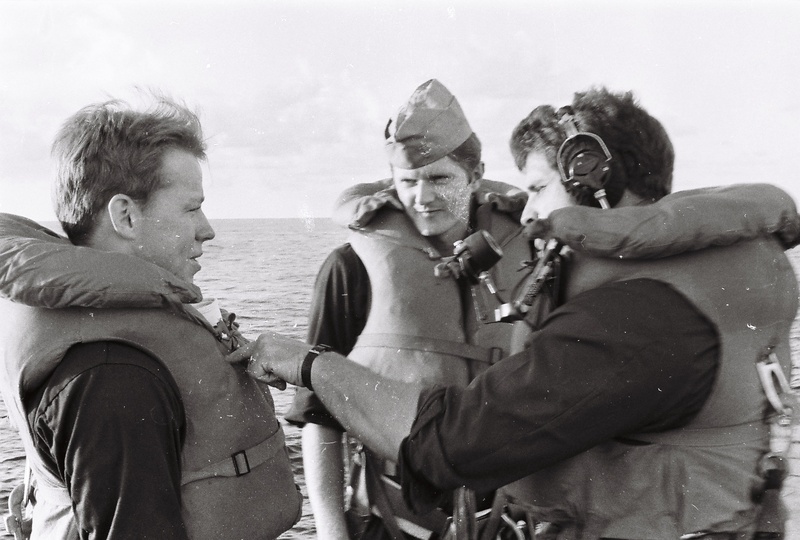 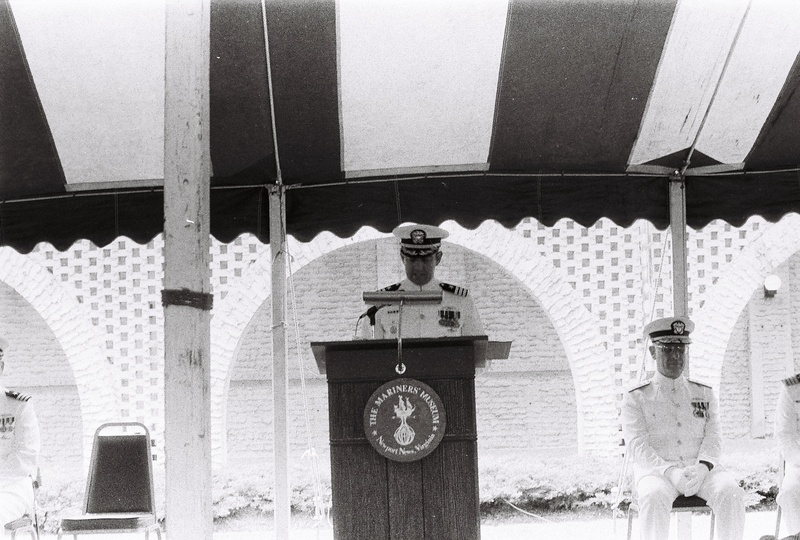 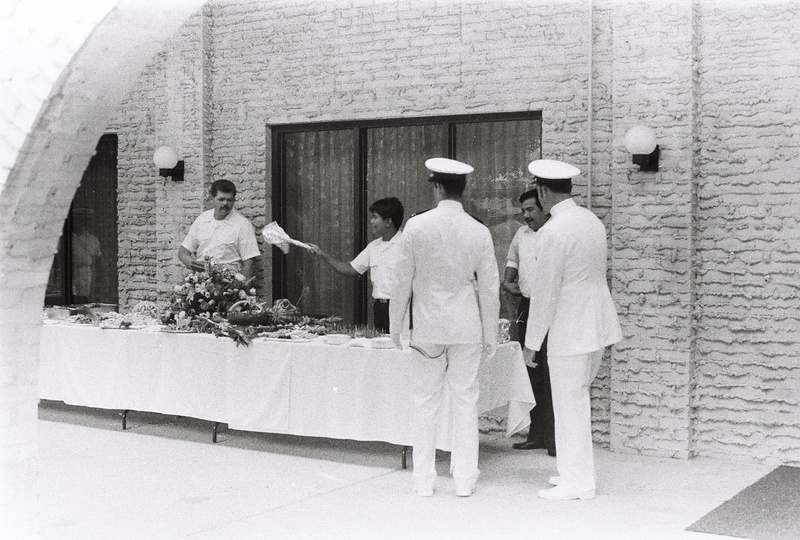 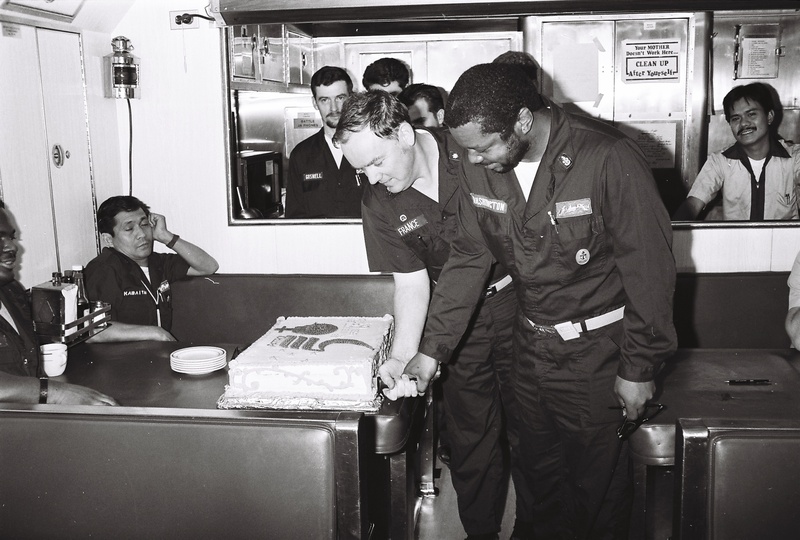 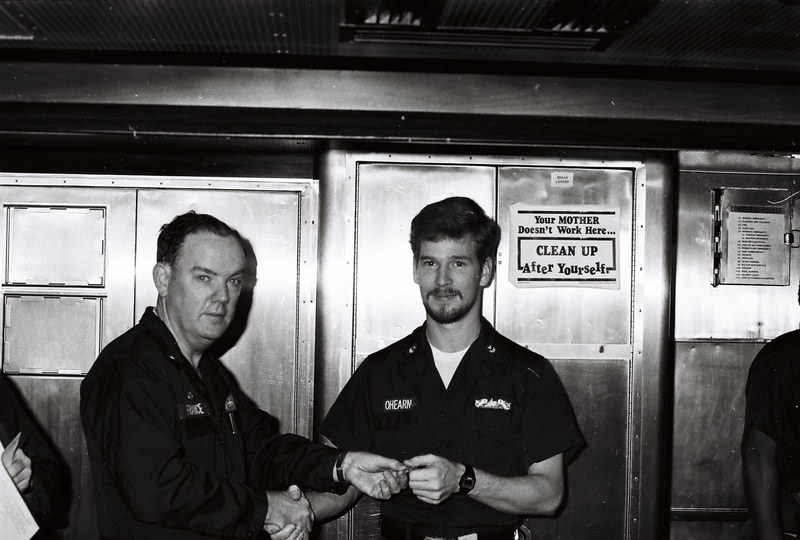 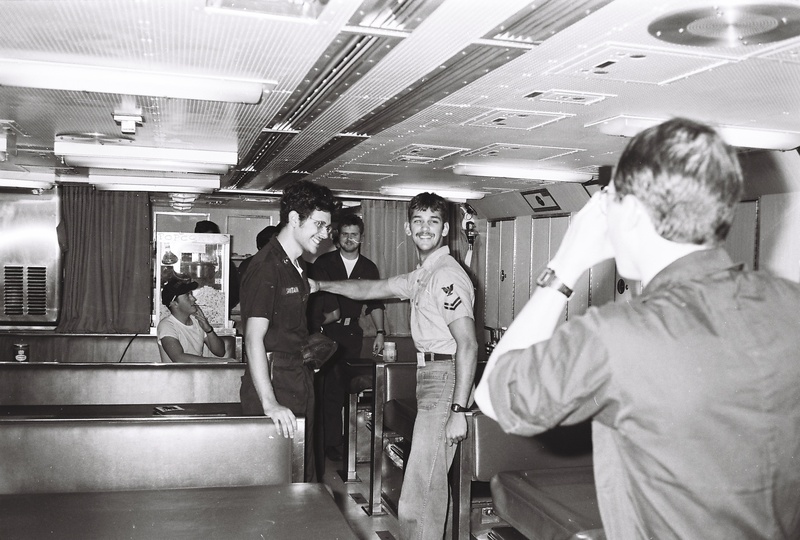 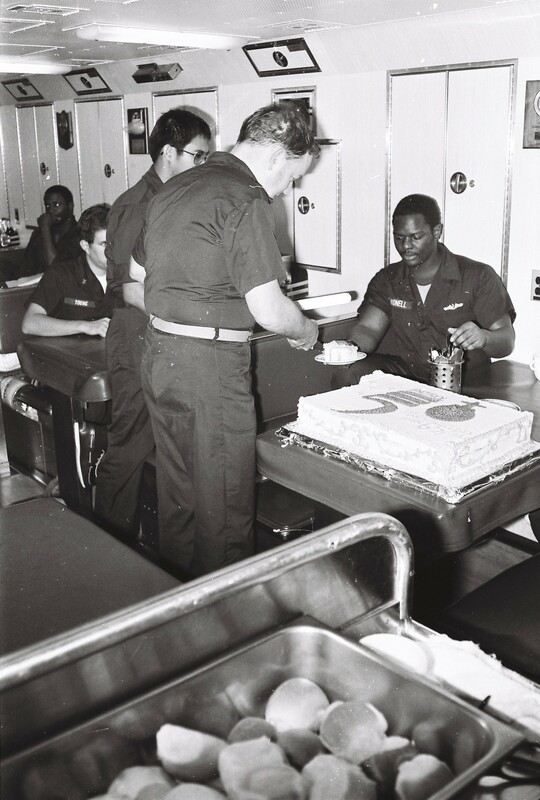 Lt Brown (Comm), RM1 Jeff Burke, CO Bajuk August 85 Re-enlistment. 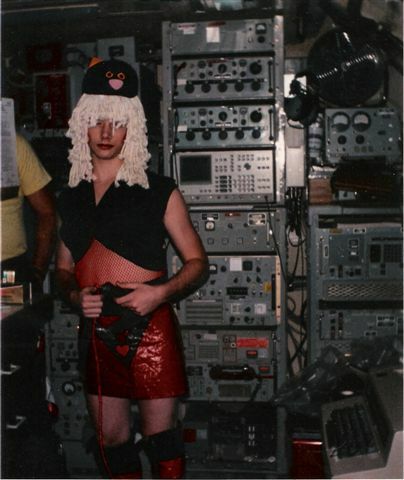 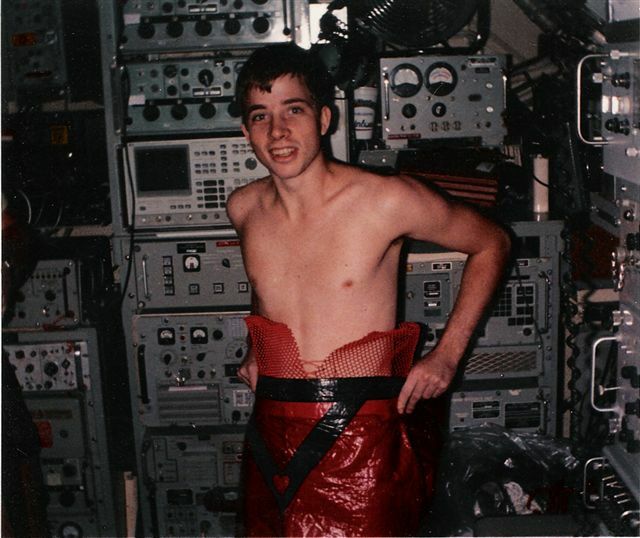 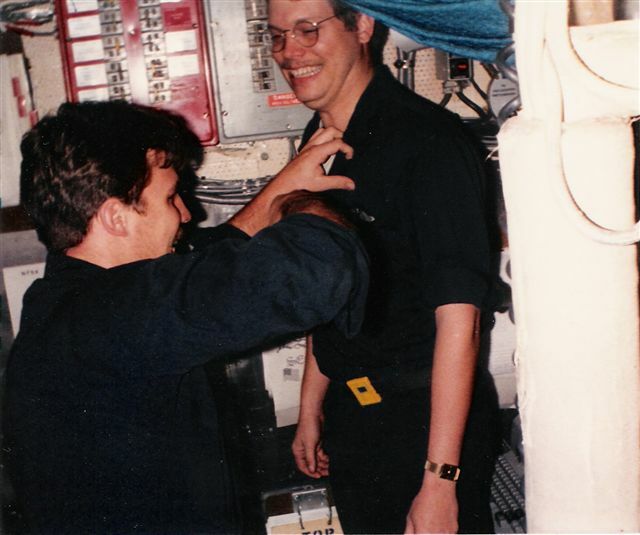 The next 30 pictures were submitted by Jeff..
Mark Palmer getting dressed for Miss Key contest - or is this how they really dressed in Radio when those doors were closed? 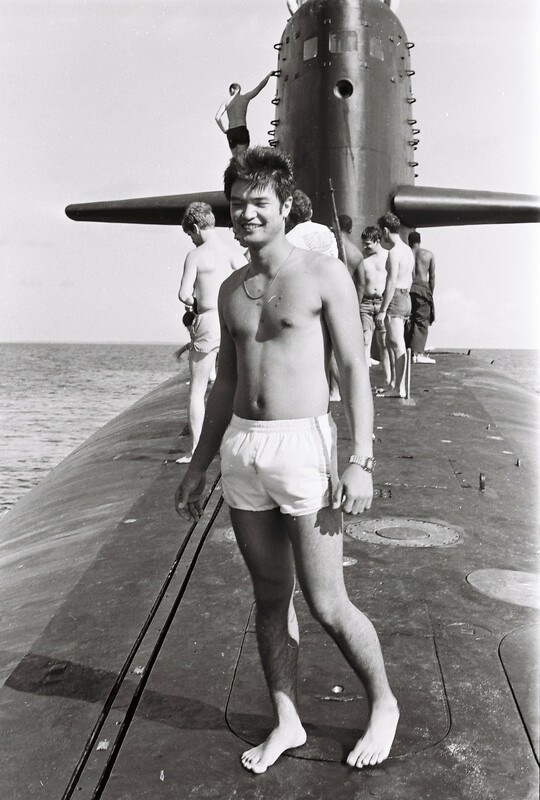 I'd give him a 10, especially after half a patrol without women. 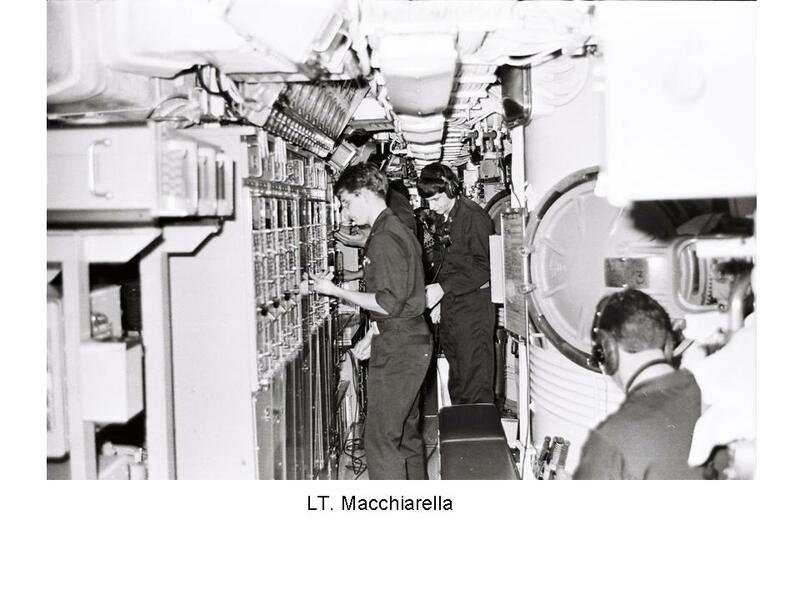 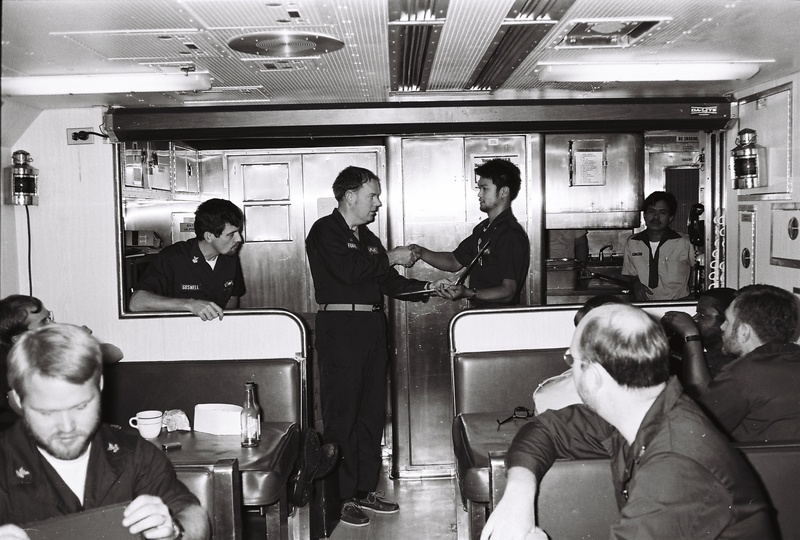 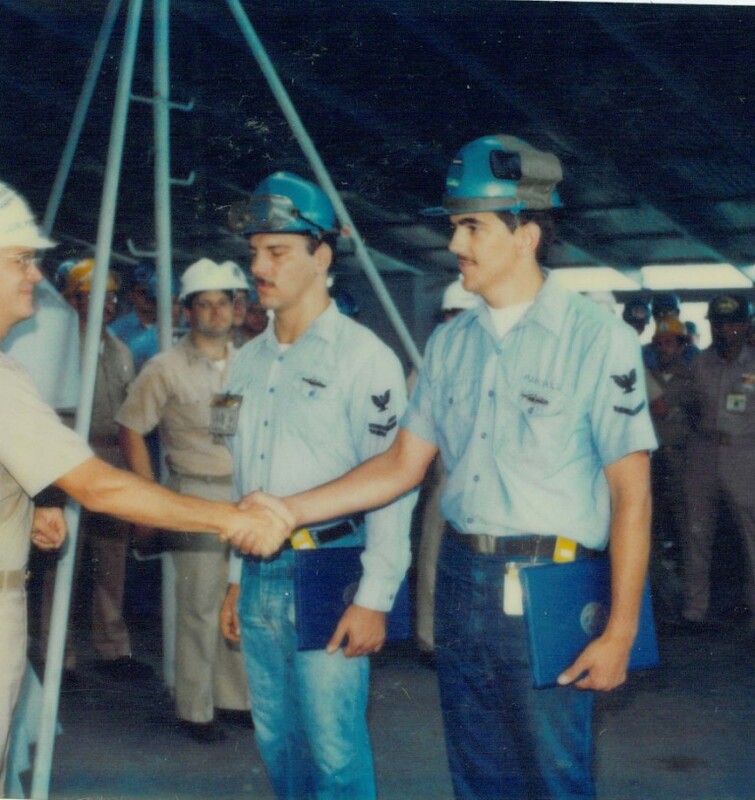 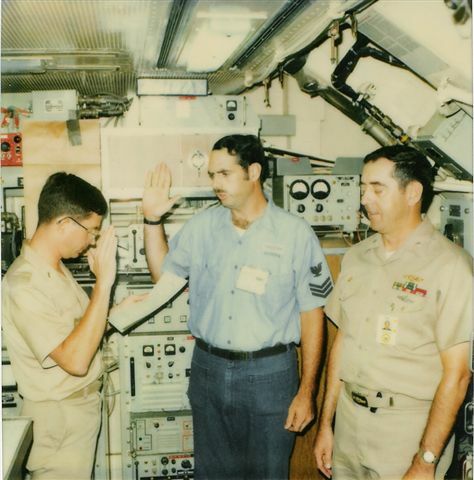 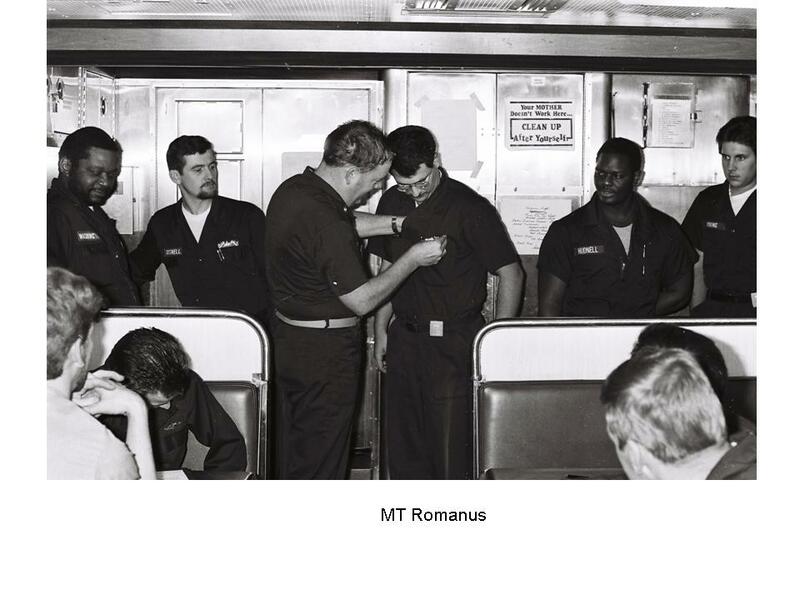 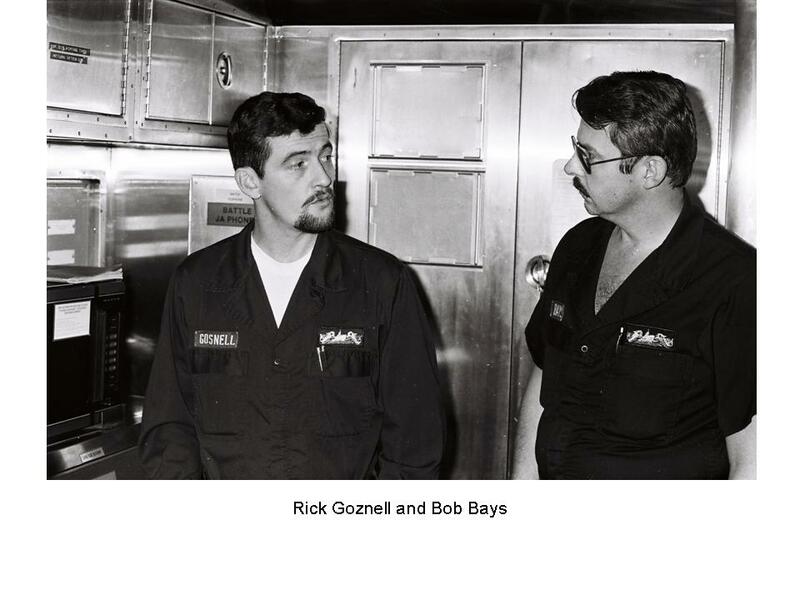 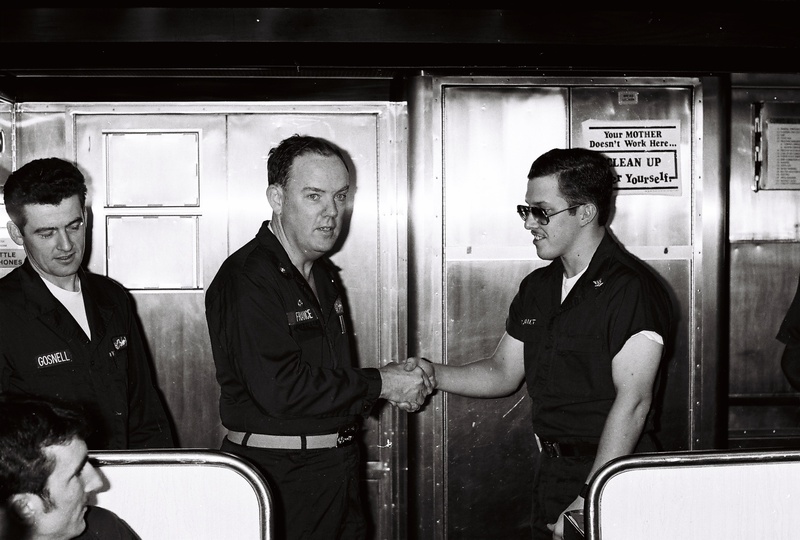 Don "Dog" Galito on left, RMCS Steve Danzis in middle. 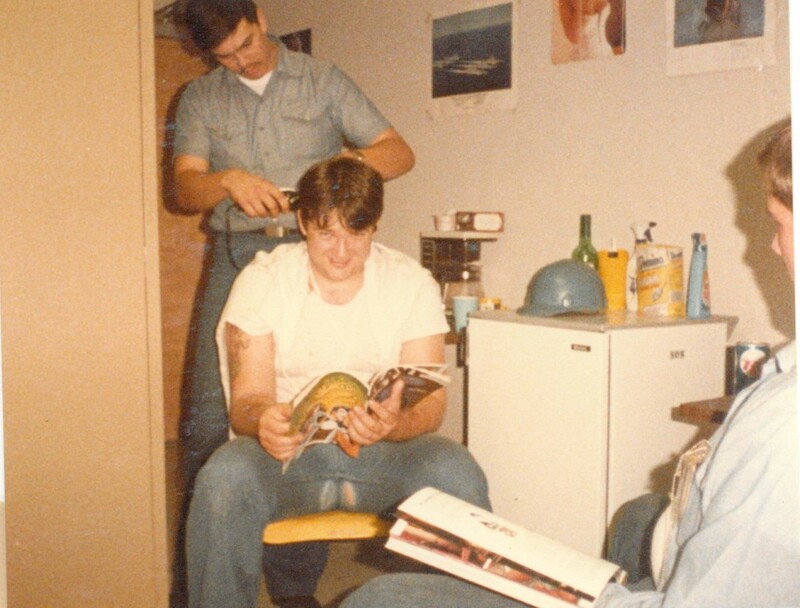 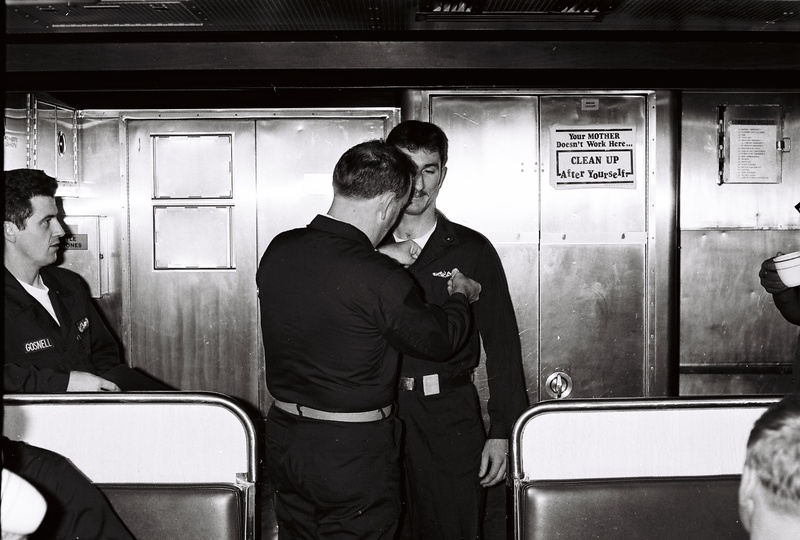 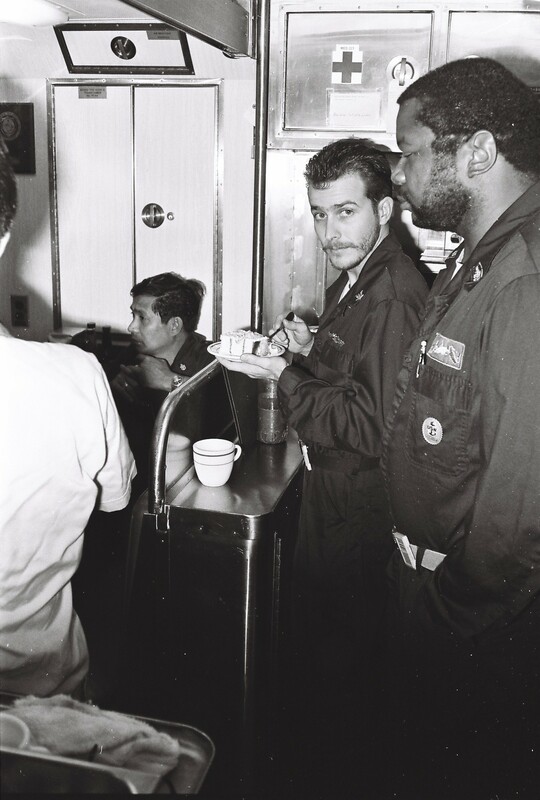 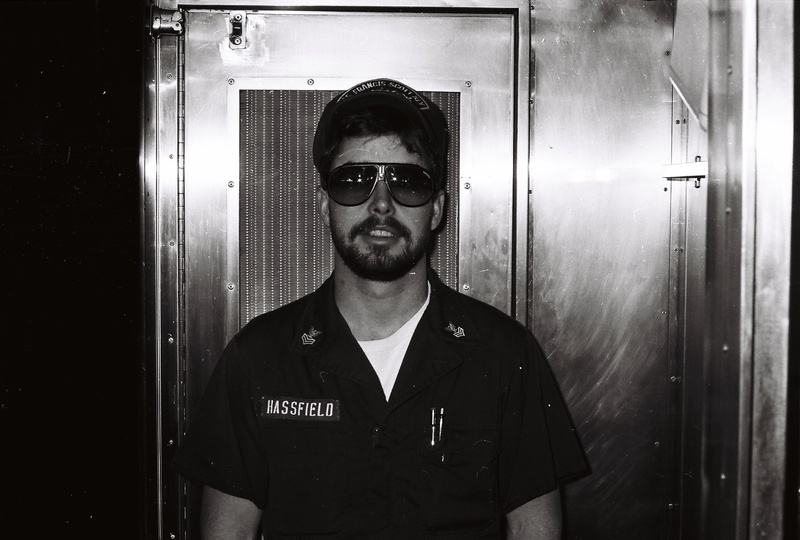 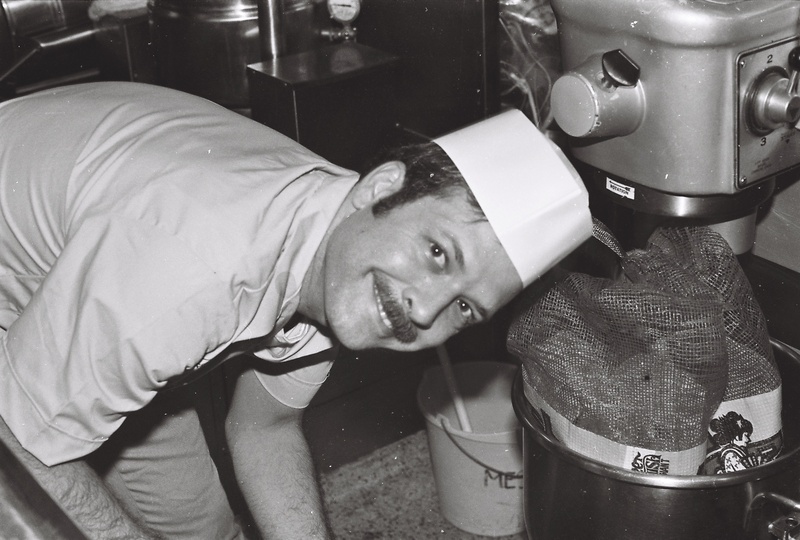 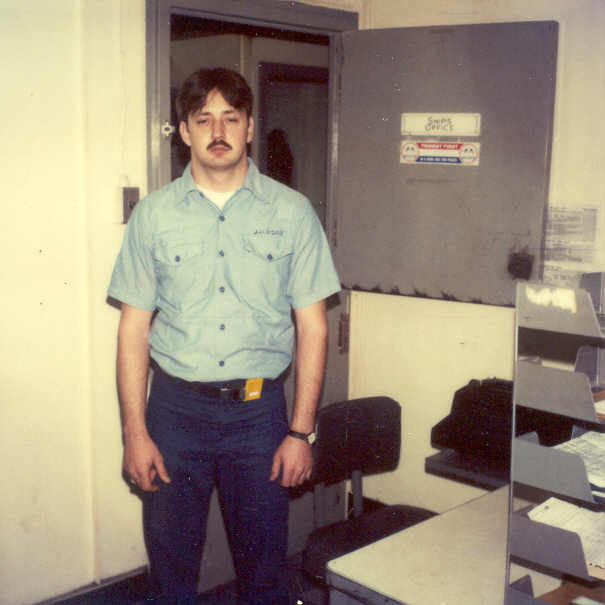 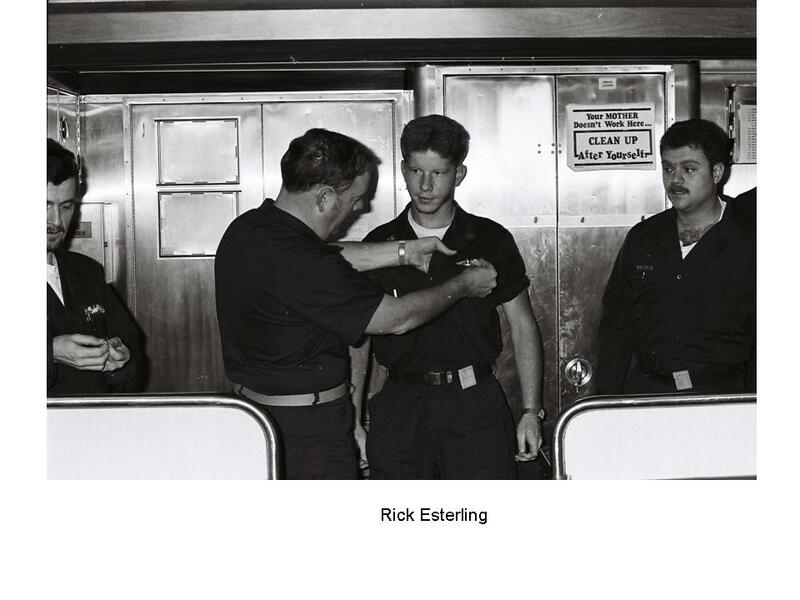 Read about Steve in Eternal Patrol. 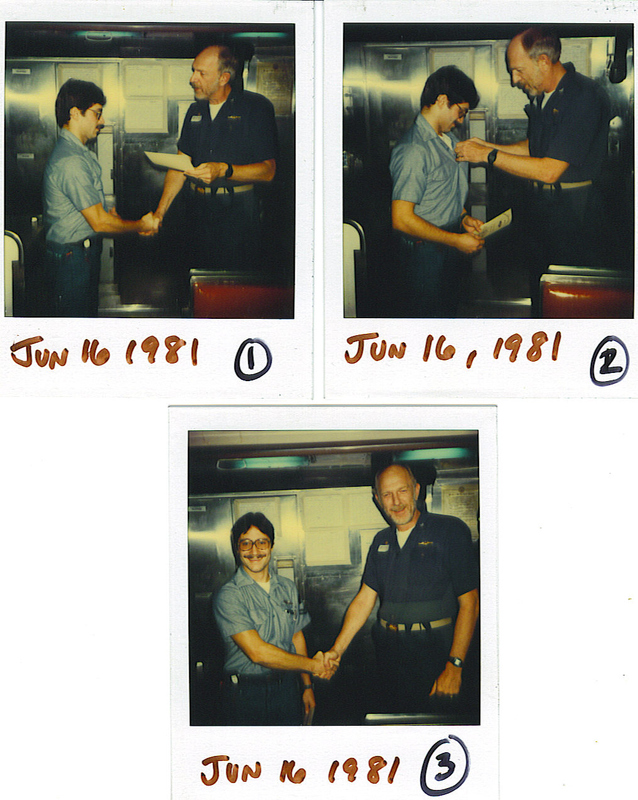 Andy Sierra taking the video you can view on this web site. 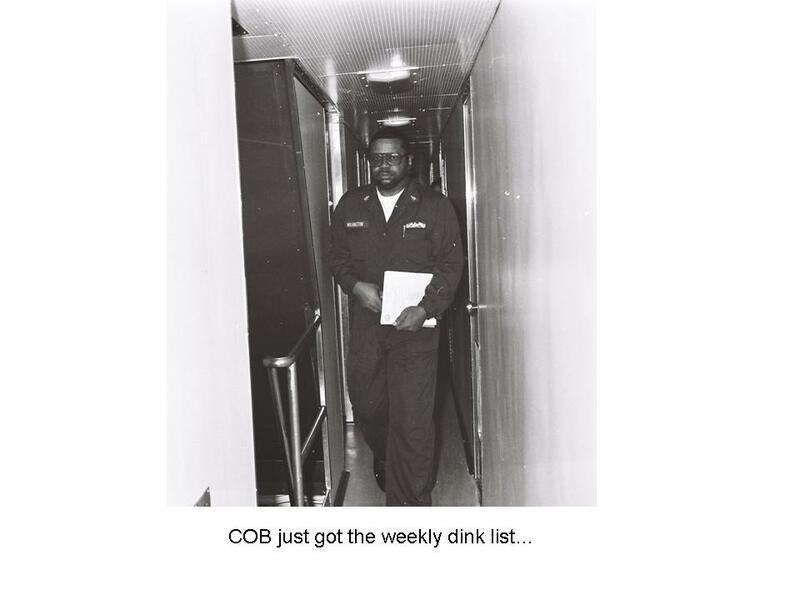 COB Rhinehart, Pam Burke and Jeff Burke. 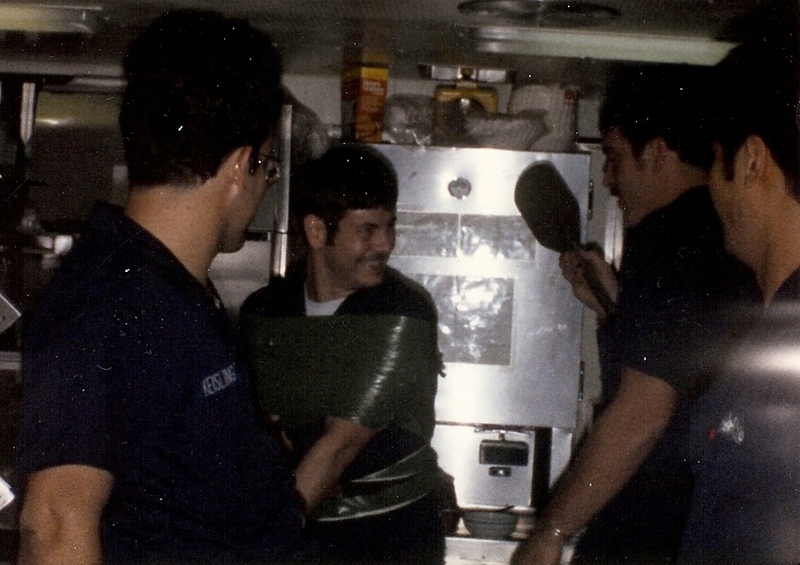 Patrol 70, RM1 Quinton Martin smashing RM2 Jeffery Reiser with a pie. 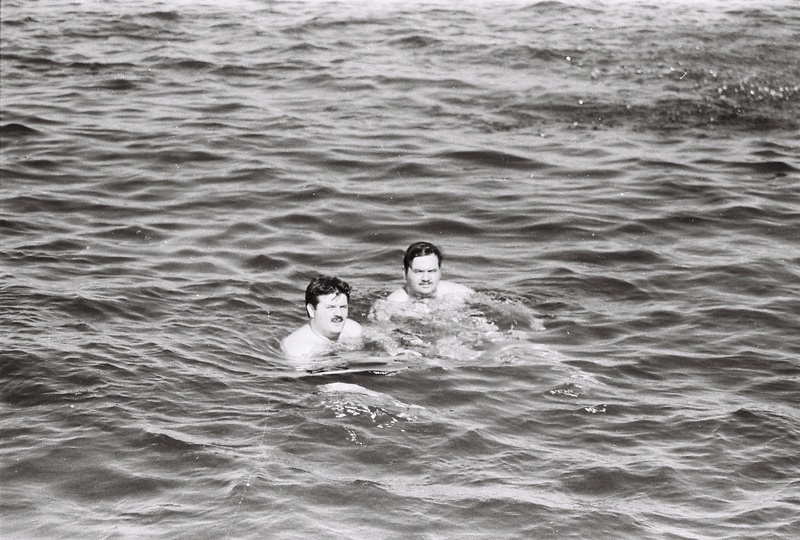 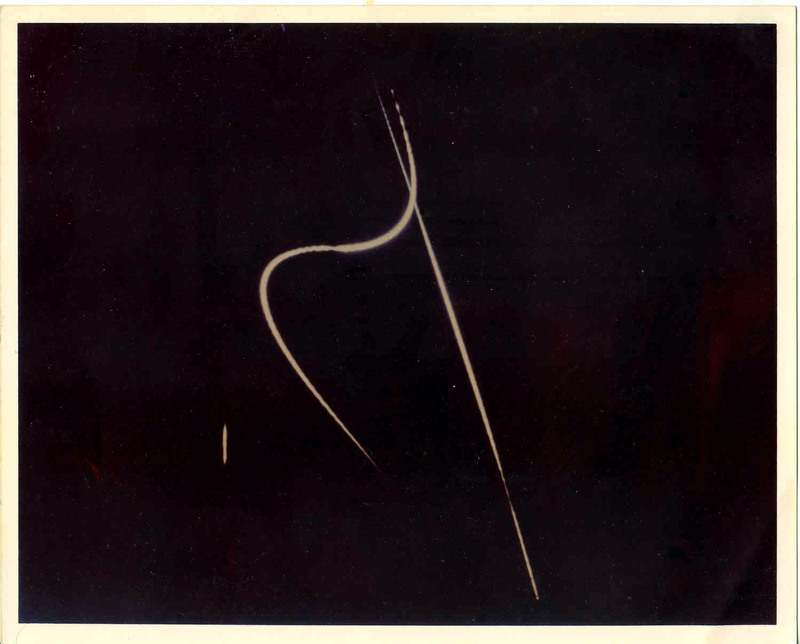 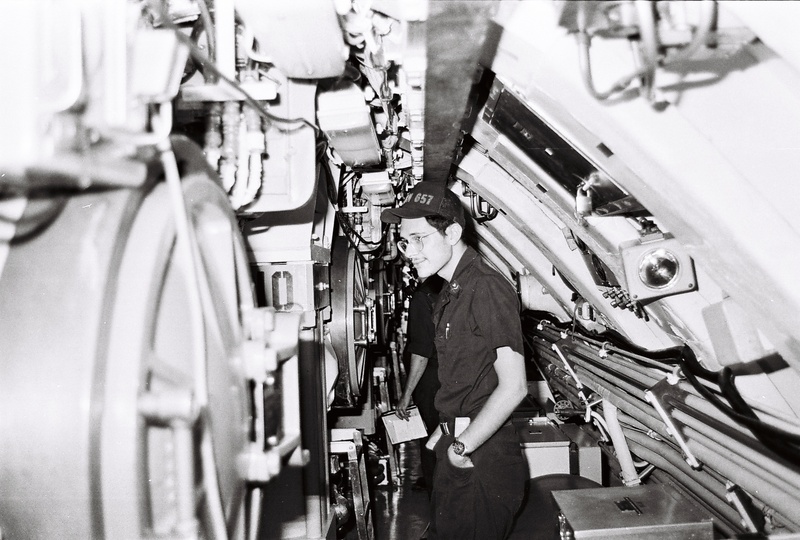 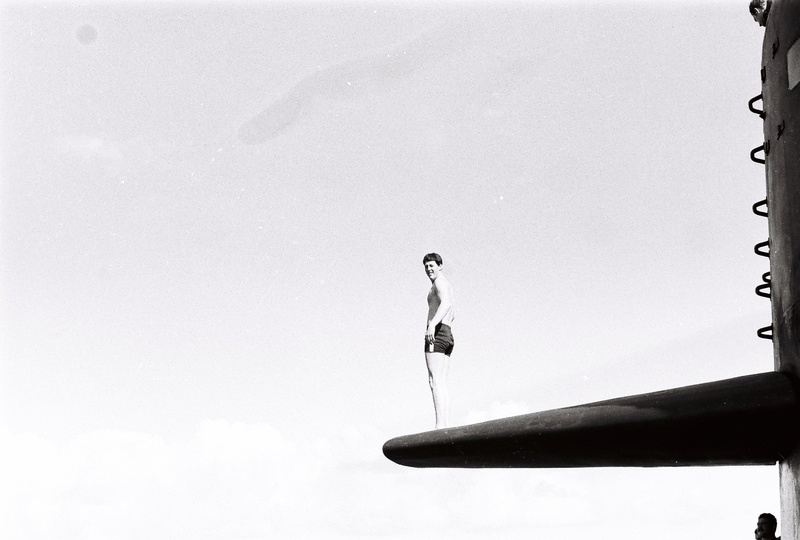 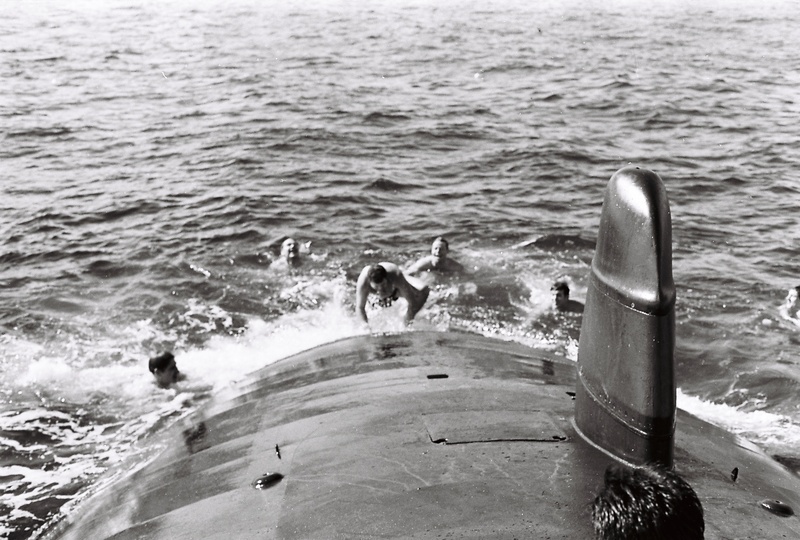 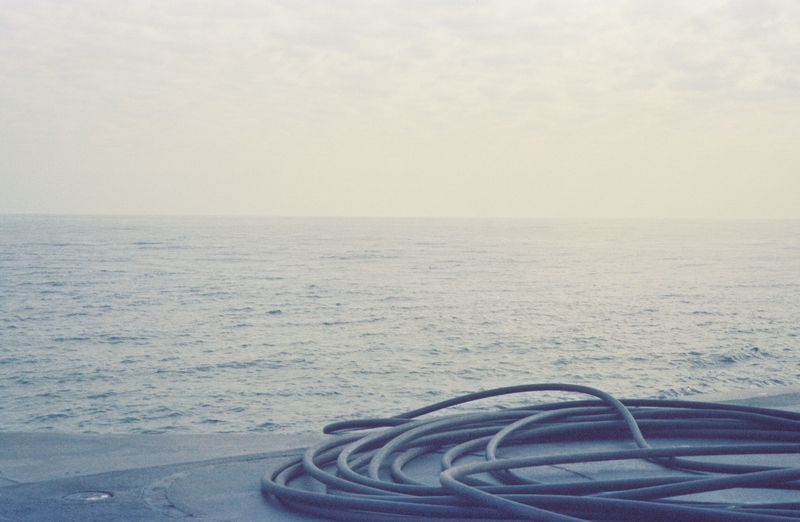 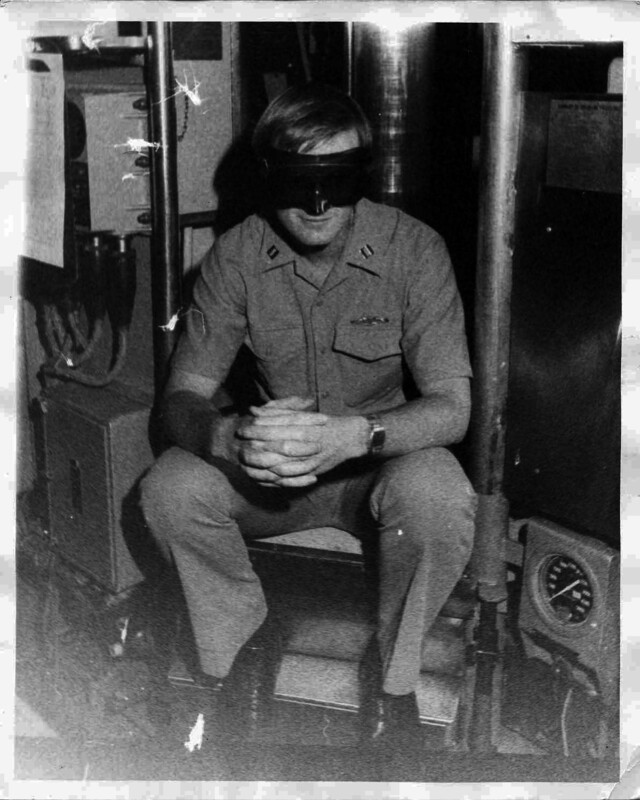 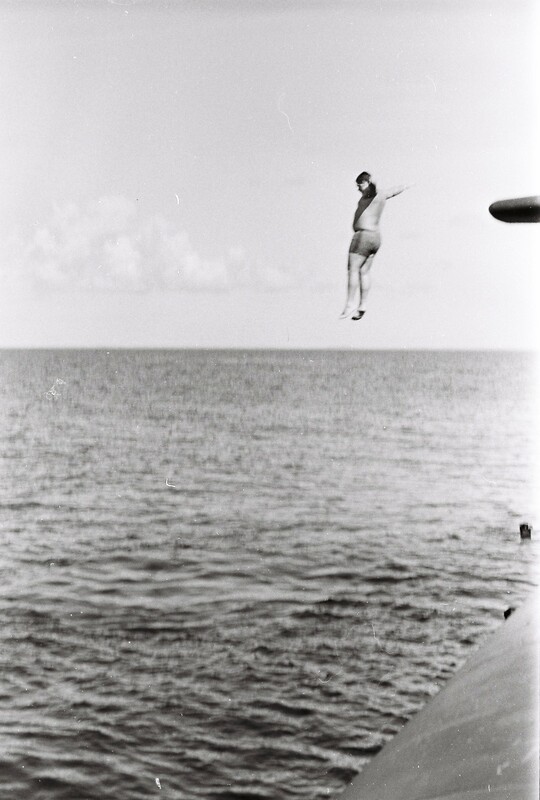 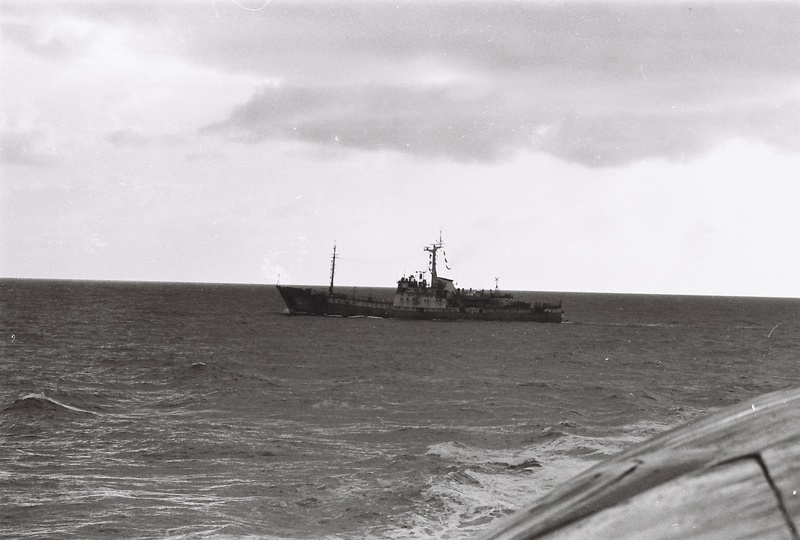 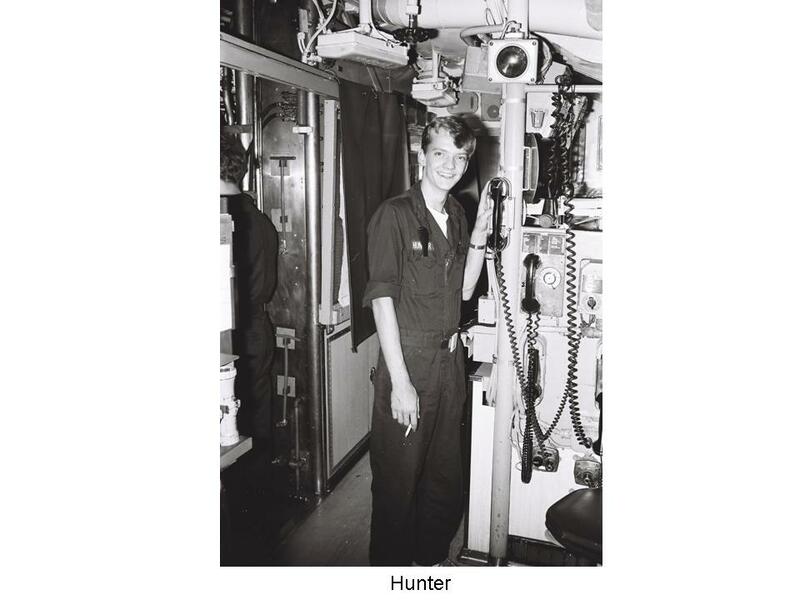 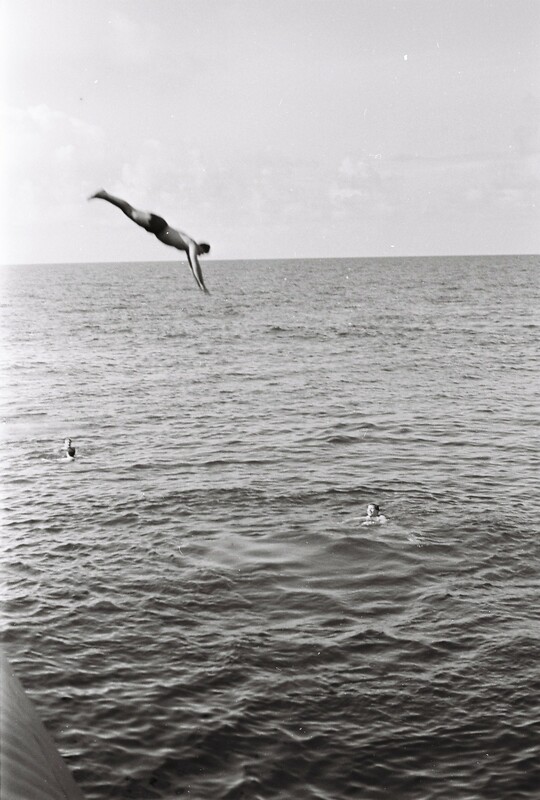 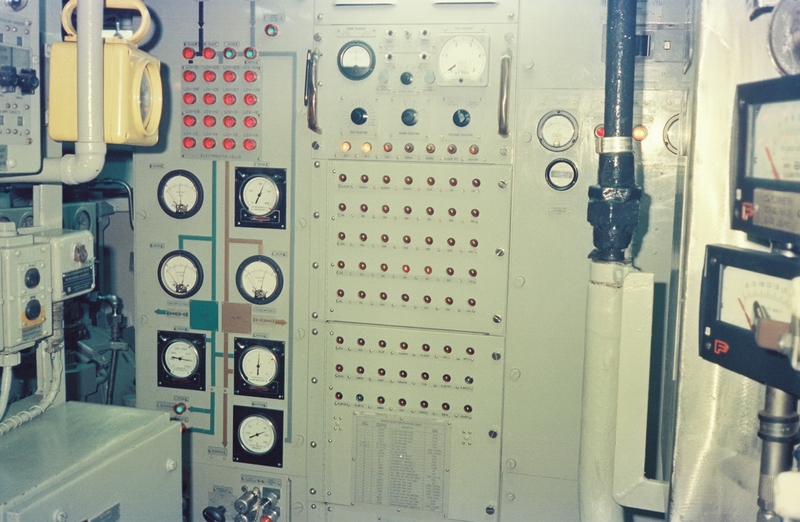 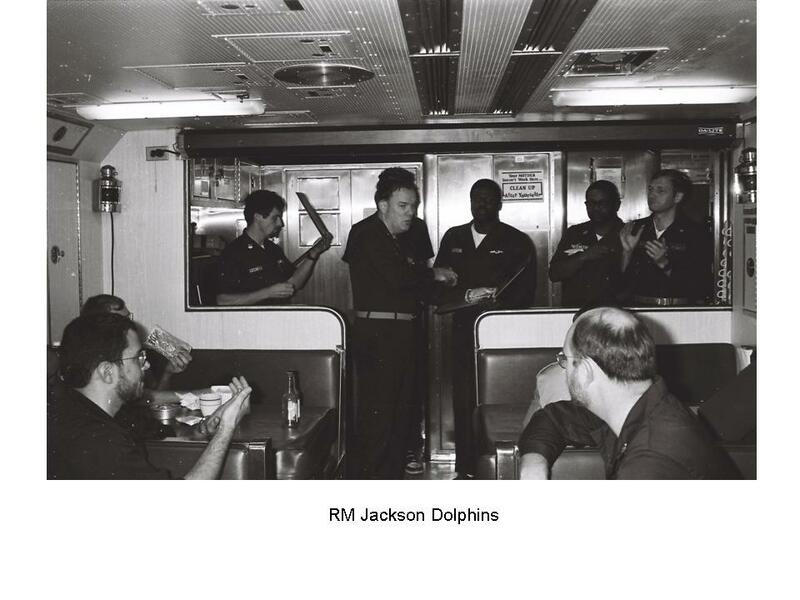 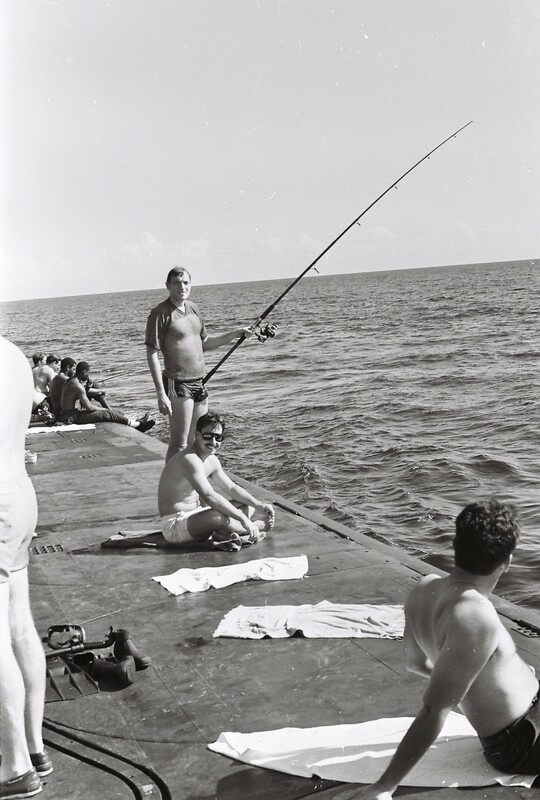 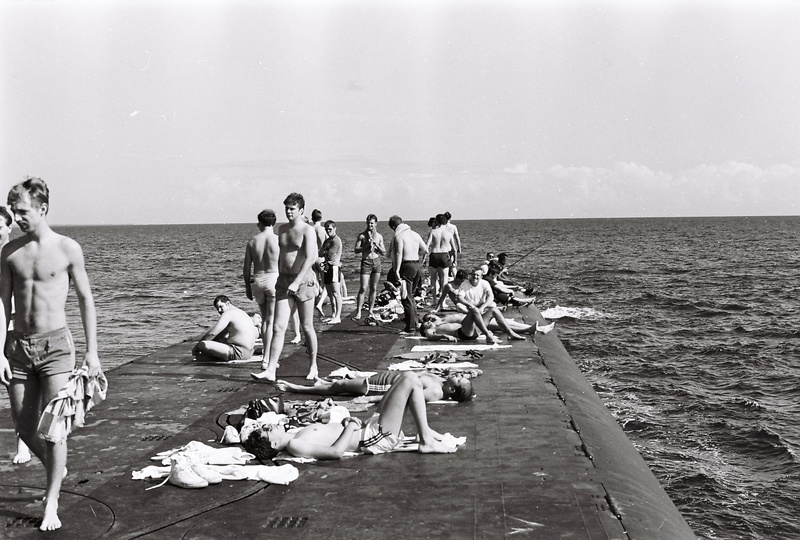 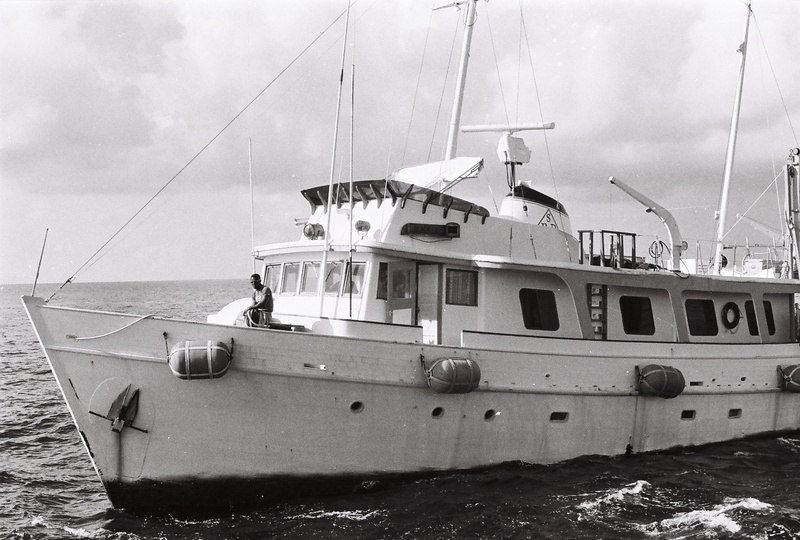 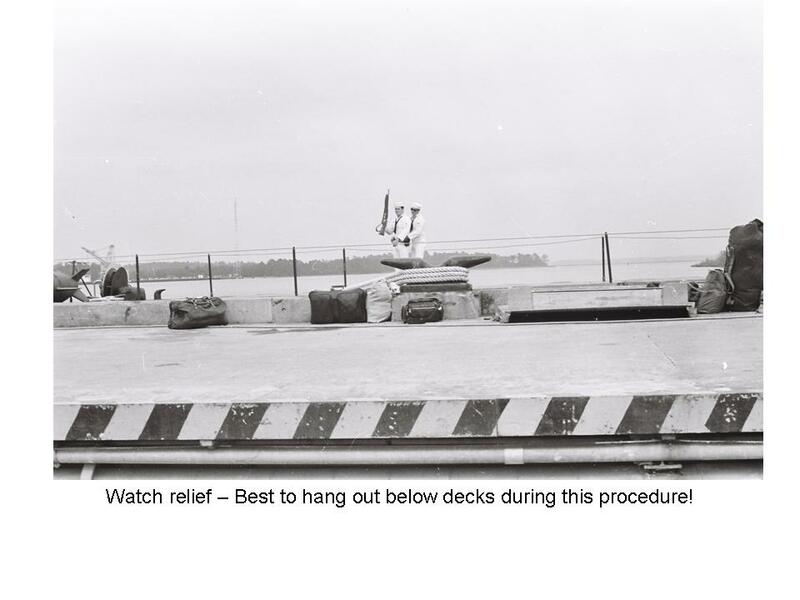 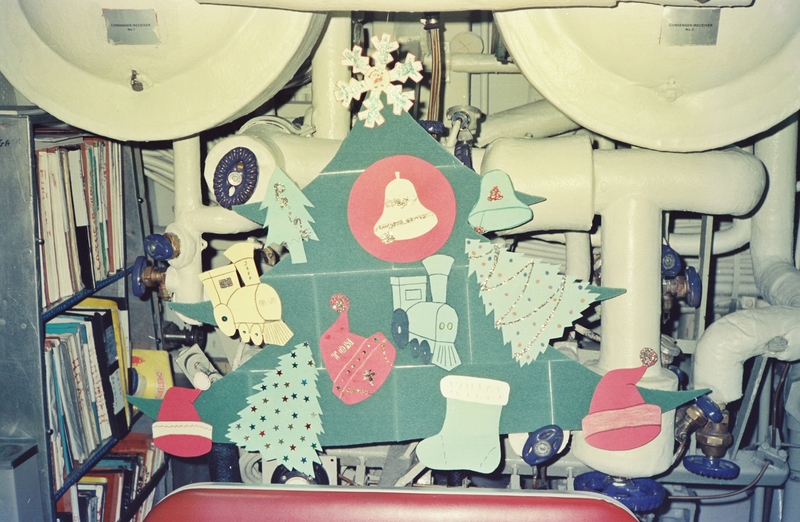 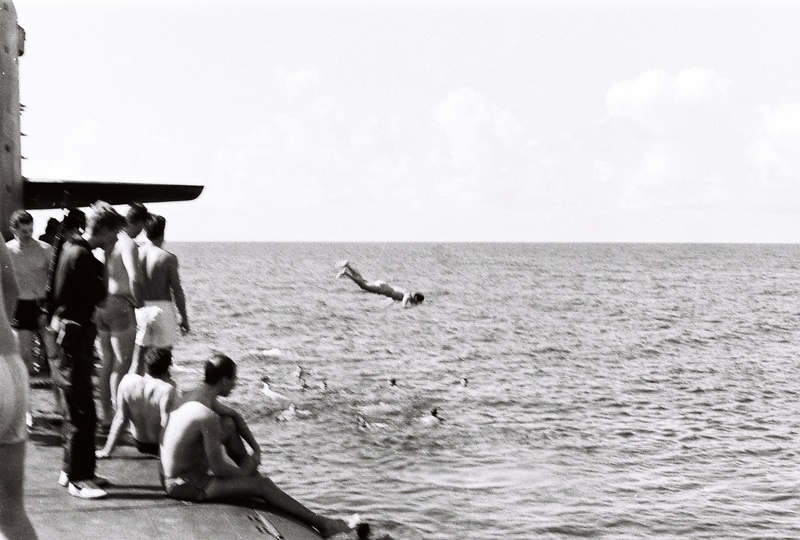 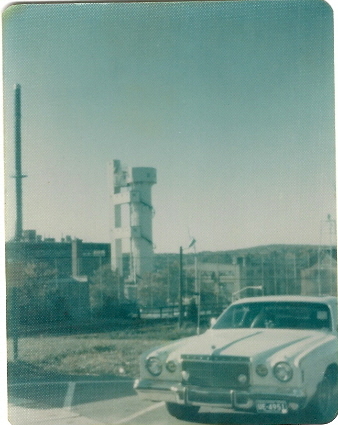 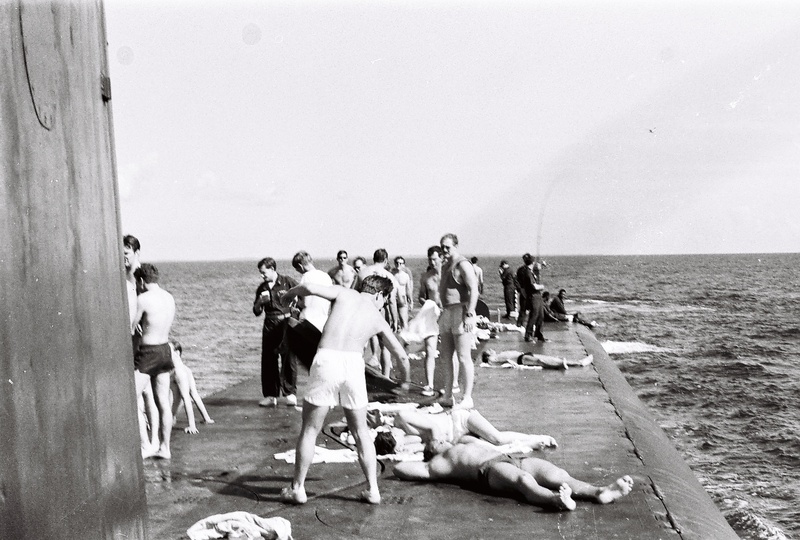 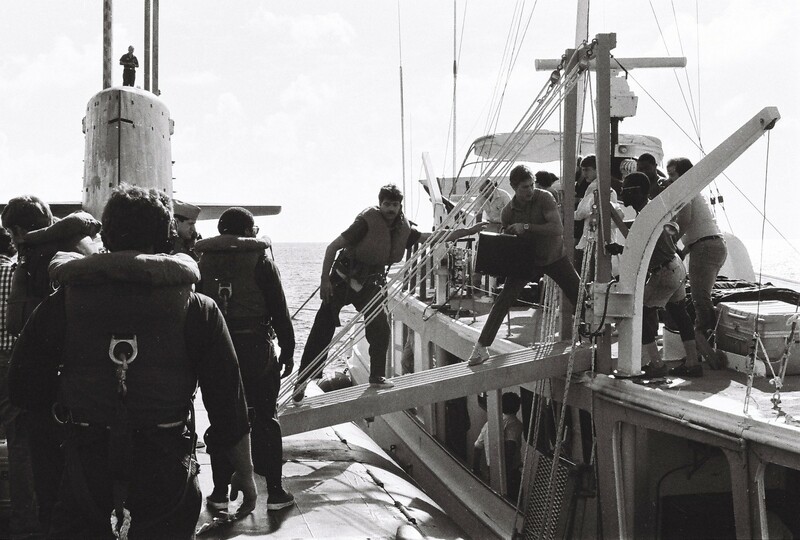 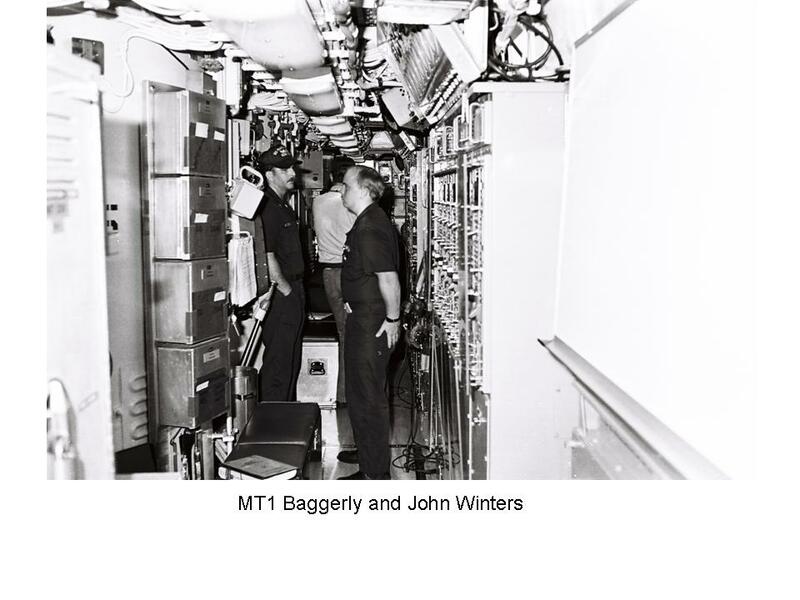 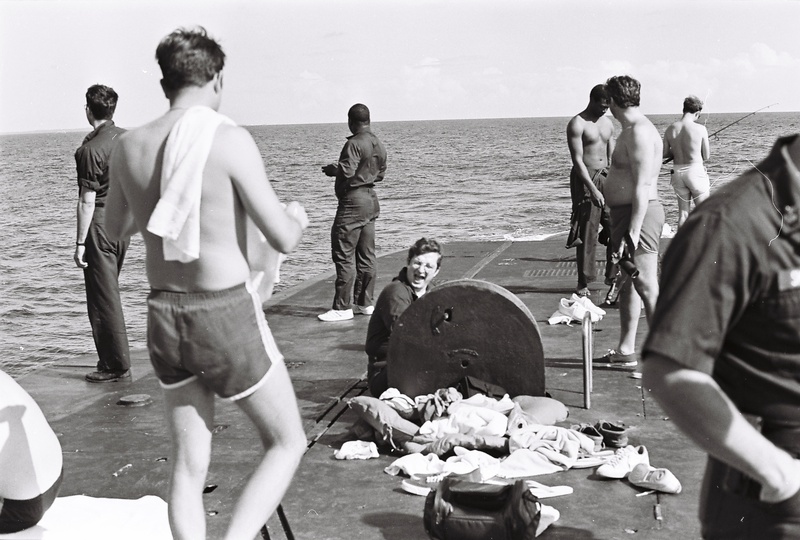 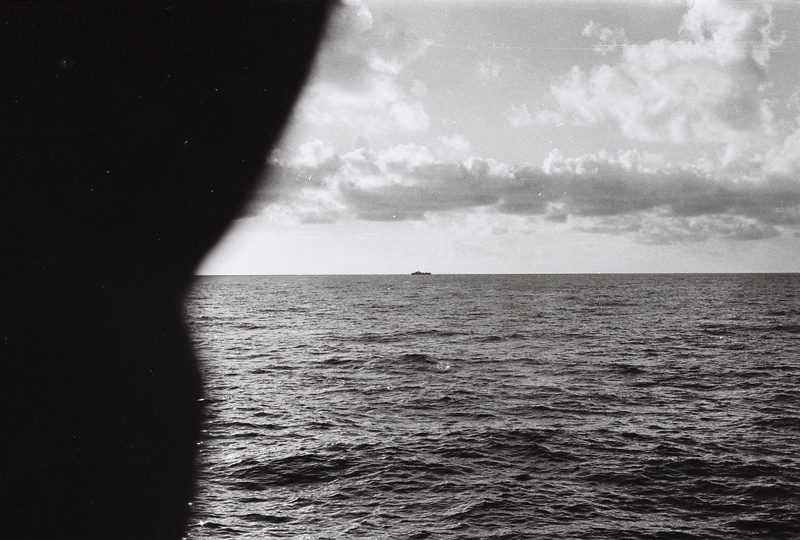 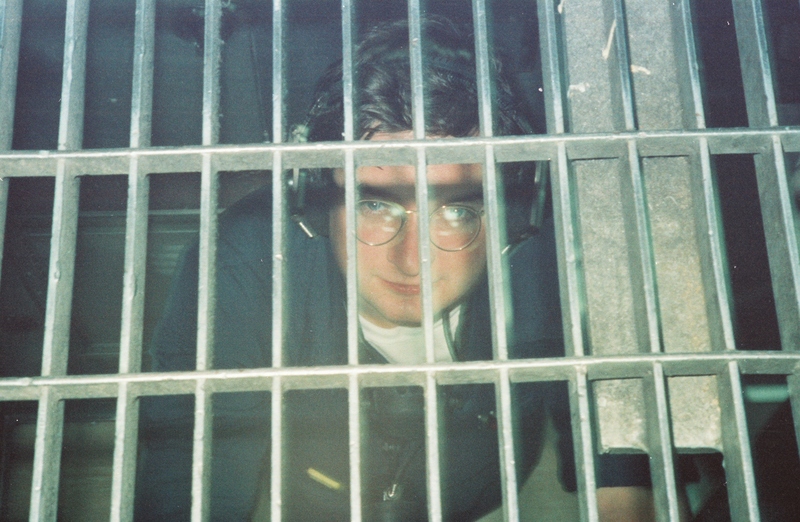 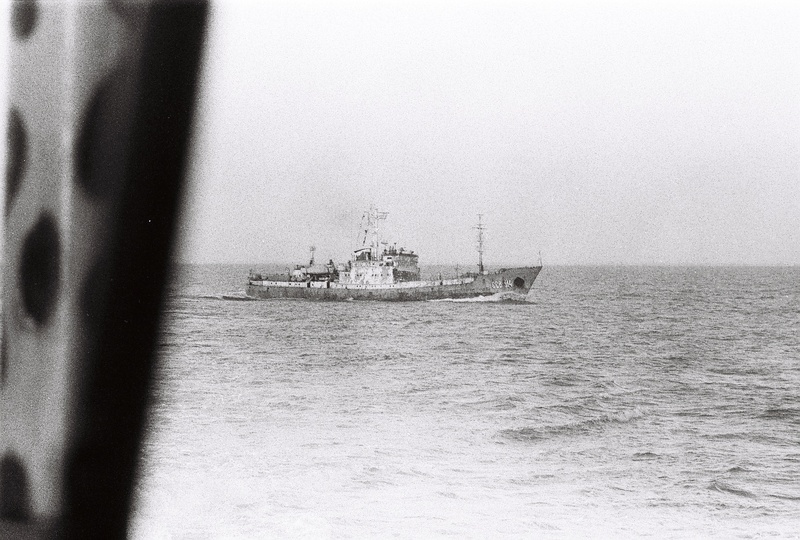 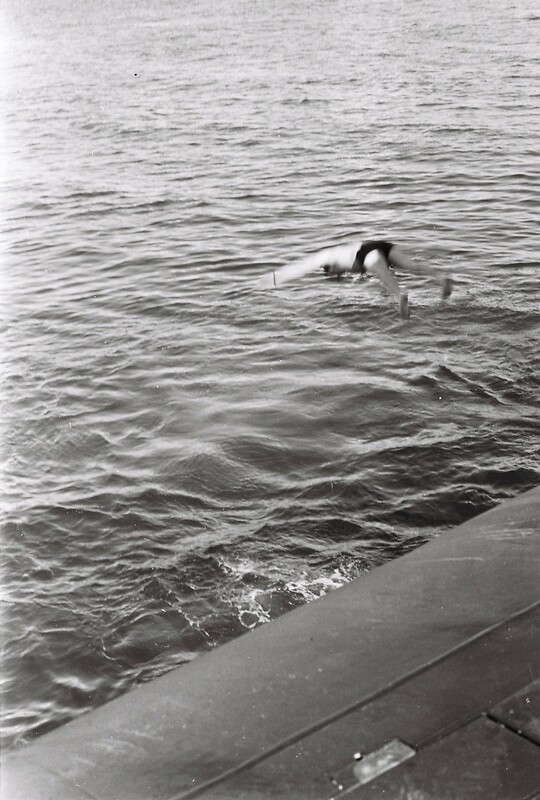 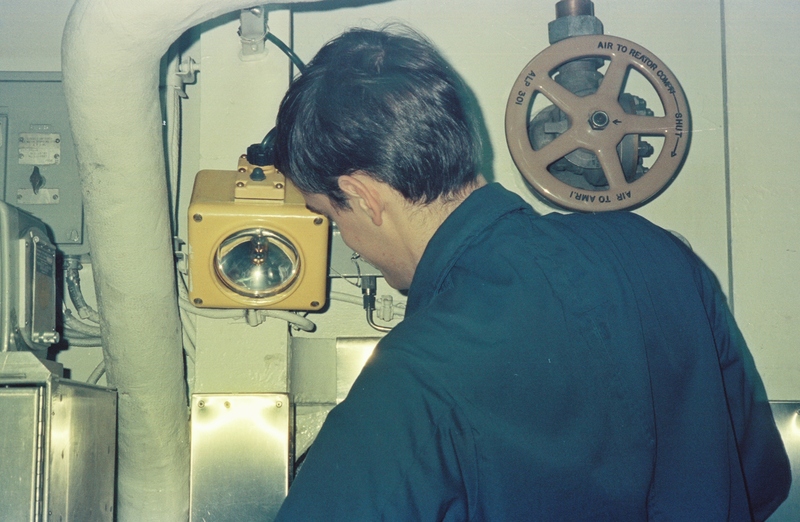 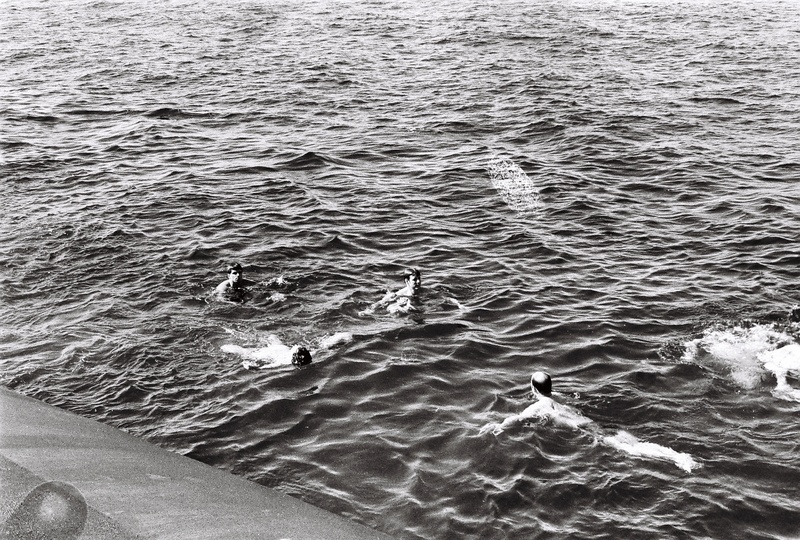 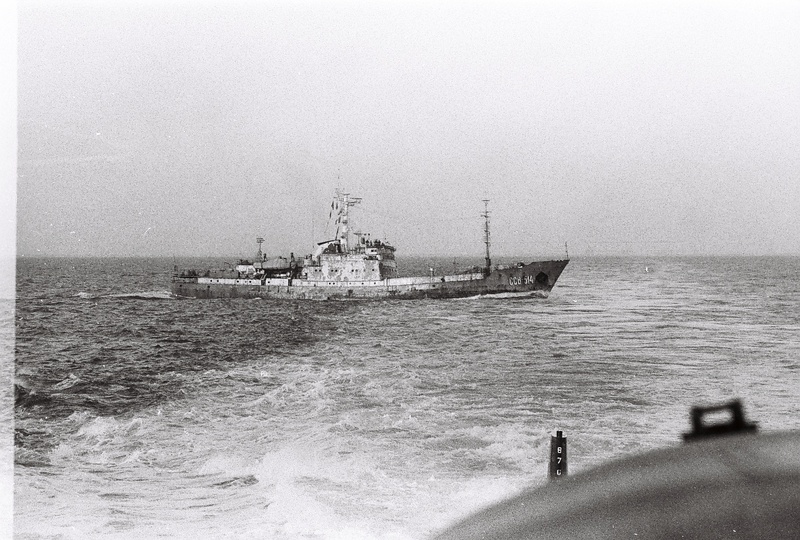 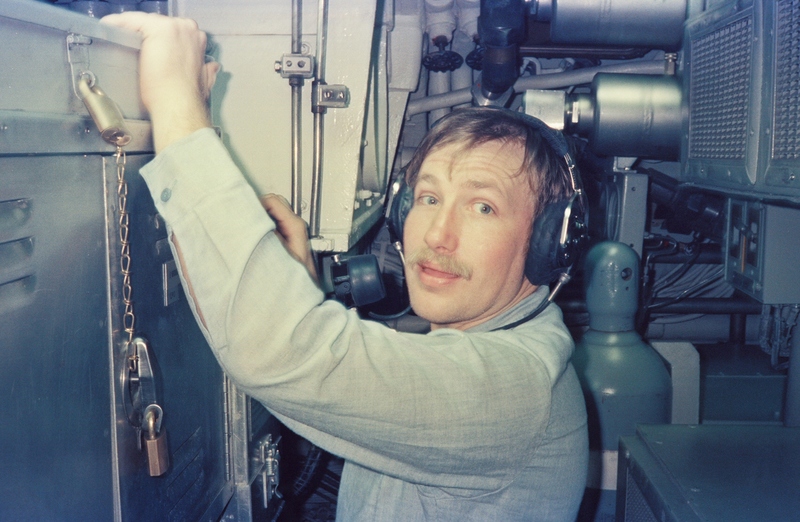 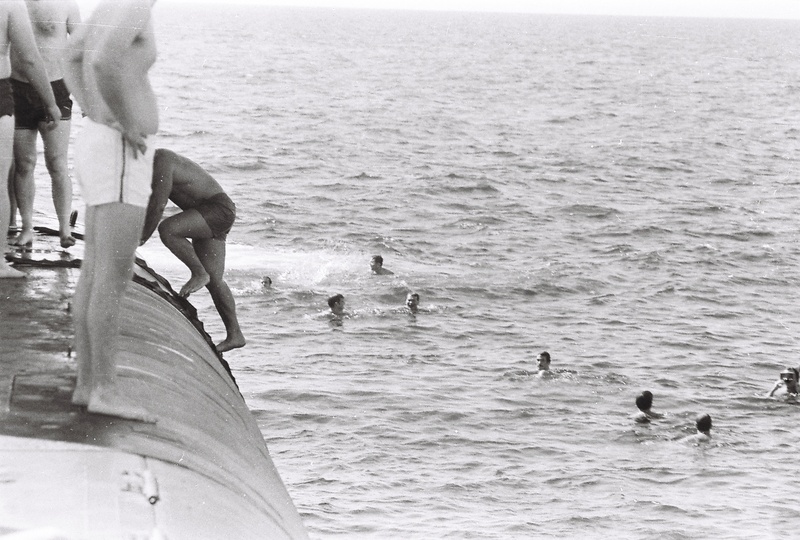 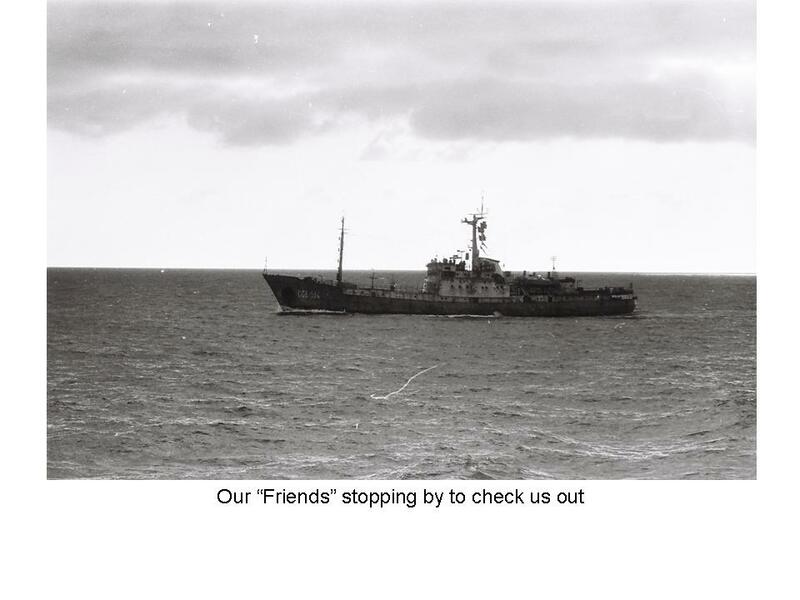 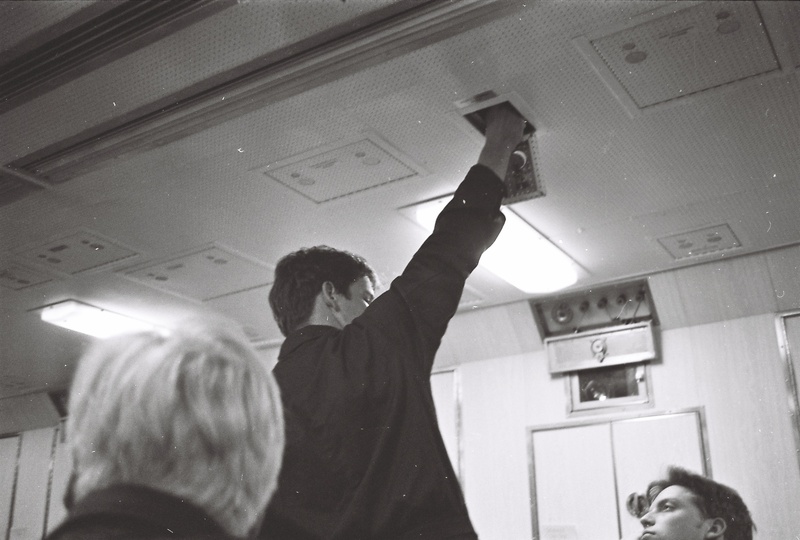 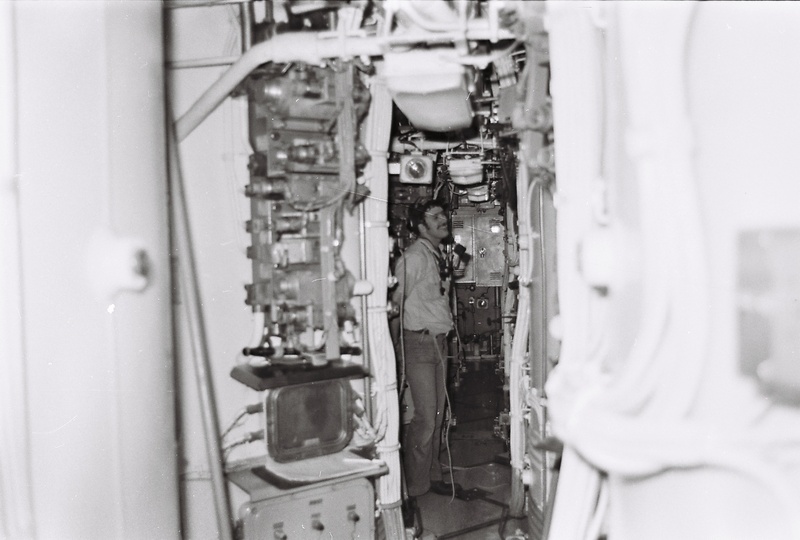 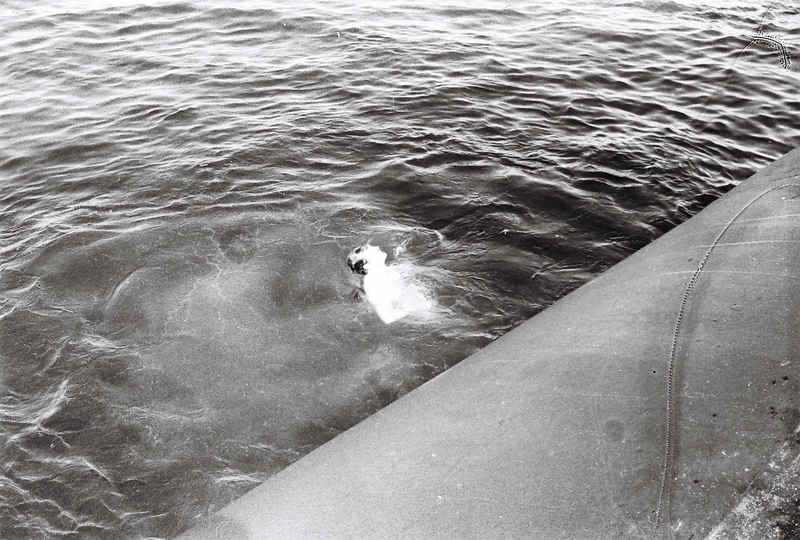 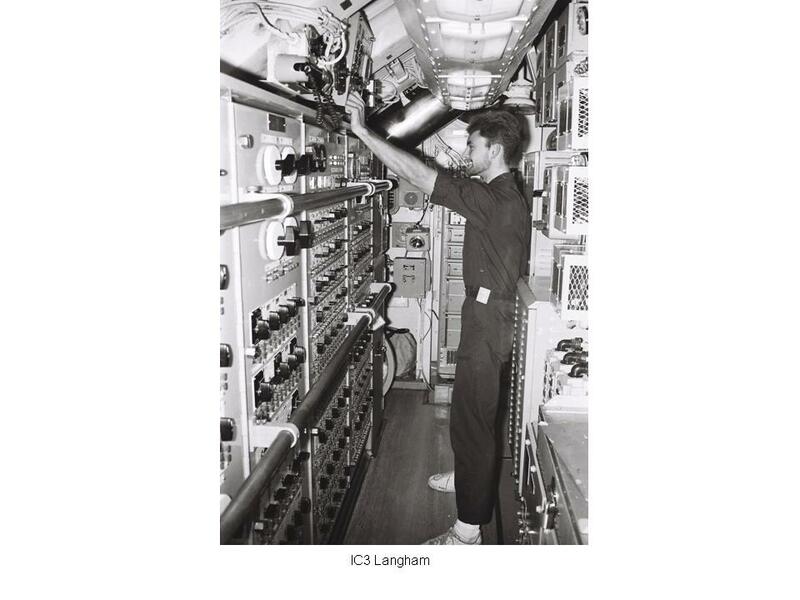 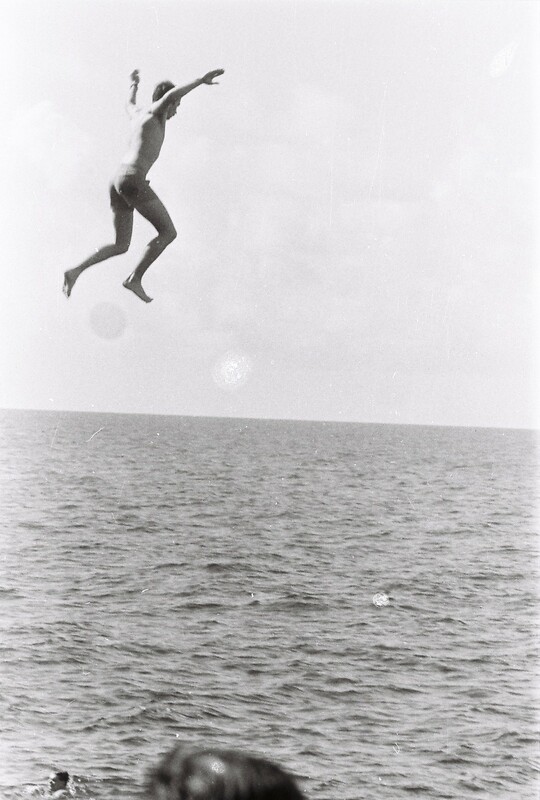 Photo taken in Radio by James Britton, Navigator. 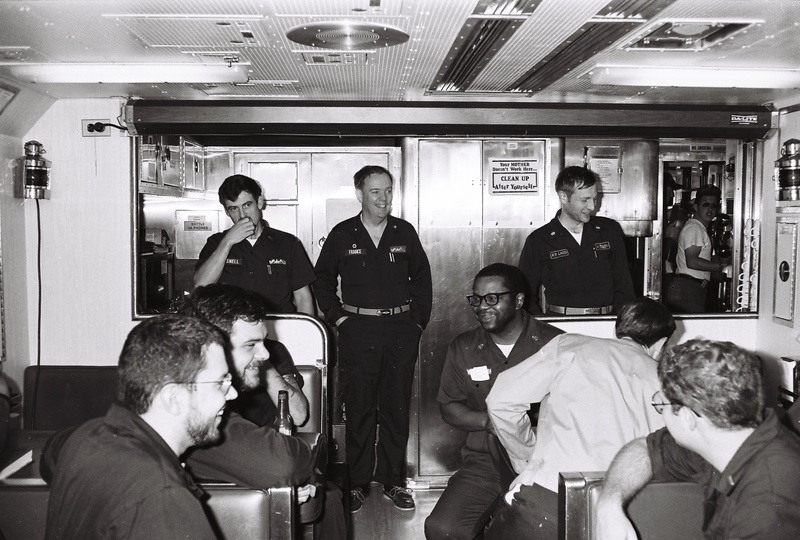 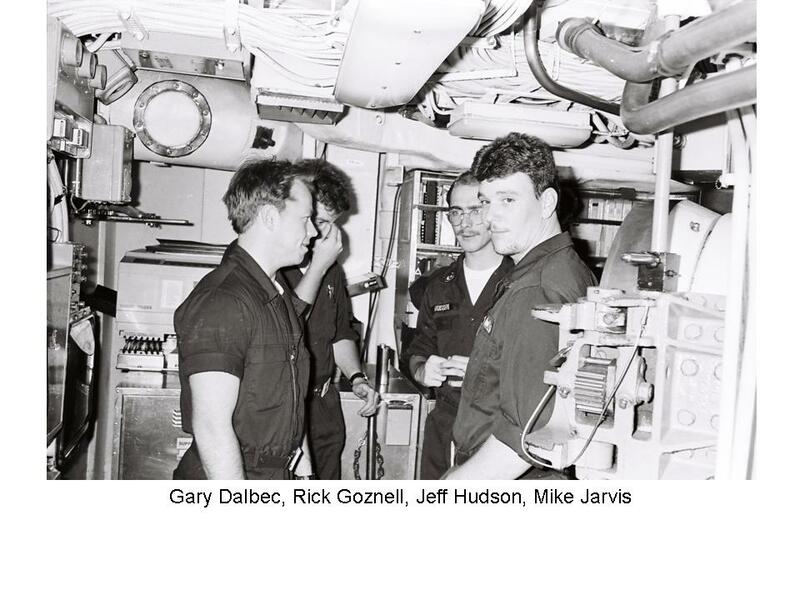 L to R: Helvy Johnson, Mark Drummond, Alan Biggler, John Bohn, Dale Philaya. 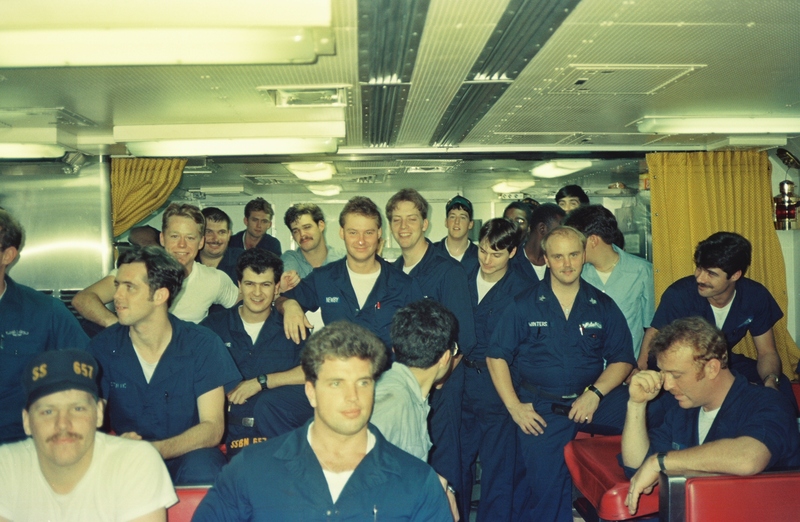 Bottom row: Jeffery Reiser, Phil Bell. 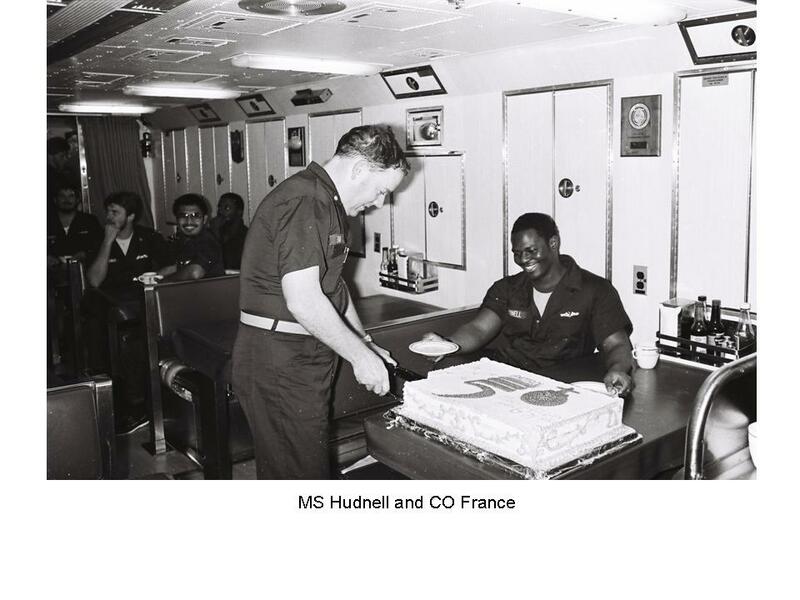 RM2 Flournoy & RM2 Faulkner. 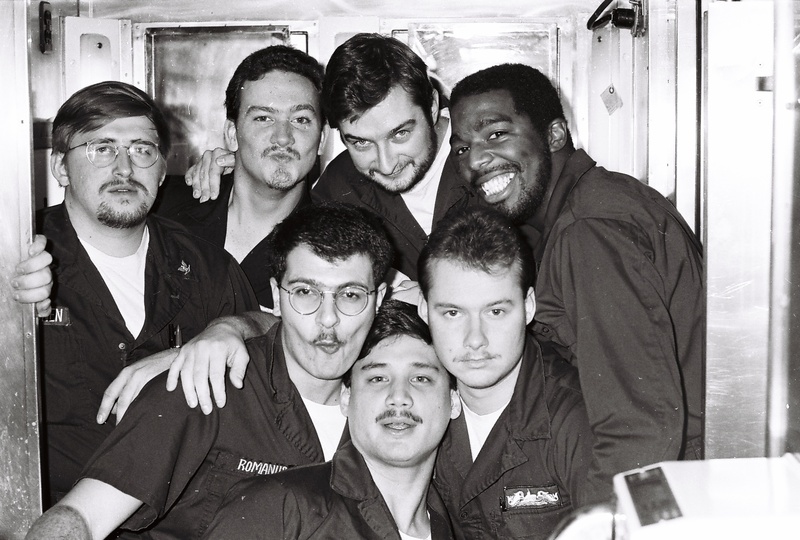 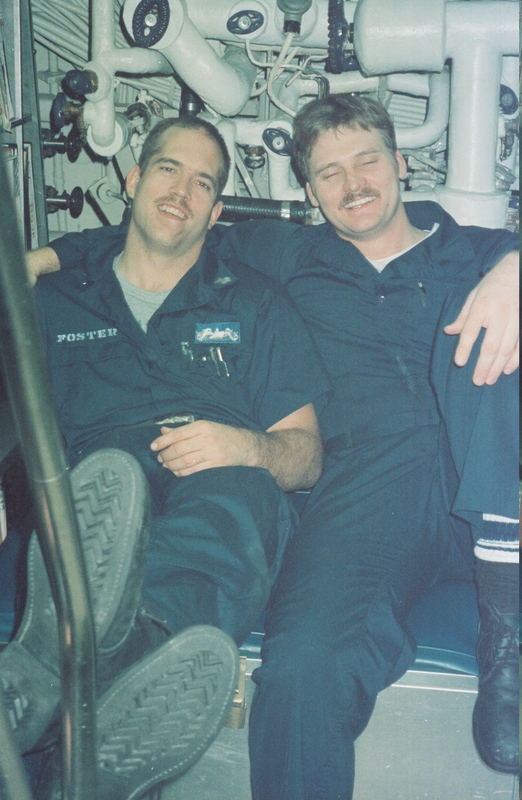 The next 30 pictures were supplied by Mike Faulkner and are of the gold crew from 1985 - 88. 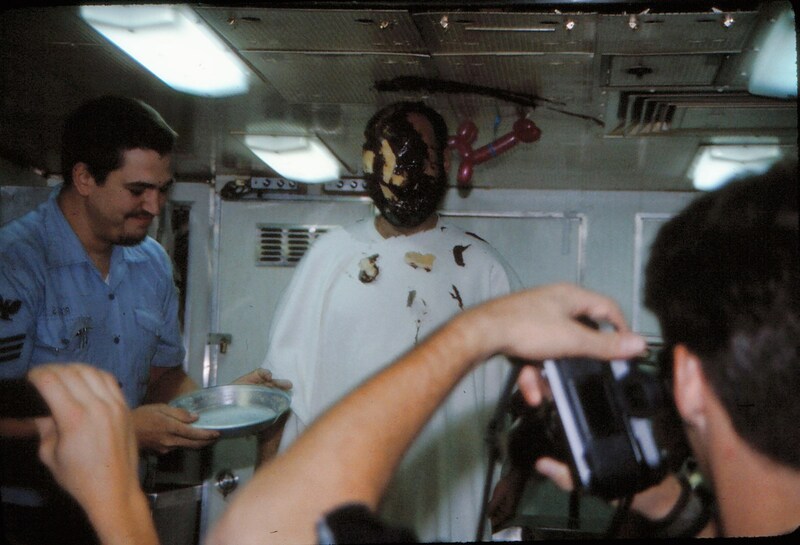 Junior Millison gets a pie. 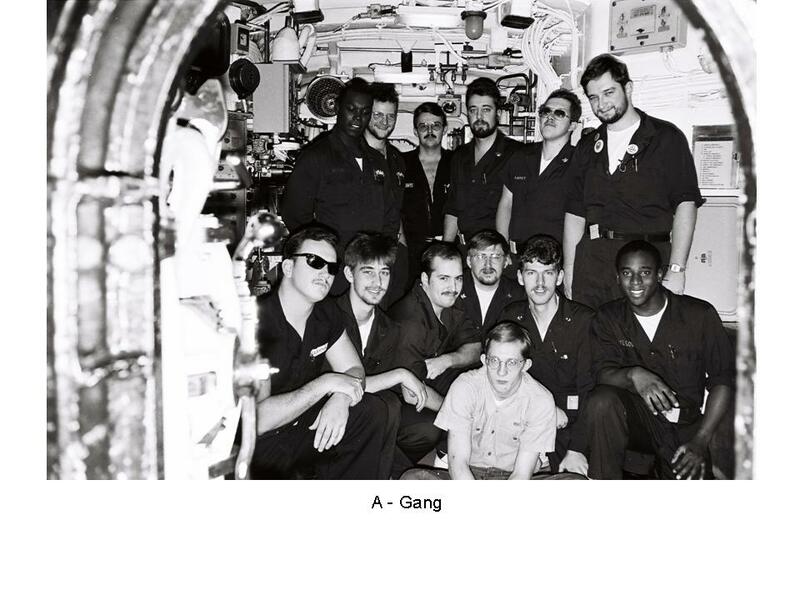 Jeff Mason - A-Gang -Both Crews 81 - 86 sent in the next 120 pictures. 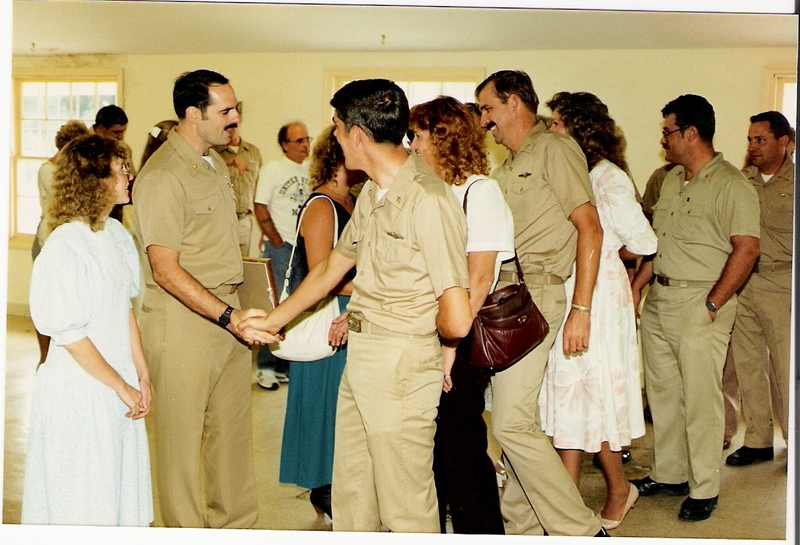 If you recognize anyone, let us know. 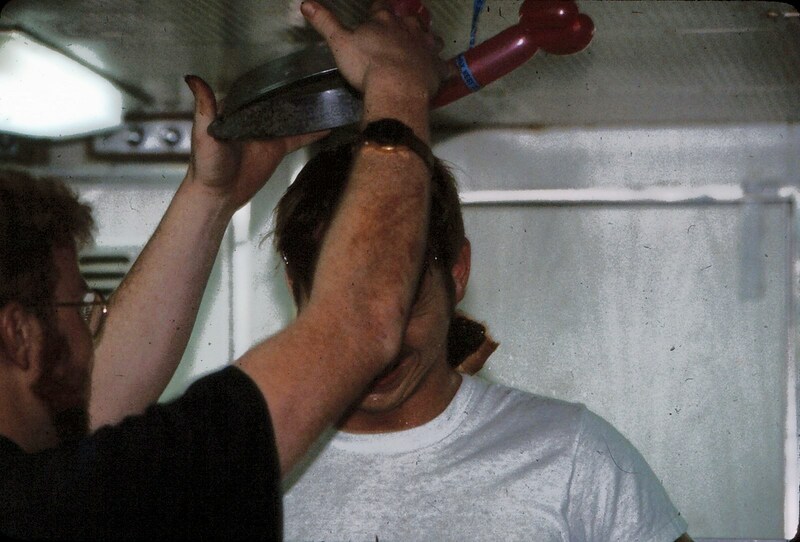 This is what happens to you if you don't shower often. 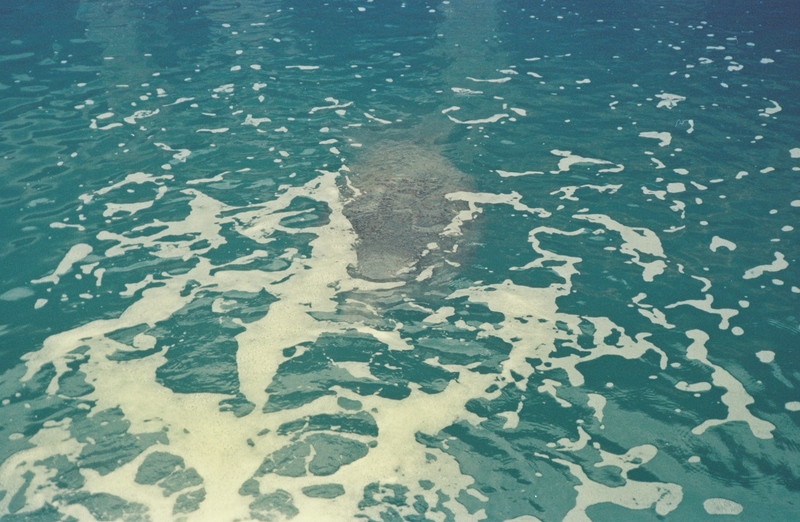 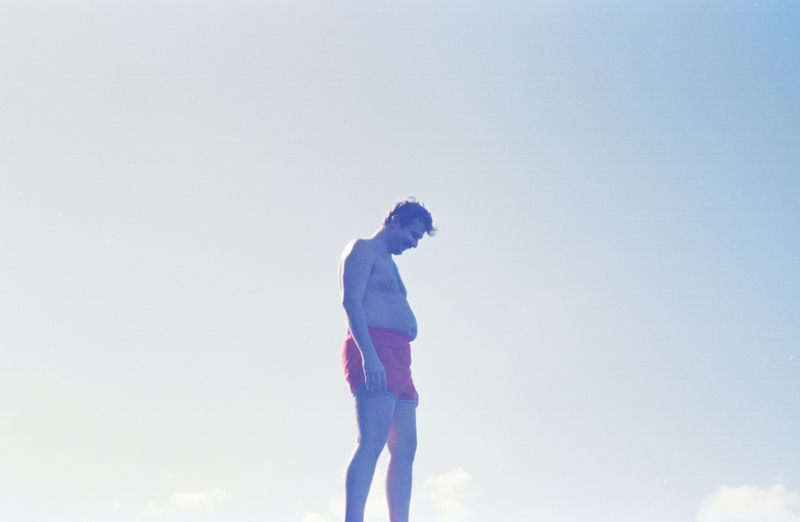 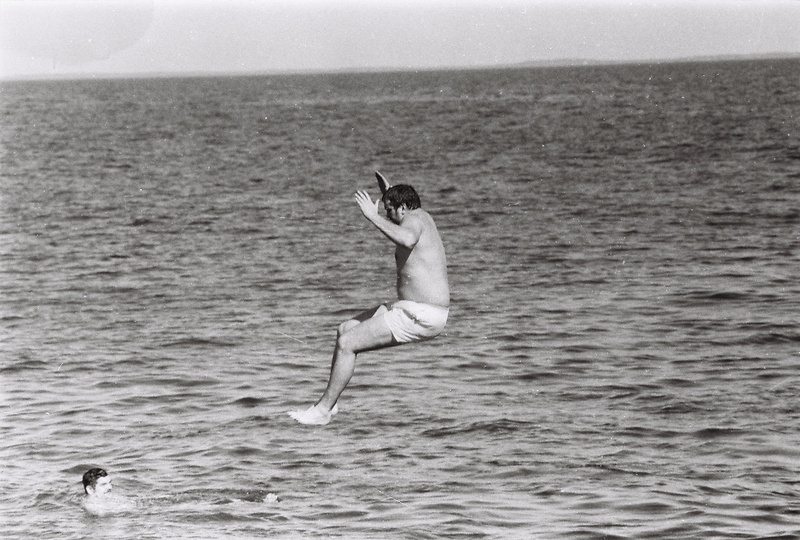 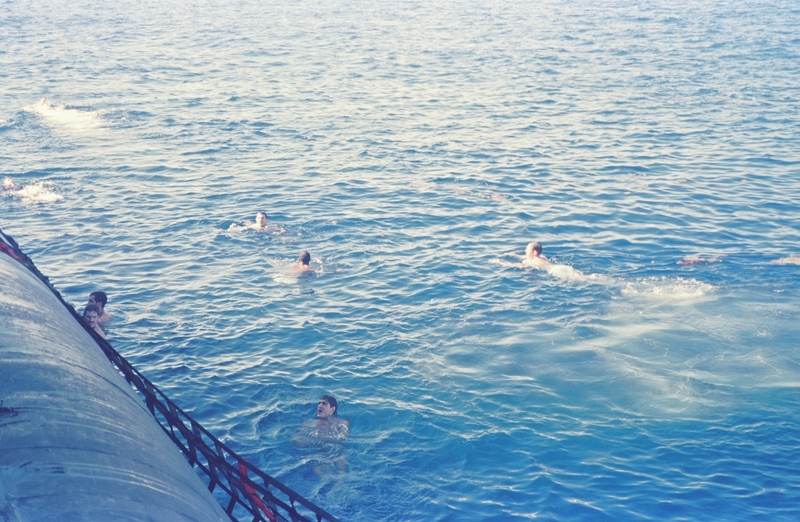 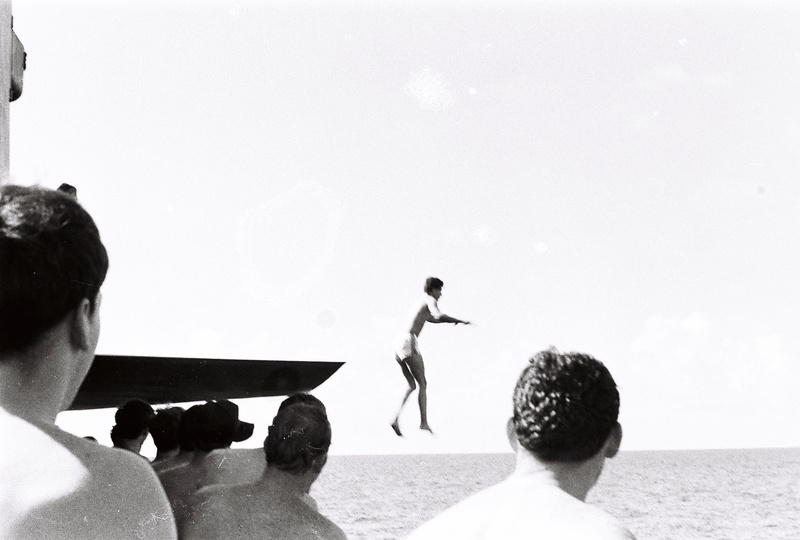 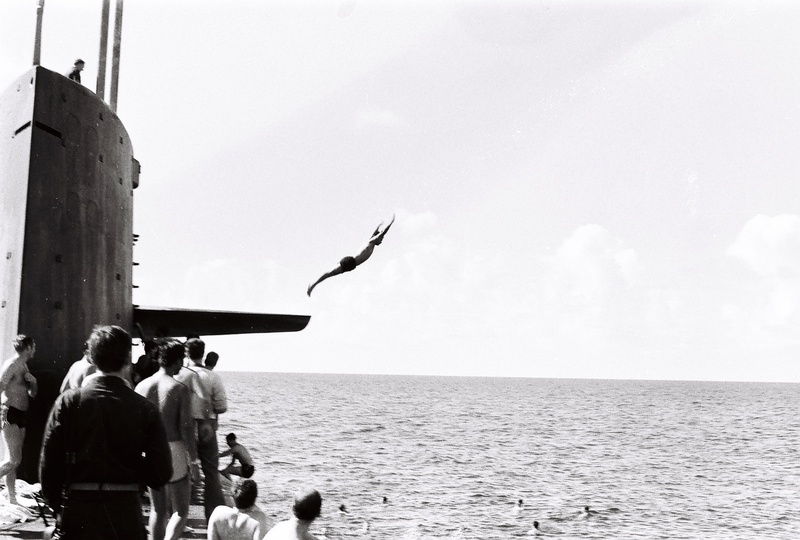 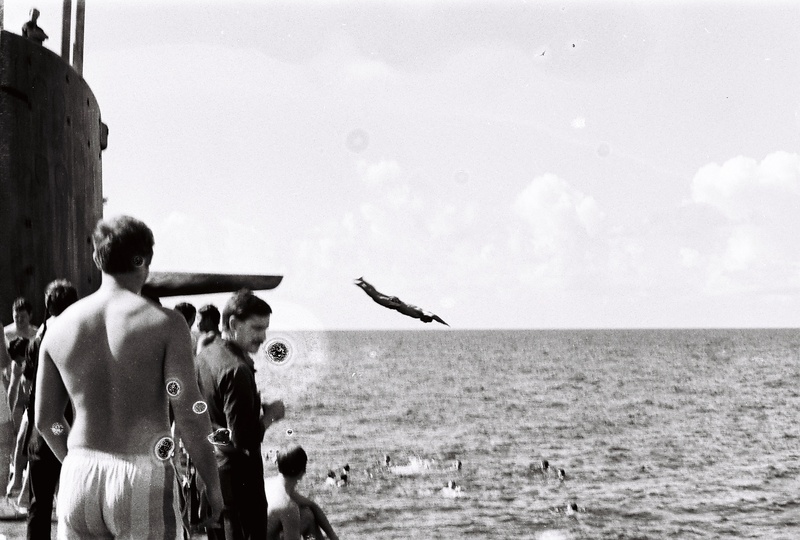 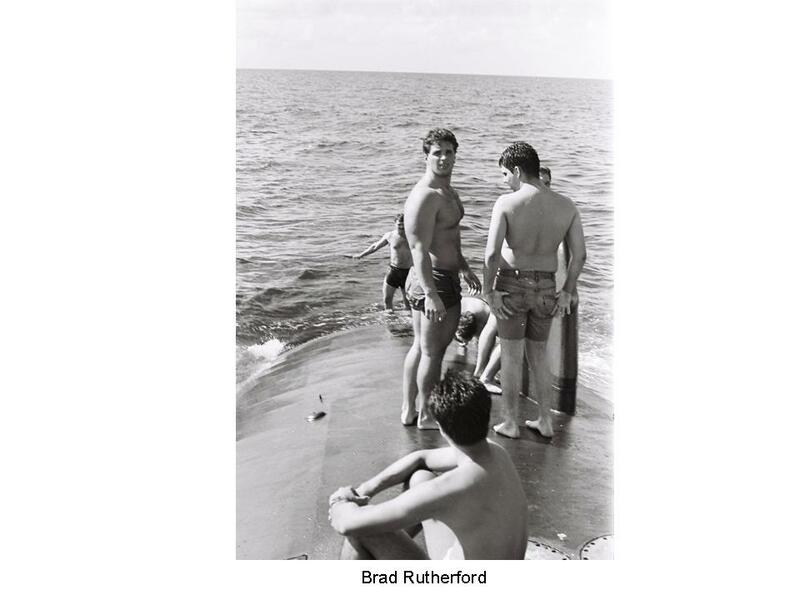 Brad Rutherford - Nuc ET This was from a gold crew swim call down in the Bahamas. 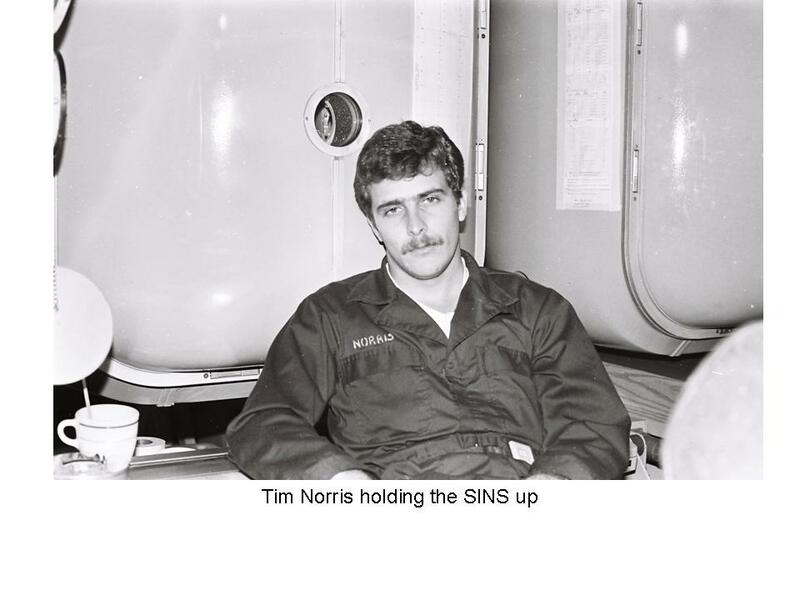 Curt Brim and Johnny at the SINS plot in Nav. 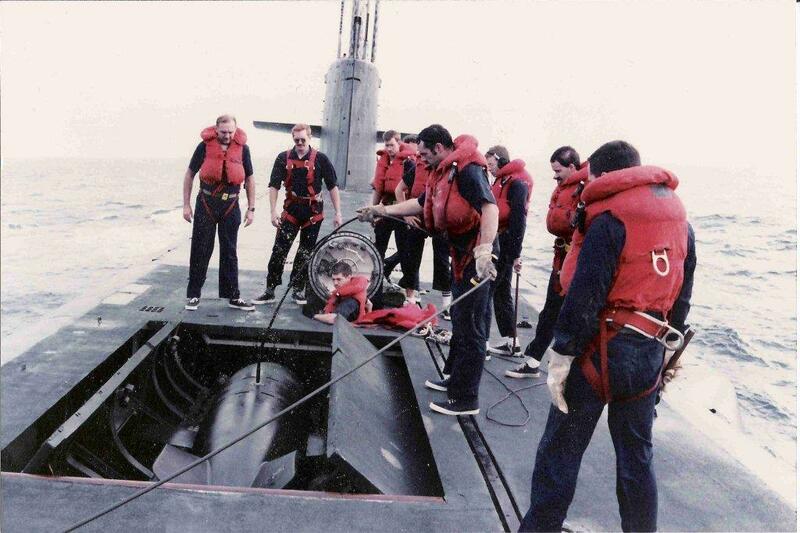 At sea Bra-8 Bouy repair. 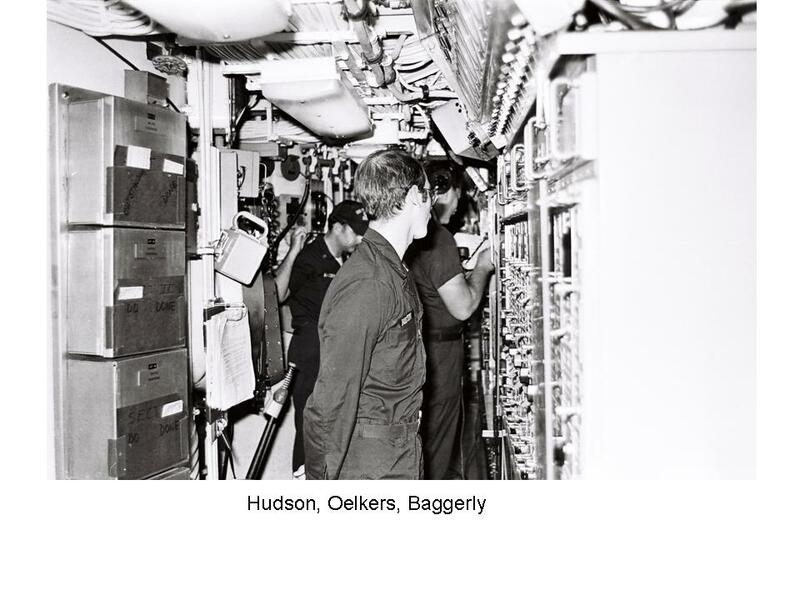 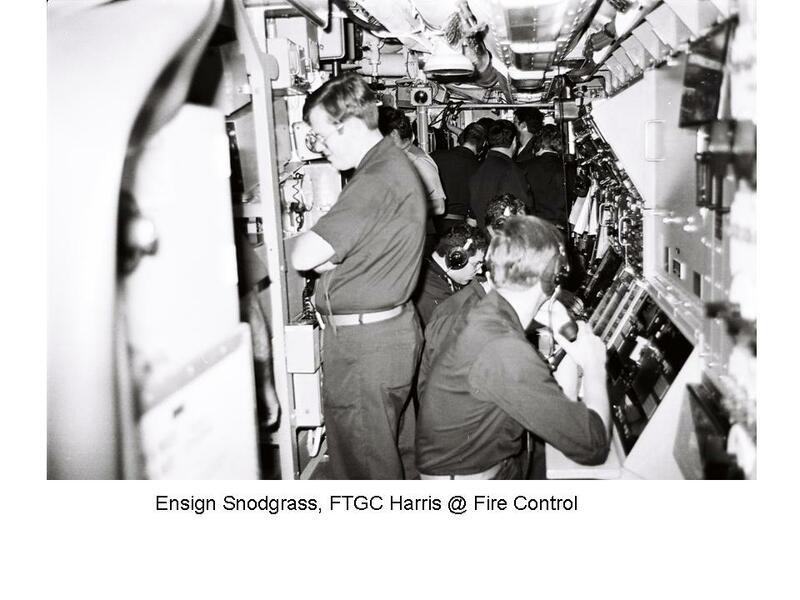 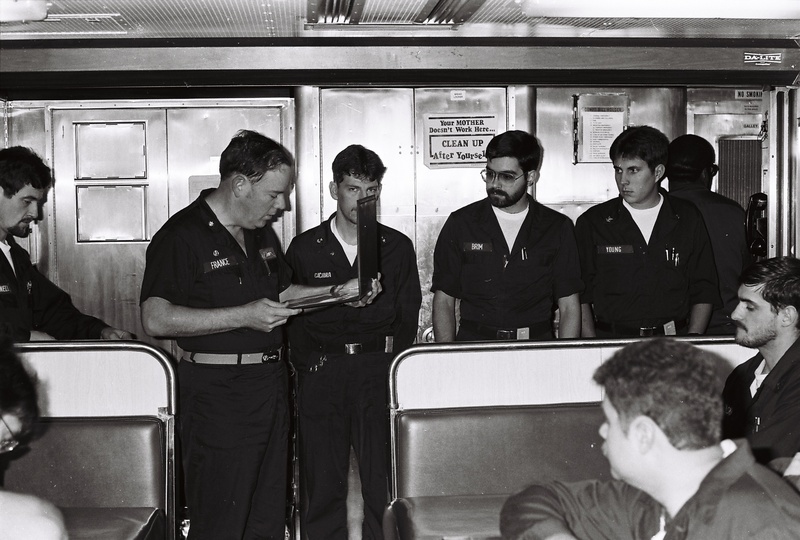 R-L STSCS Griffith, RM1 Burke holding Bouy FW, LT Wiseman, LT Becknell on phones...Far left COB Rhinehart.